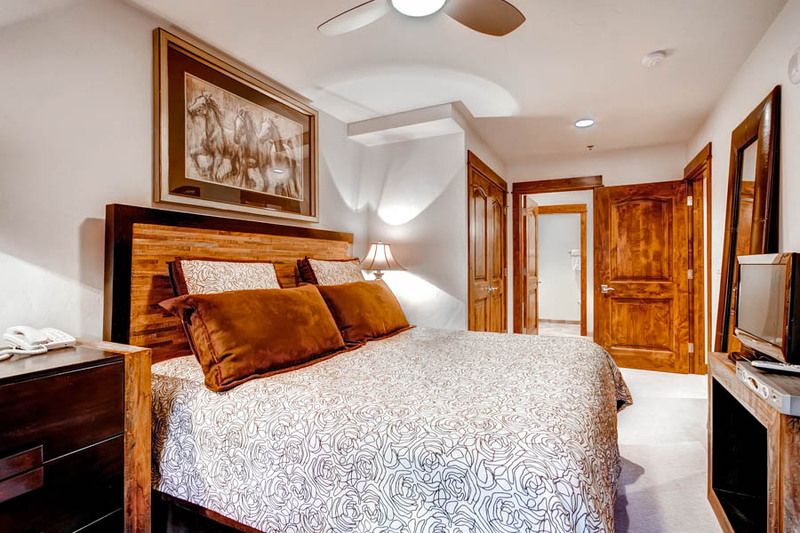 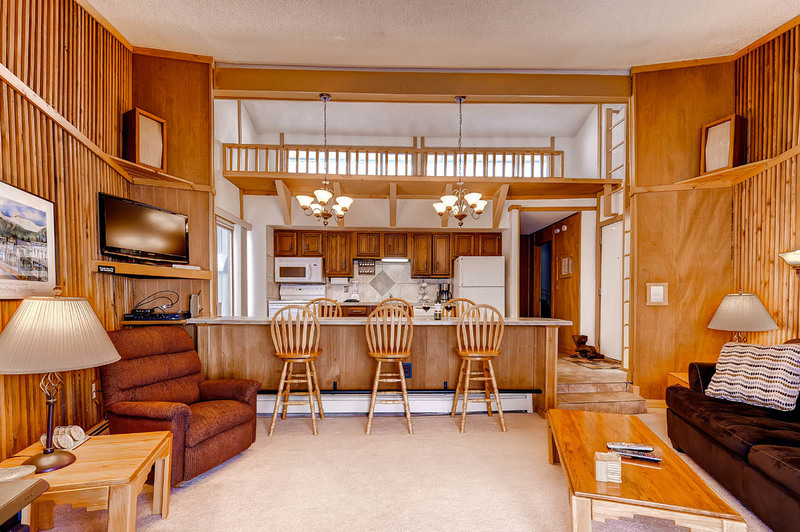 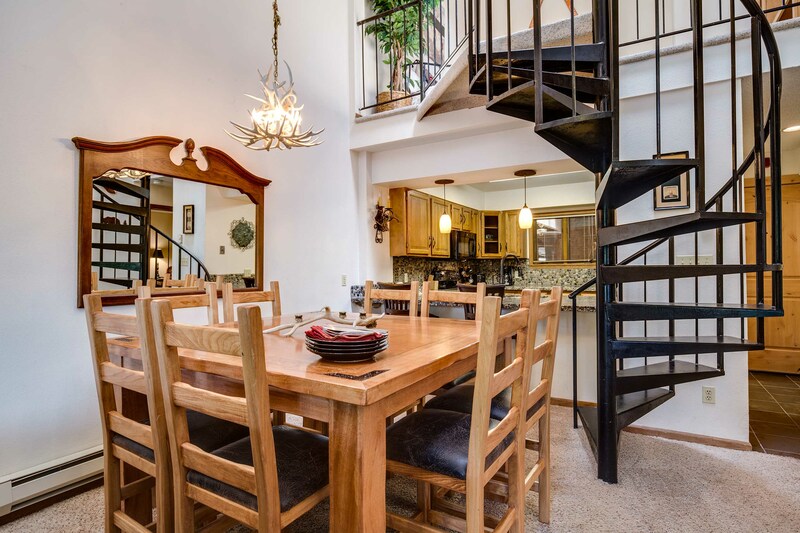 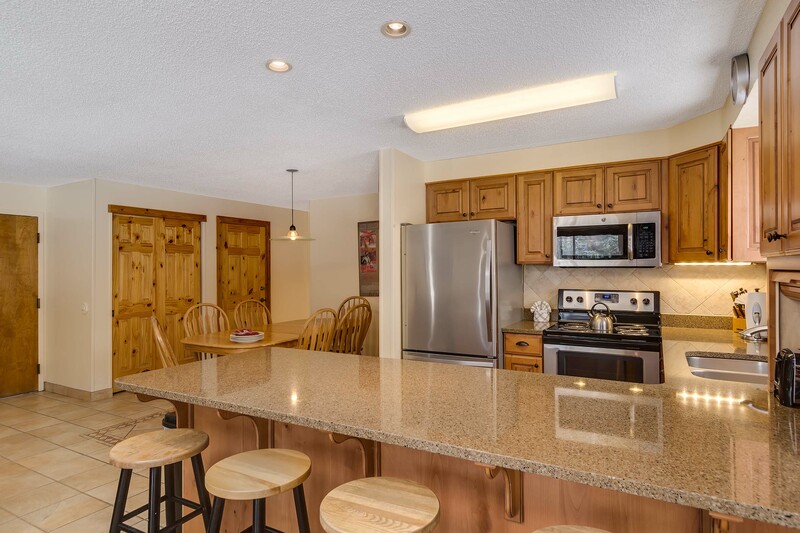 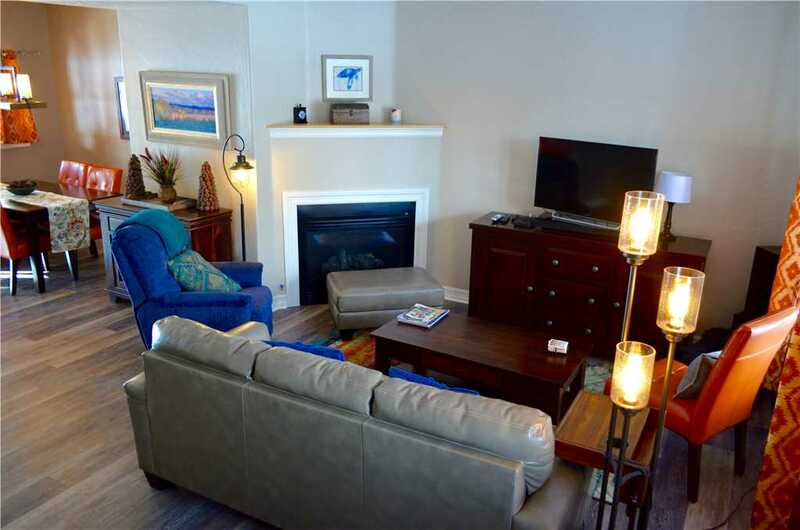 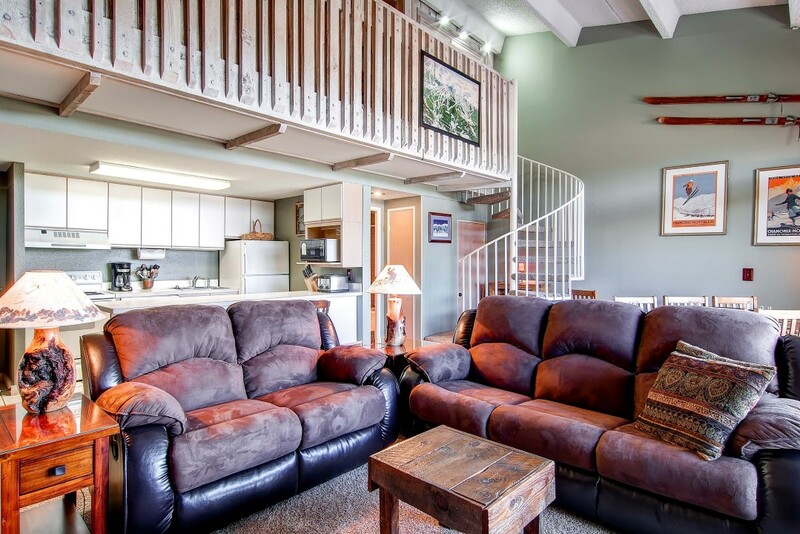 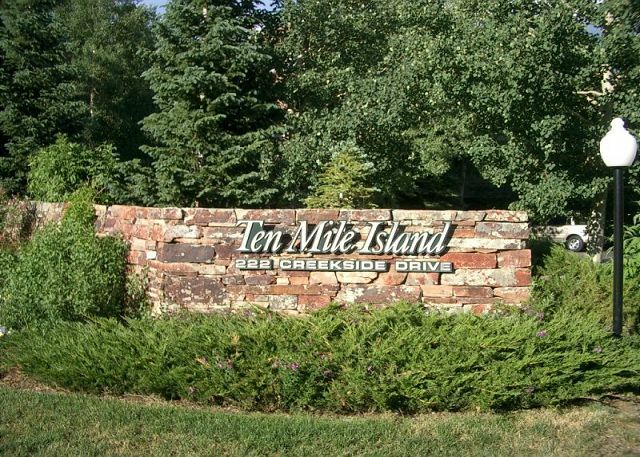 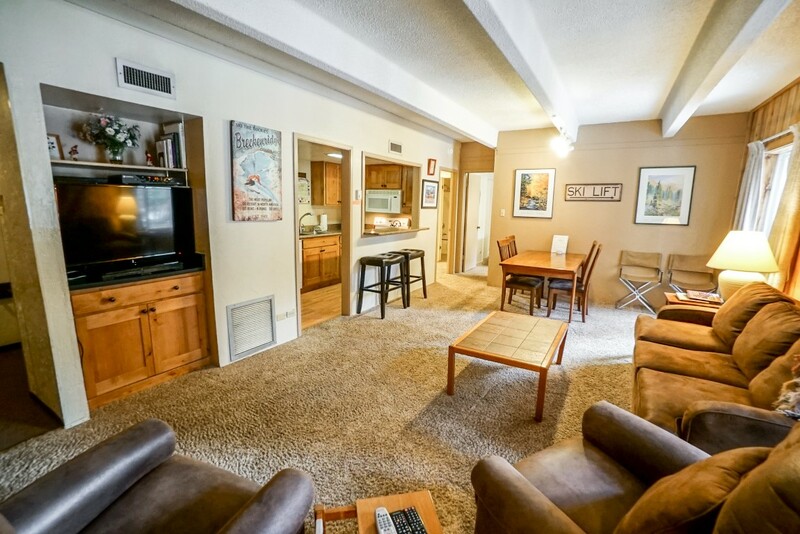 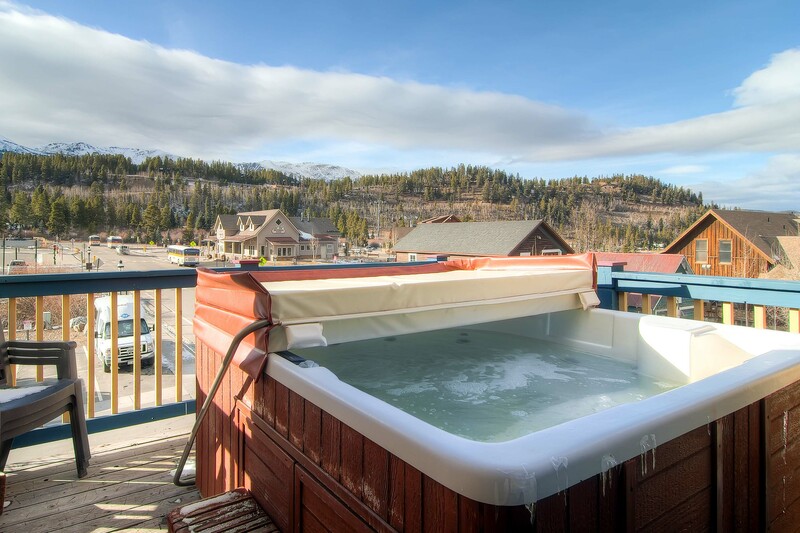 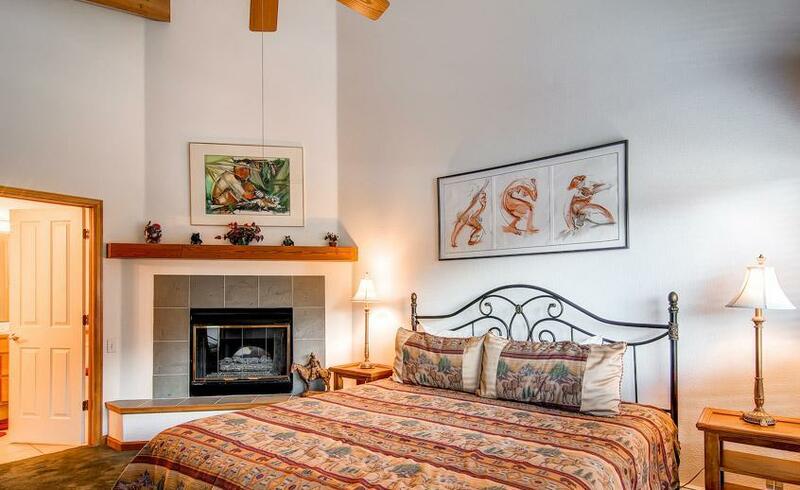 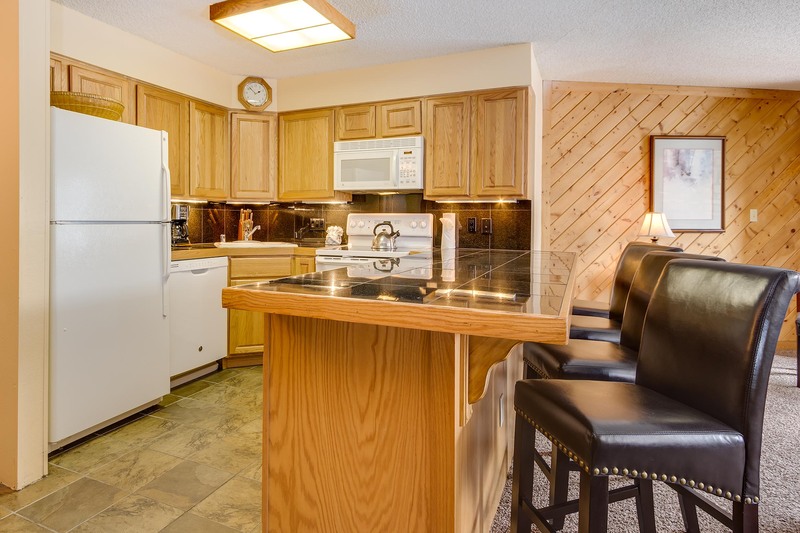 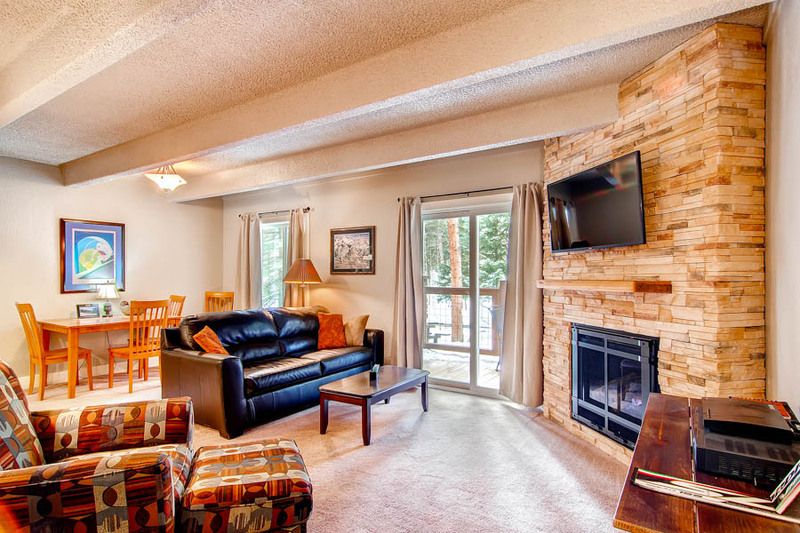 With easy access to nearly everything on property, this comfortable, nicely-decorated Gold-rated condominium is a great option for any getaway. 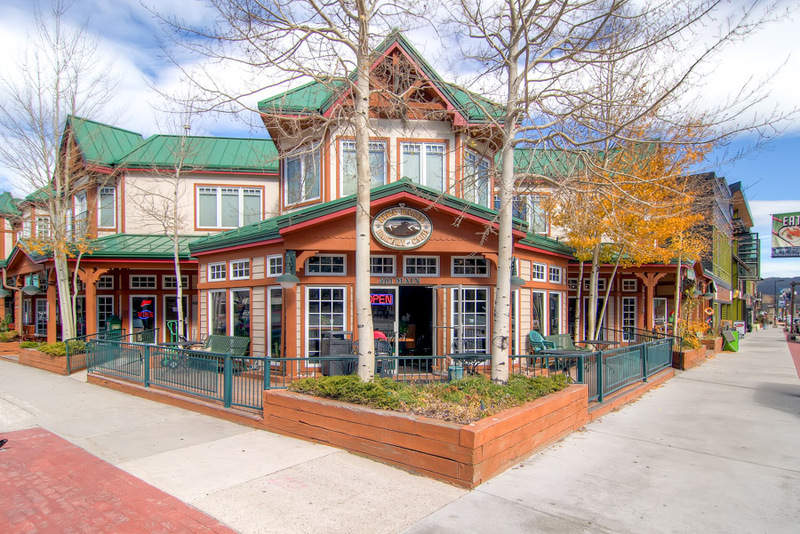 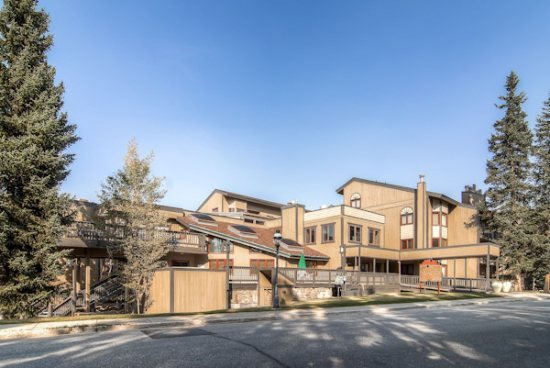 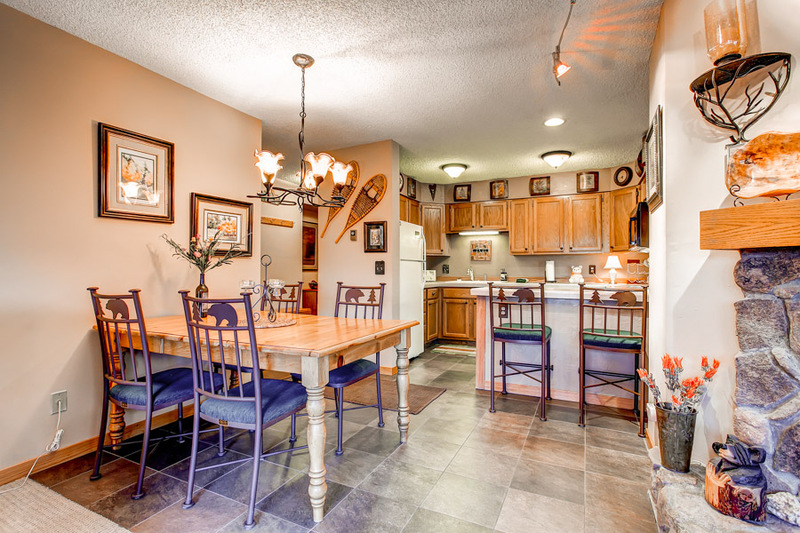 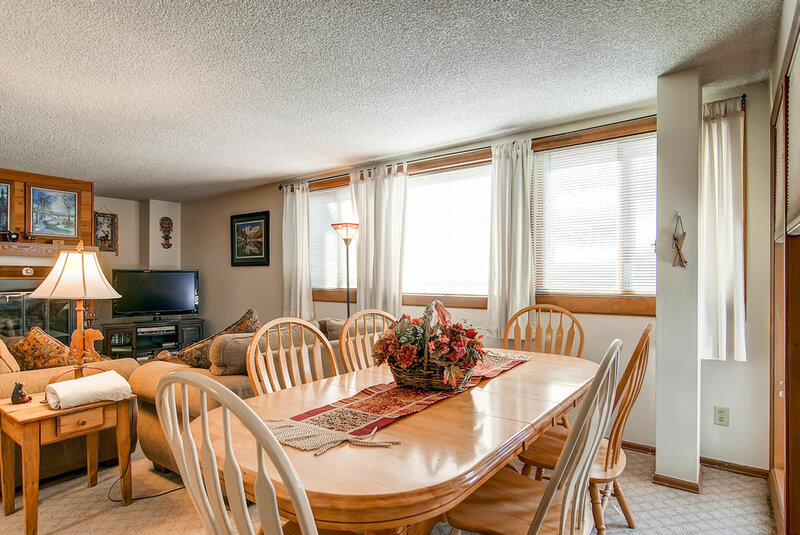 10A is located just across the street from the office and free shuttle stop, half-a-block to the community pool and right next door to the hot tub. 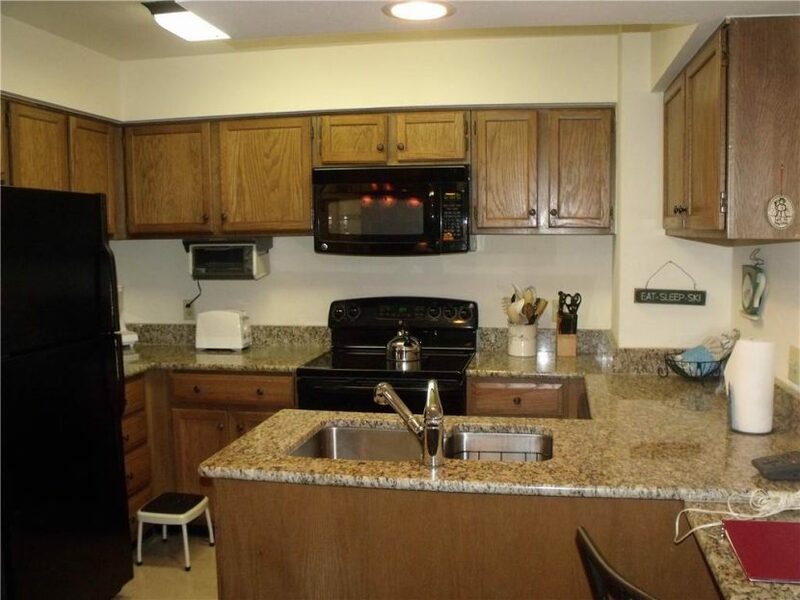 A gas grill is also available right outside your door. 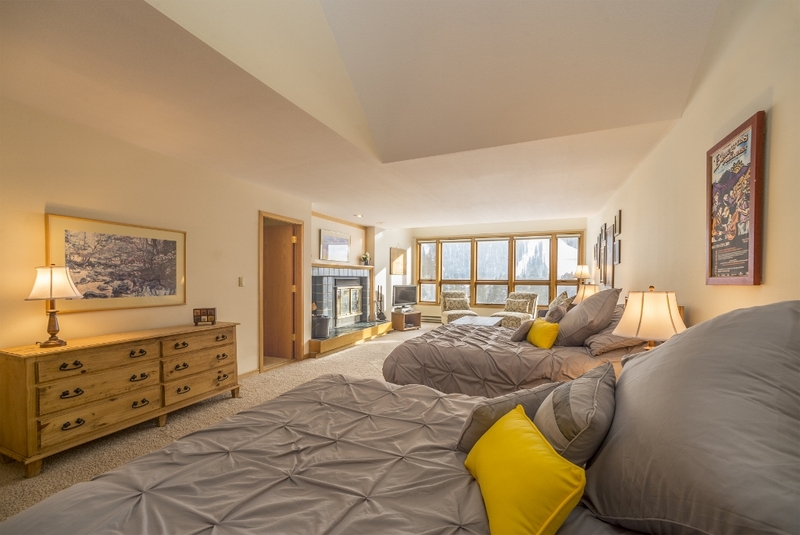 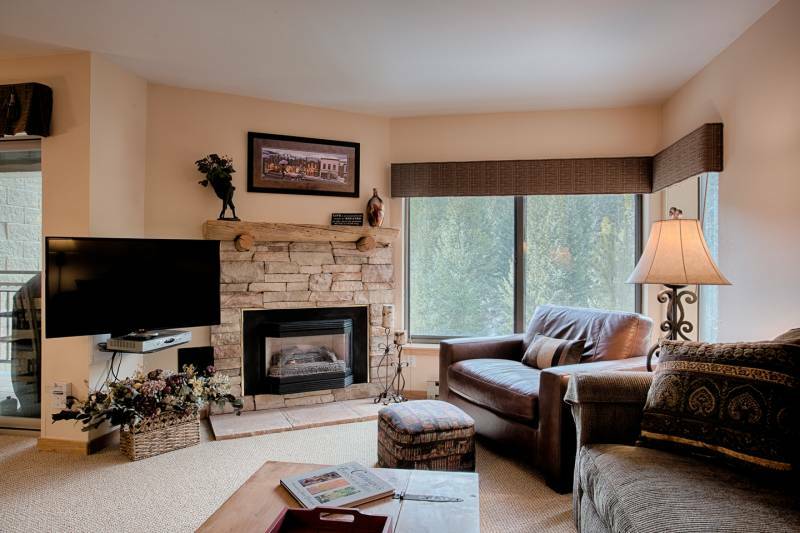 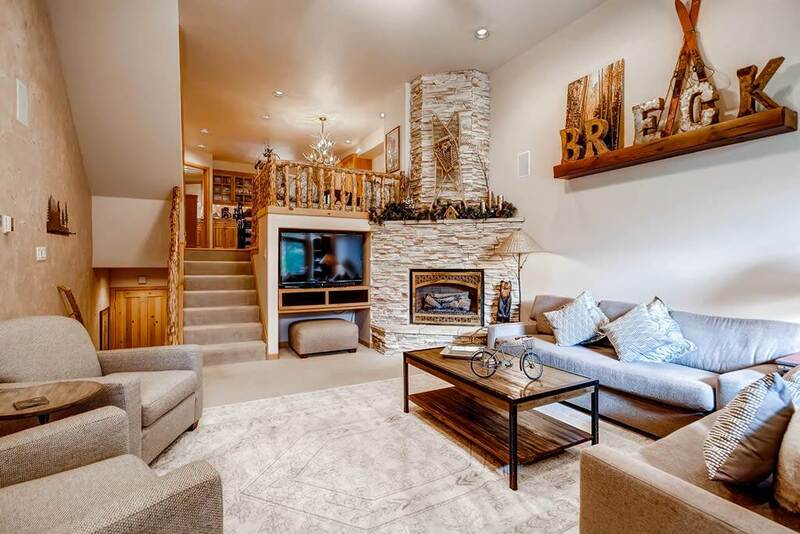 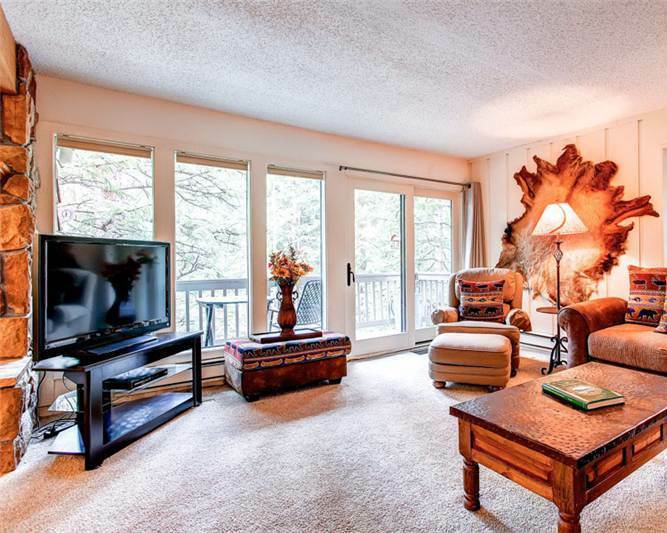 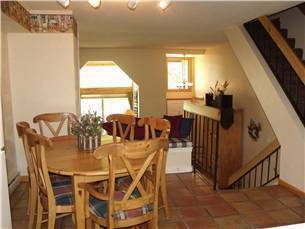 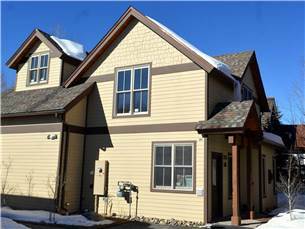 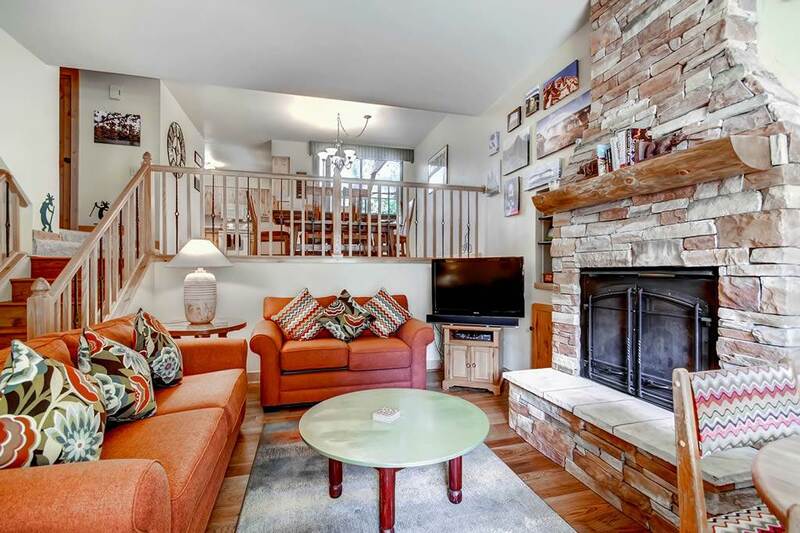 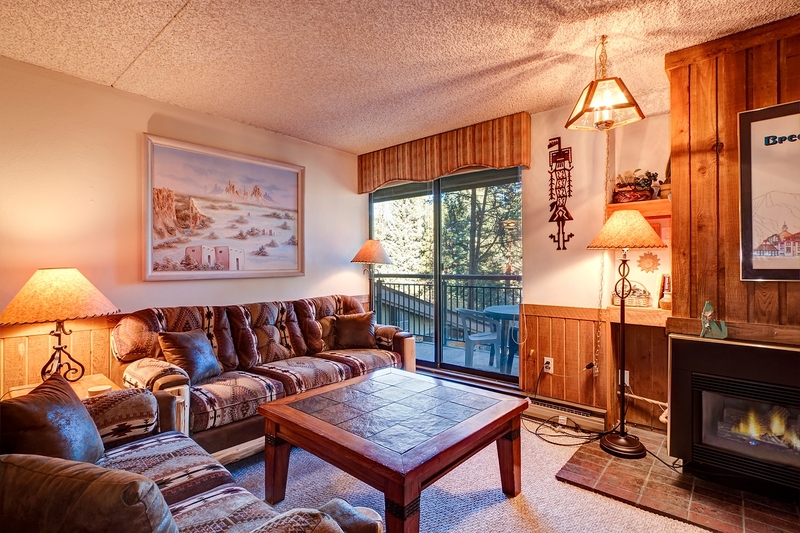 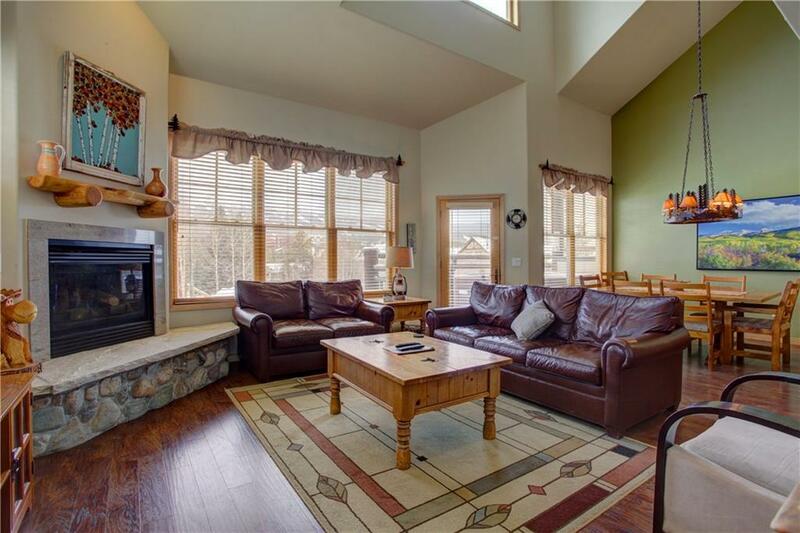 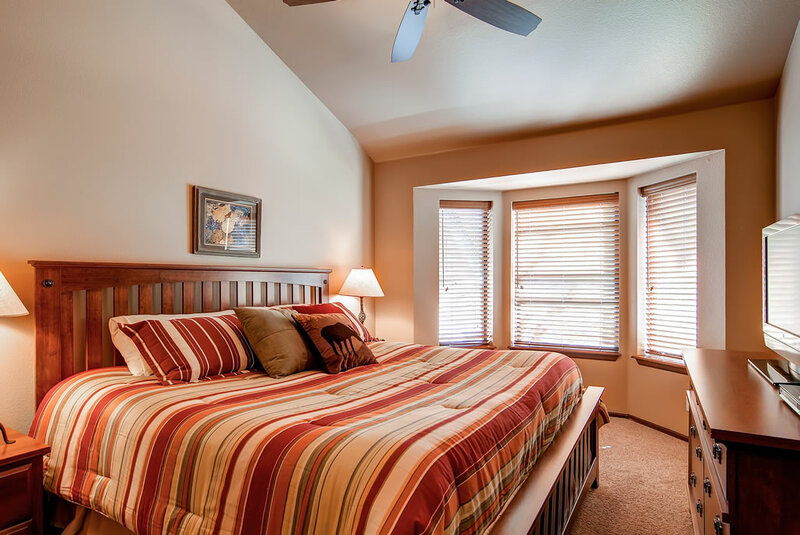 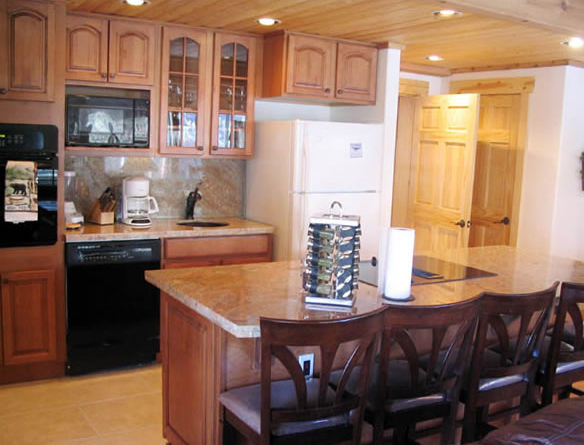 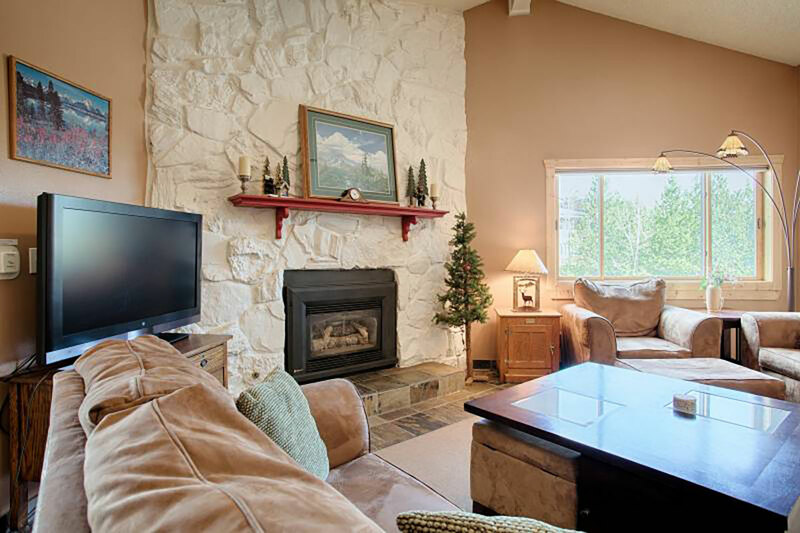 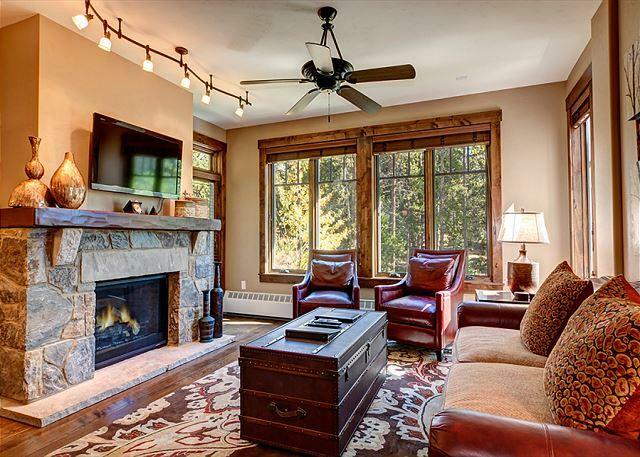 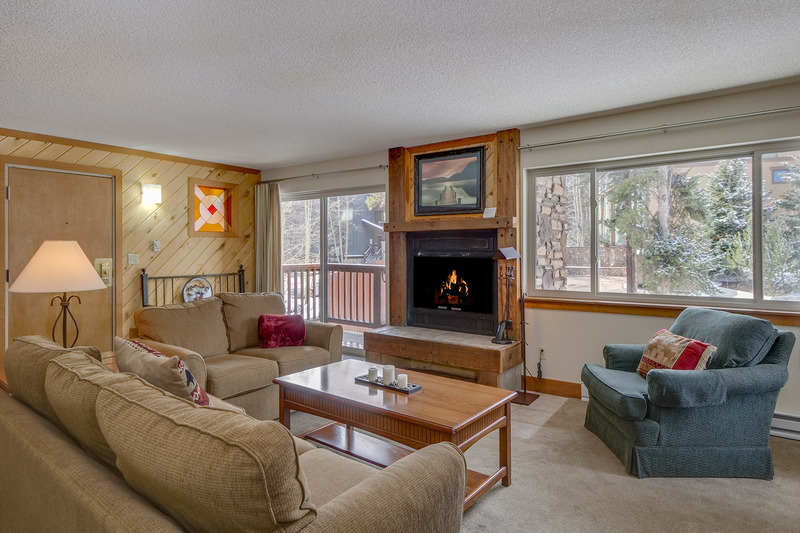 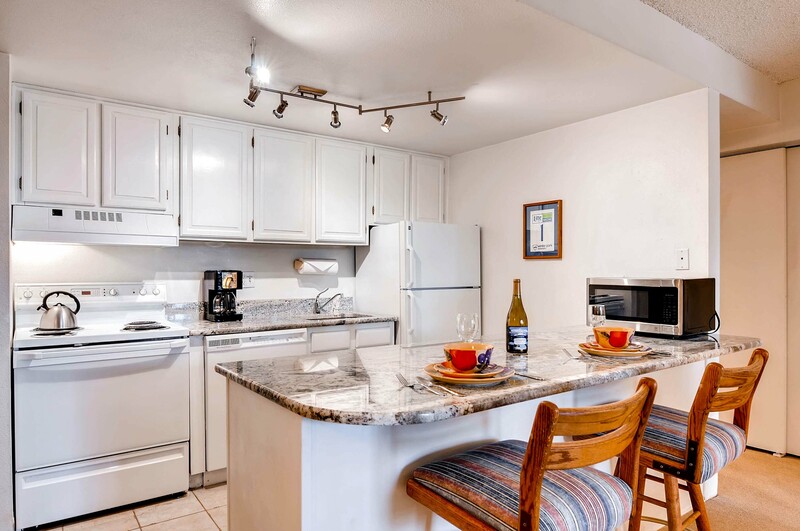 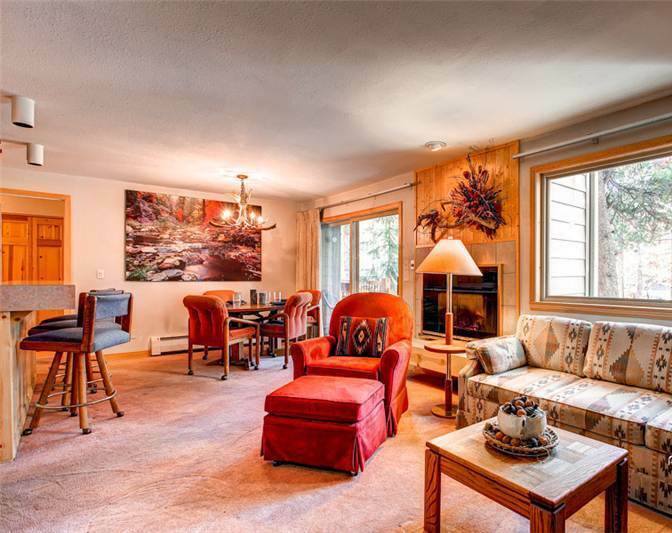 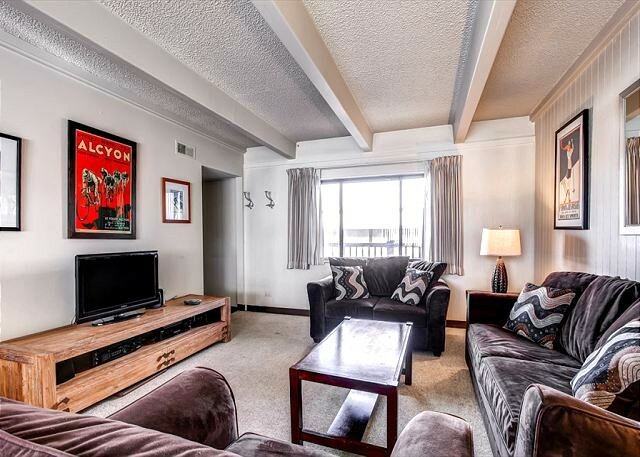 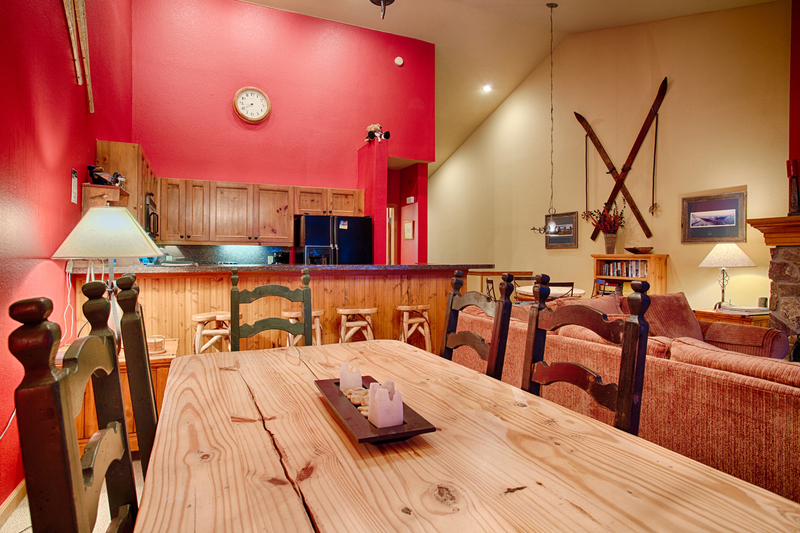 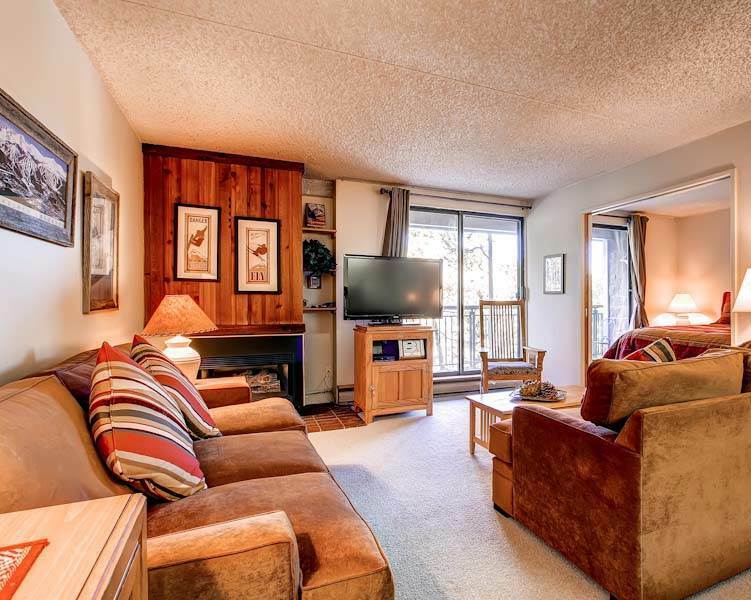 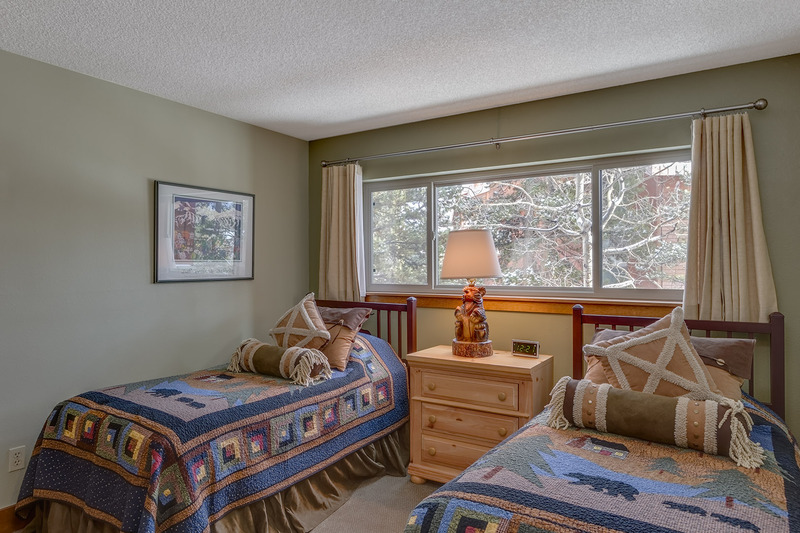 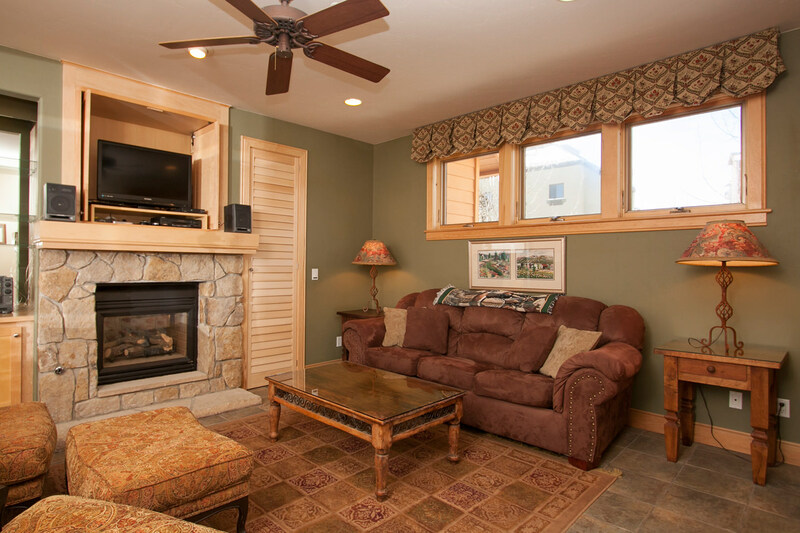 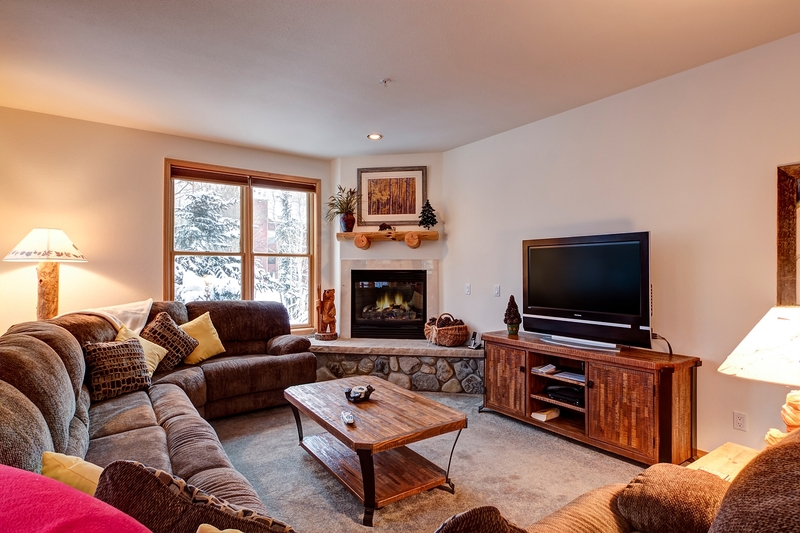 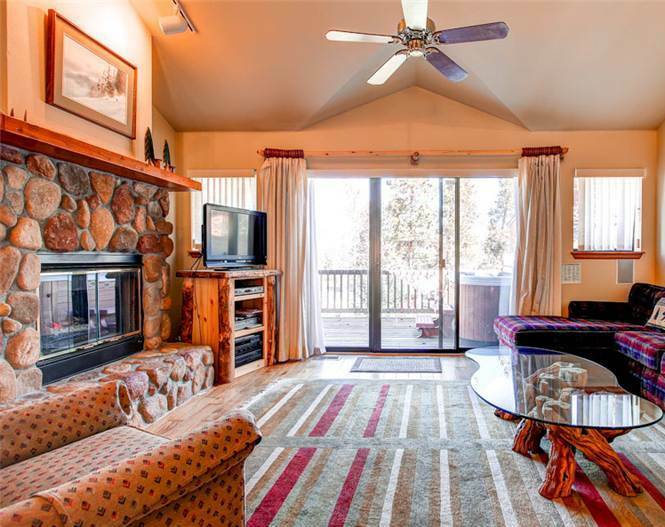 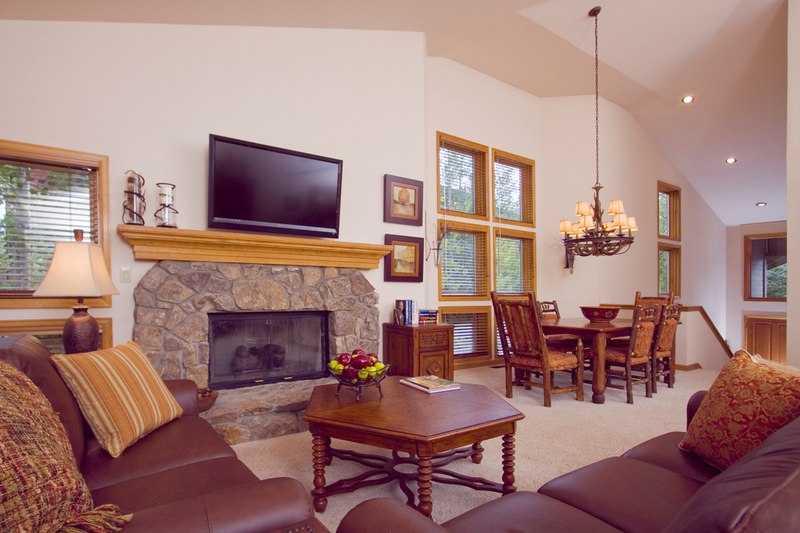 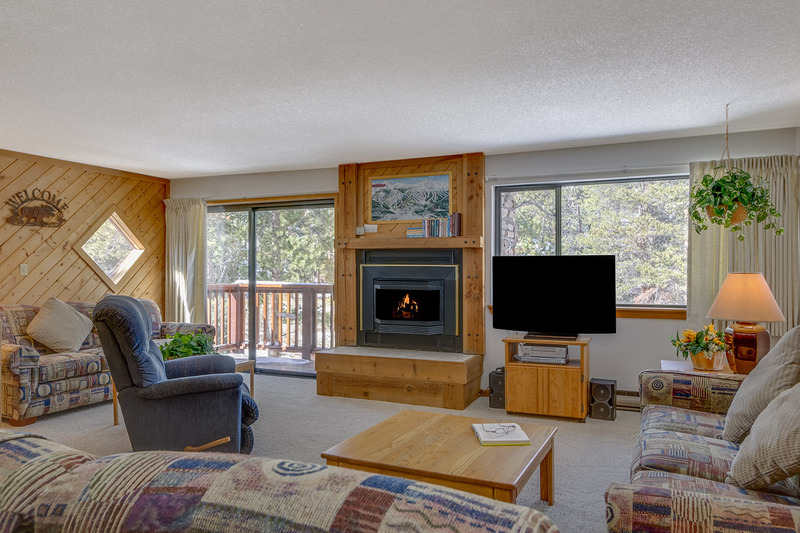 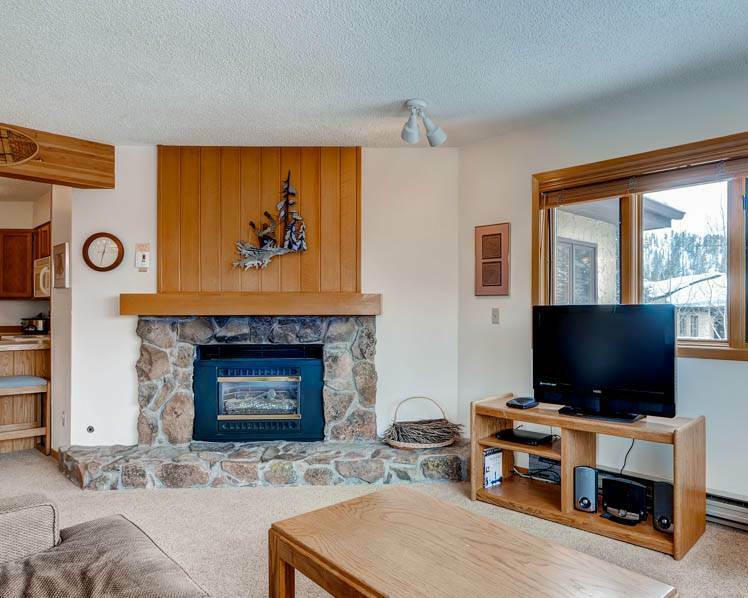 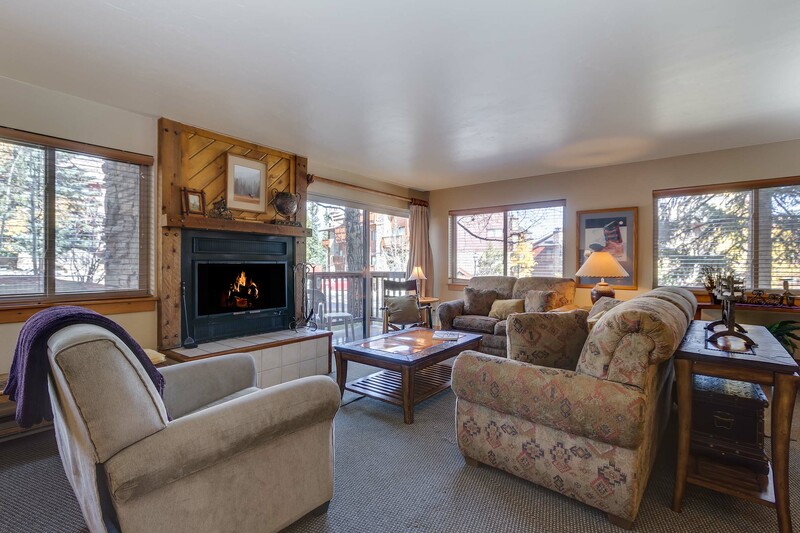 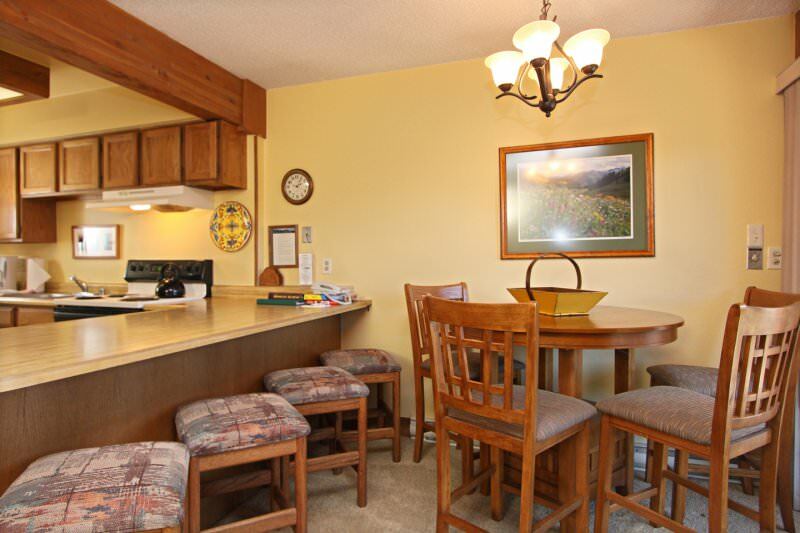 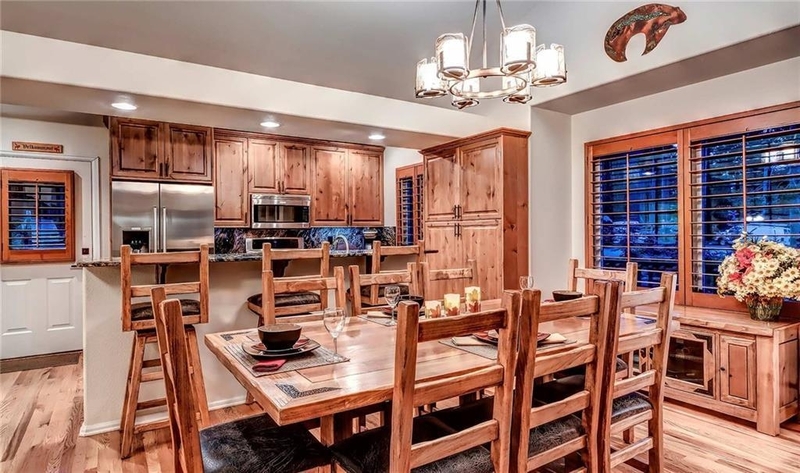 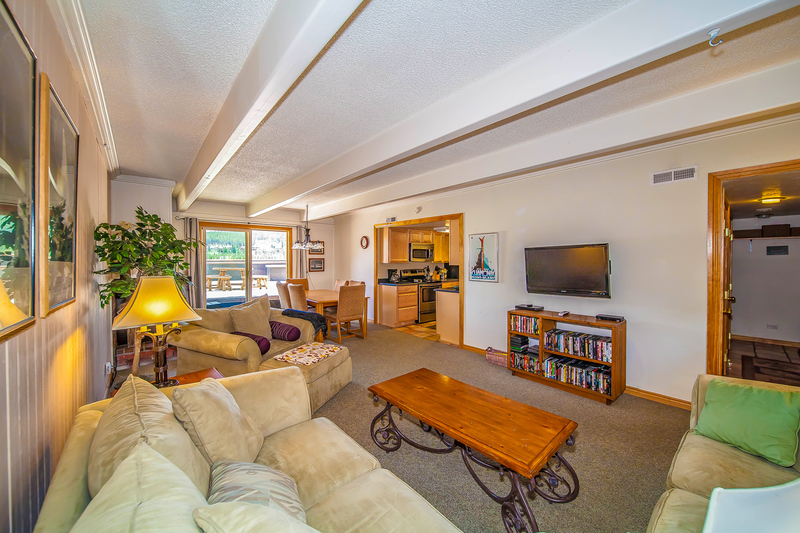 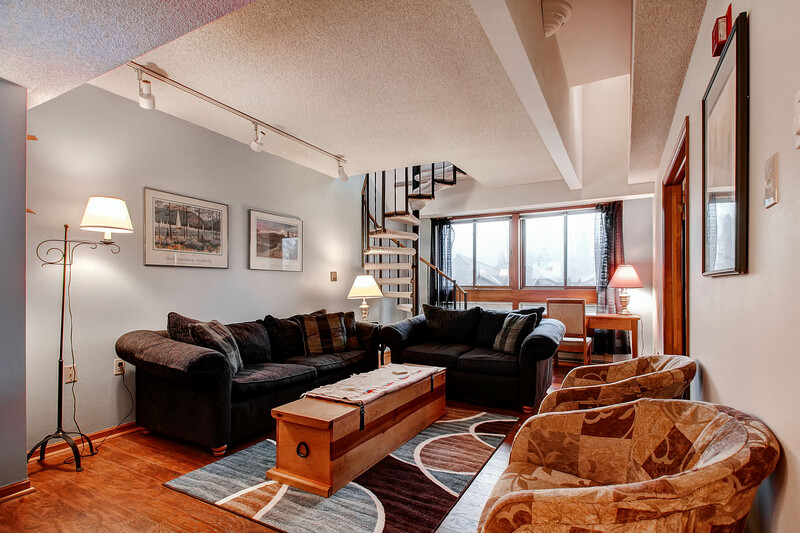 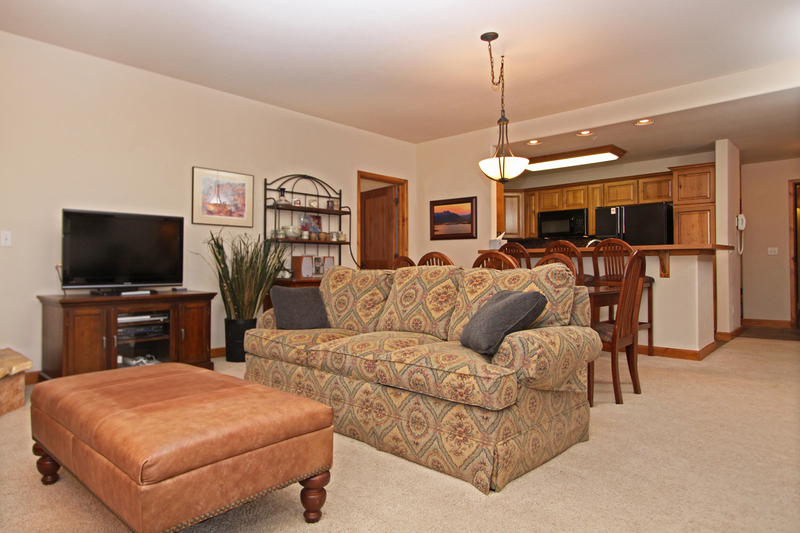 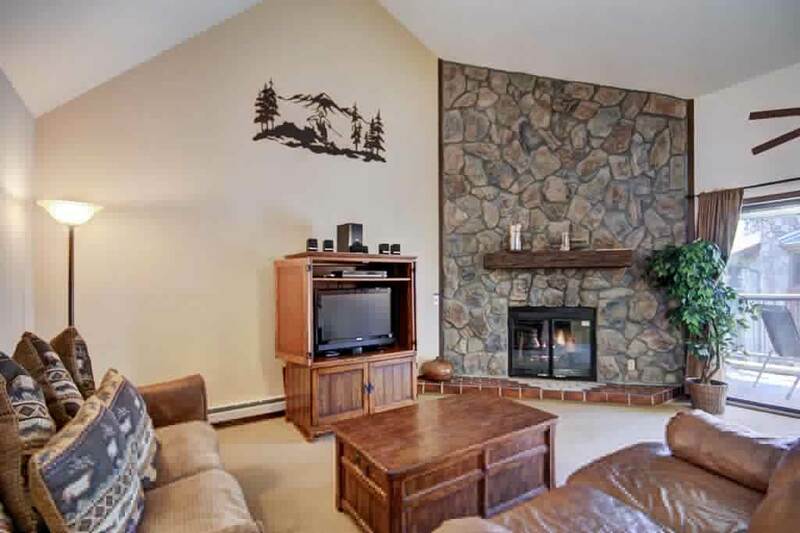 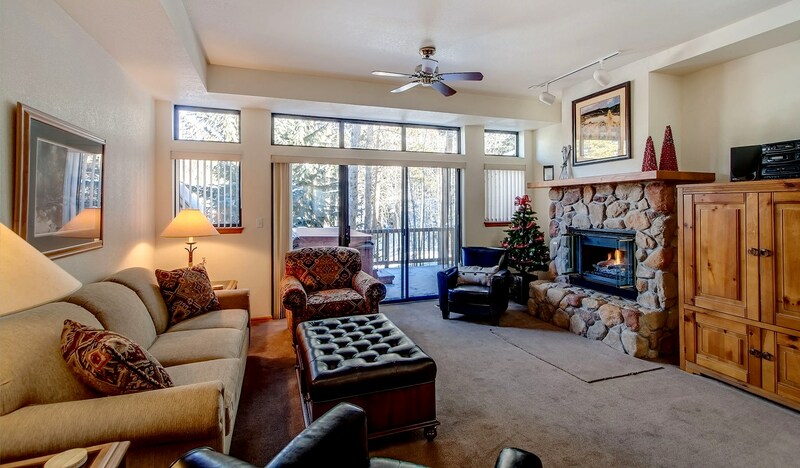 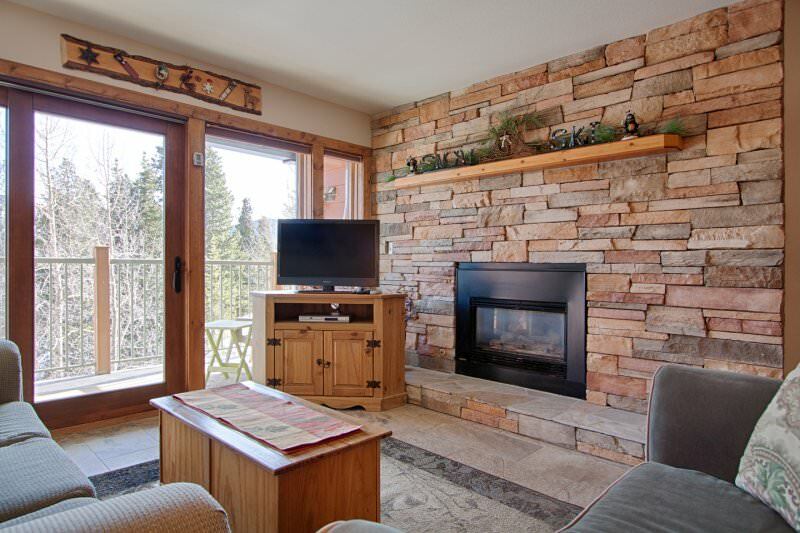 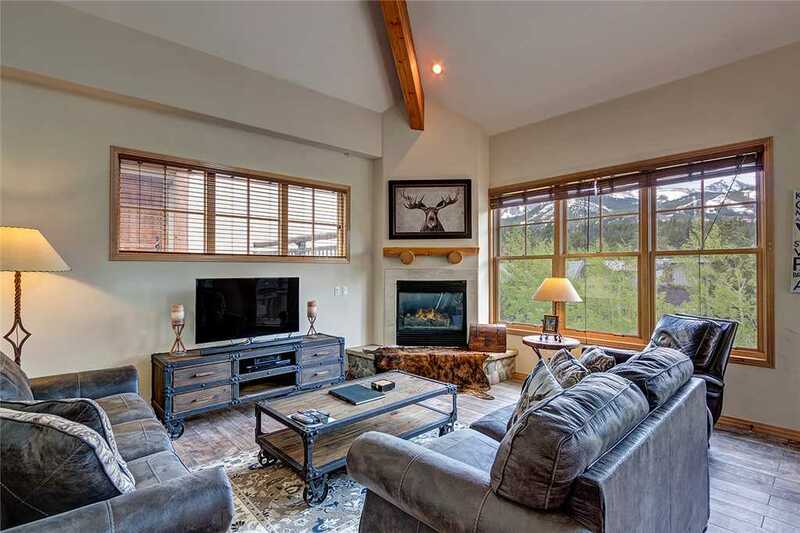 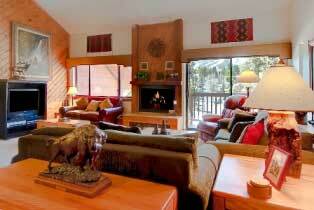 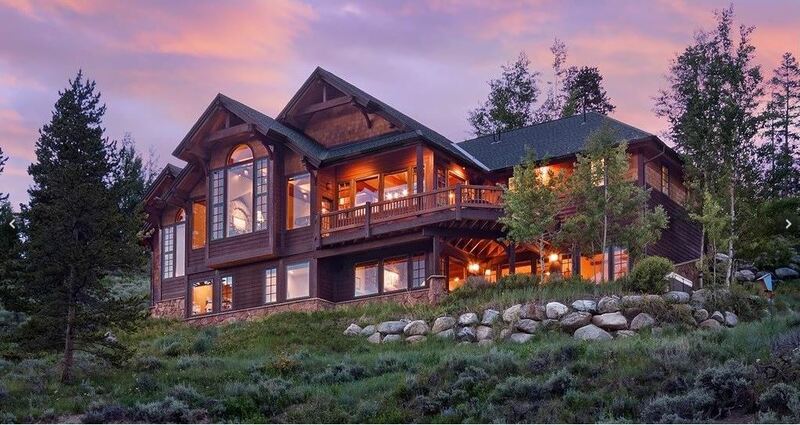 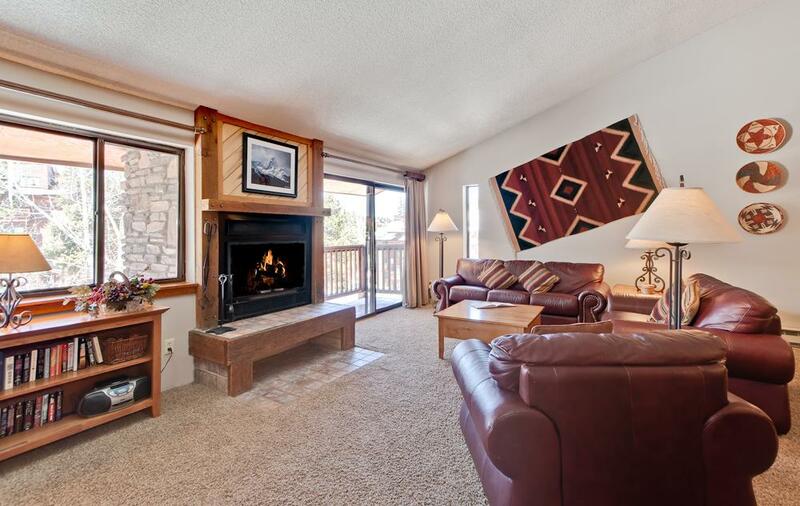 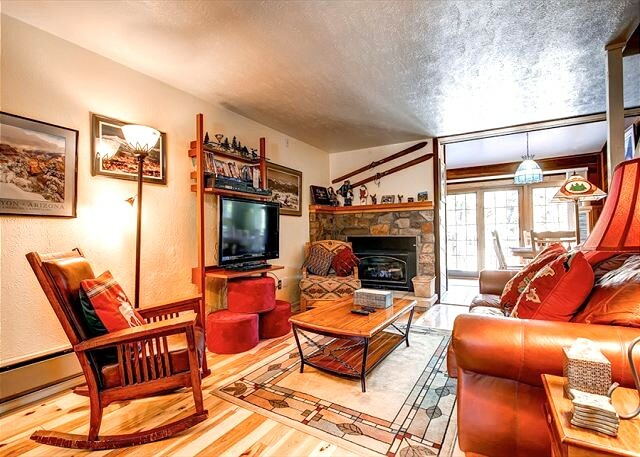 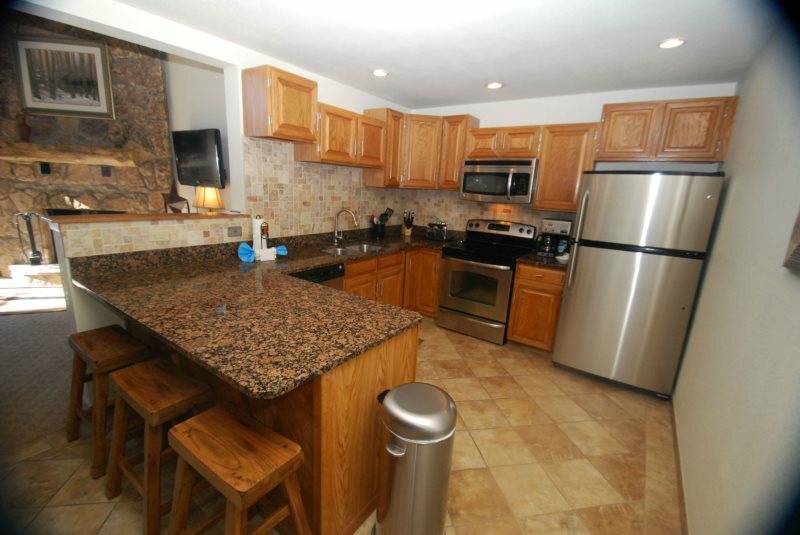 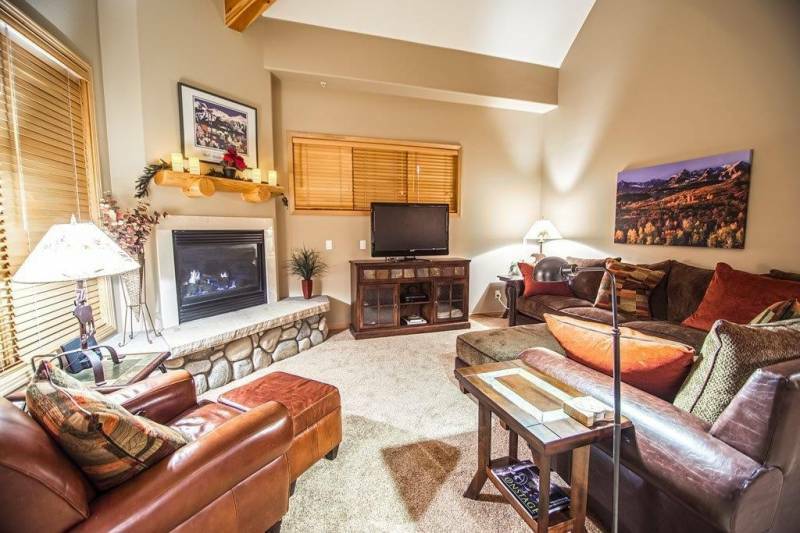 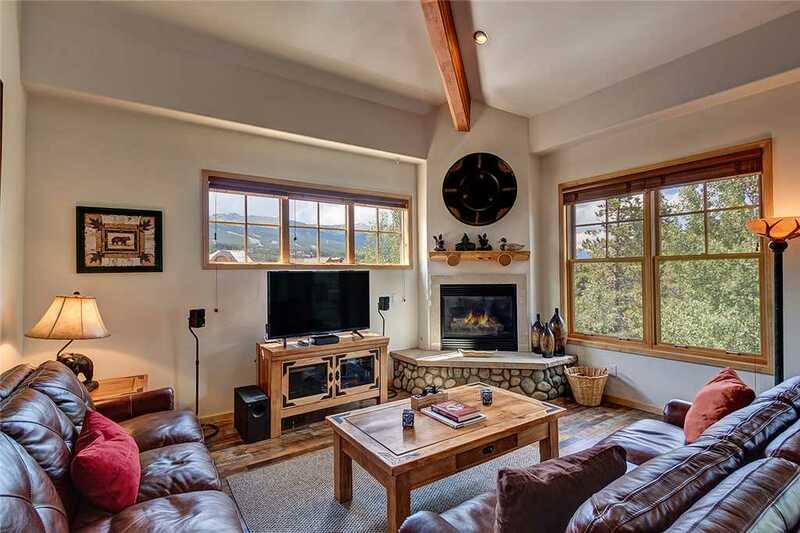 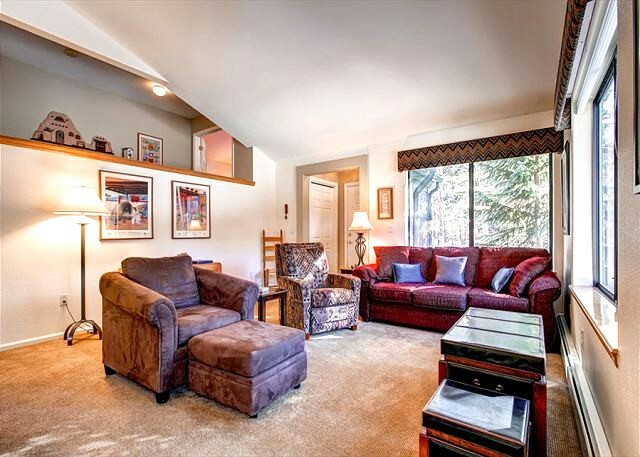 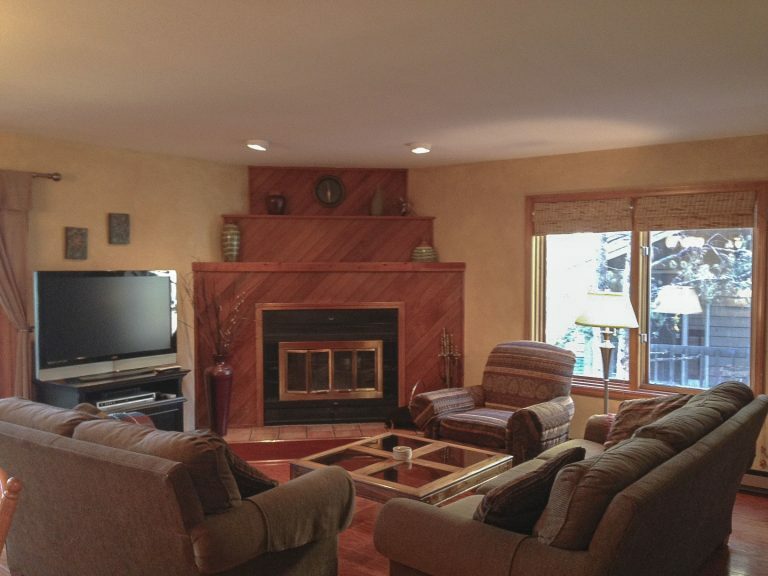 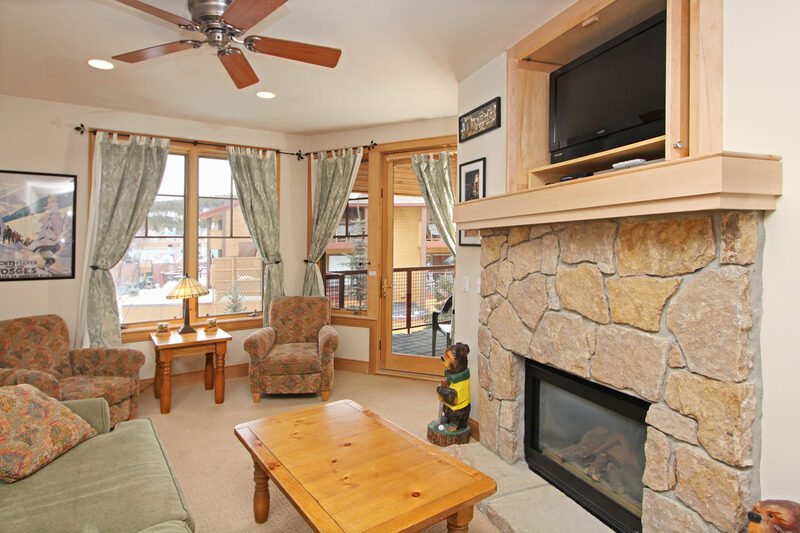 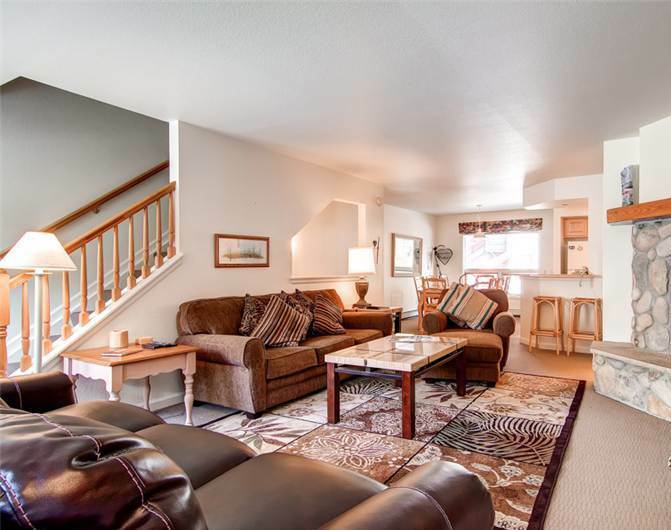 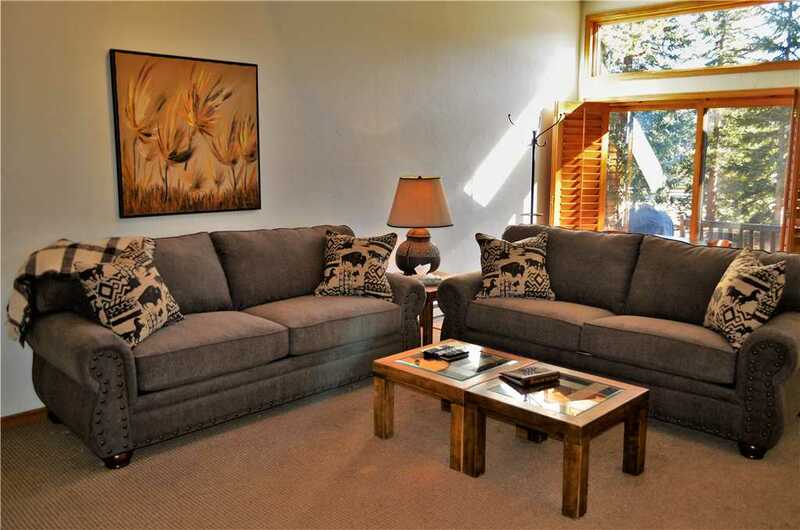 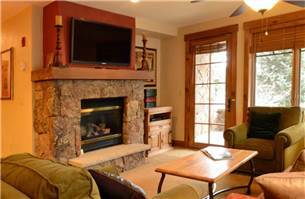 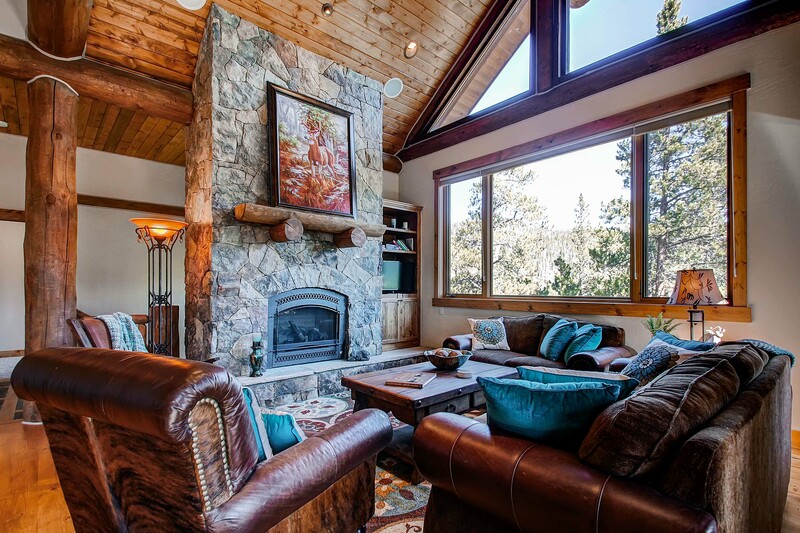 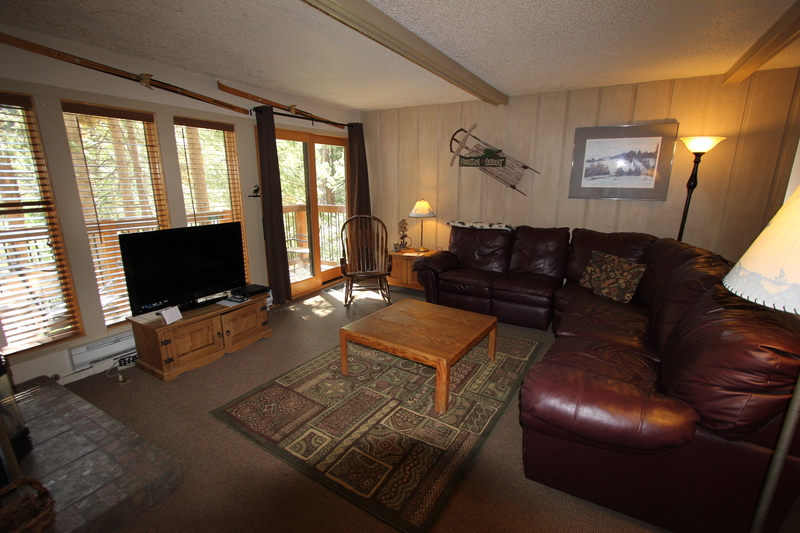 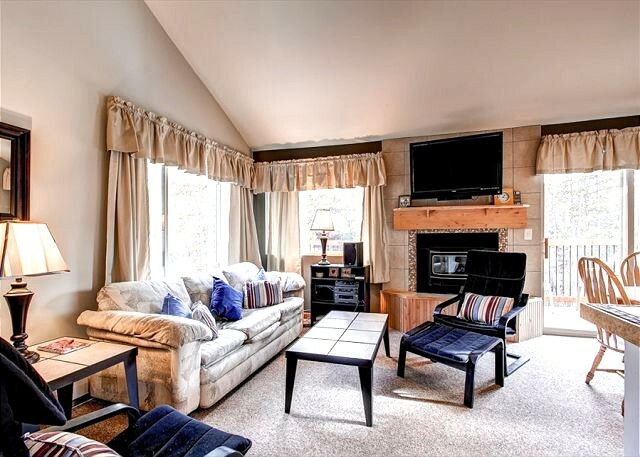 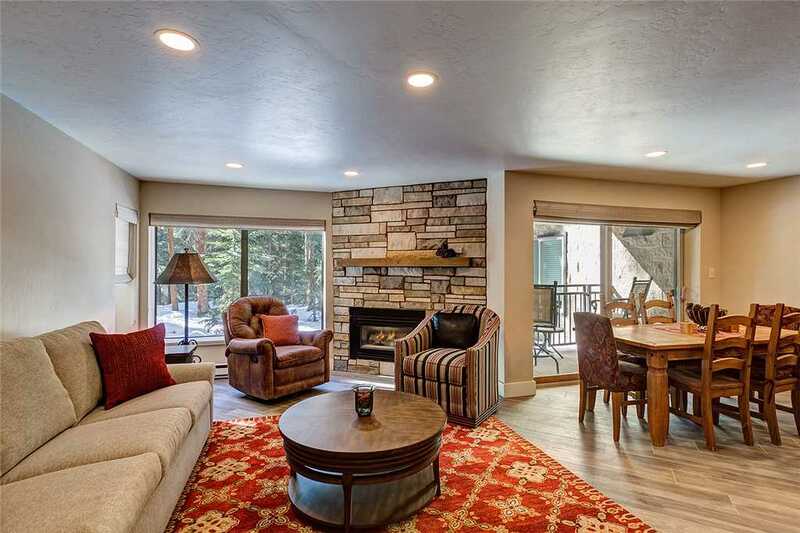 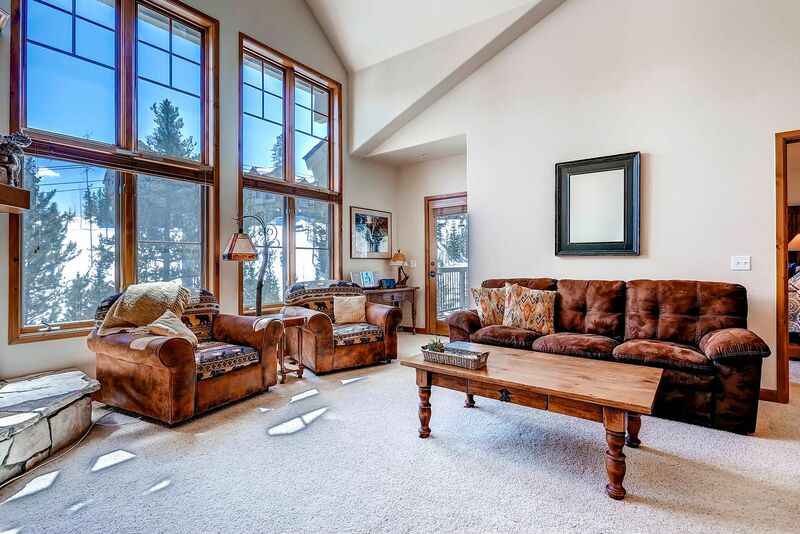 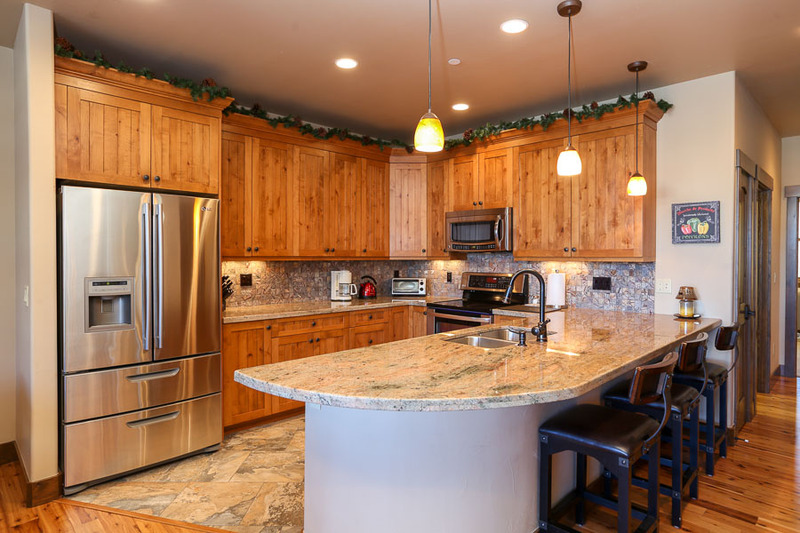 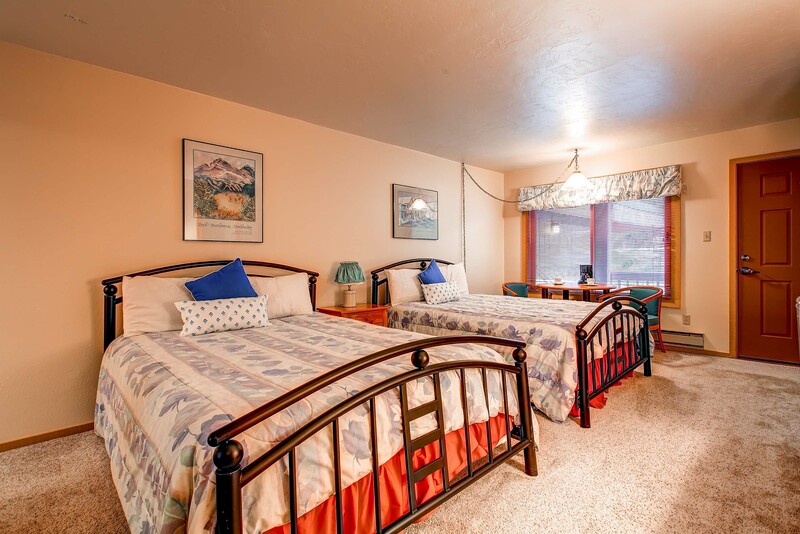 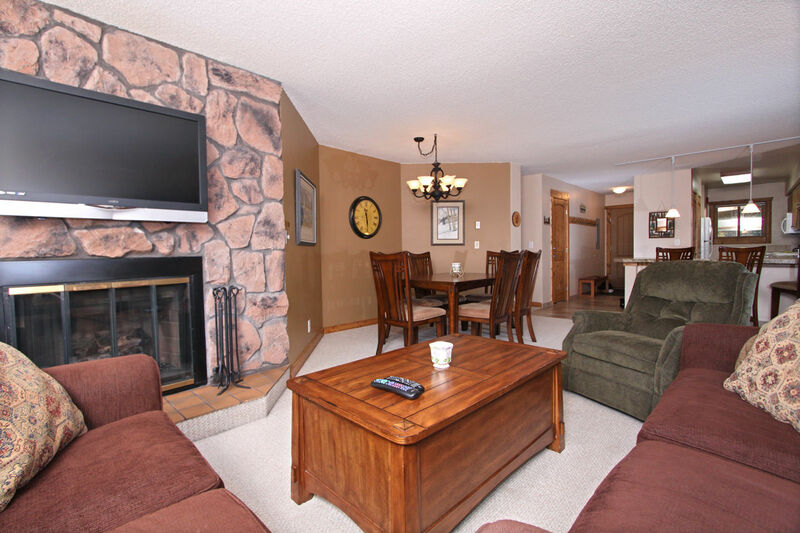 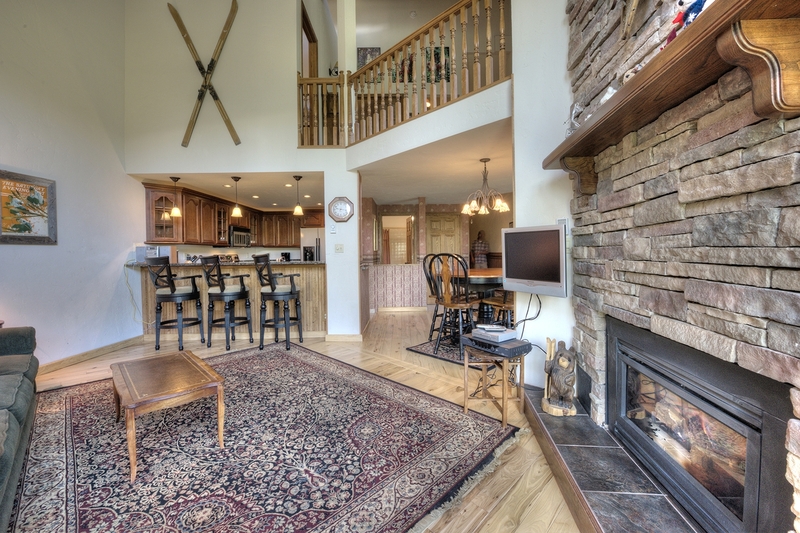 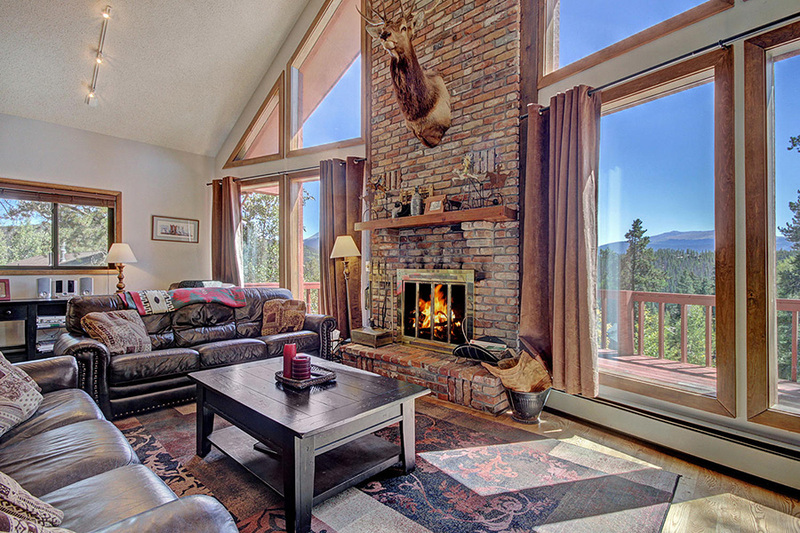 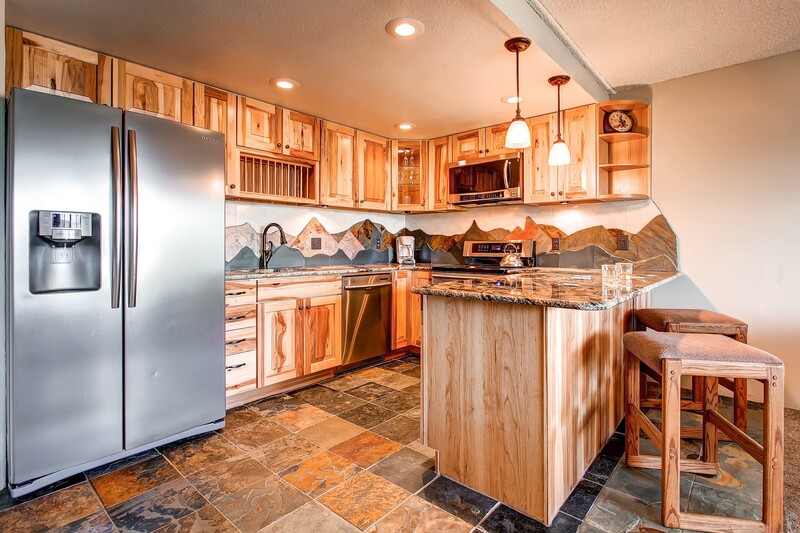 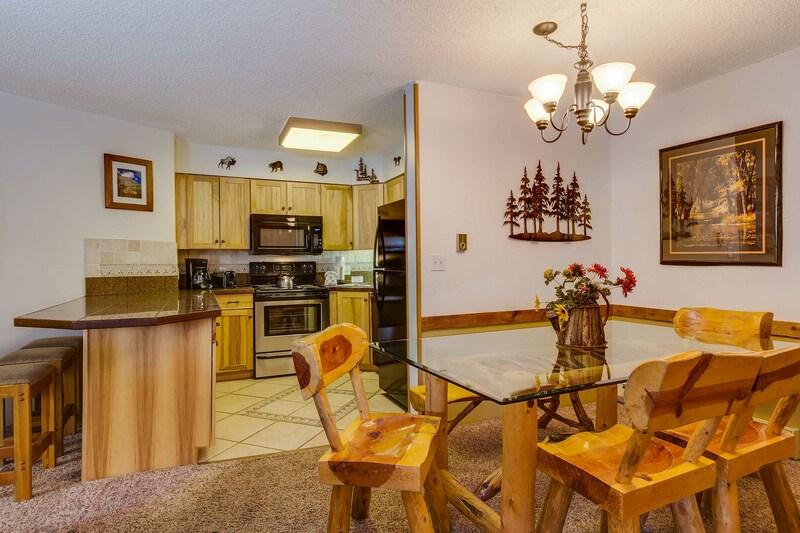 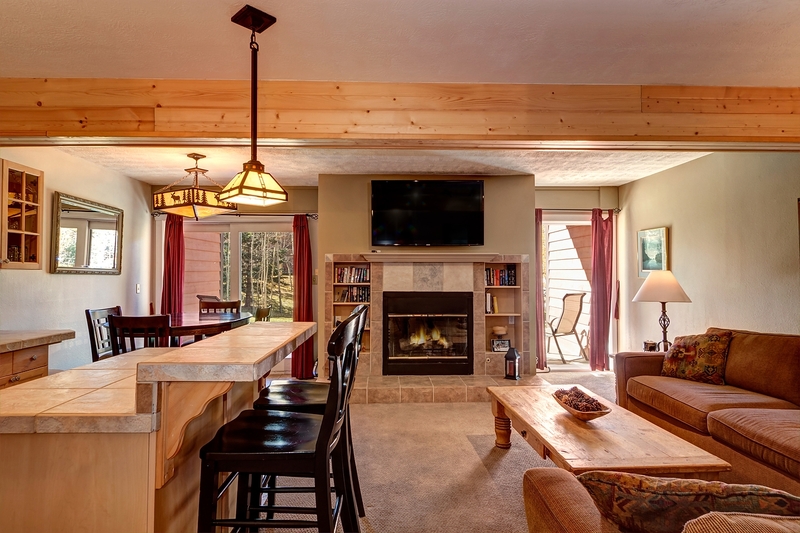 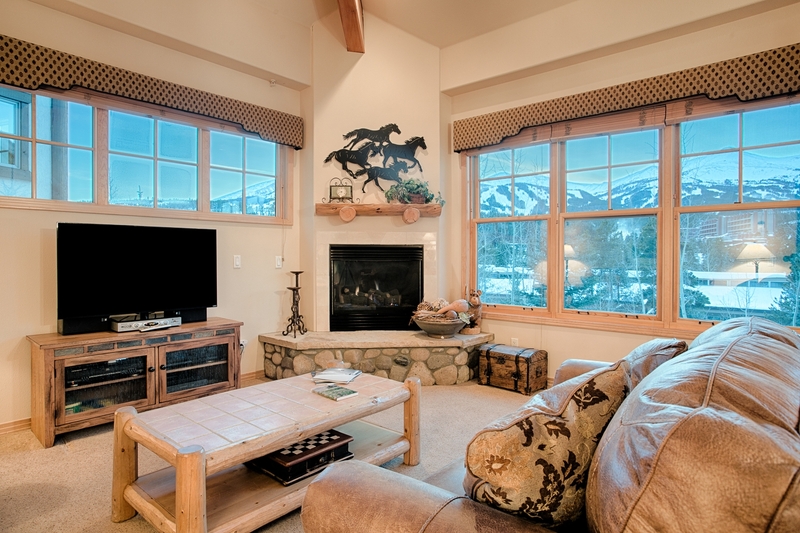 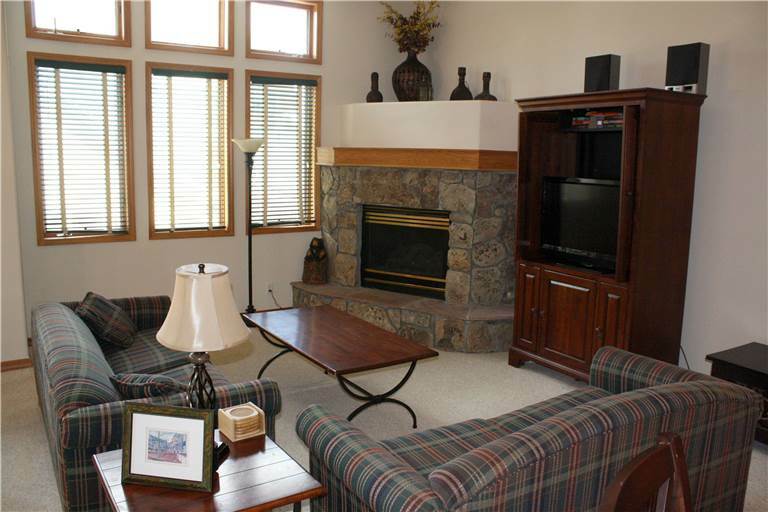 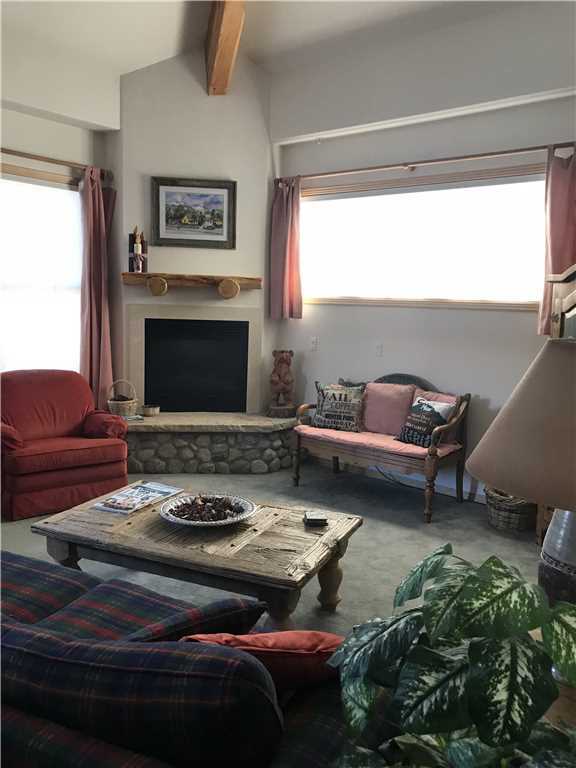 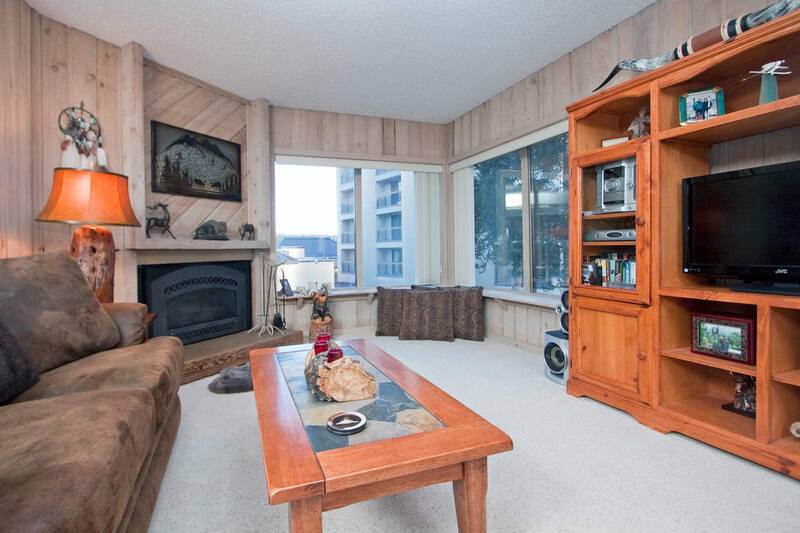 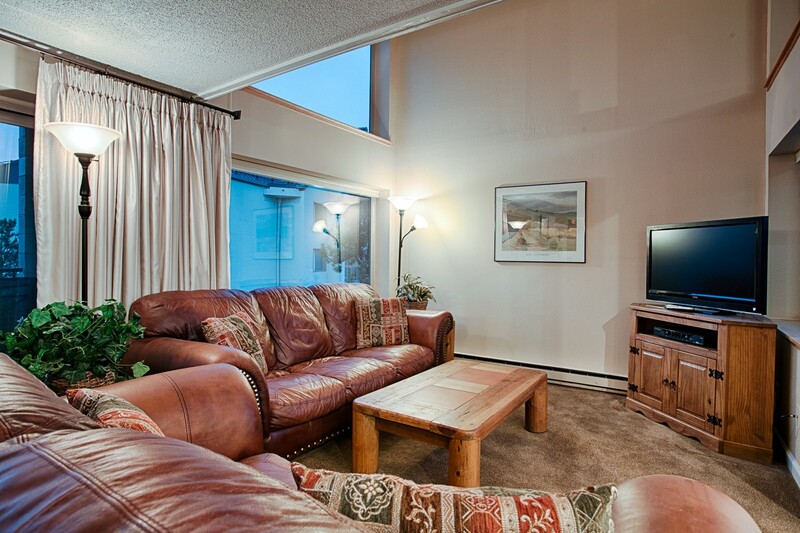 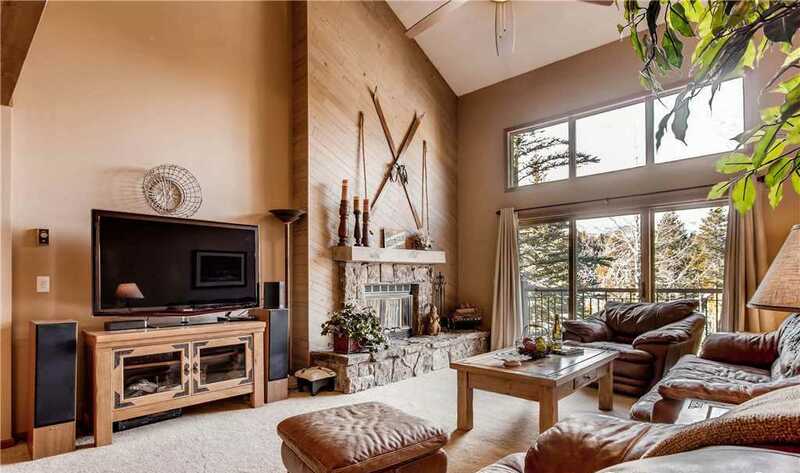 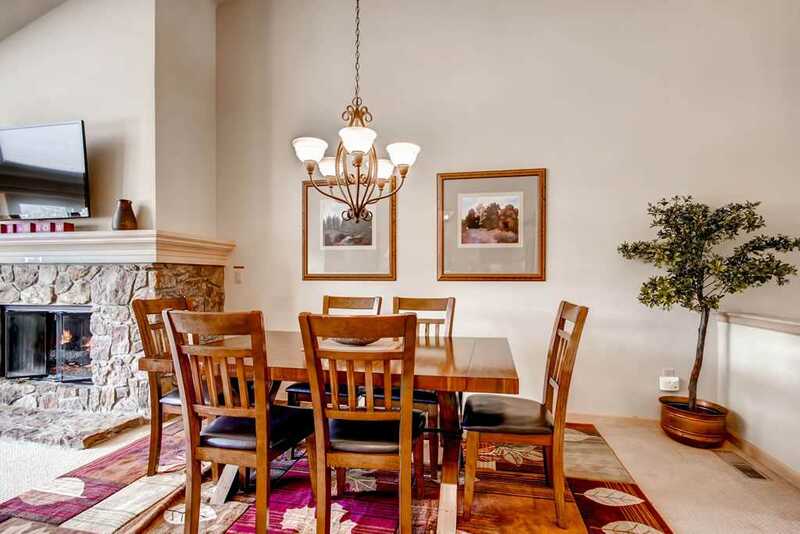 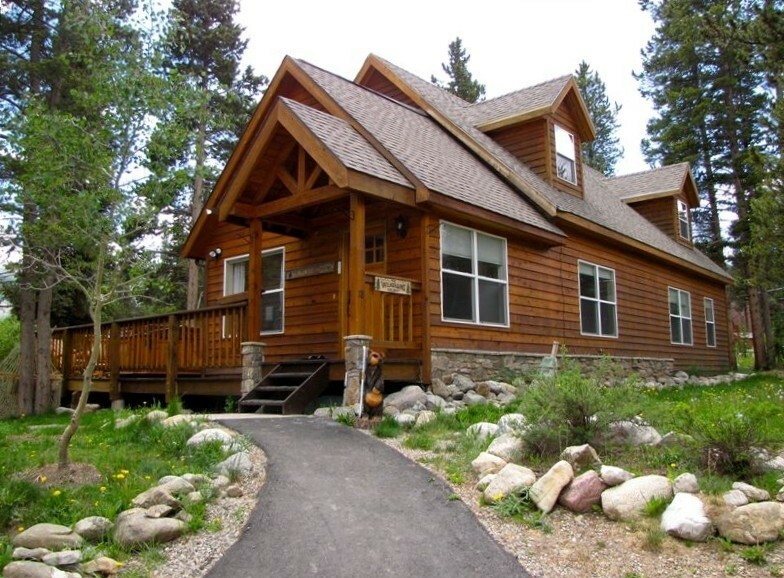 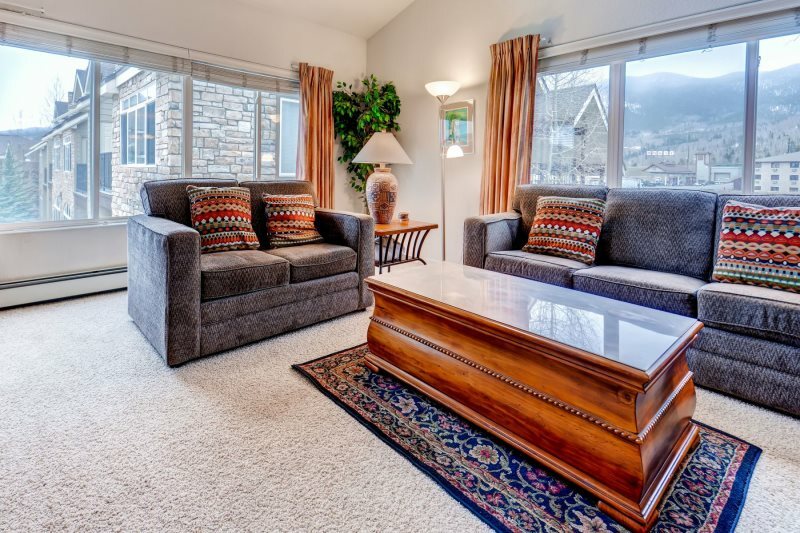 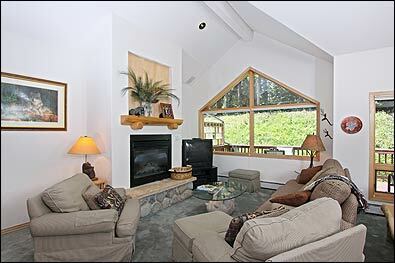 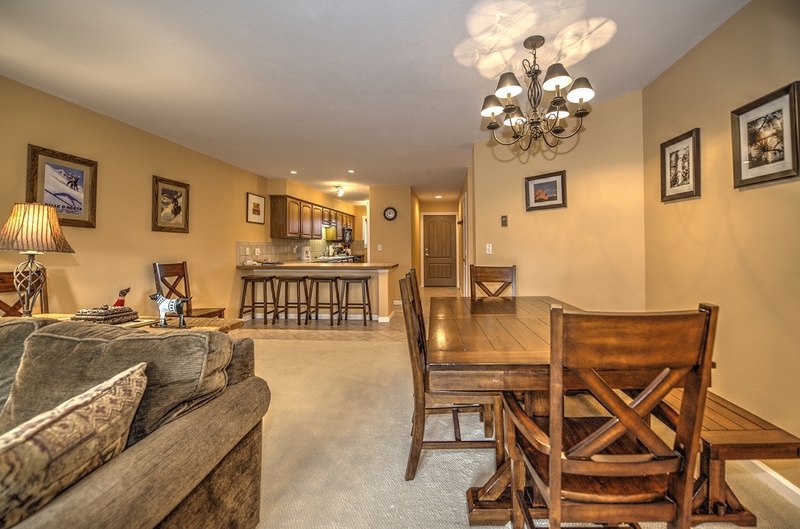 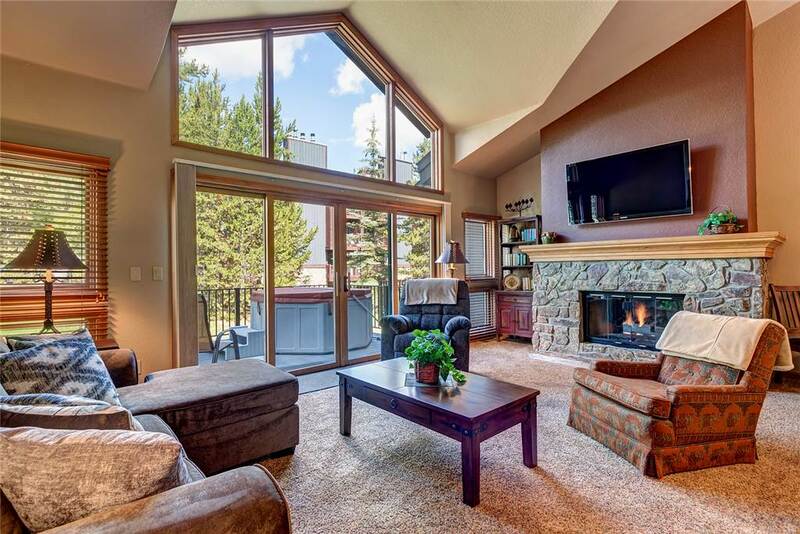 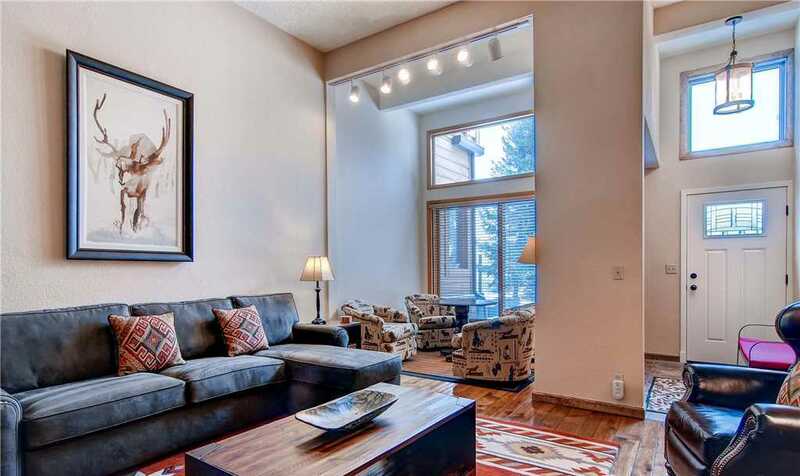 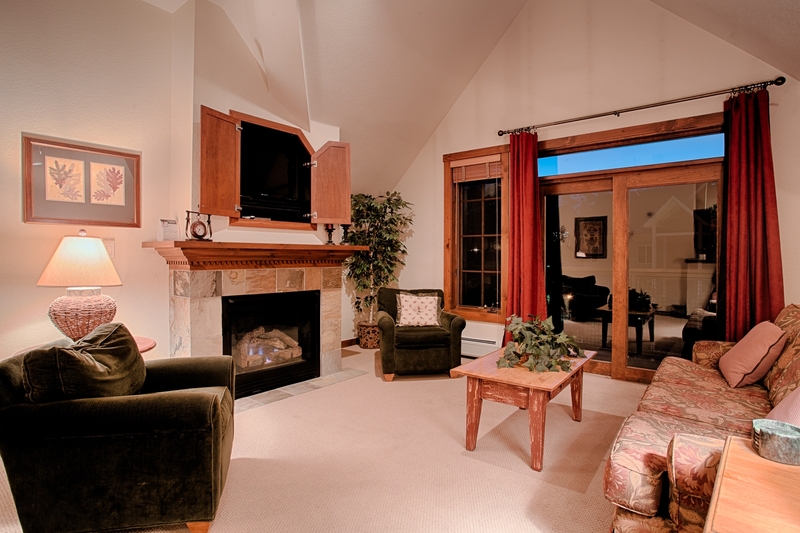 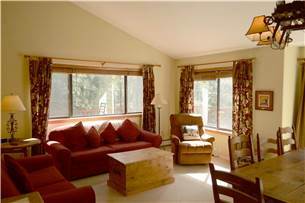 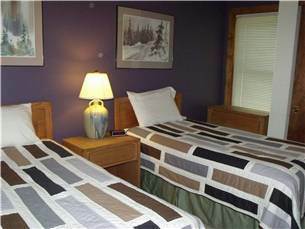 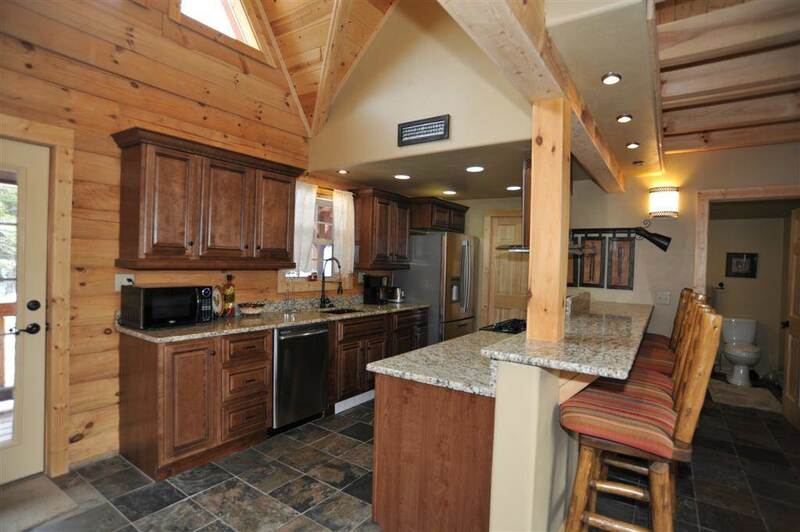 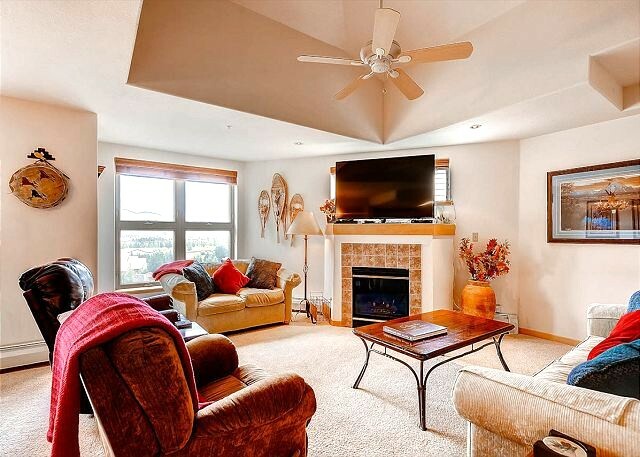 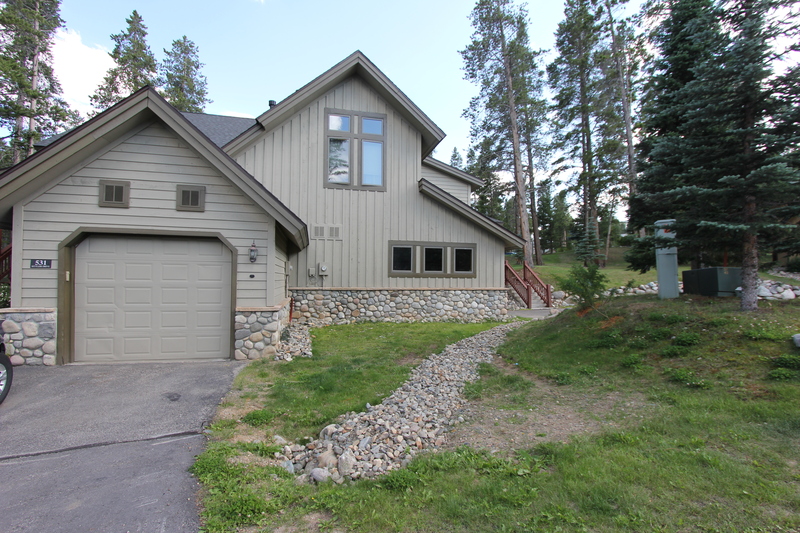 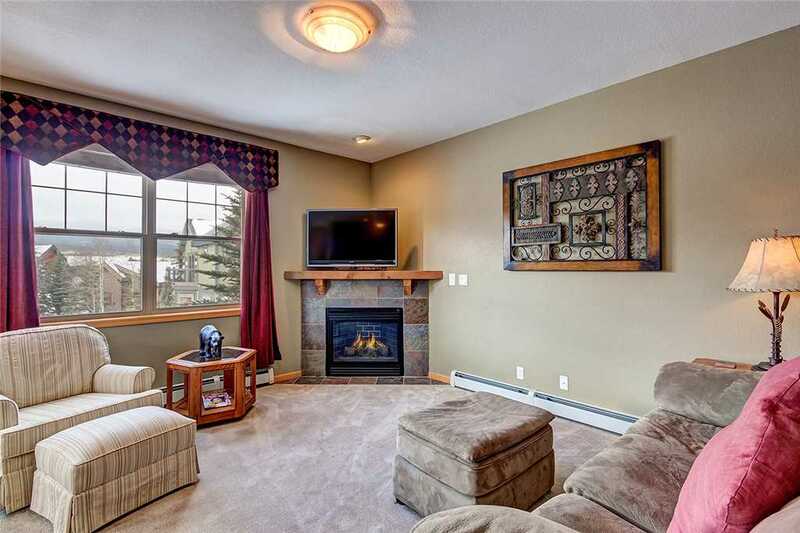 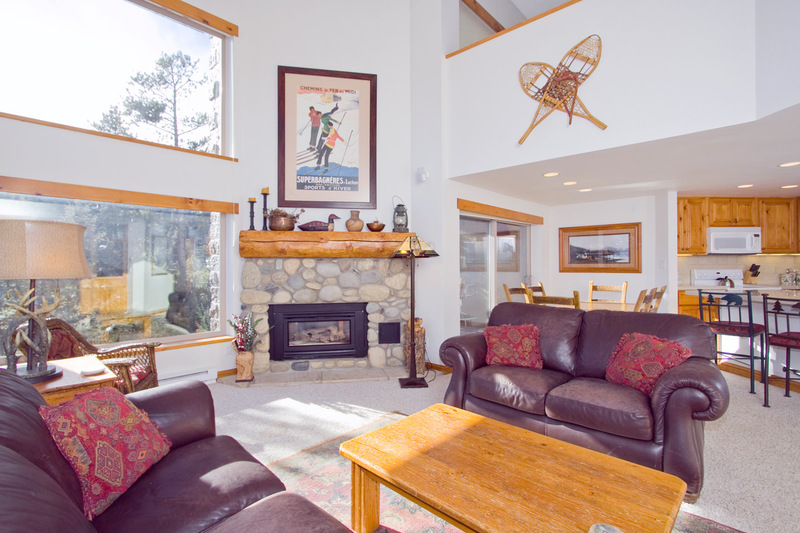 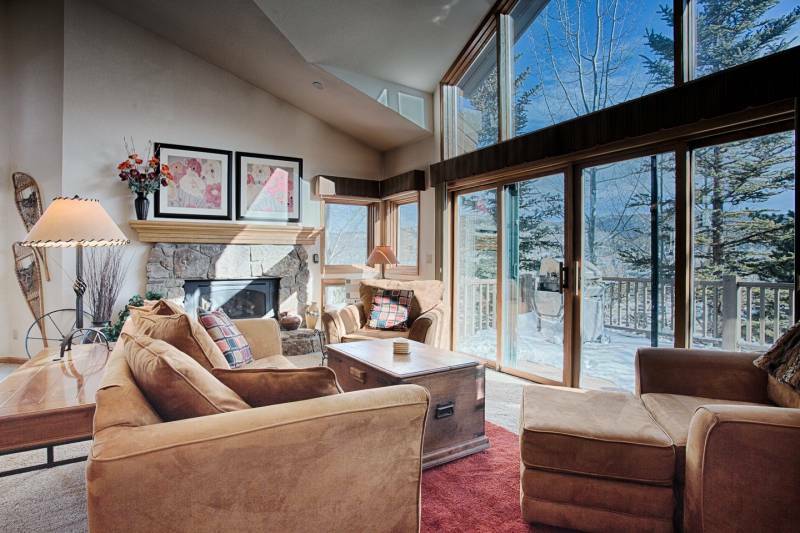 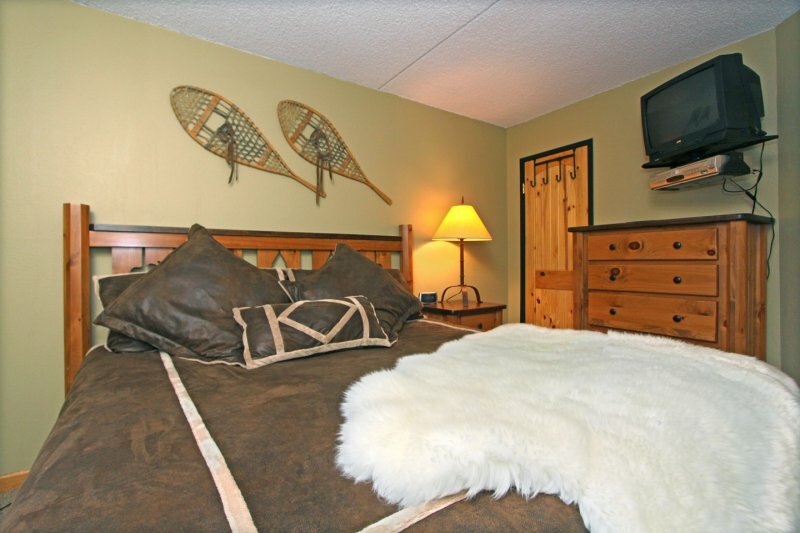 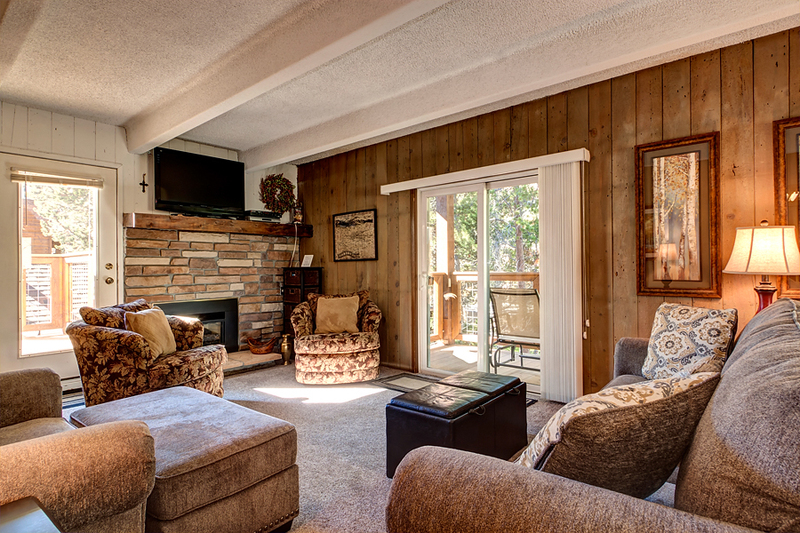 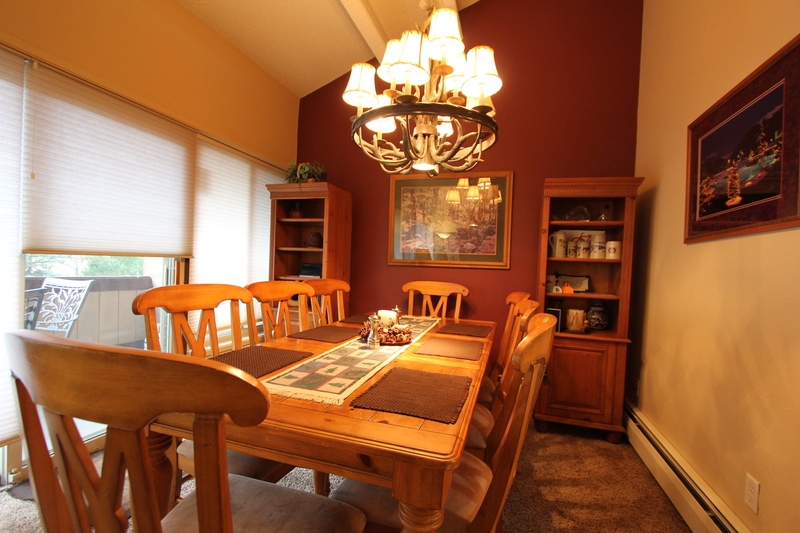 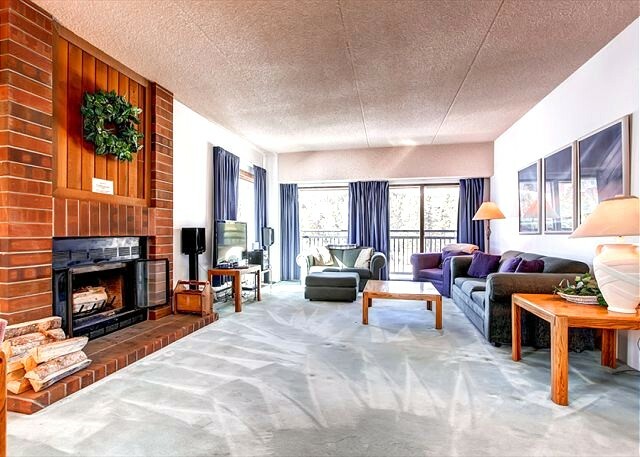 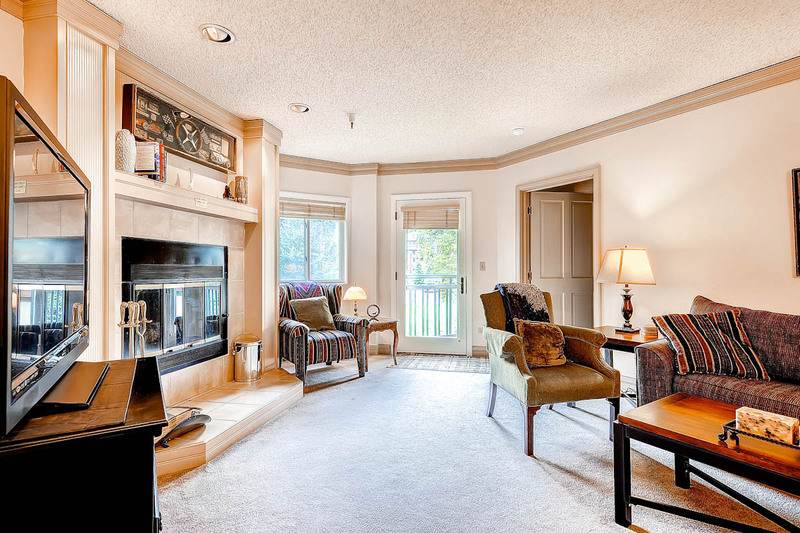 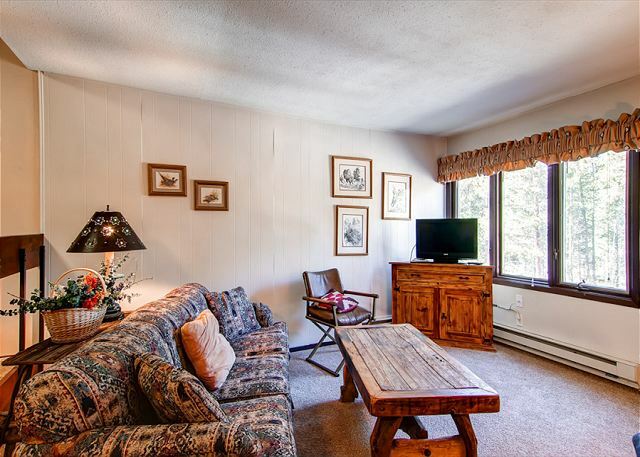 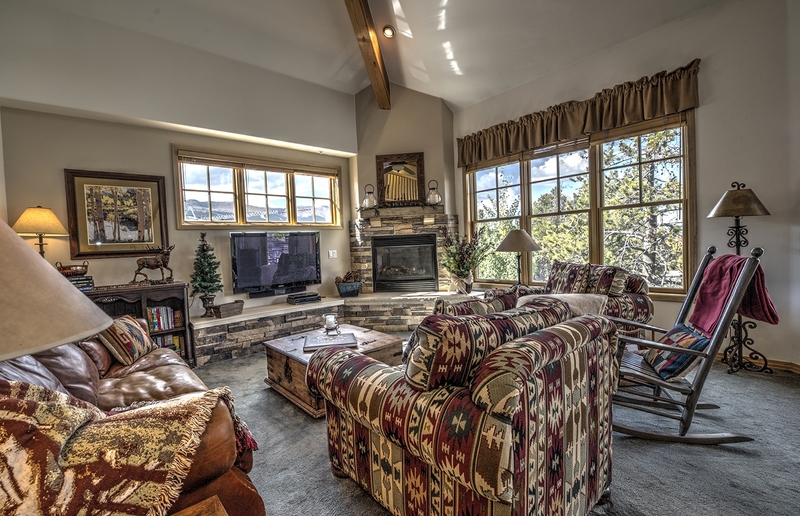 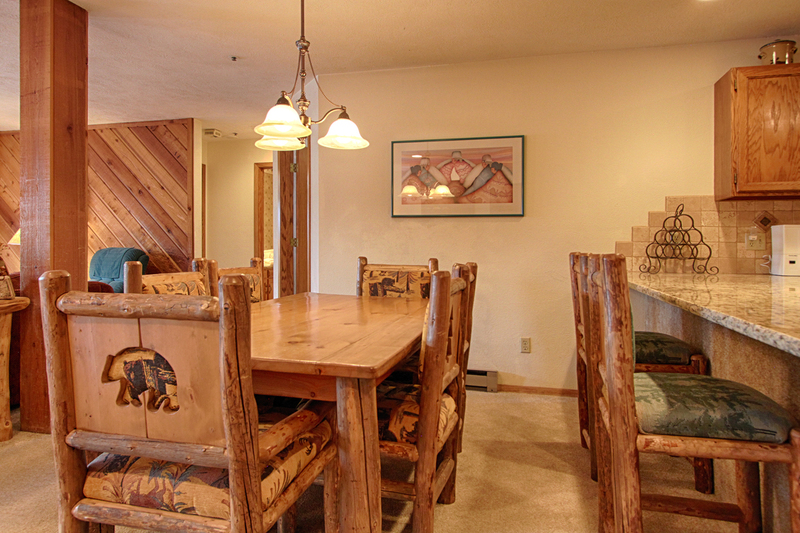 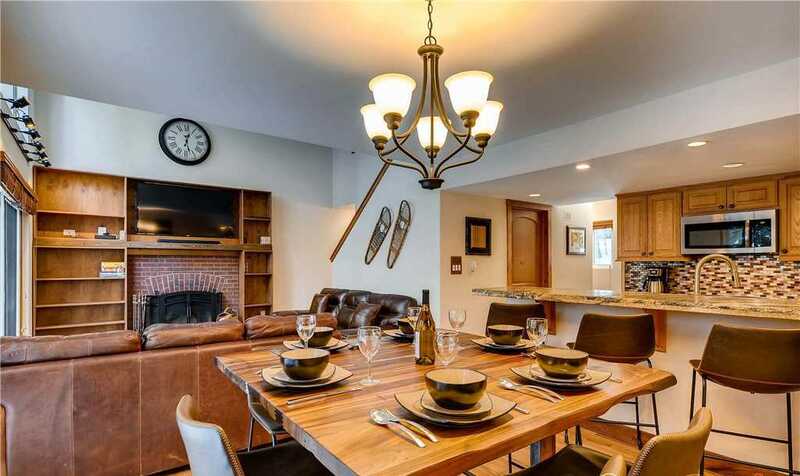 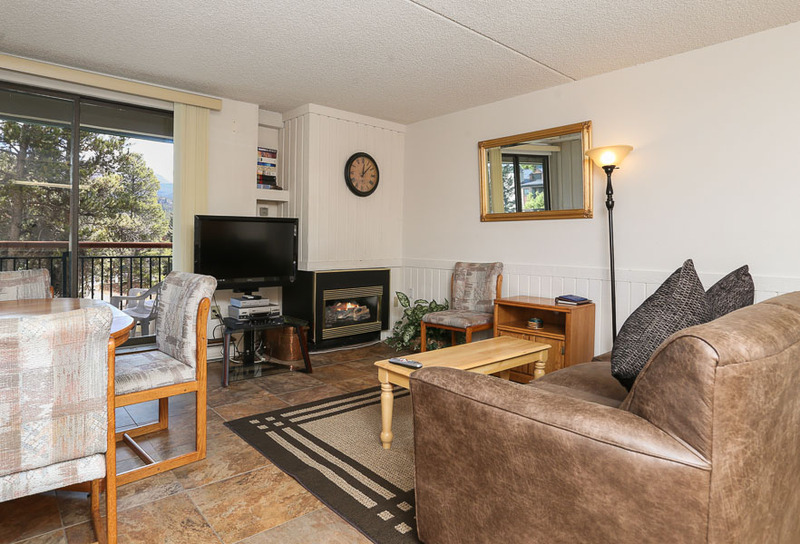 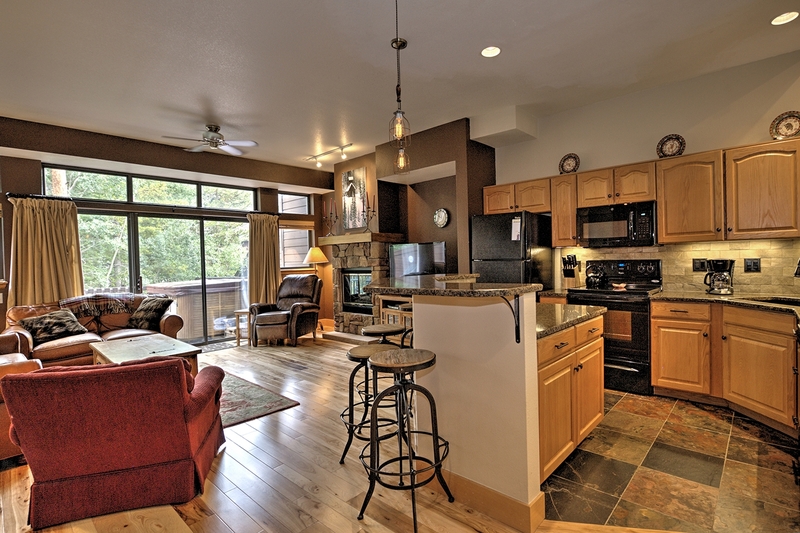 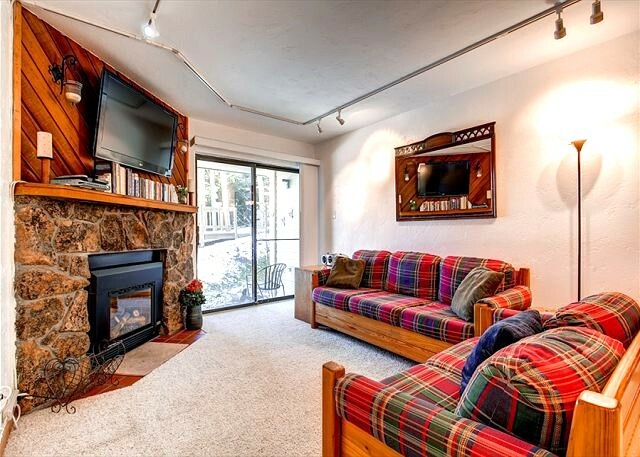 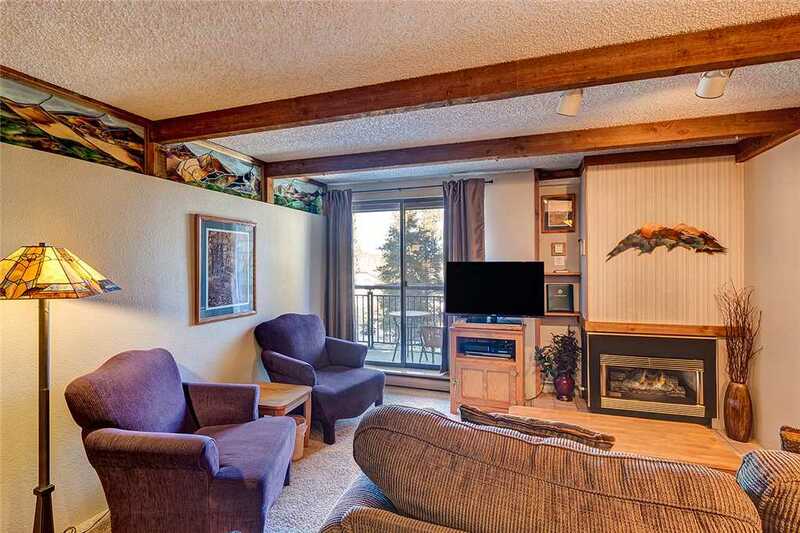 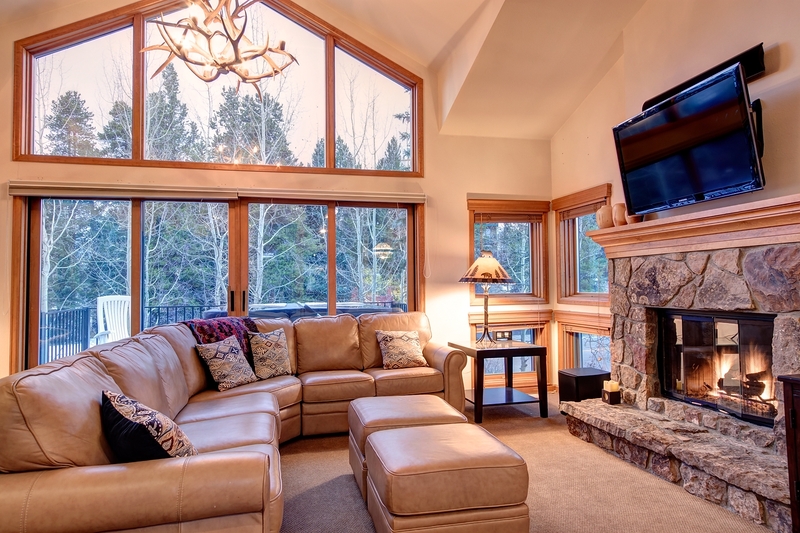 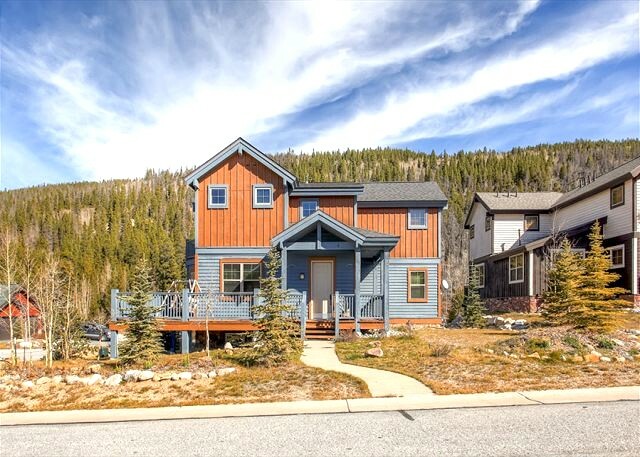 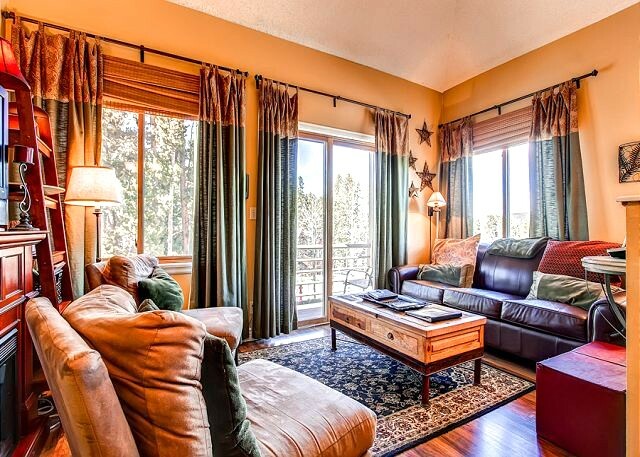 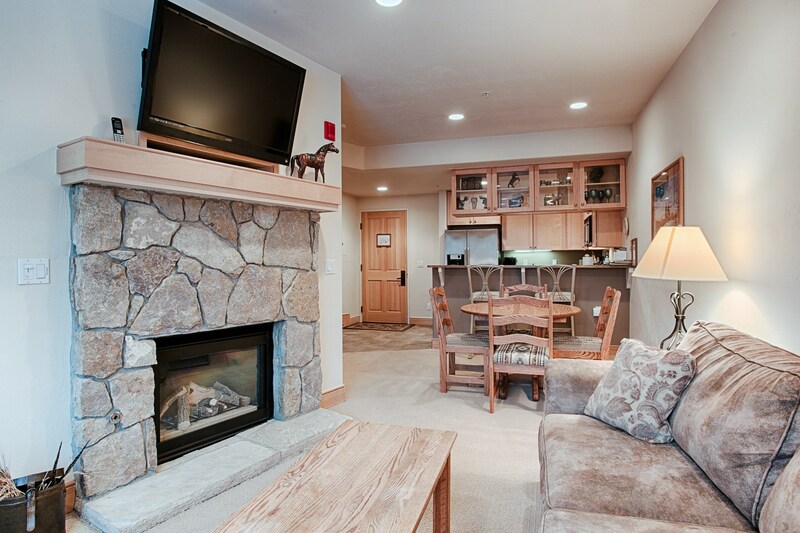 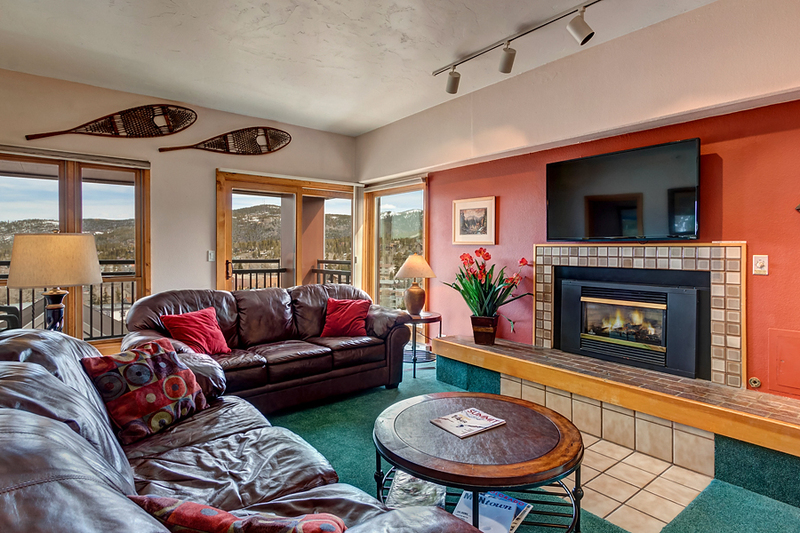 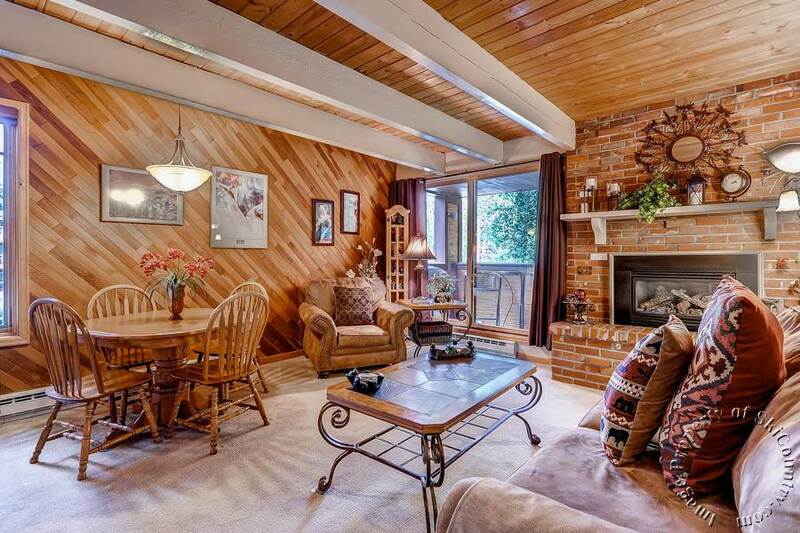 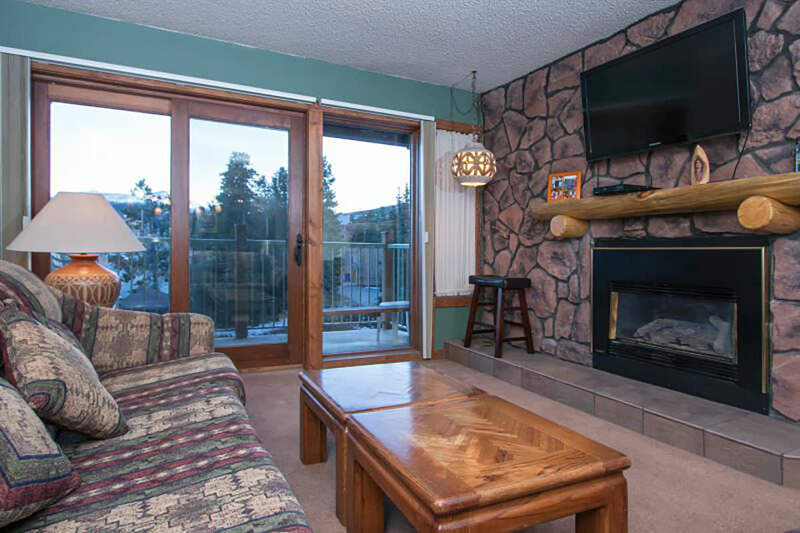 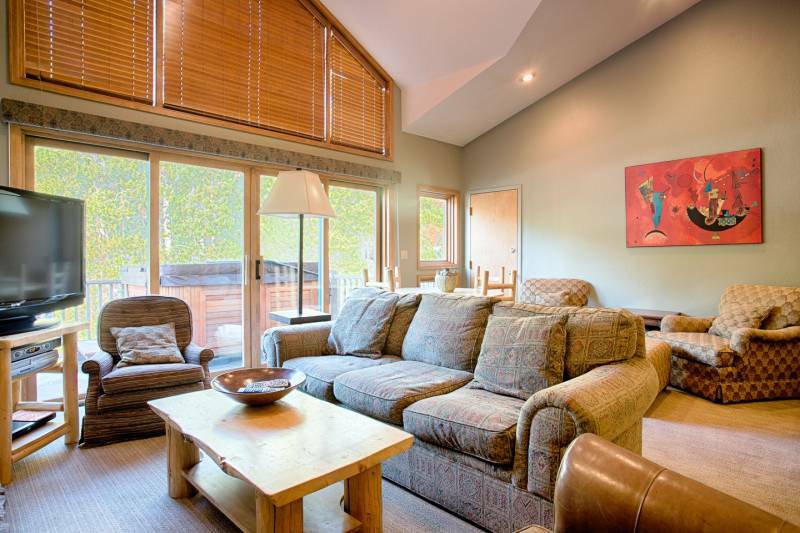 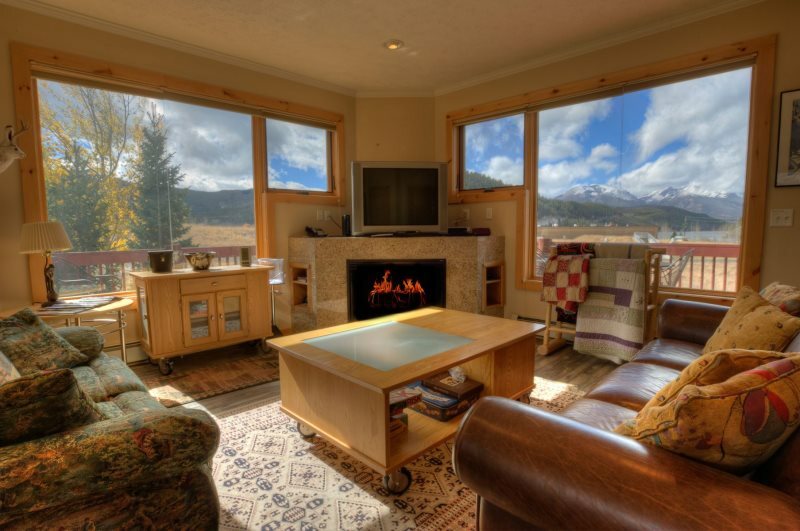 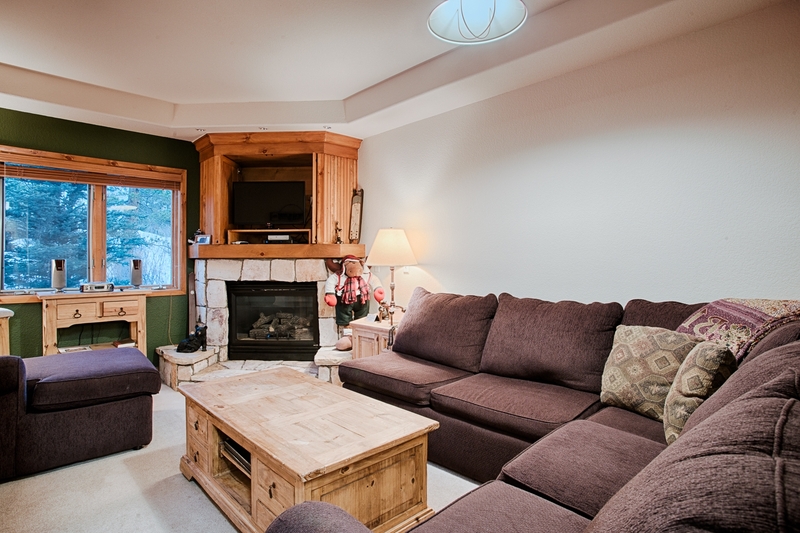 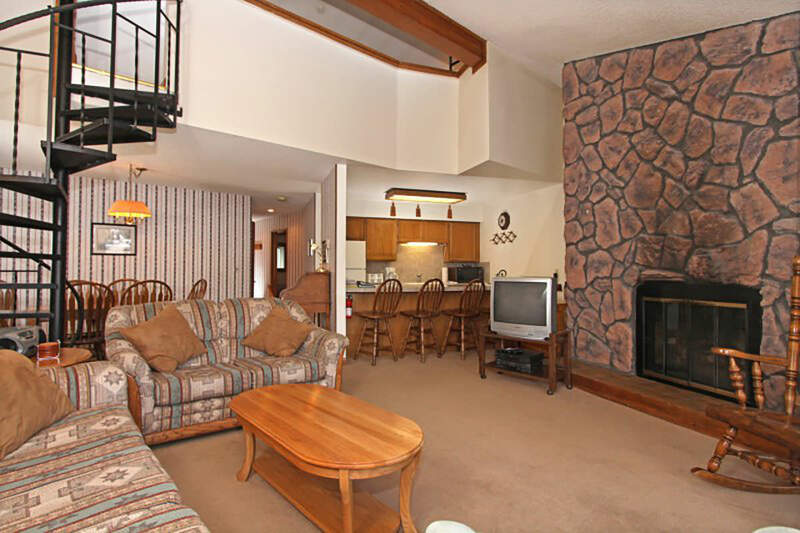 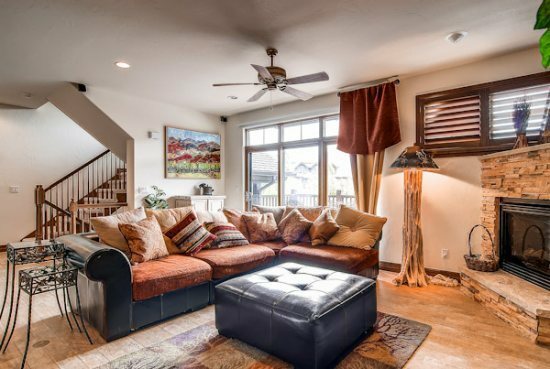 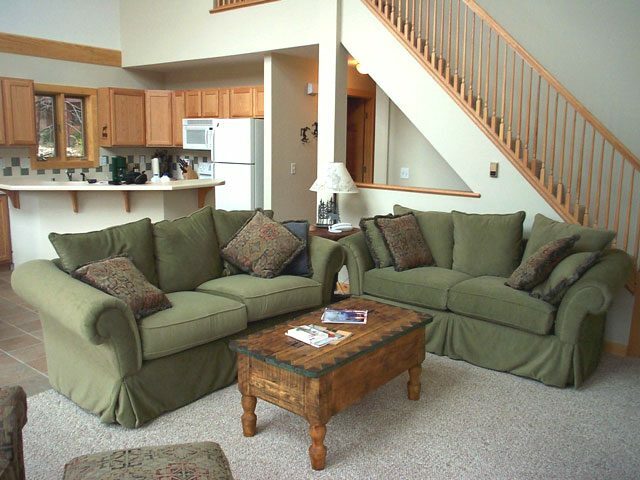 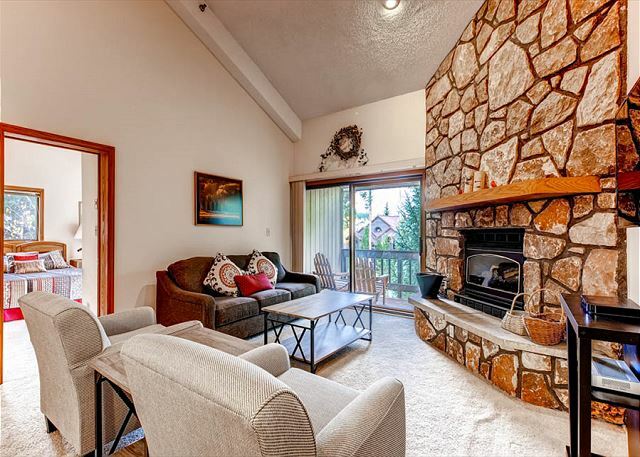 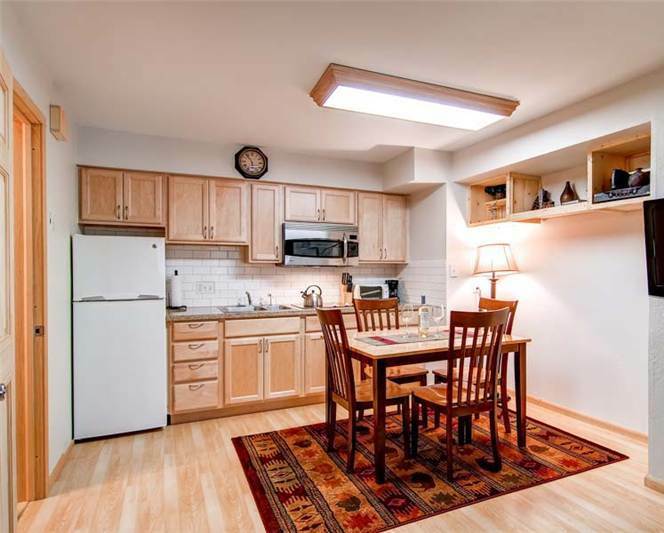 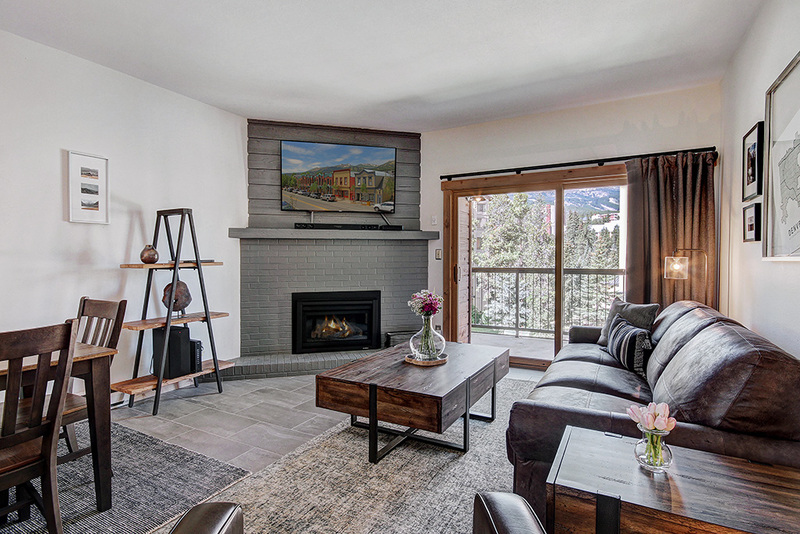 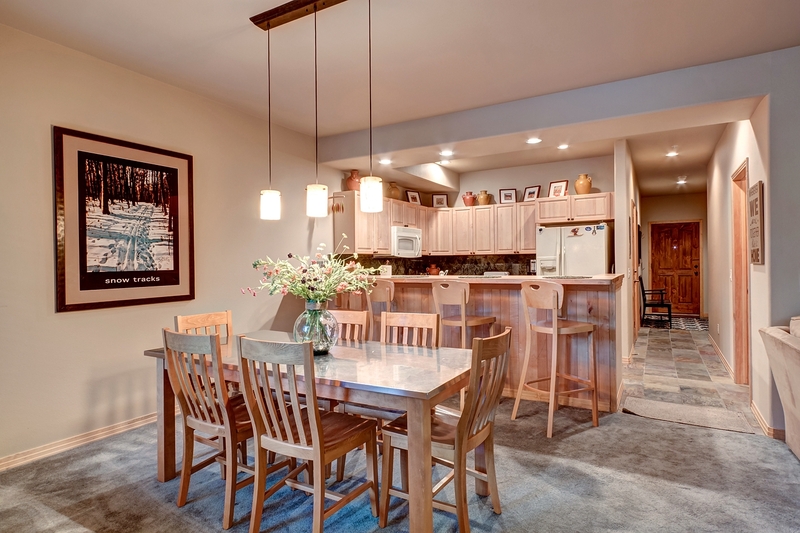 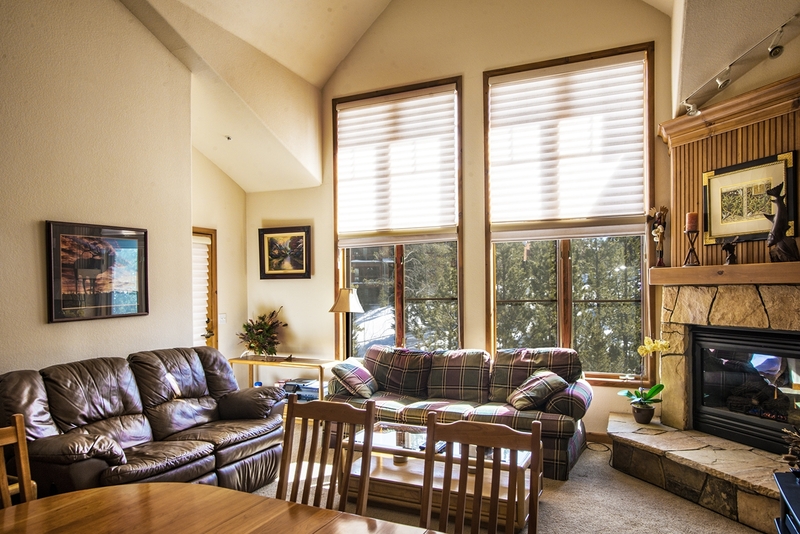 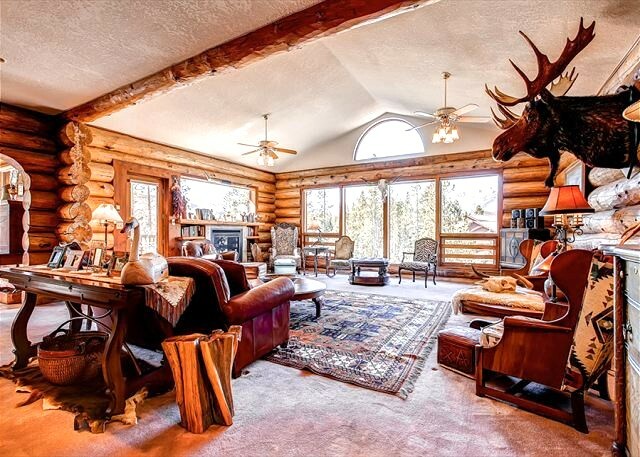 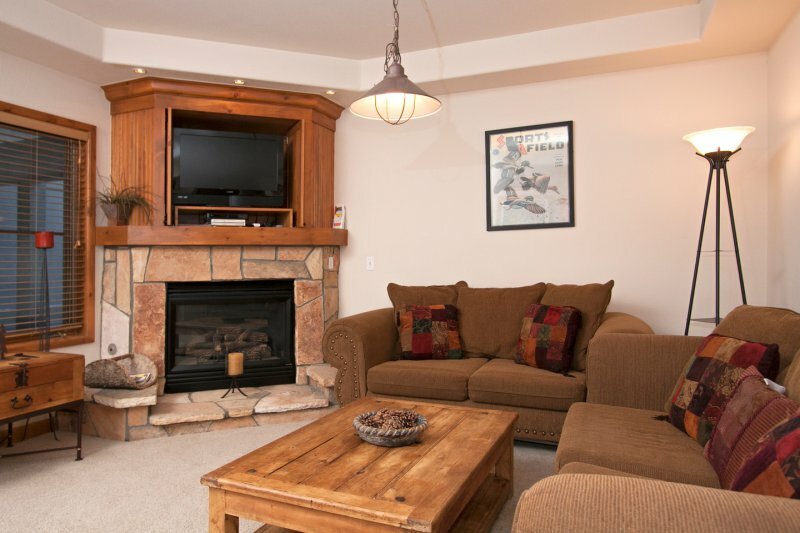 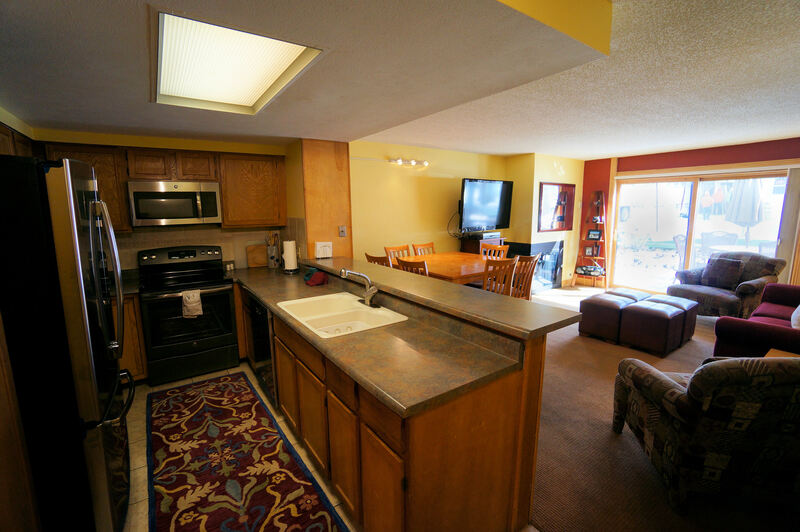 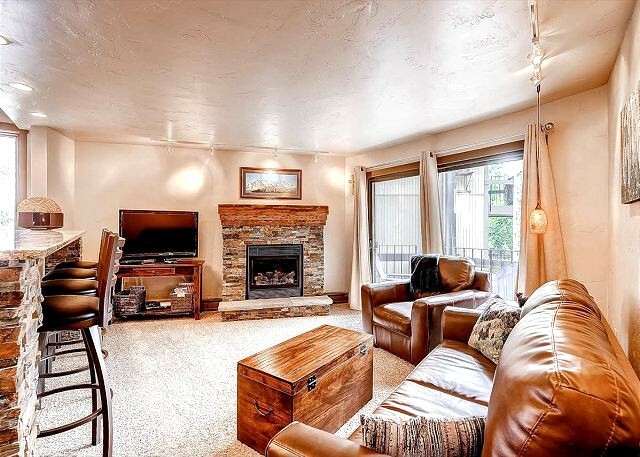 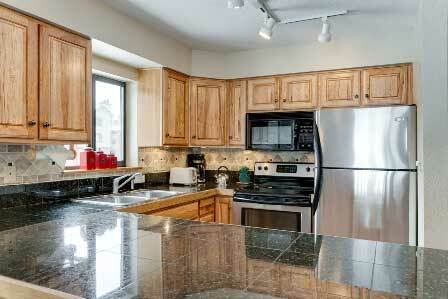 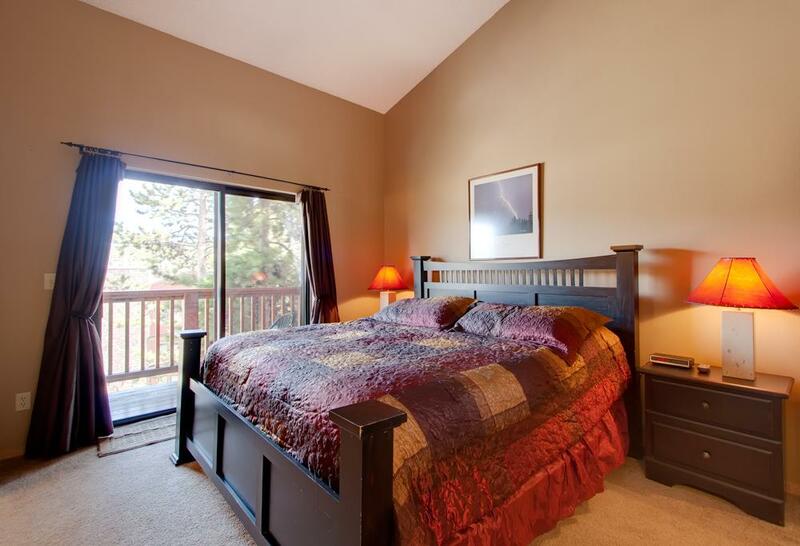 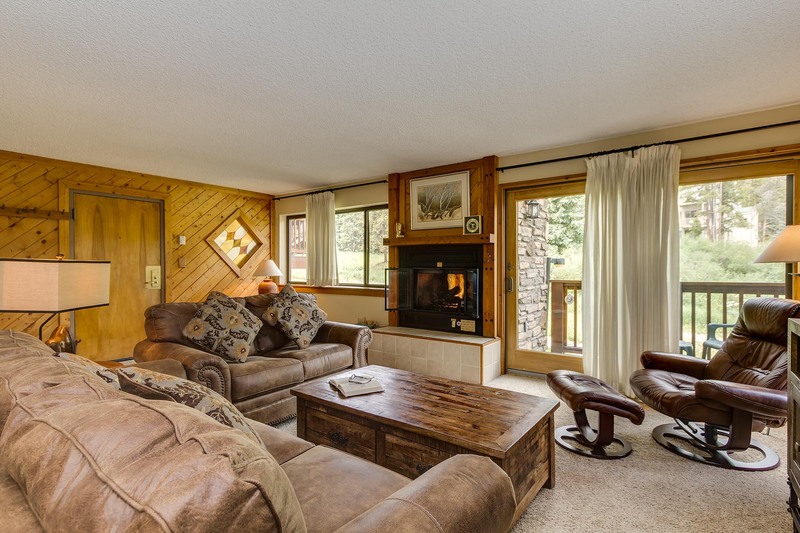 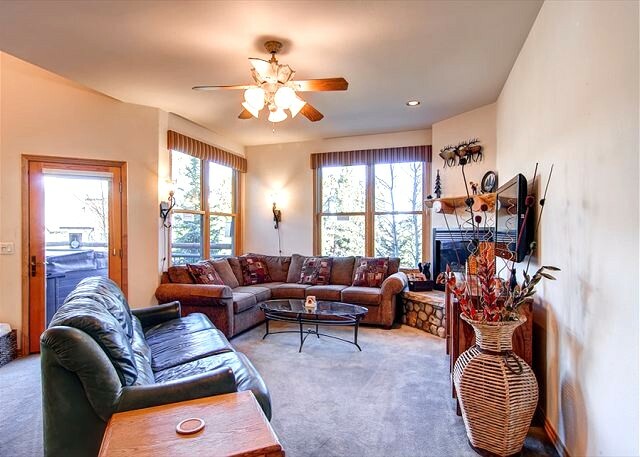 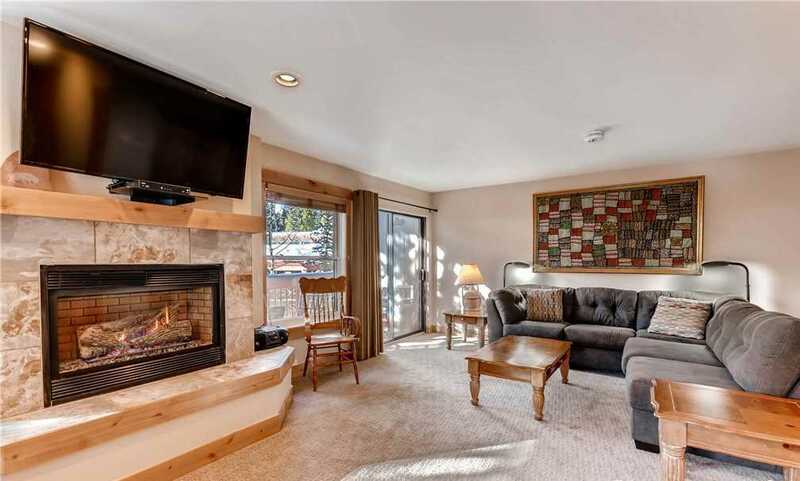 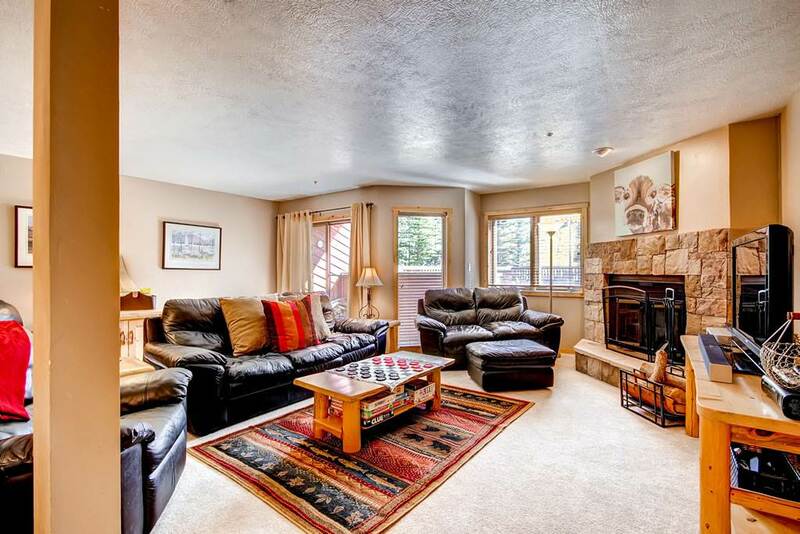 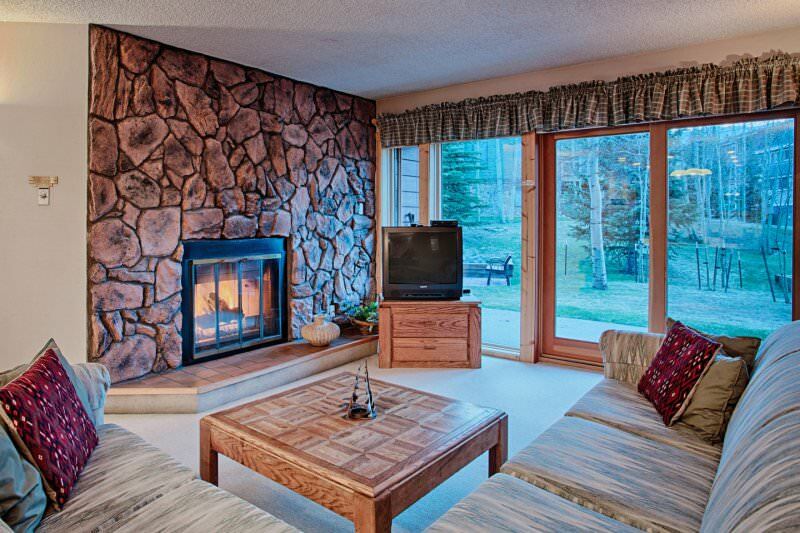 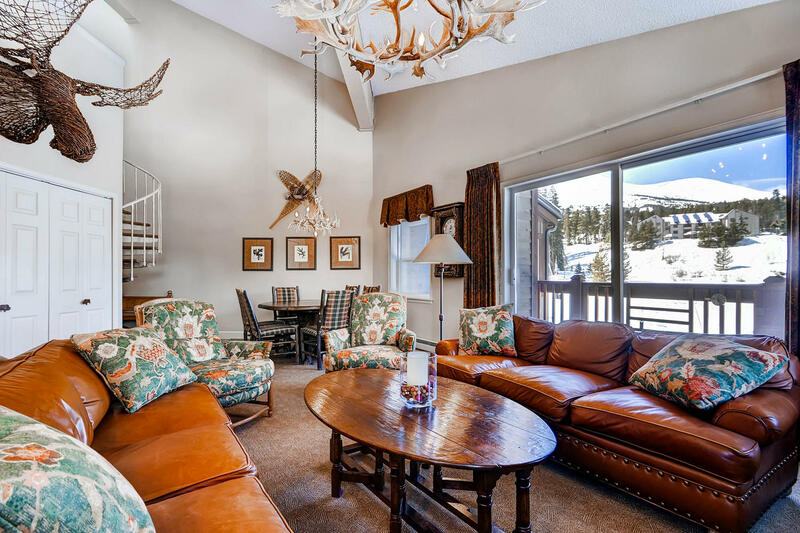 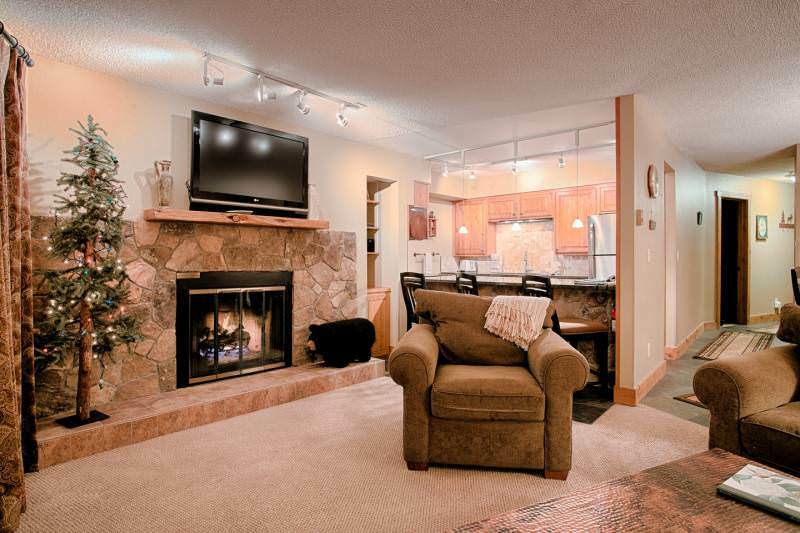 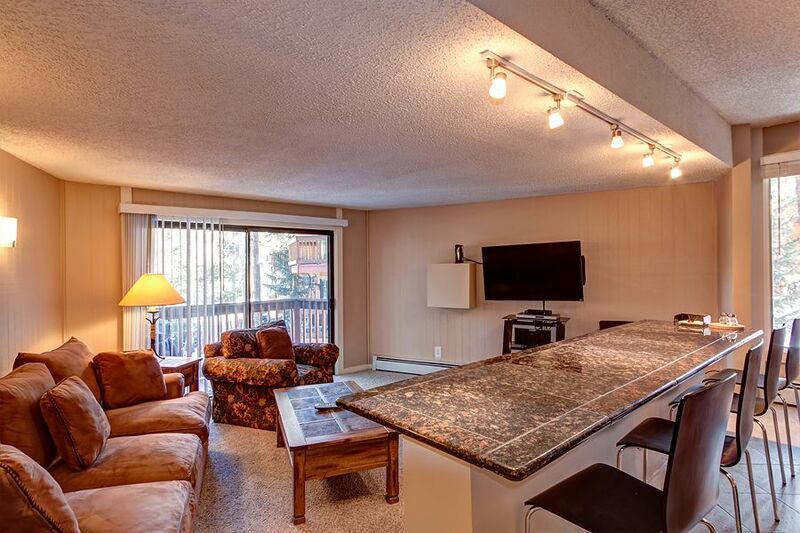 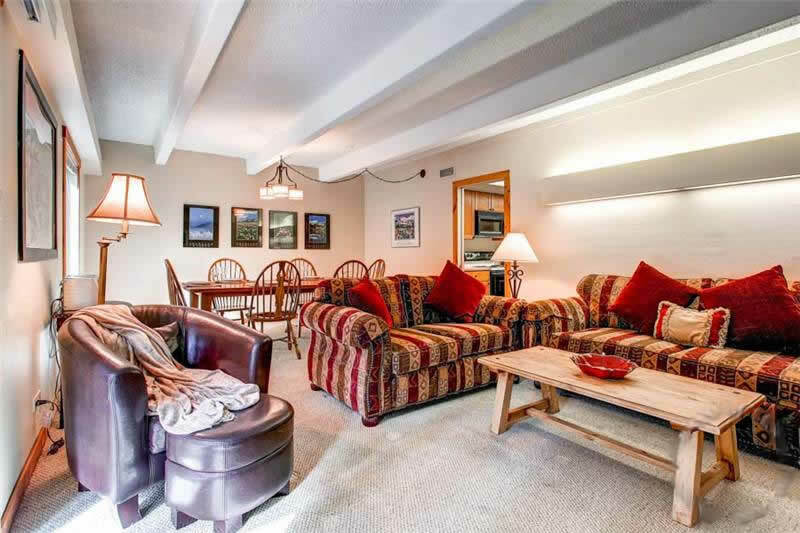 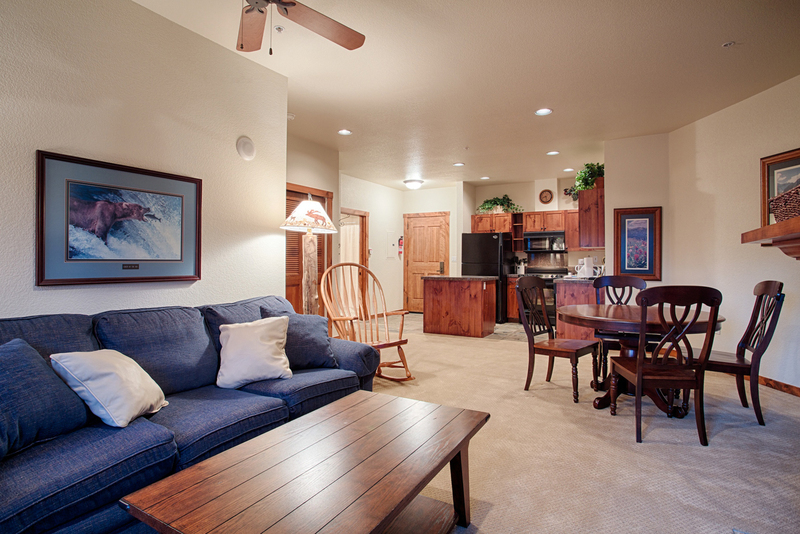 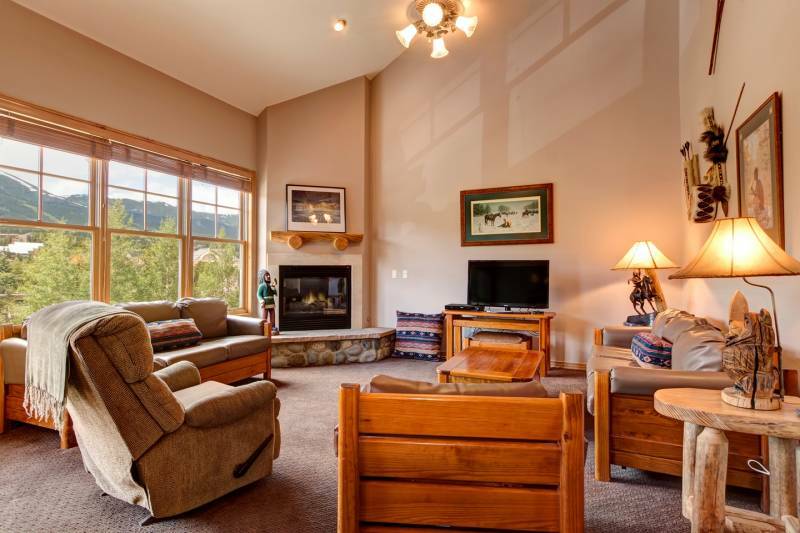 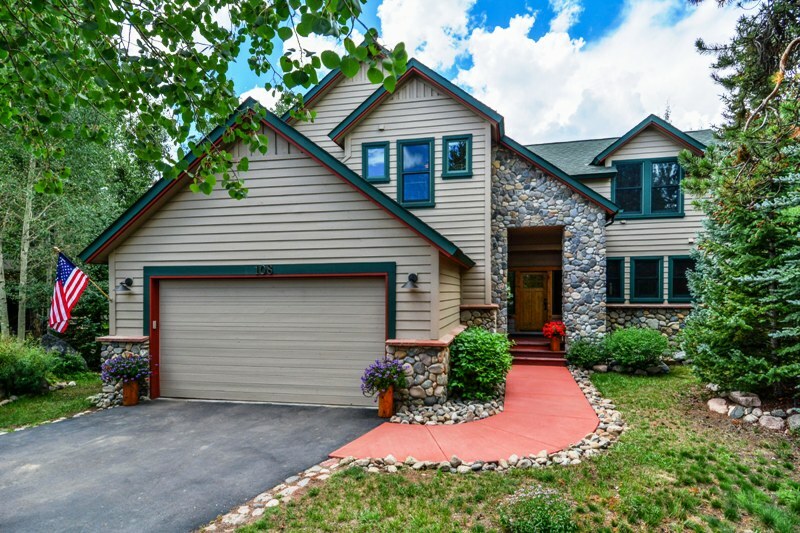 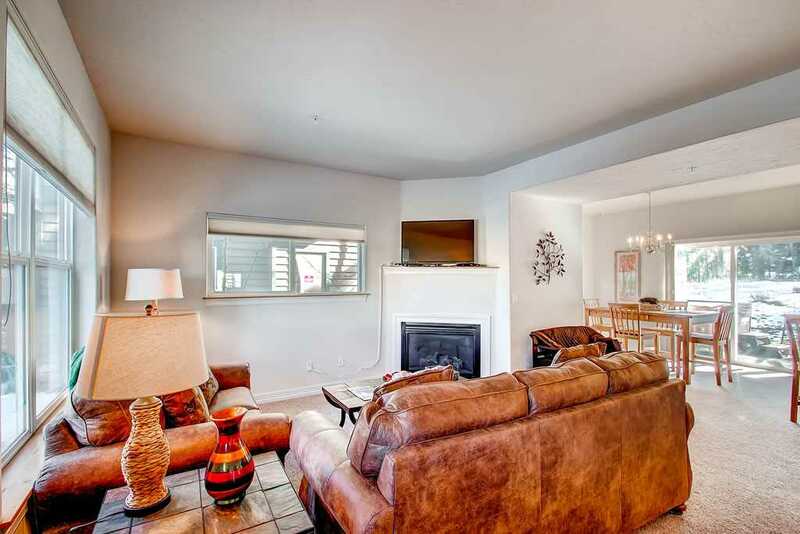 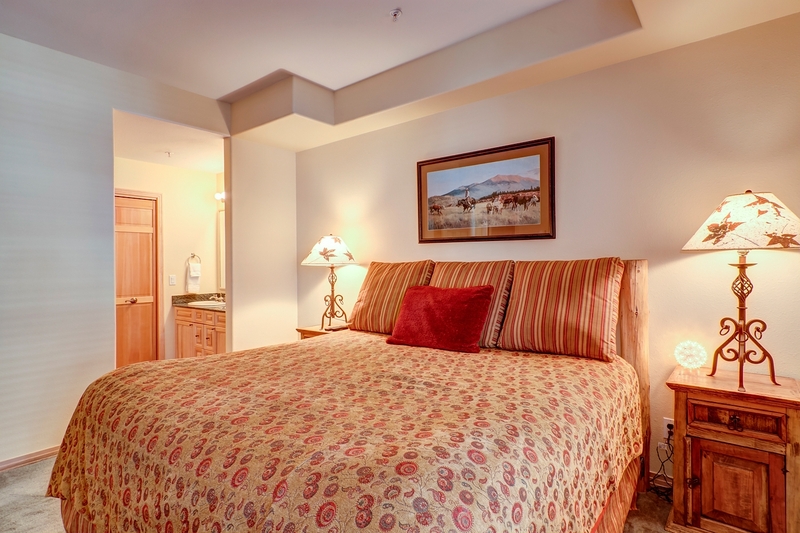 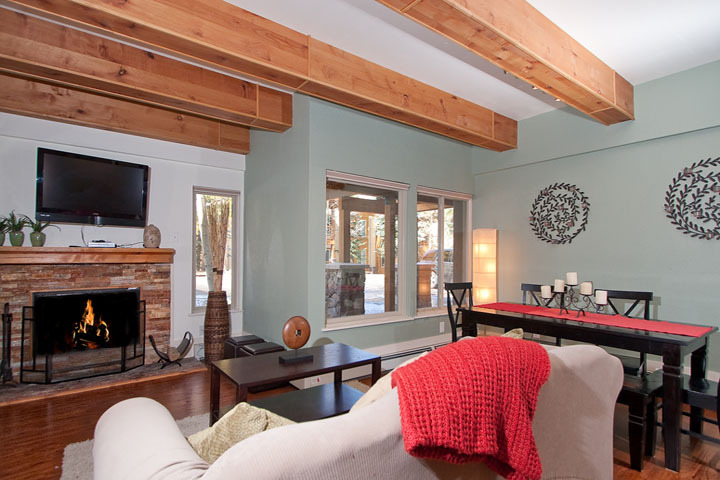 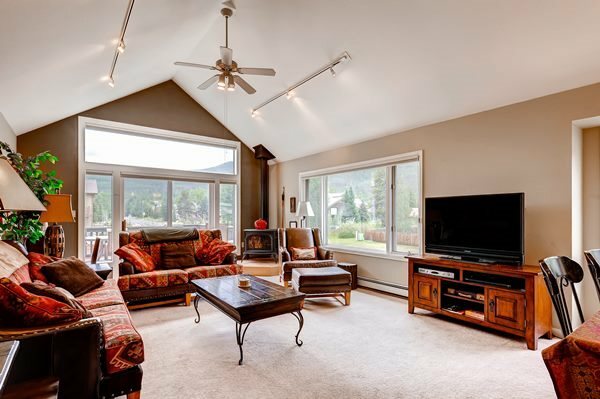 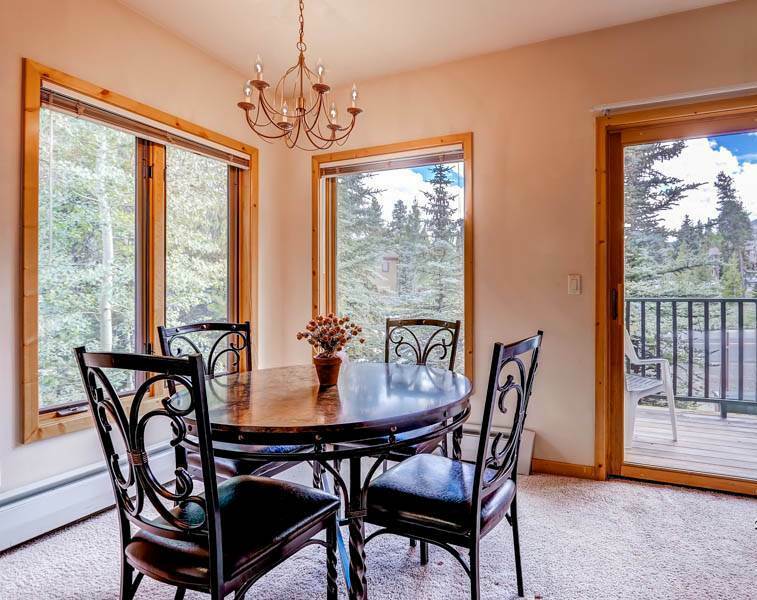 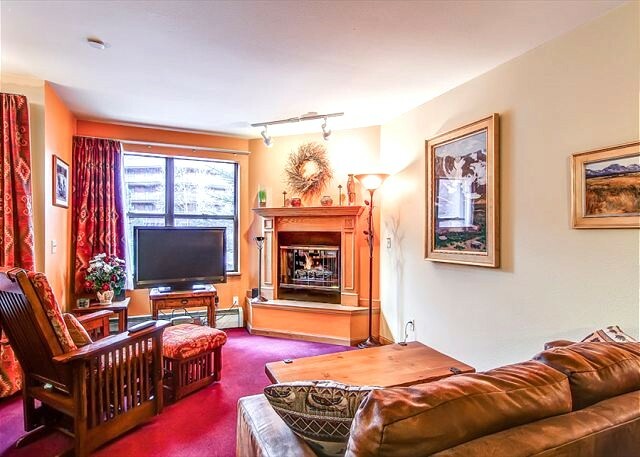 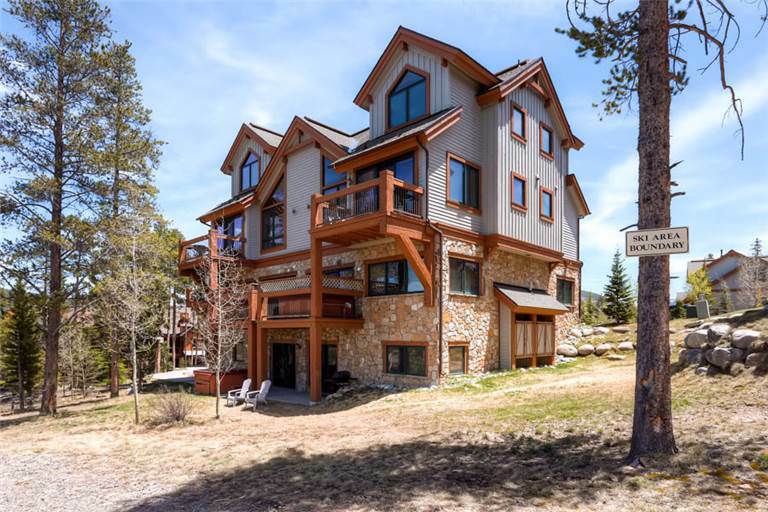 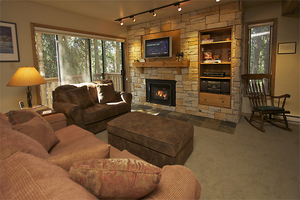 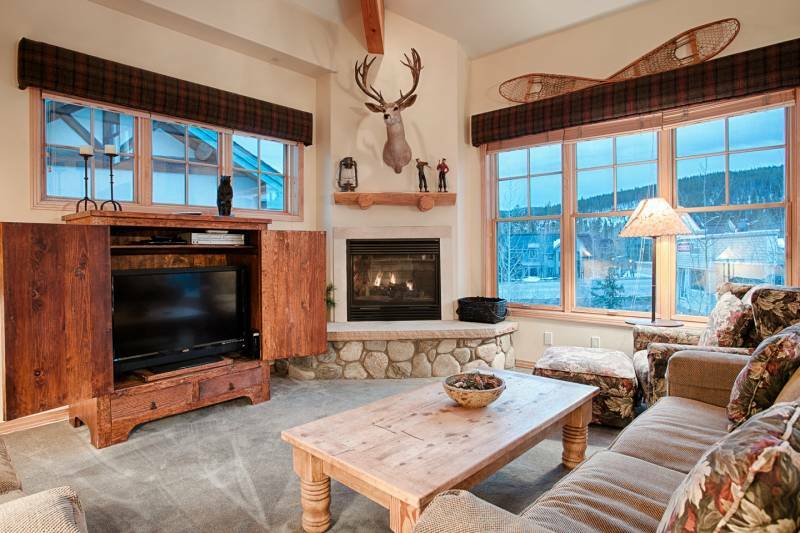 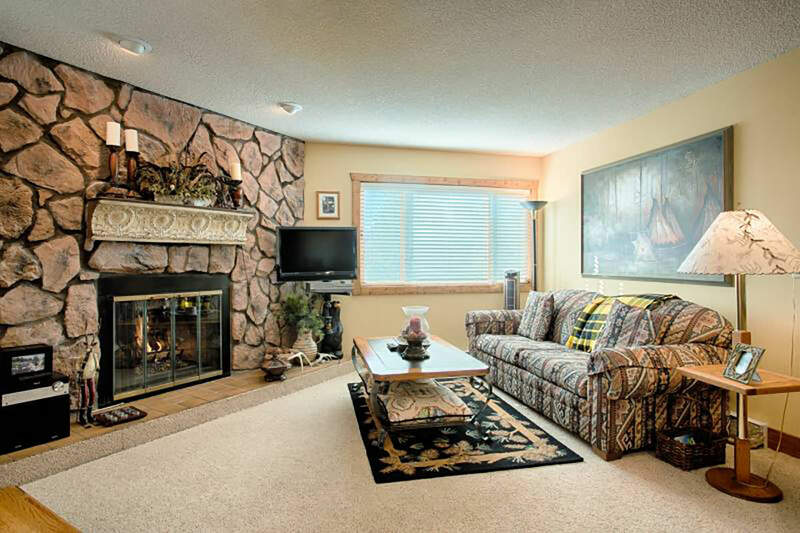 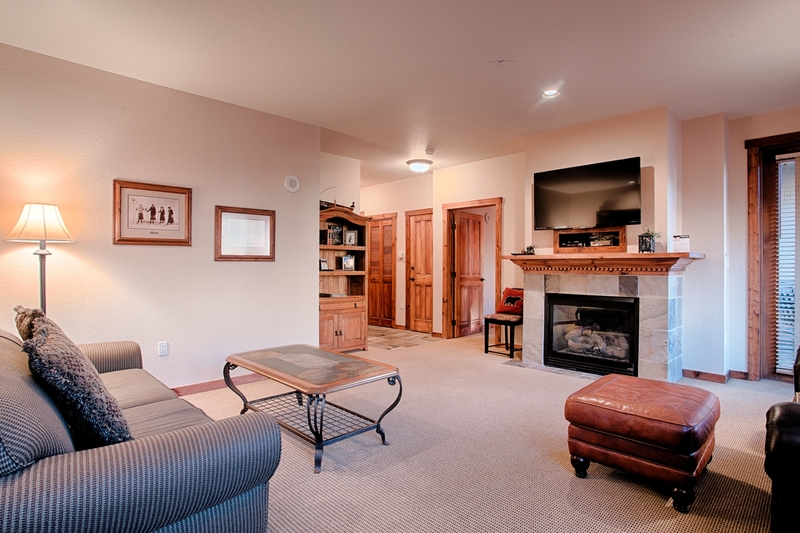 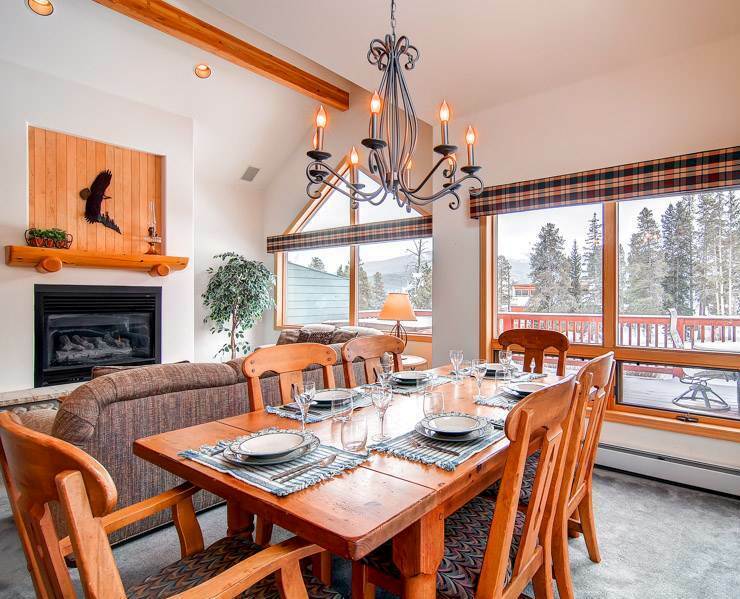 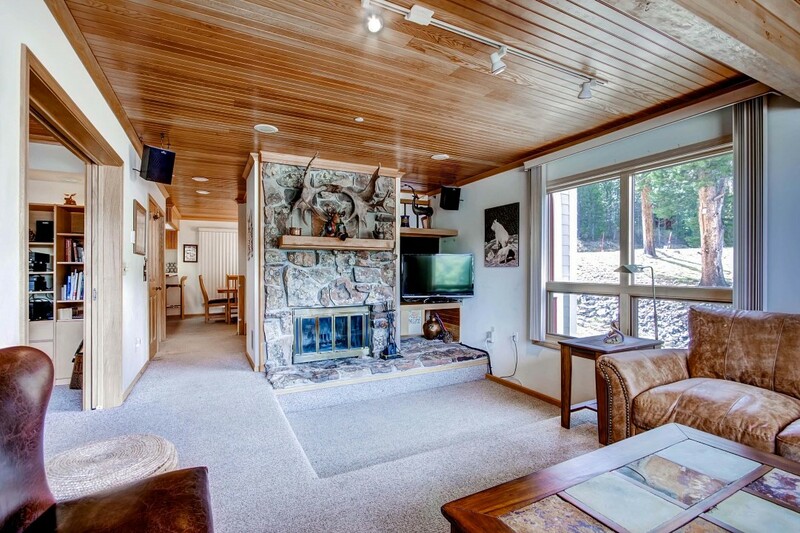 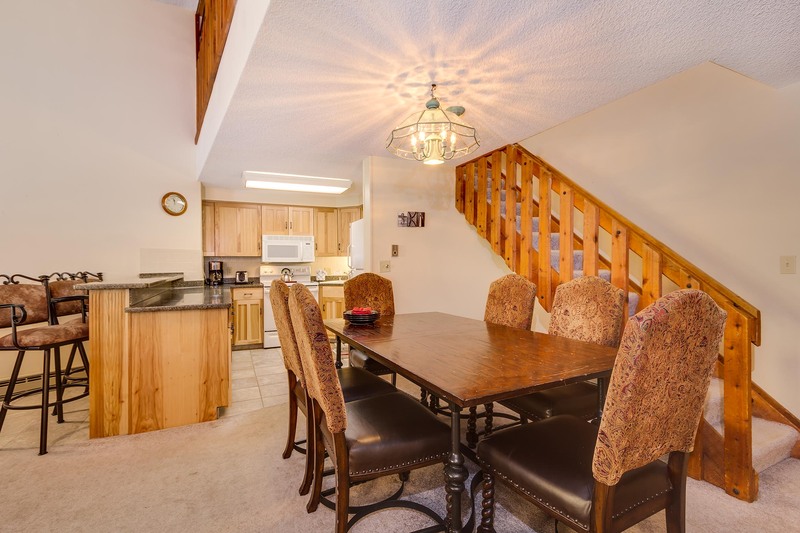 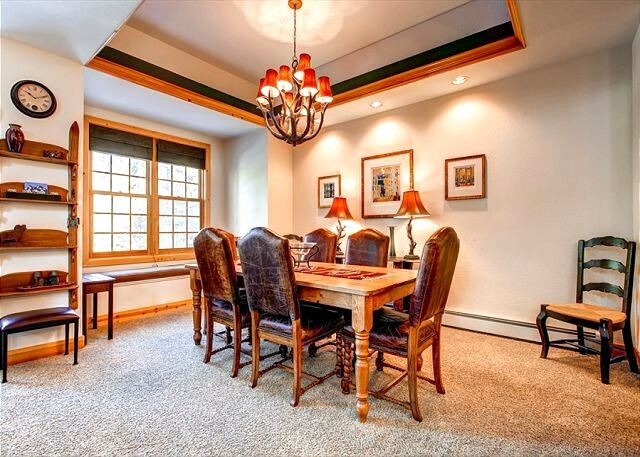 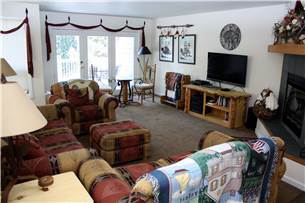 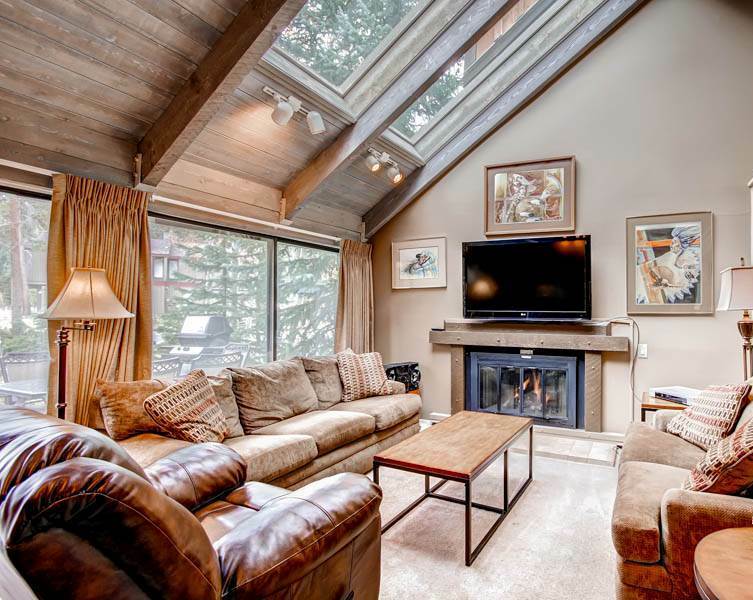 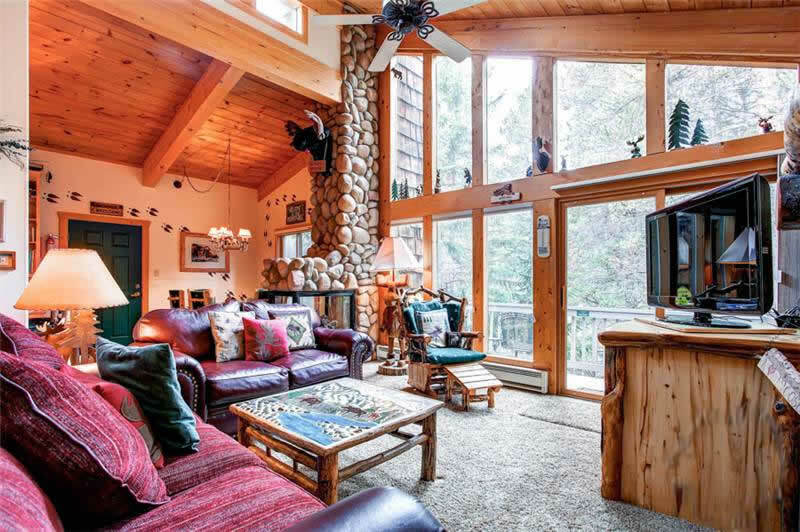 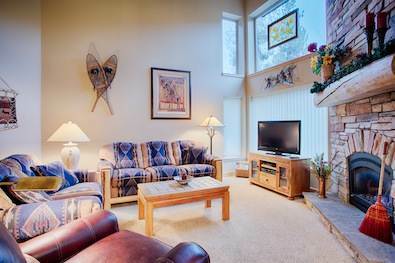 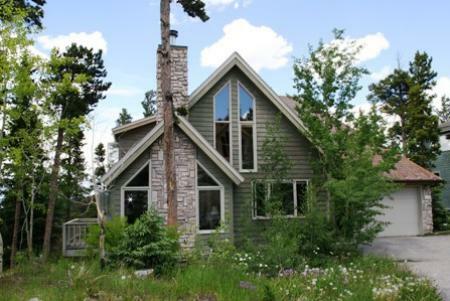 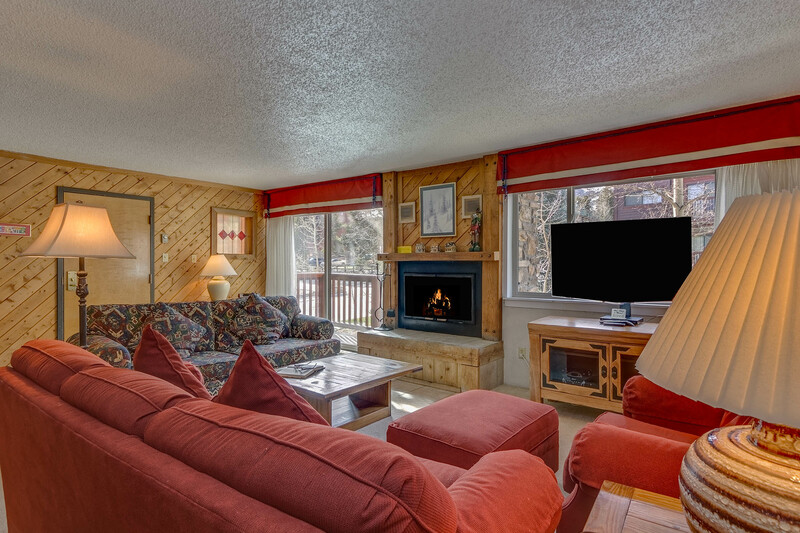 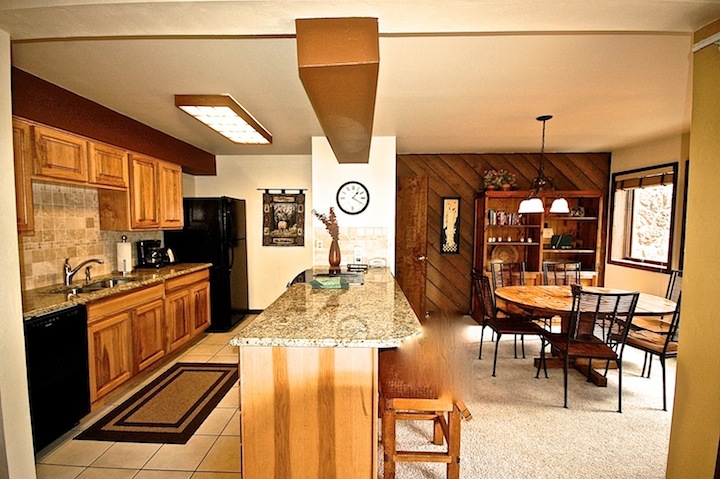 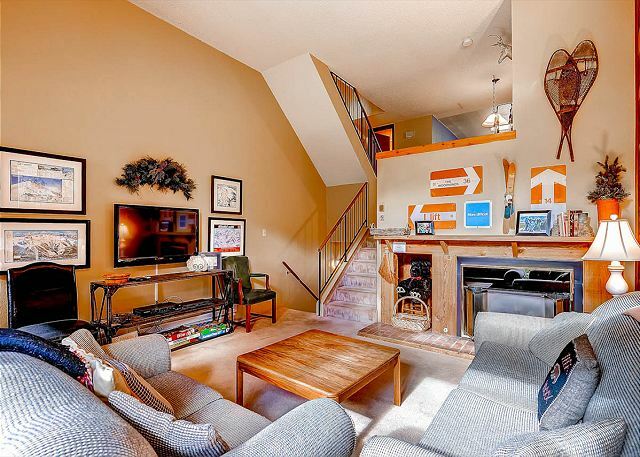 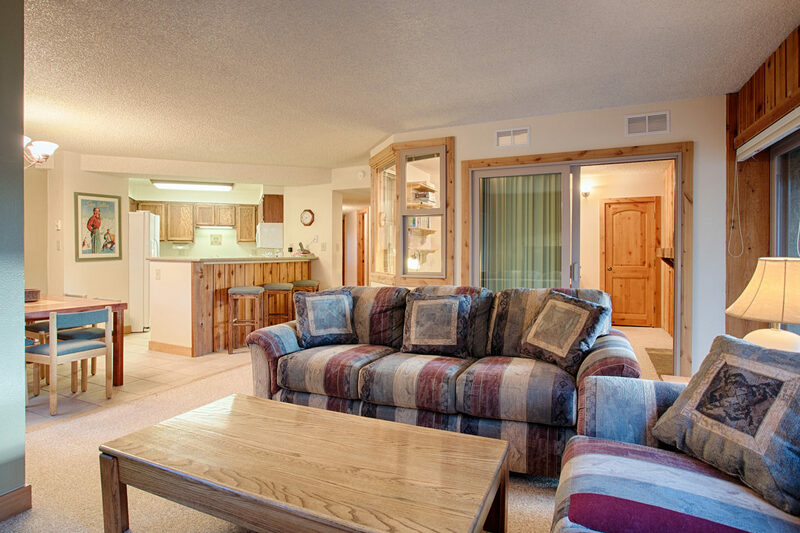 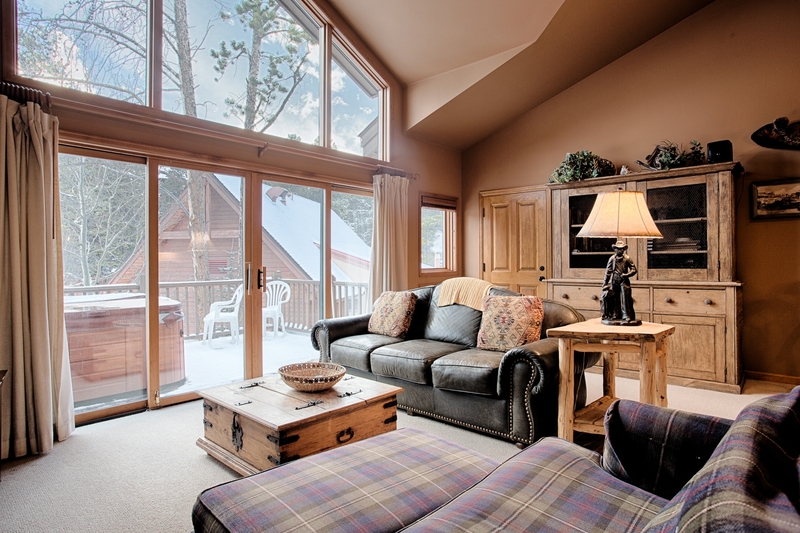 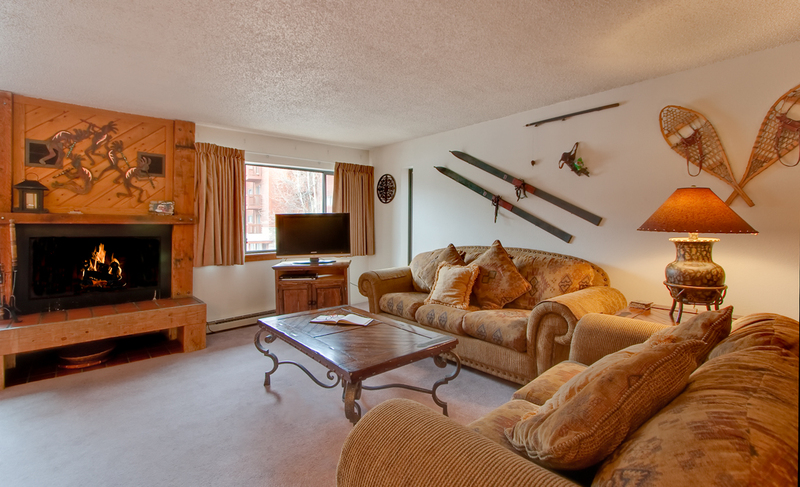 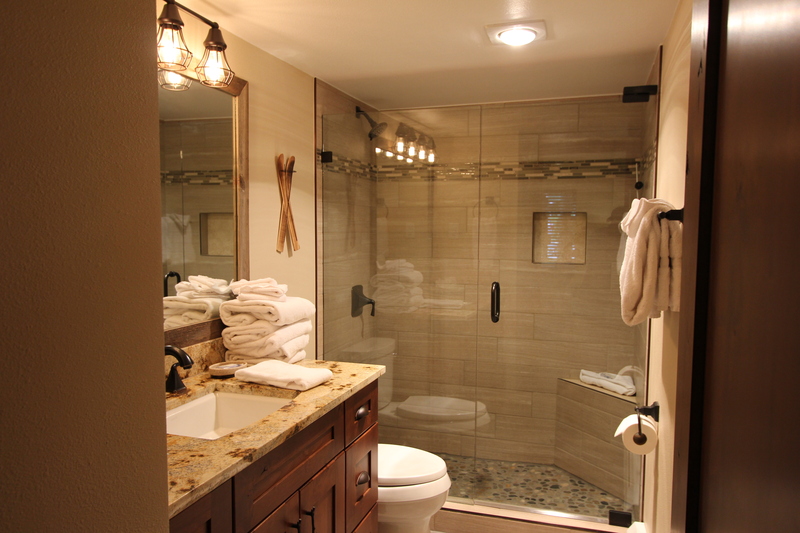 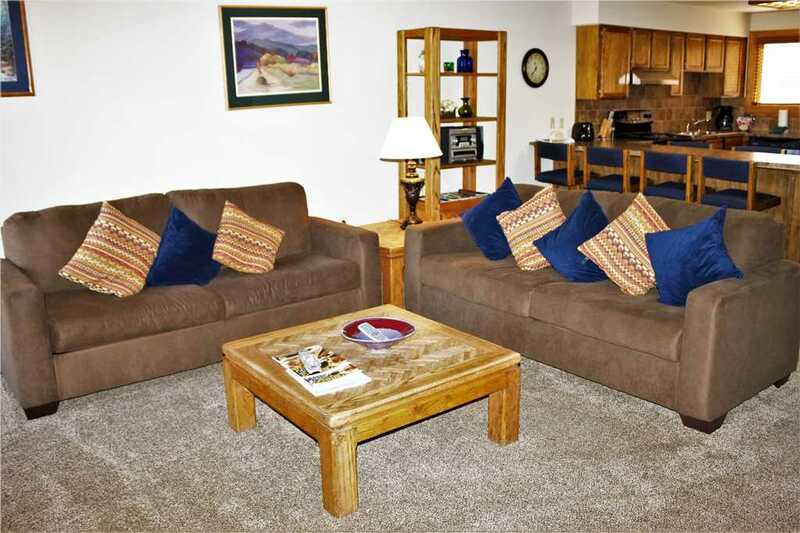 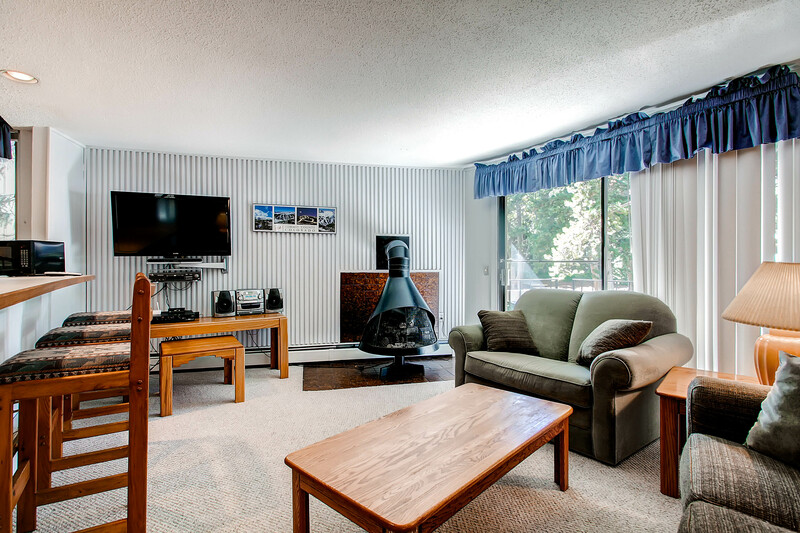 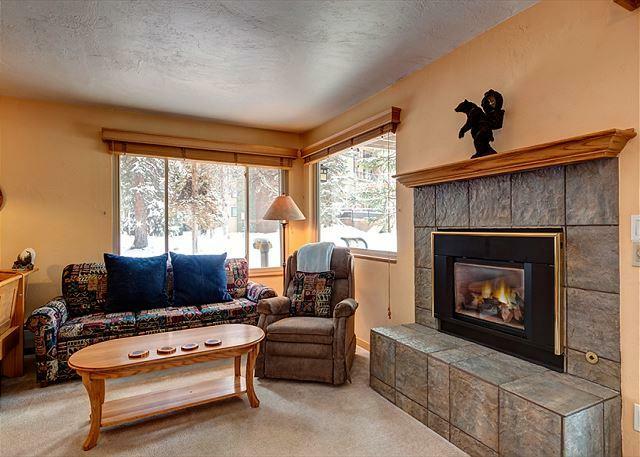 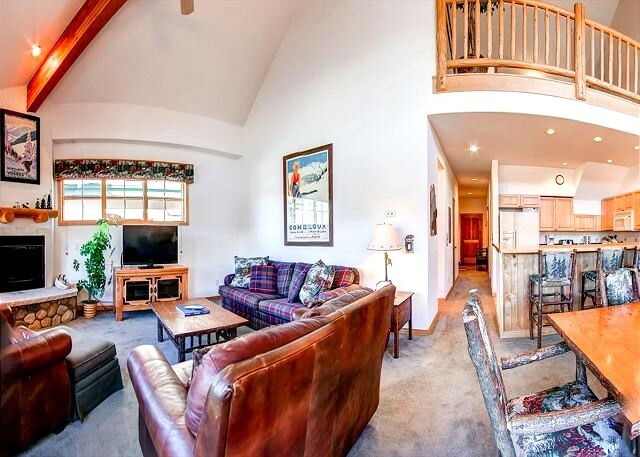 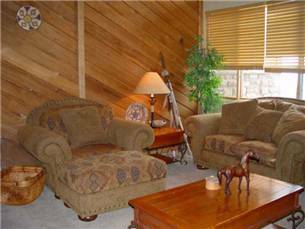 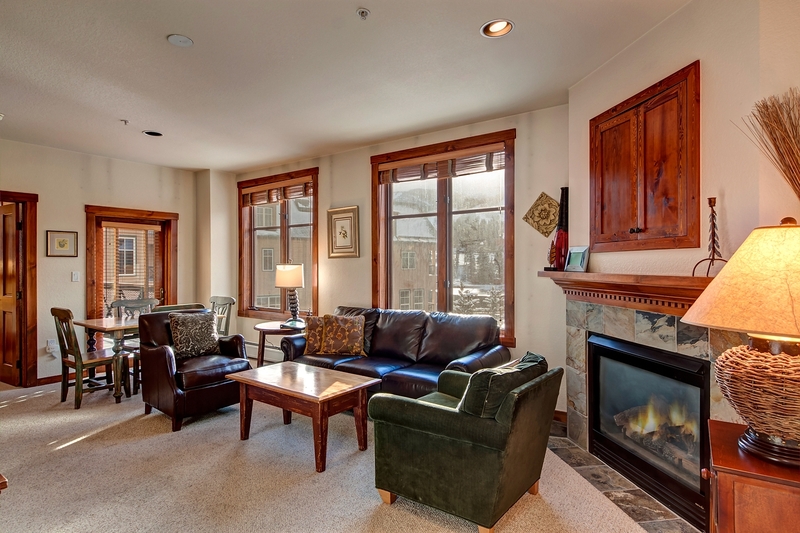 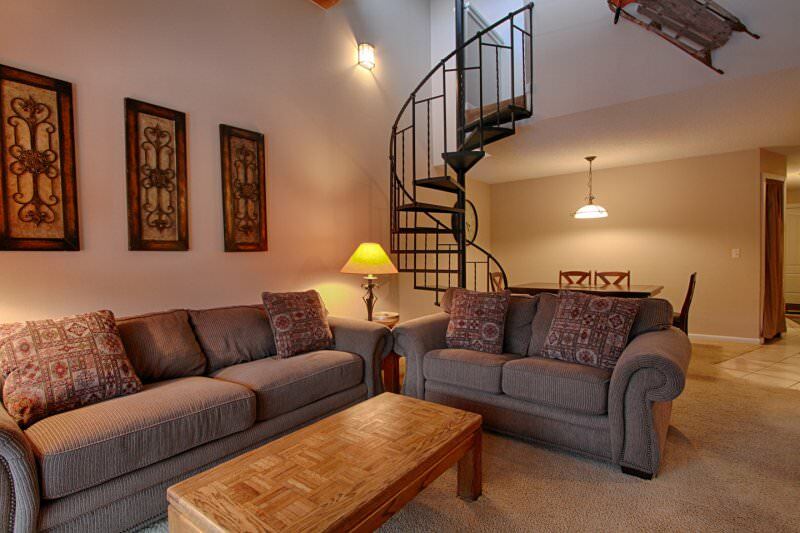 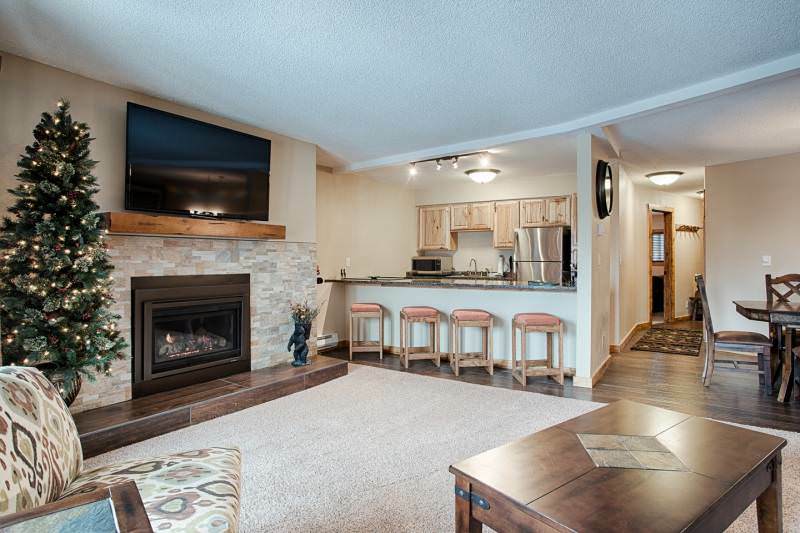 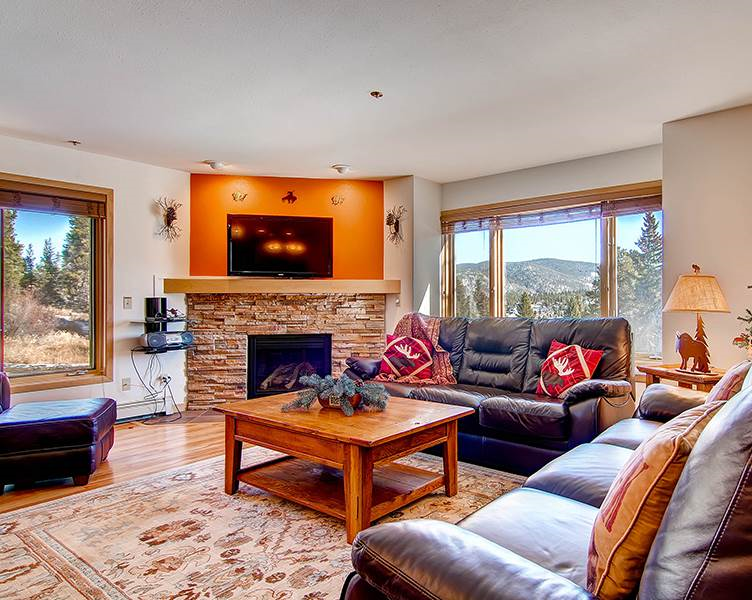 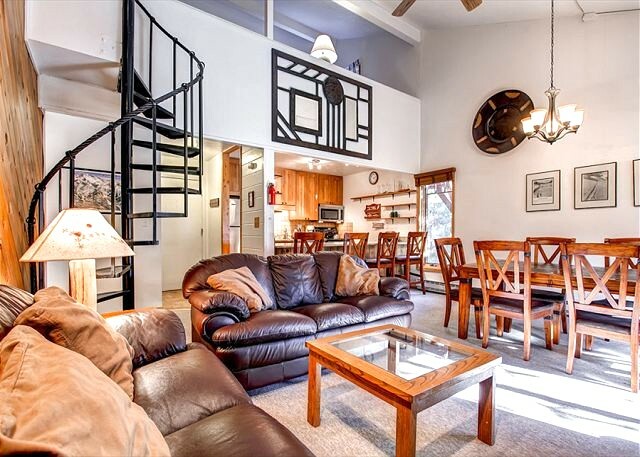 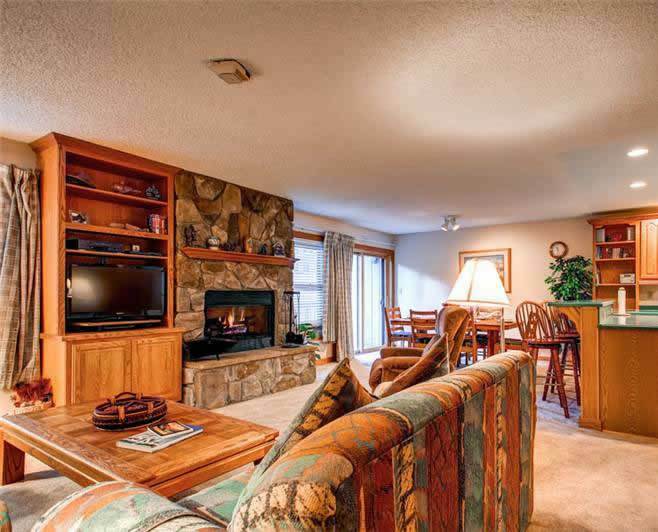 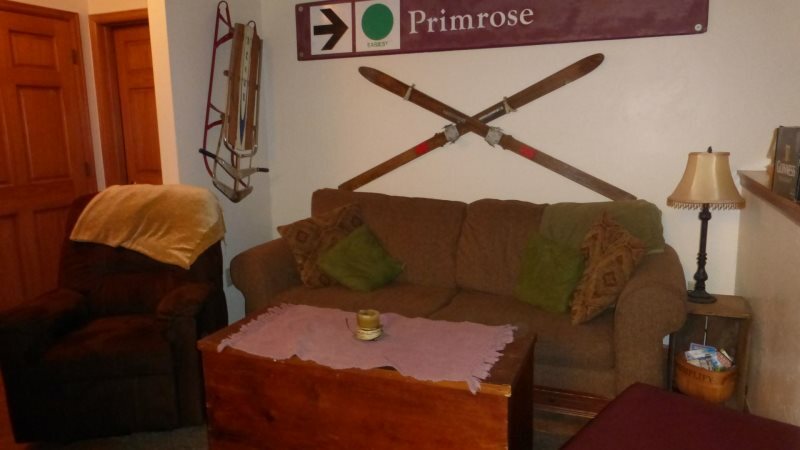 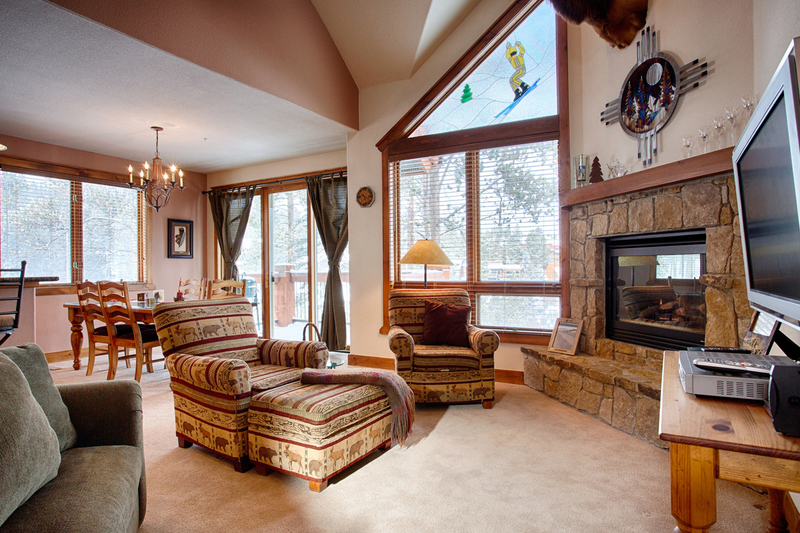 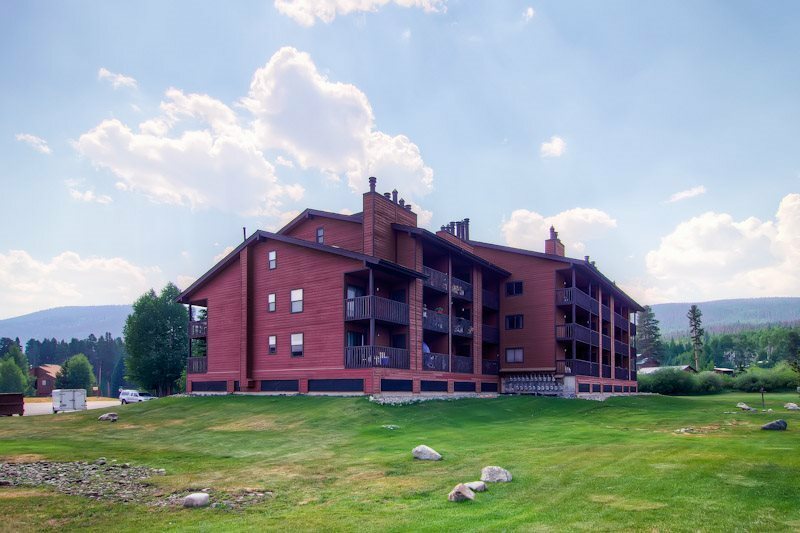 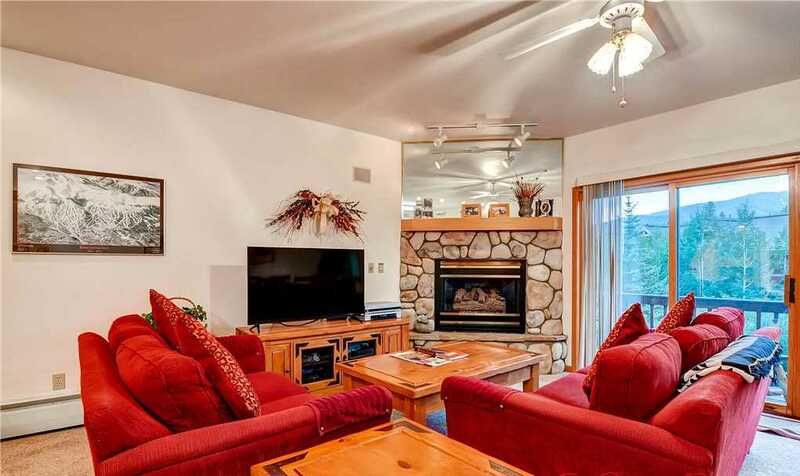 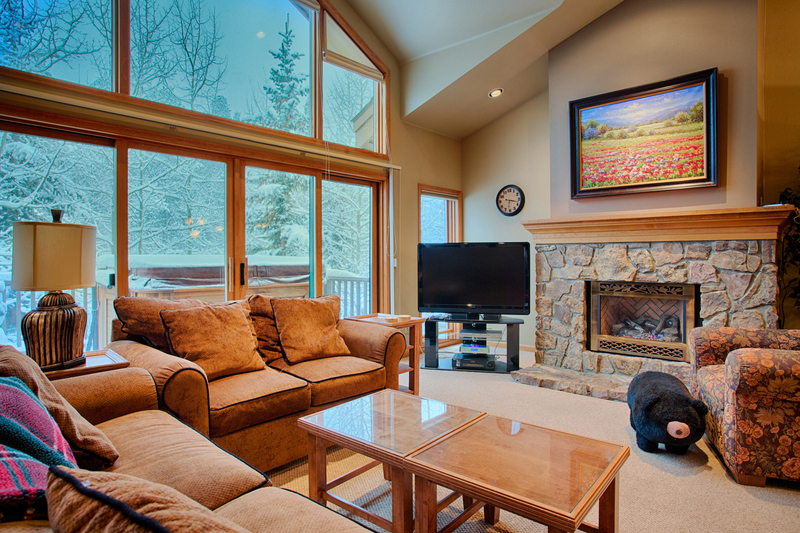 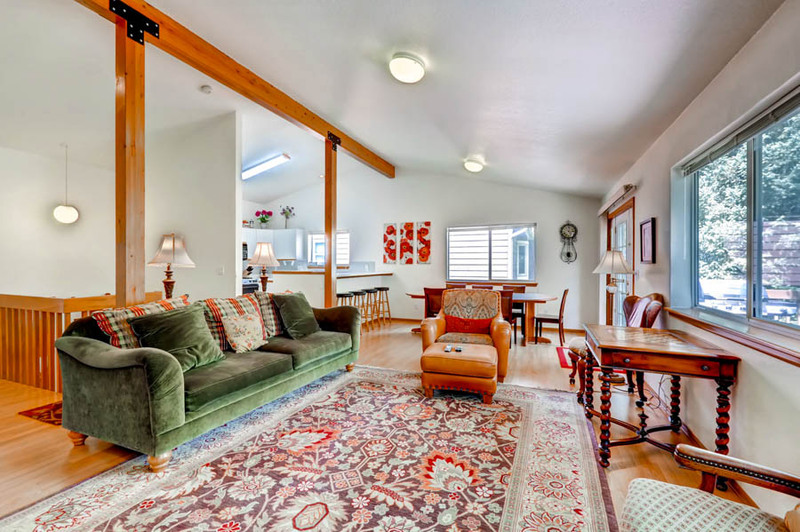 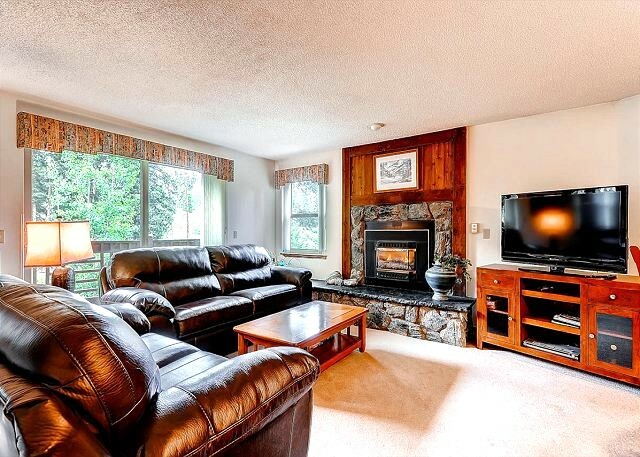 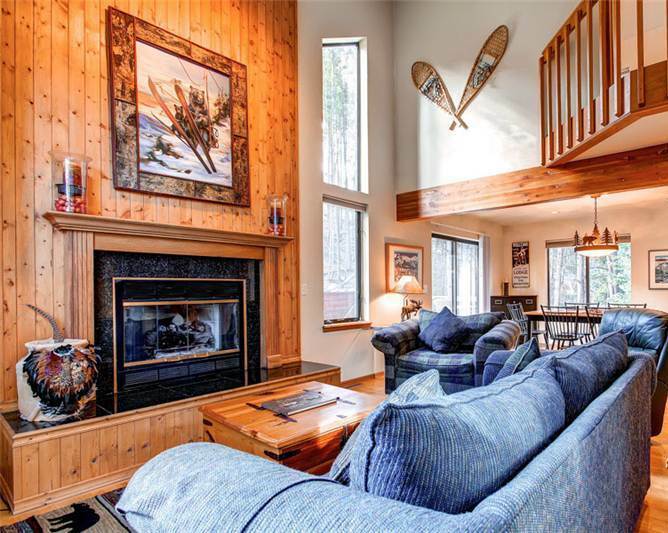 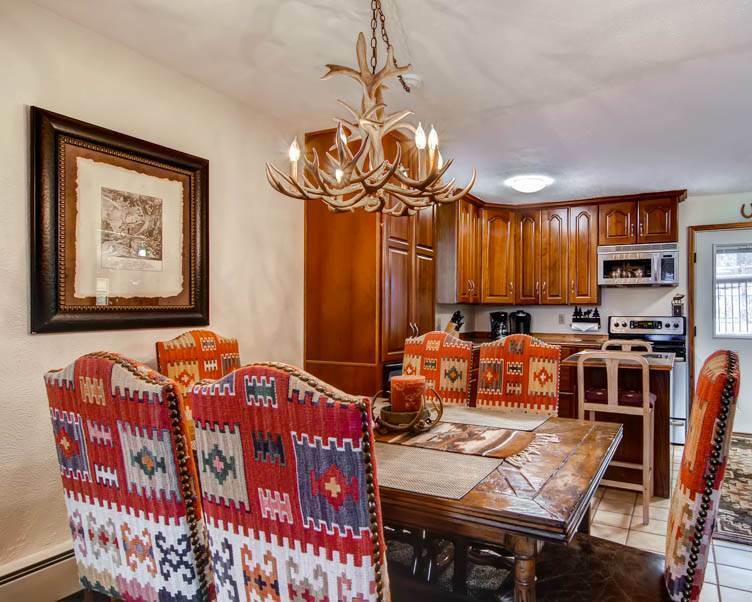 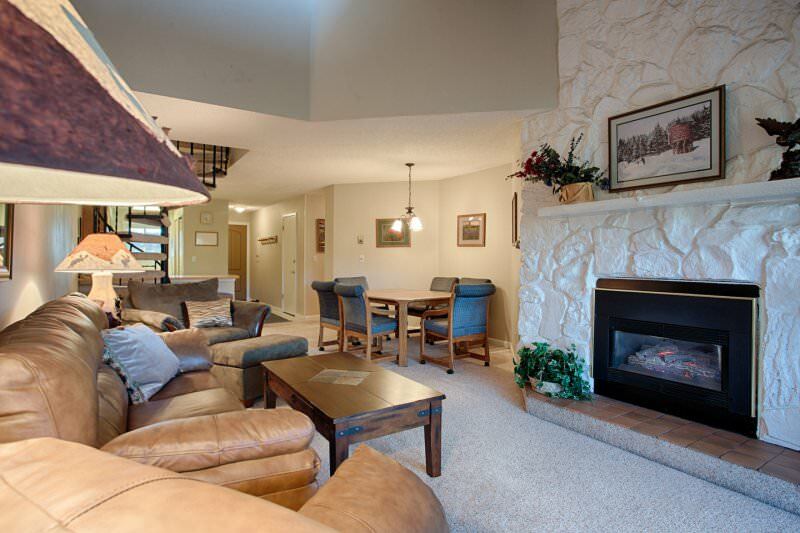 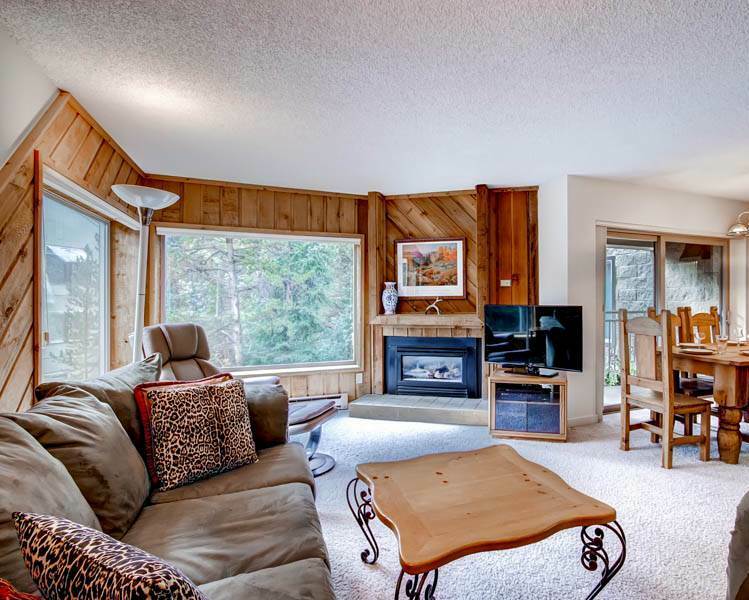 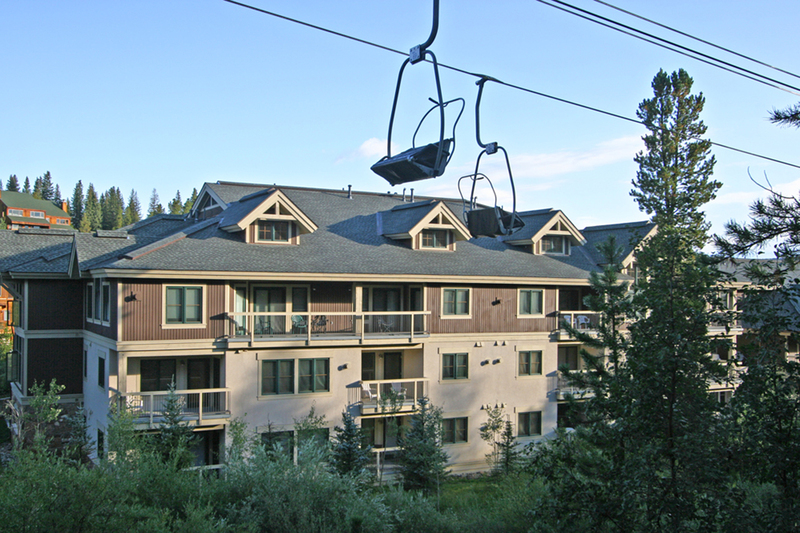 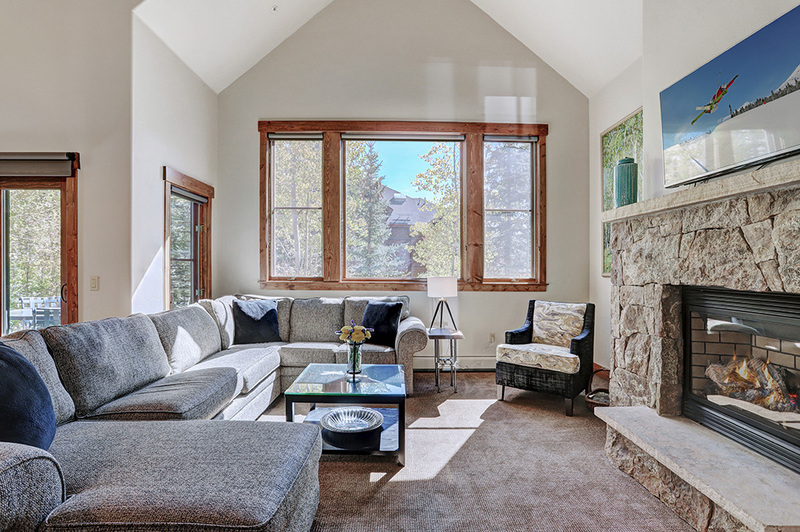 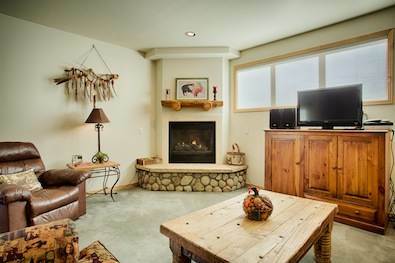 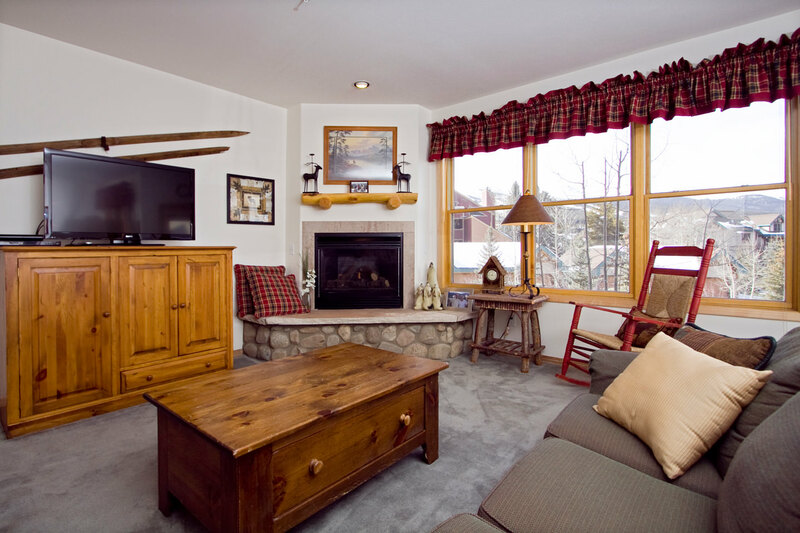 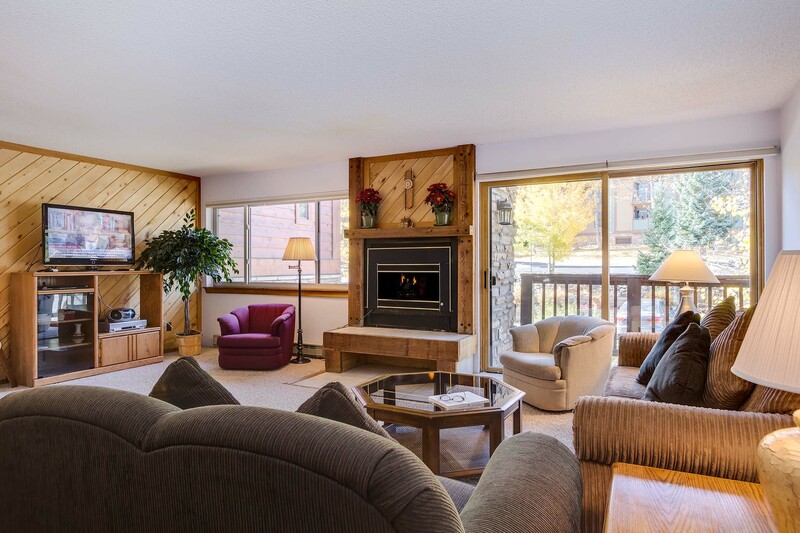 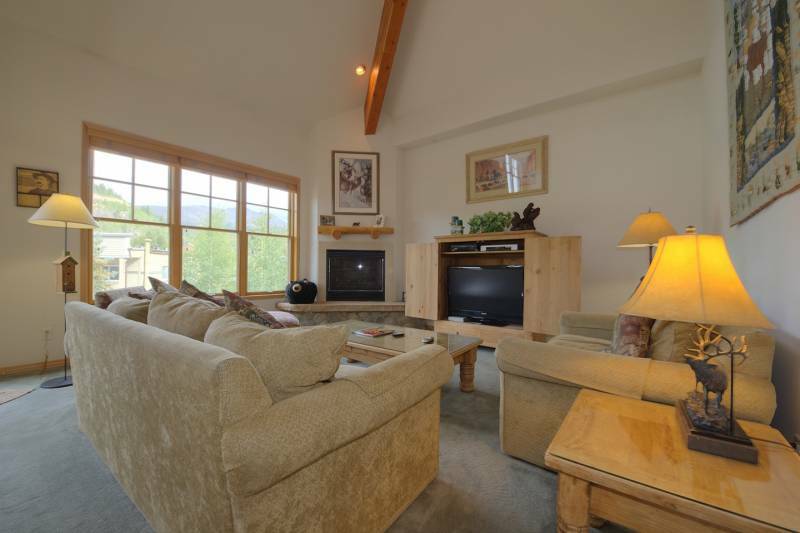 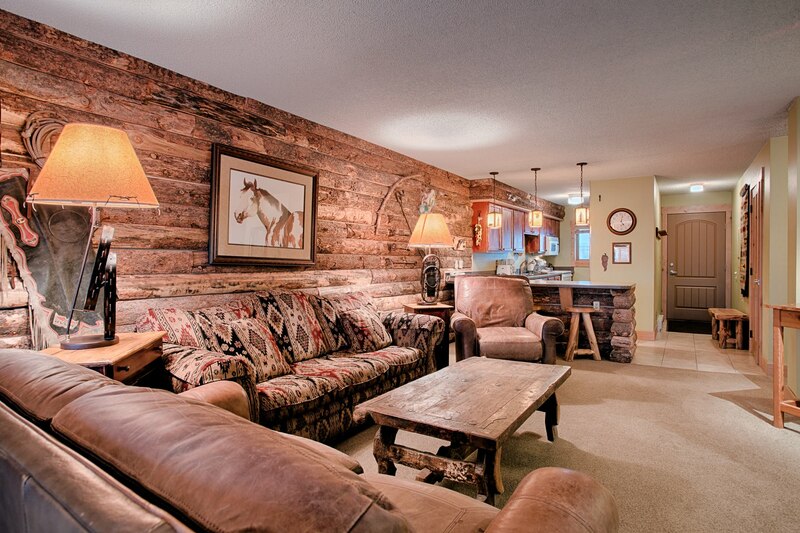 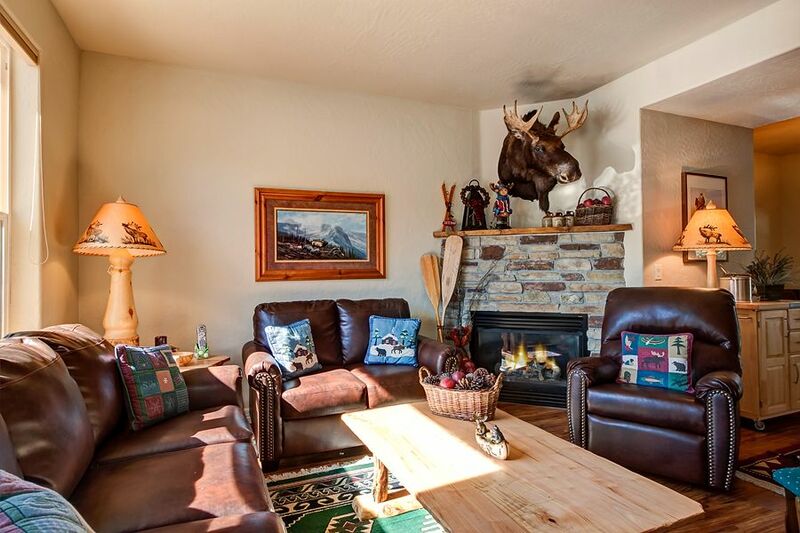 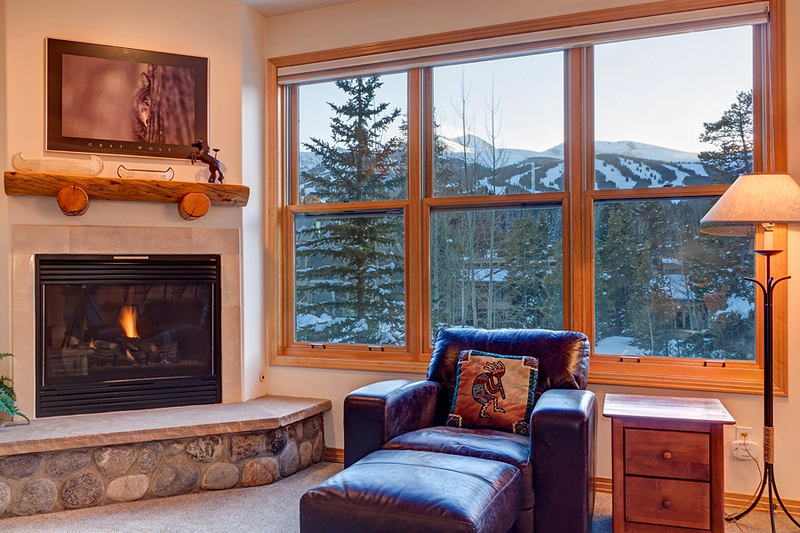 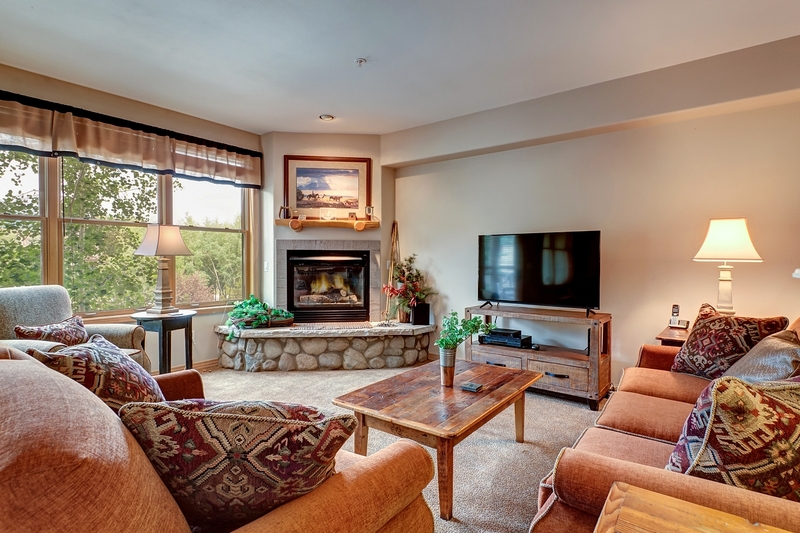 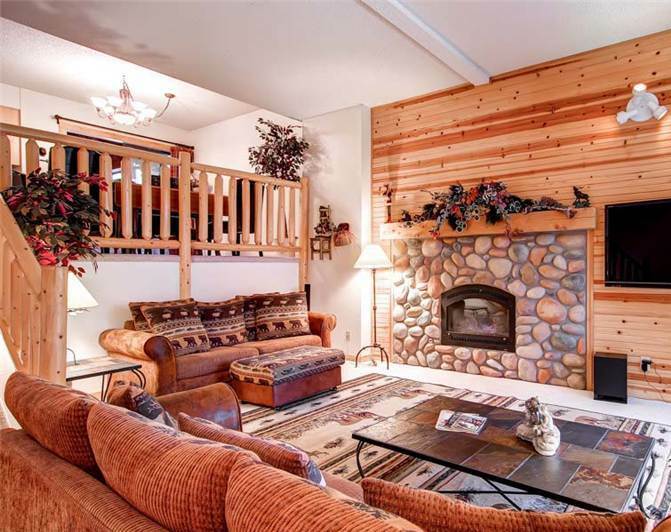 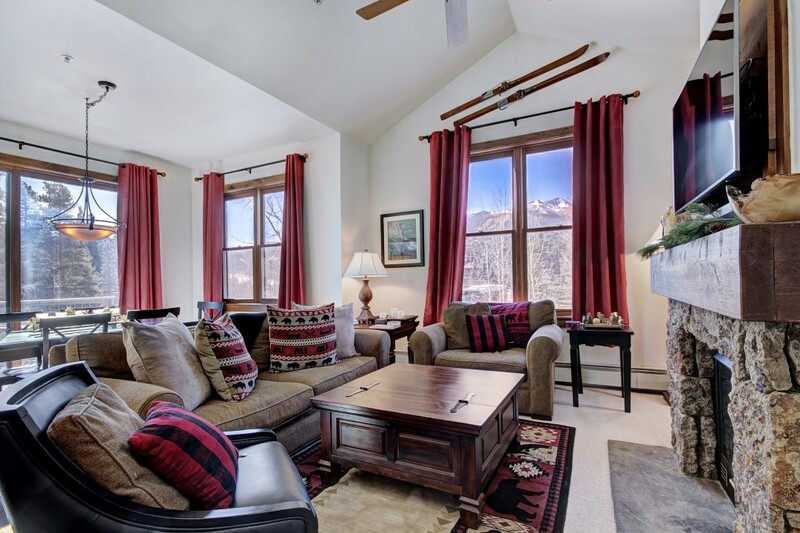 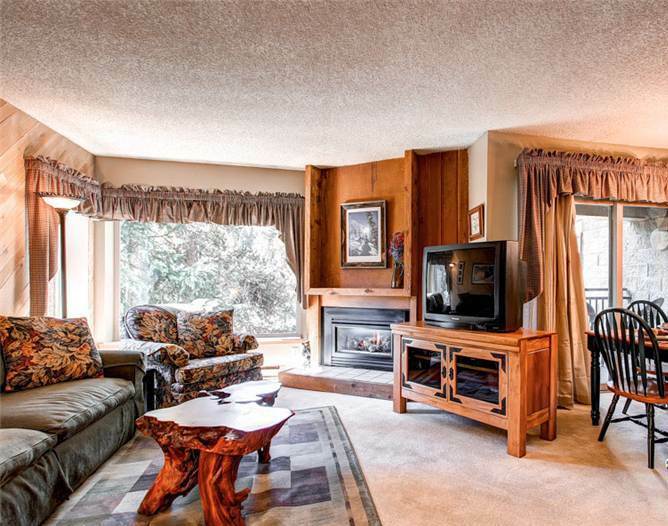 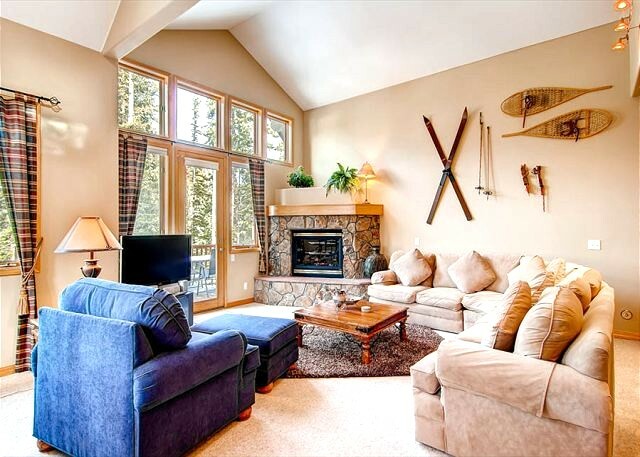 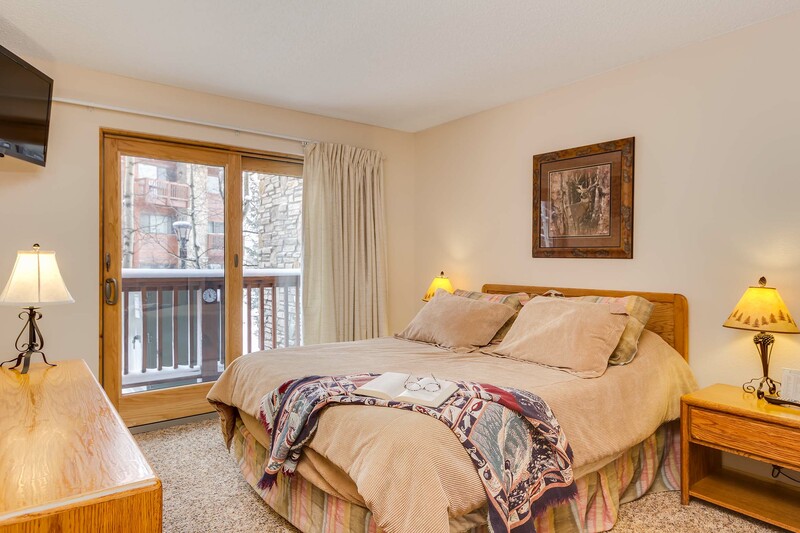 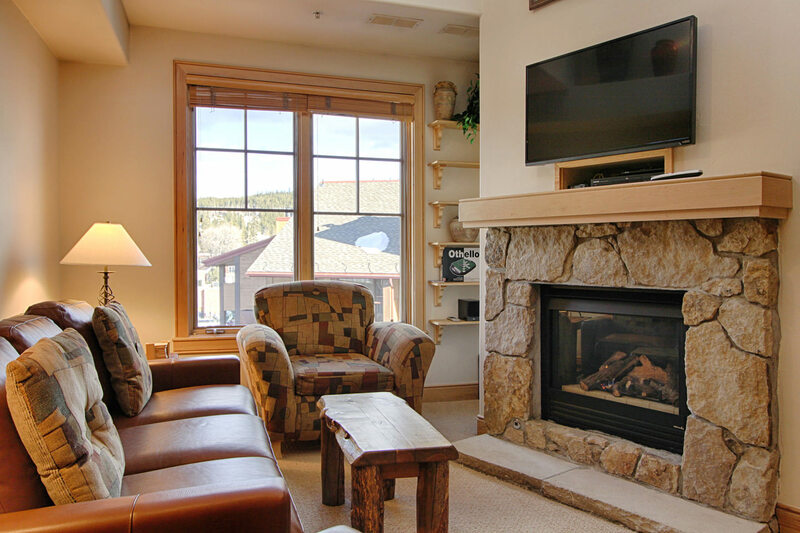 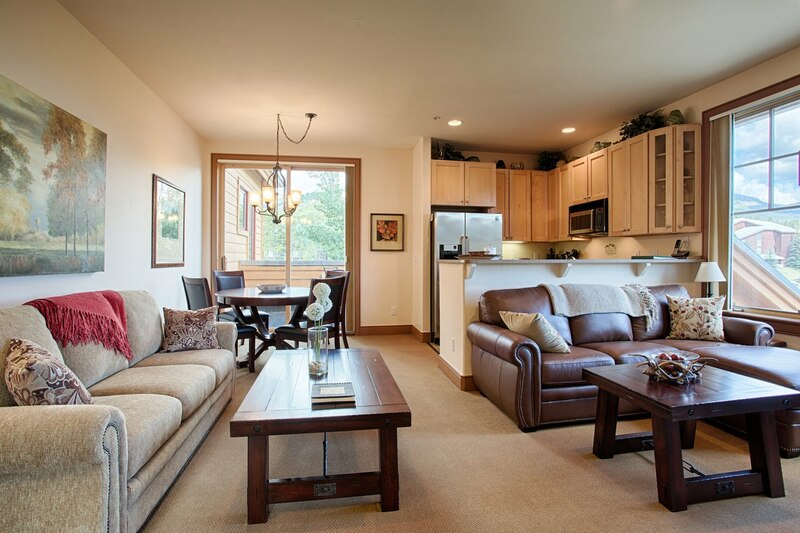 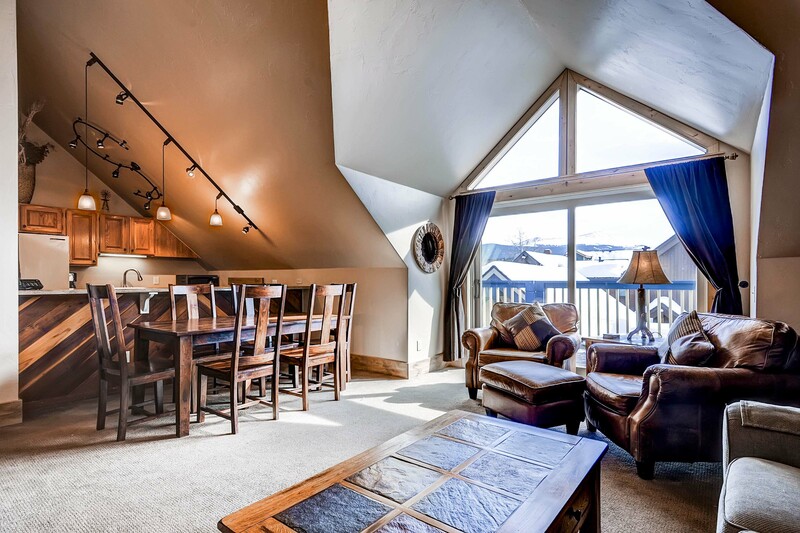 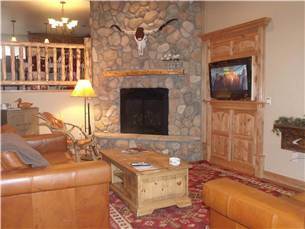 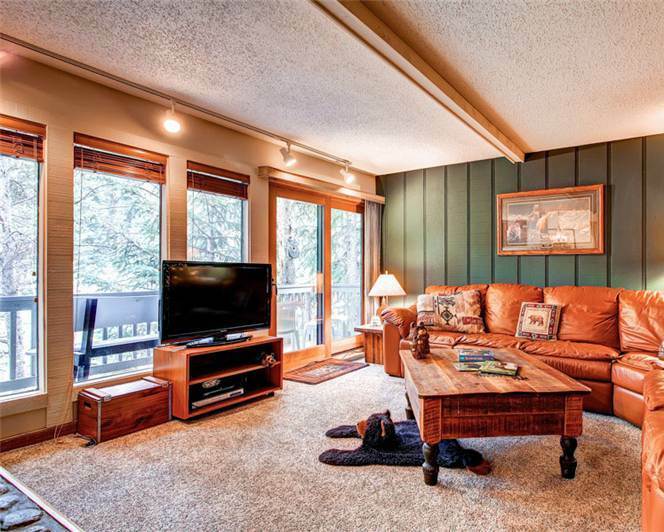 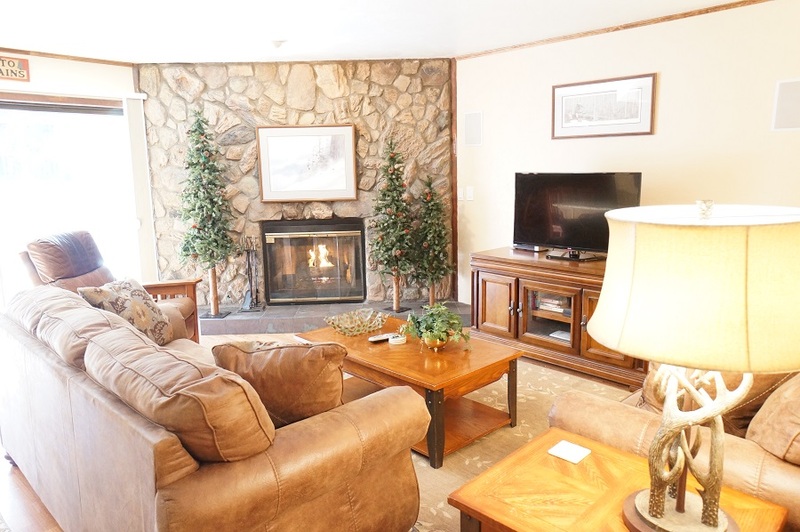 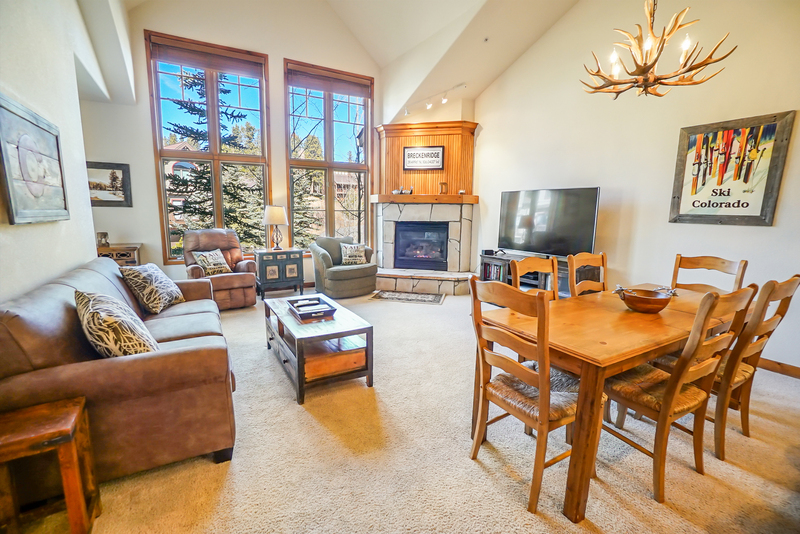 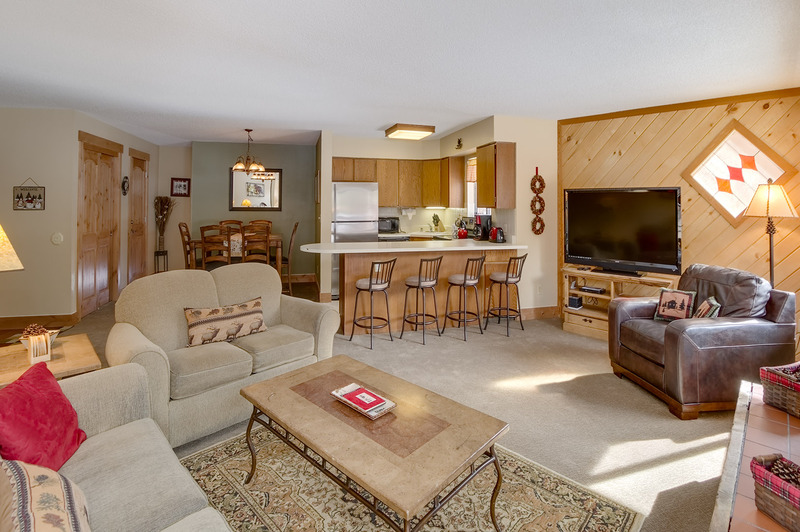 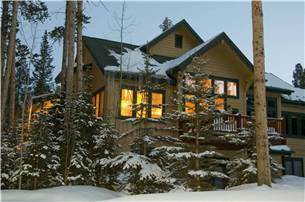 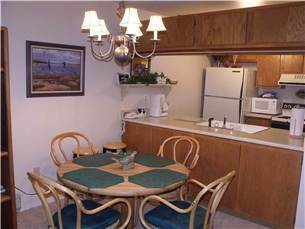 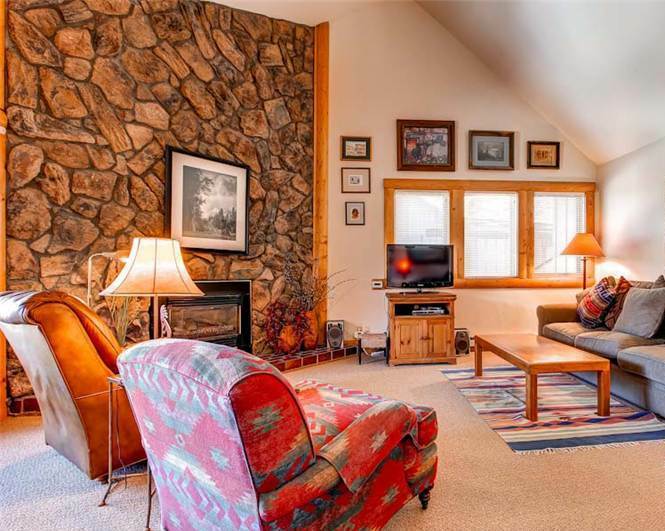 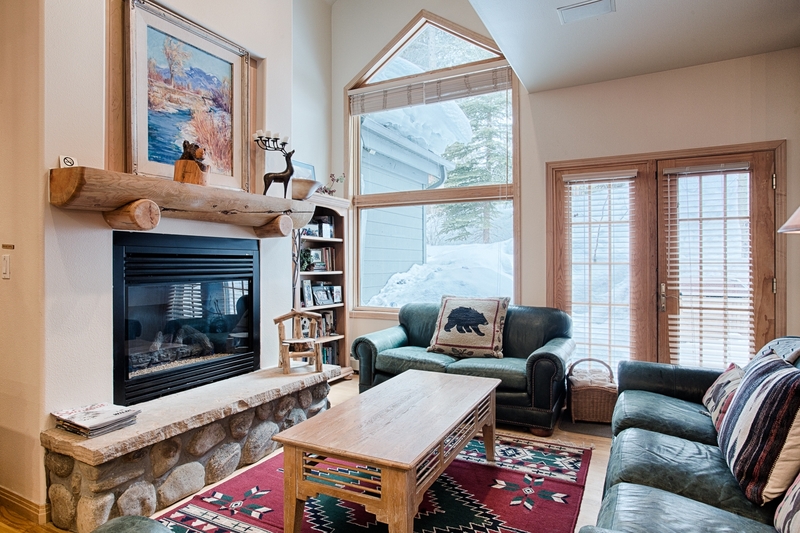 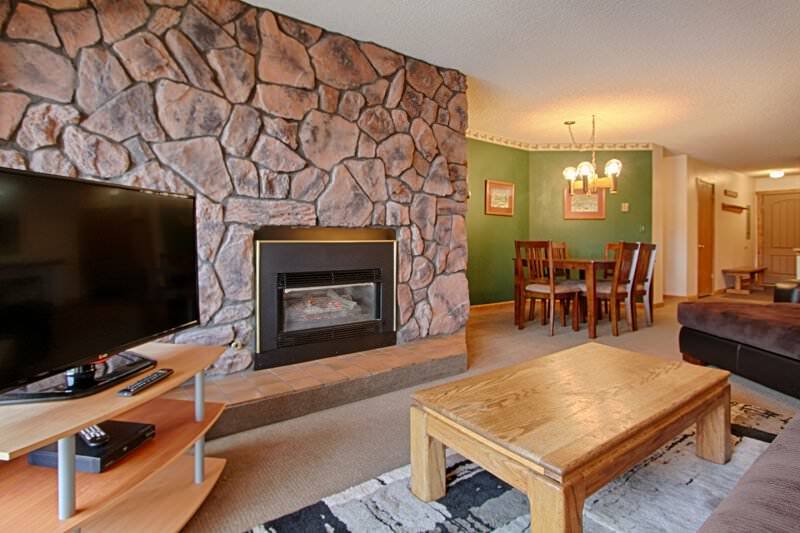 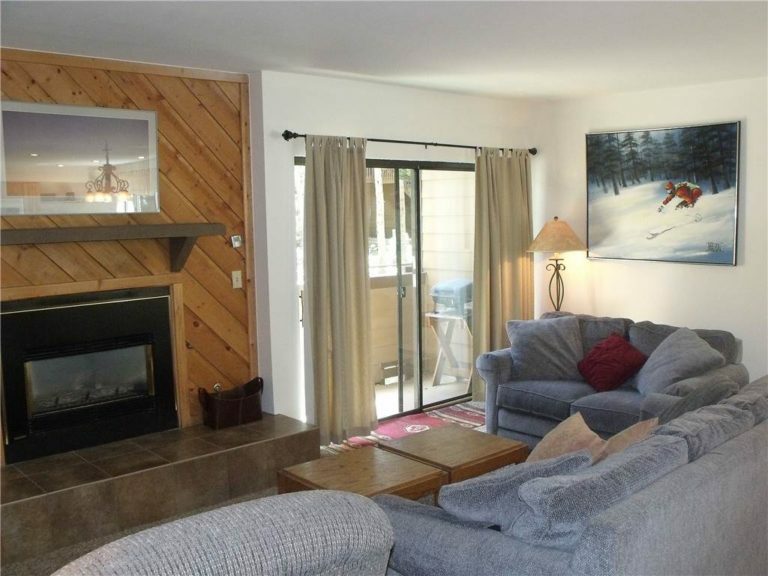 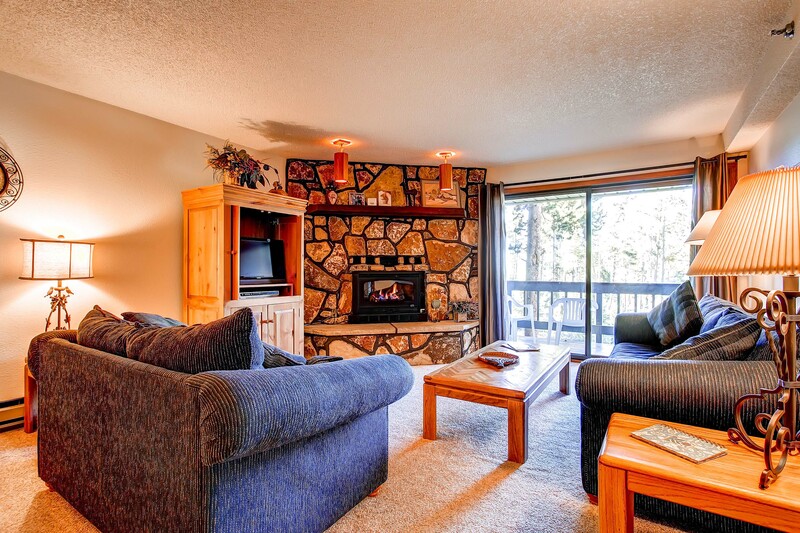 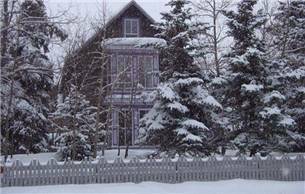 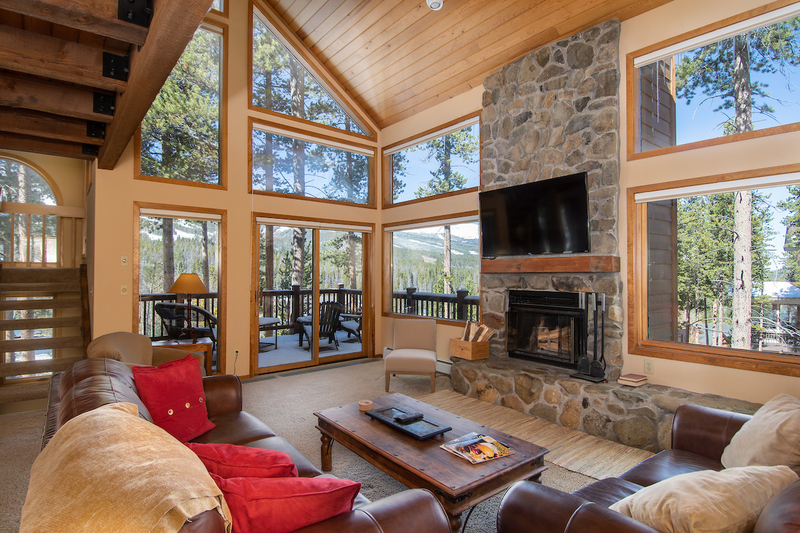 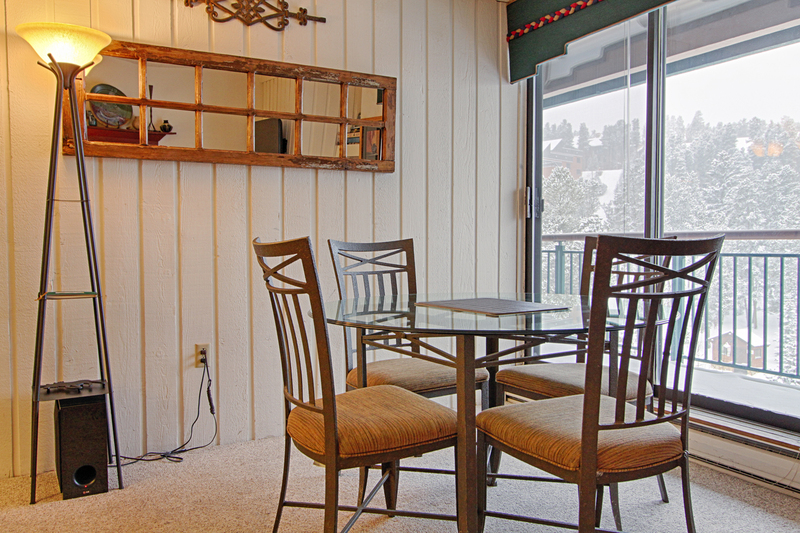 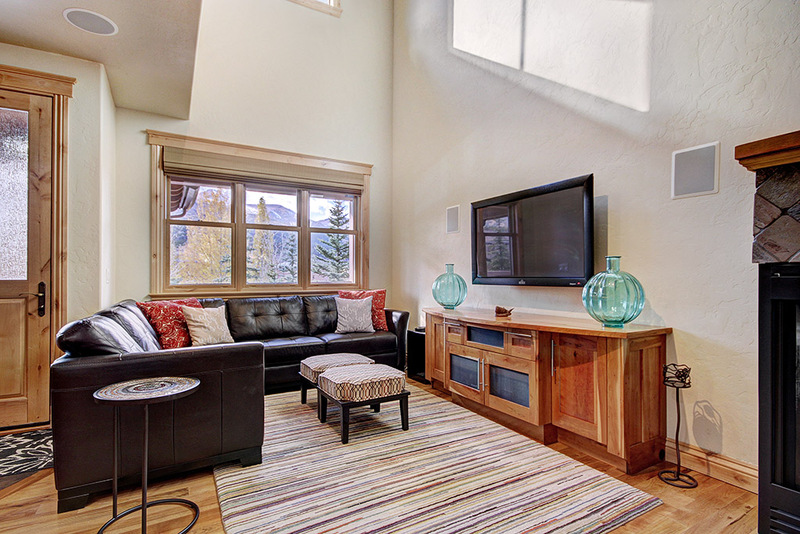 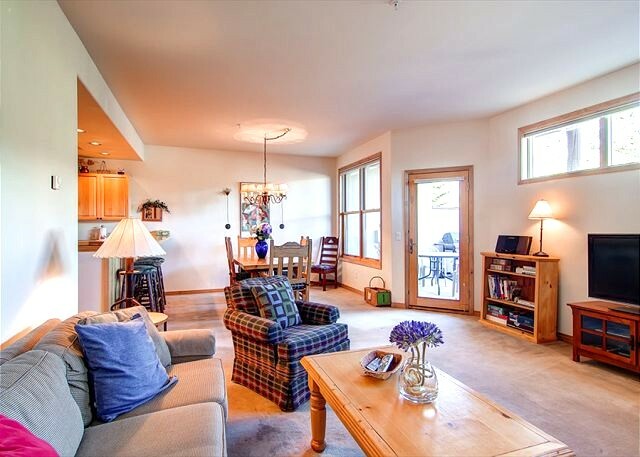 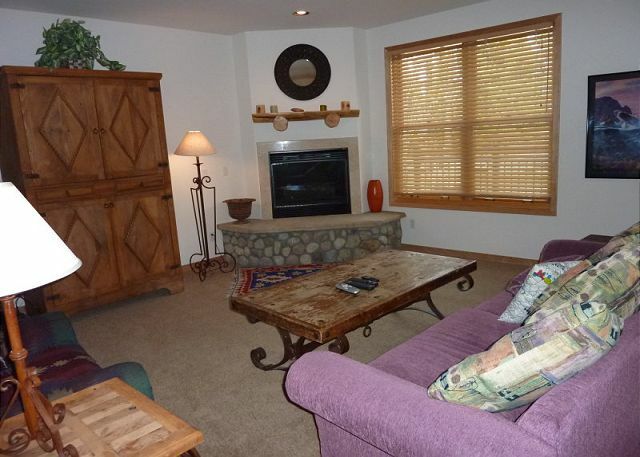 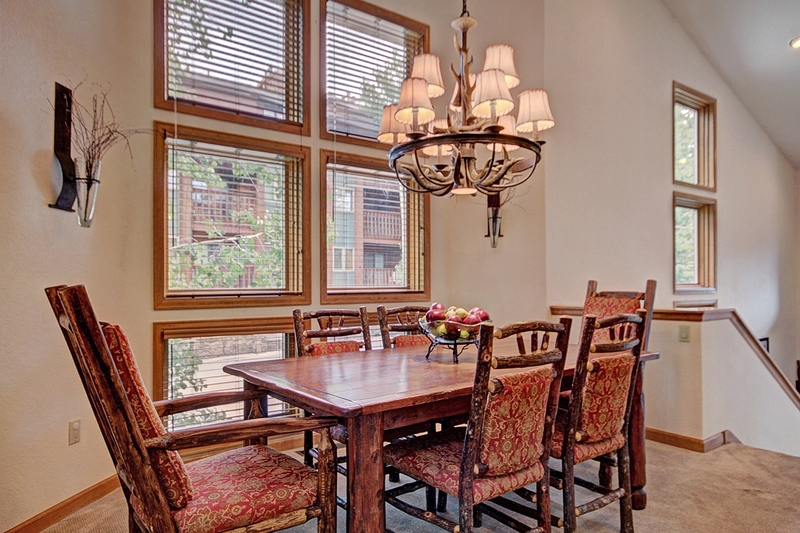 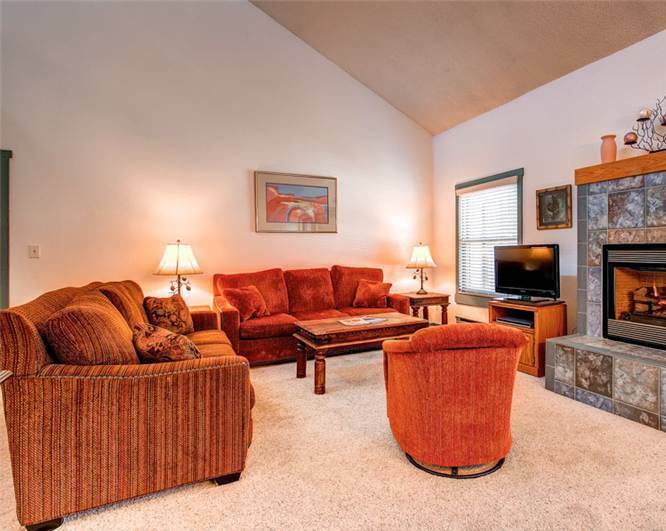 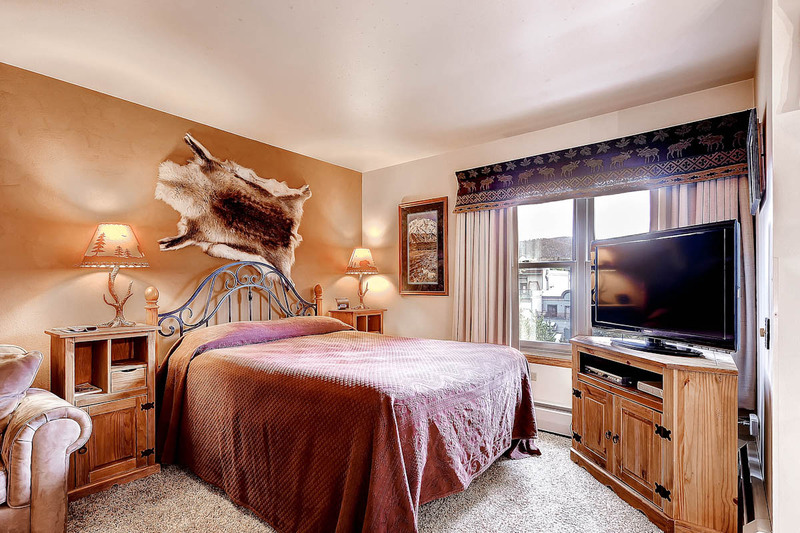 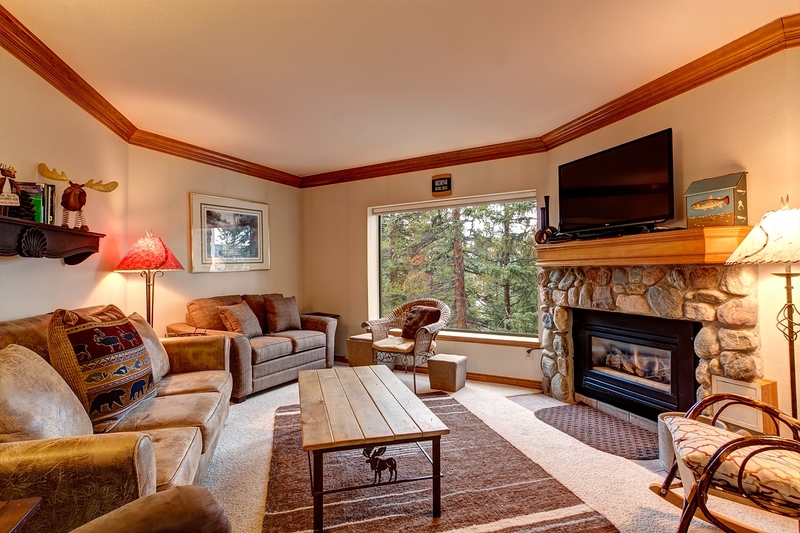 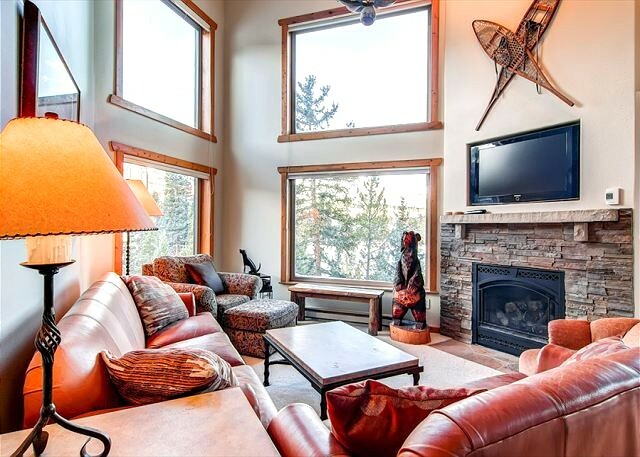 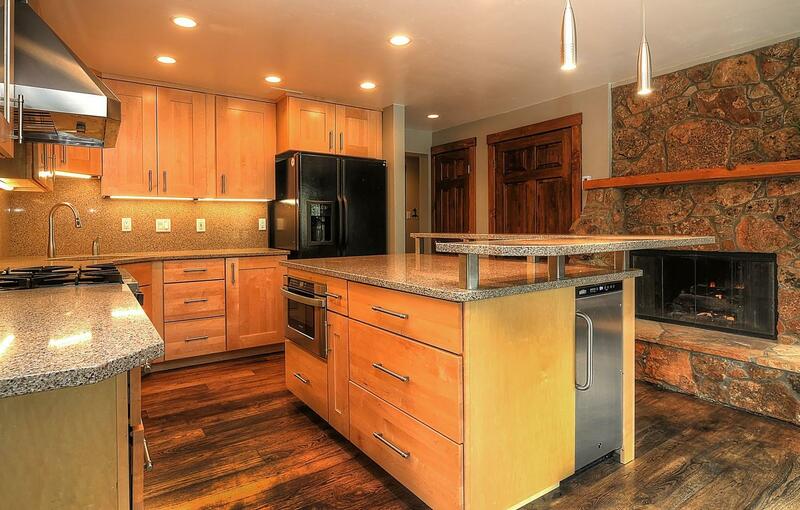 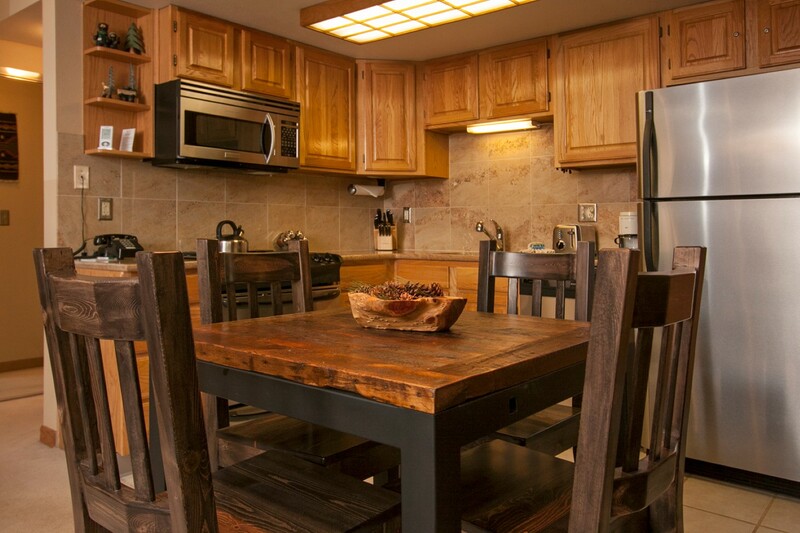 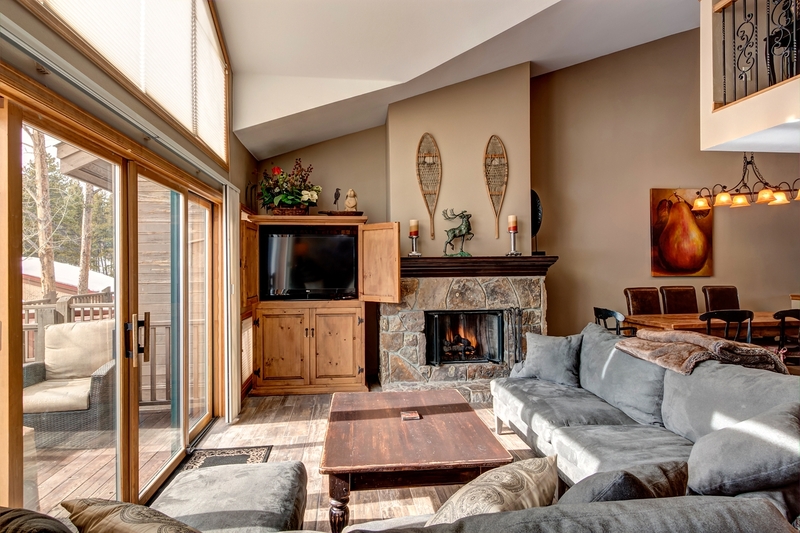 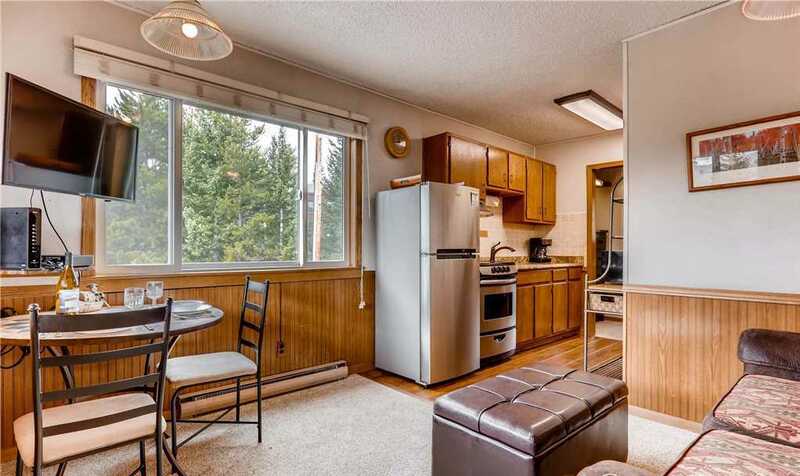 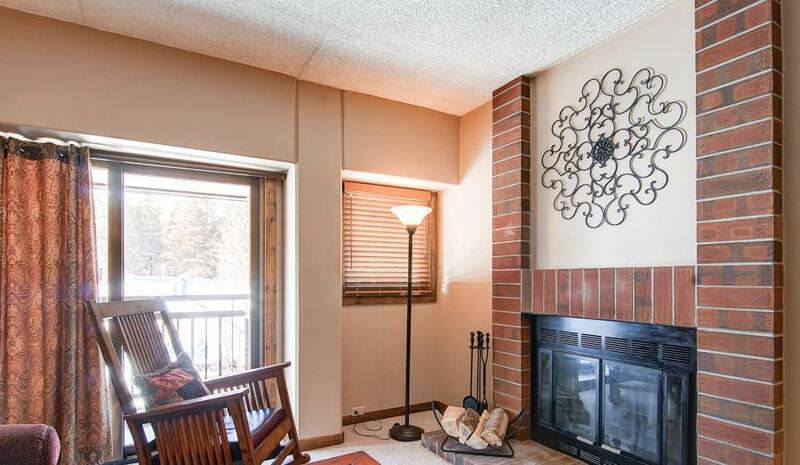 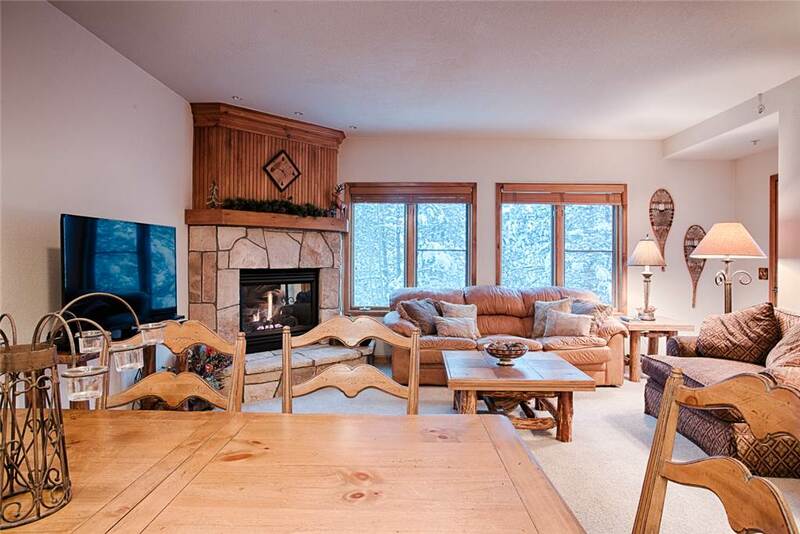 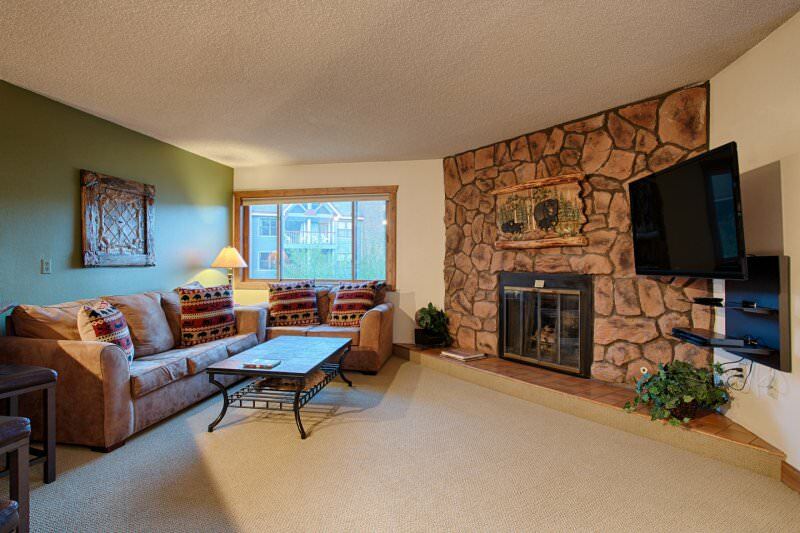 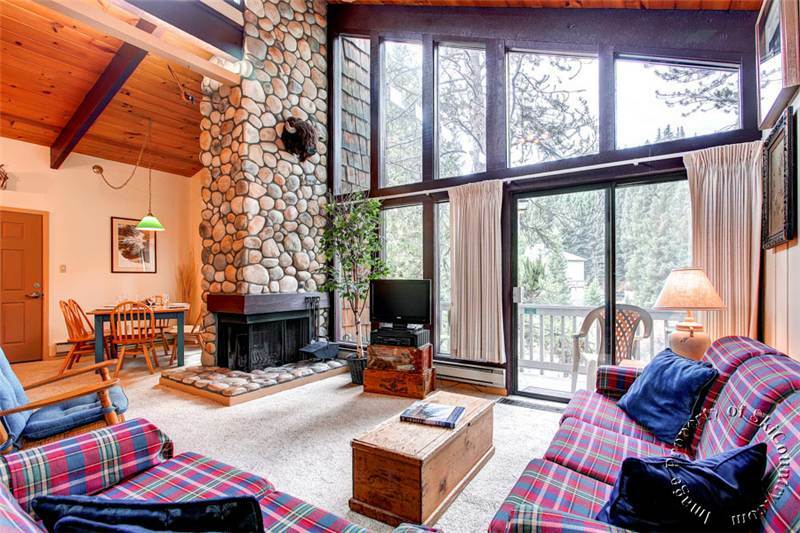 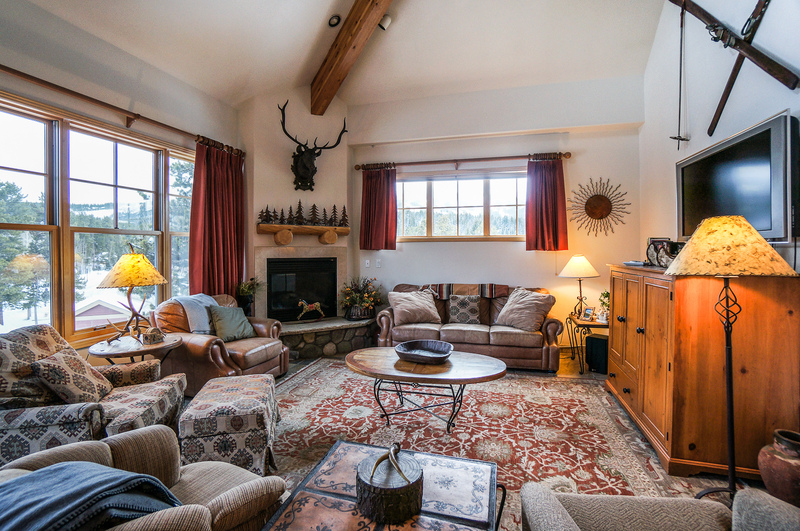 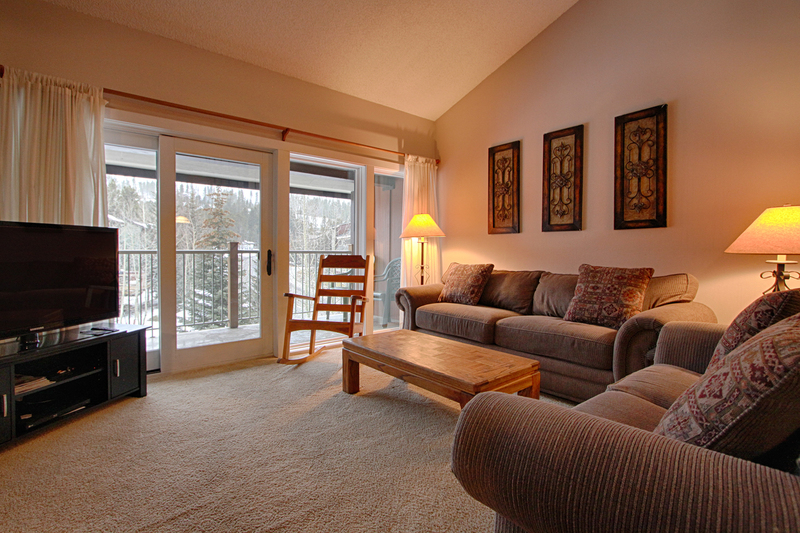 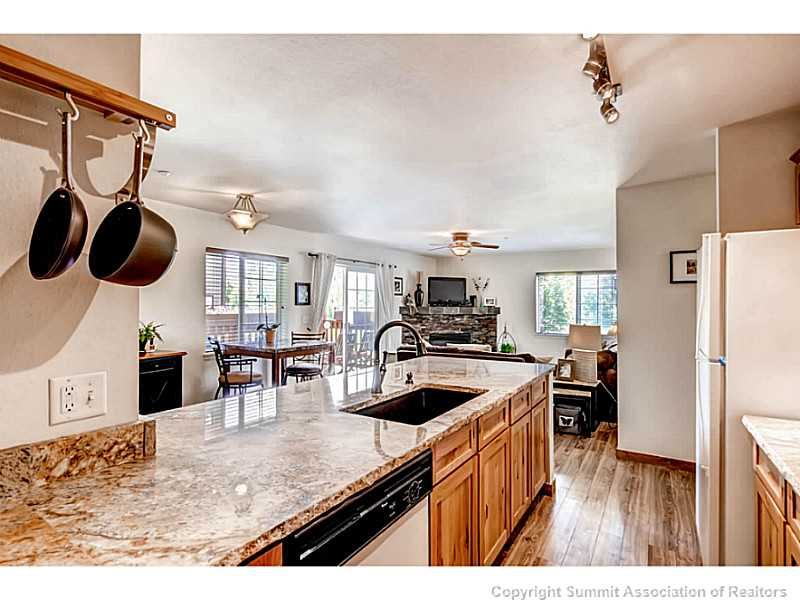 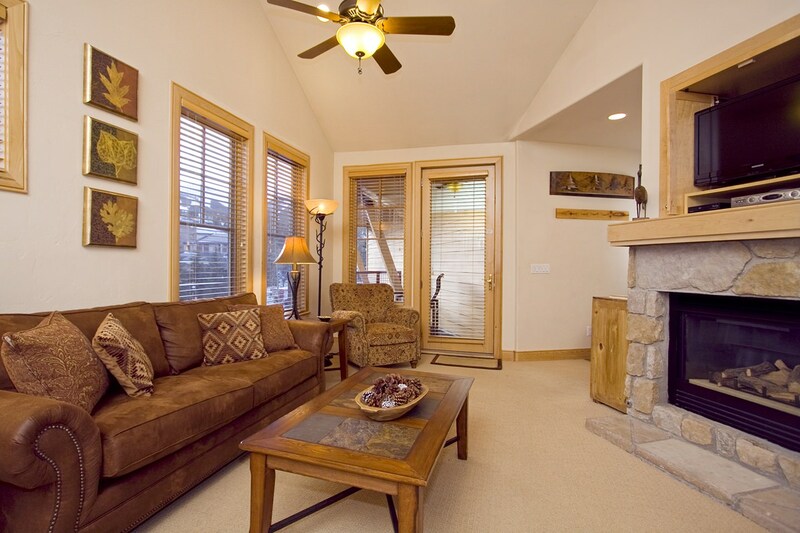 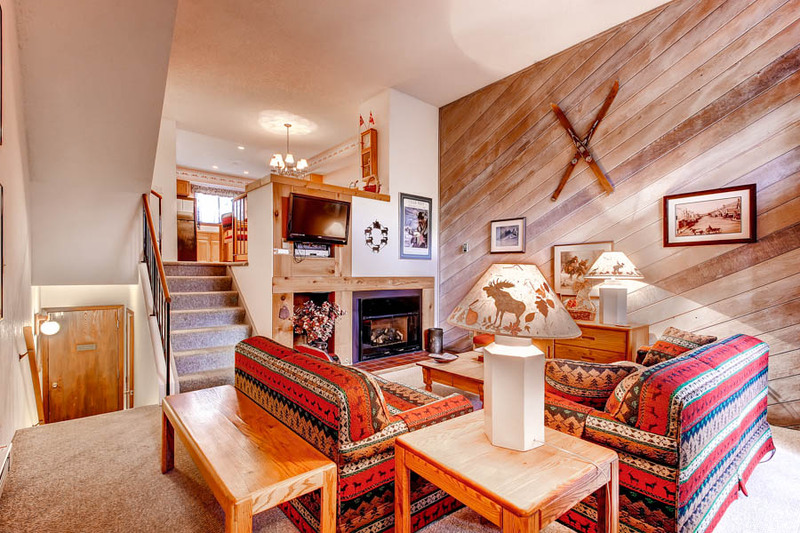 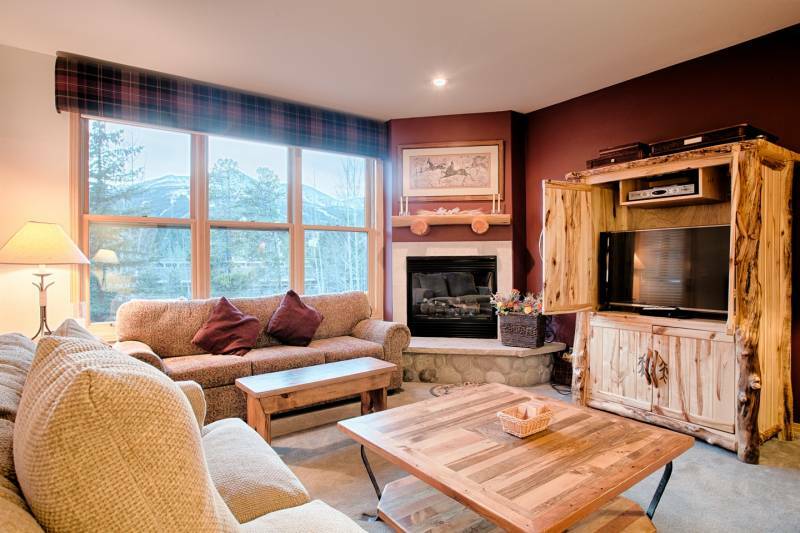 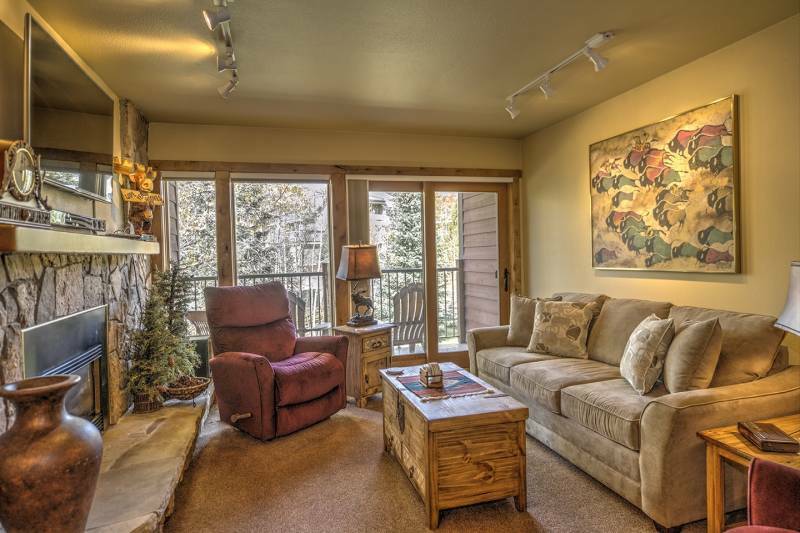 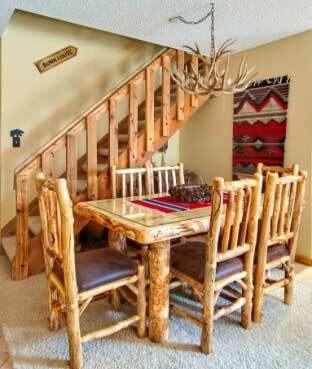 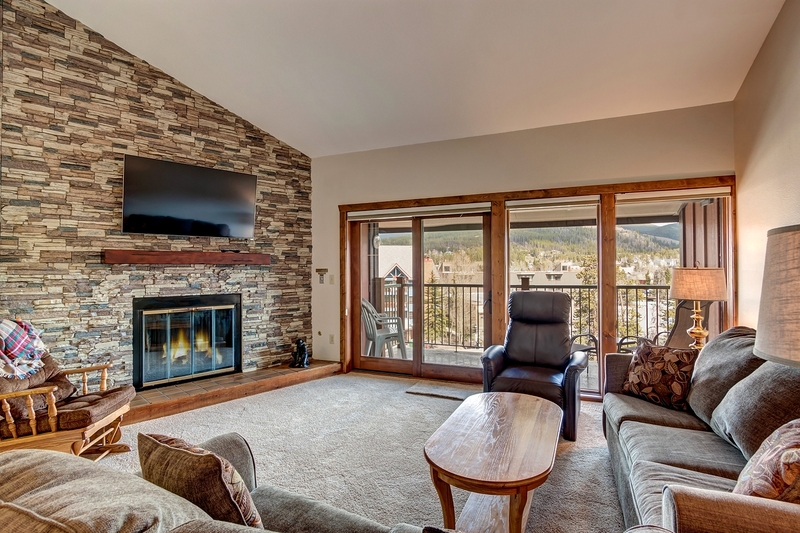 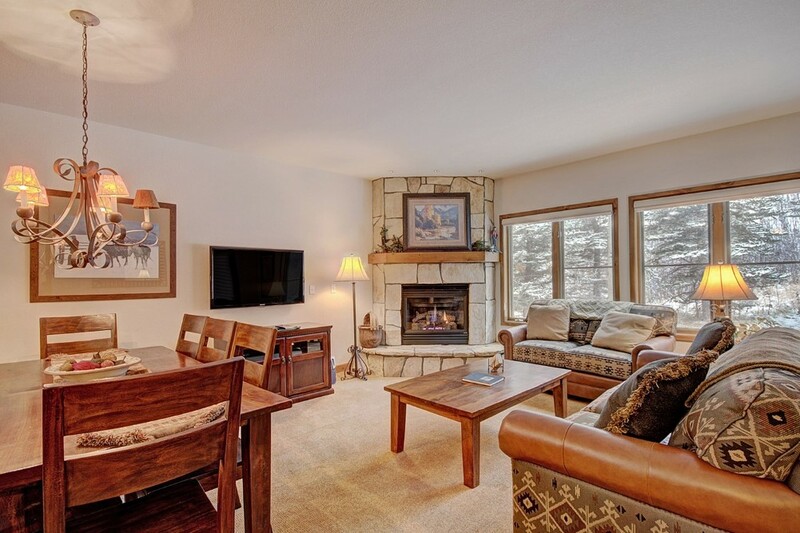 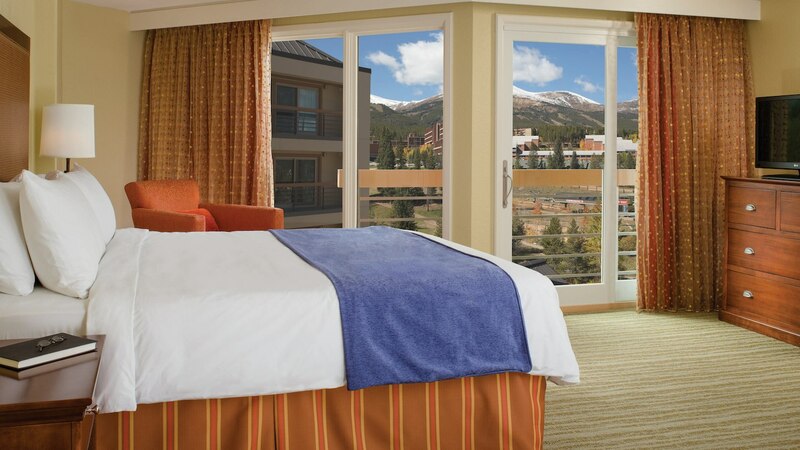 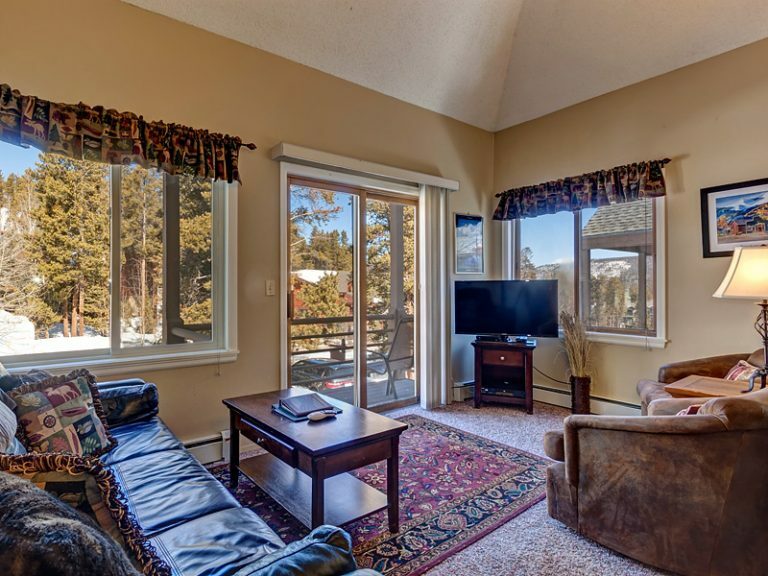 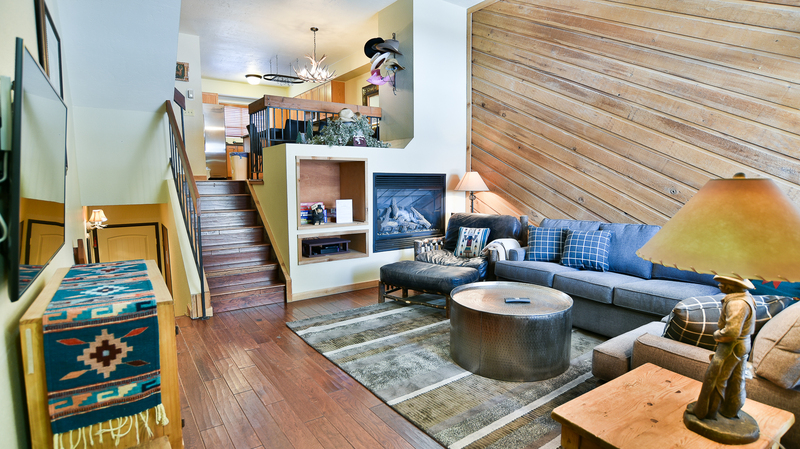 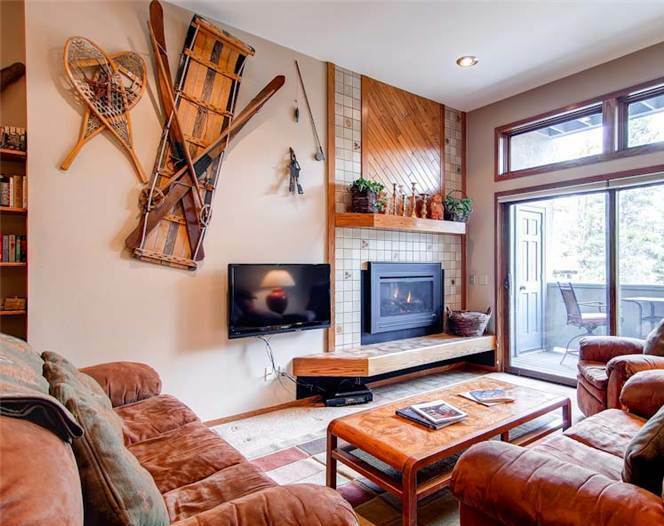 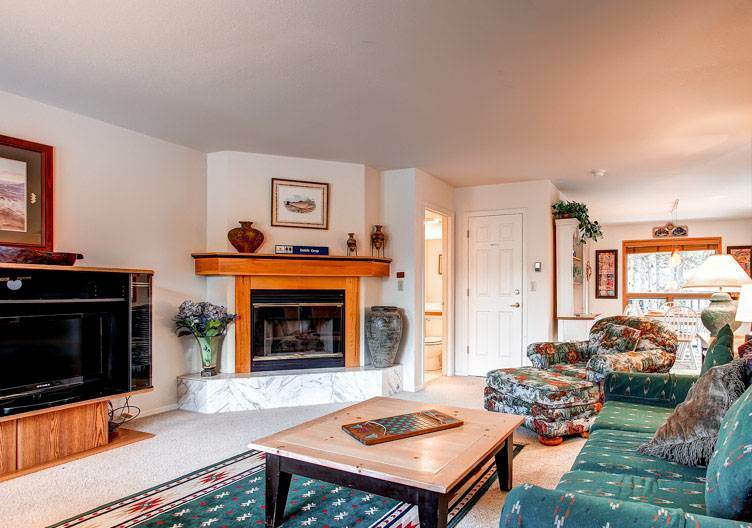 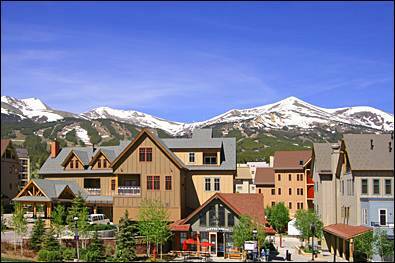 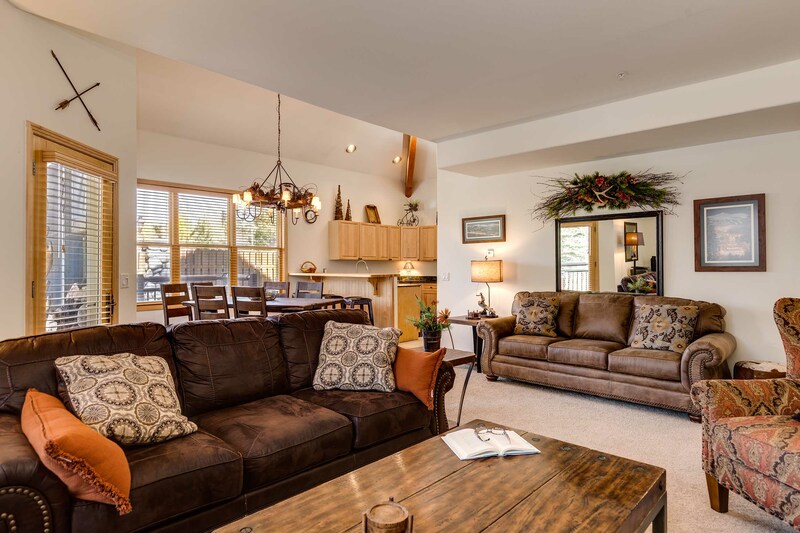 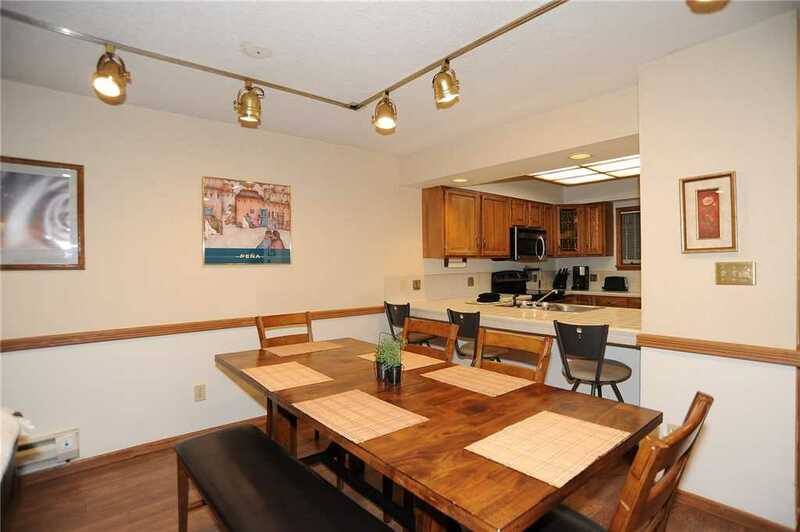 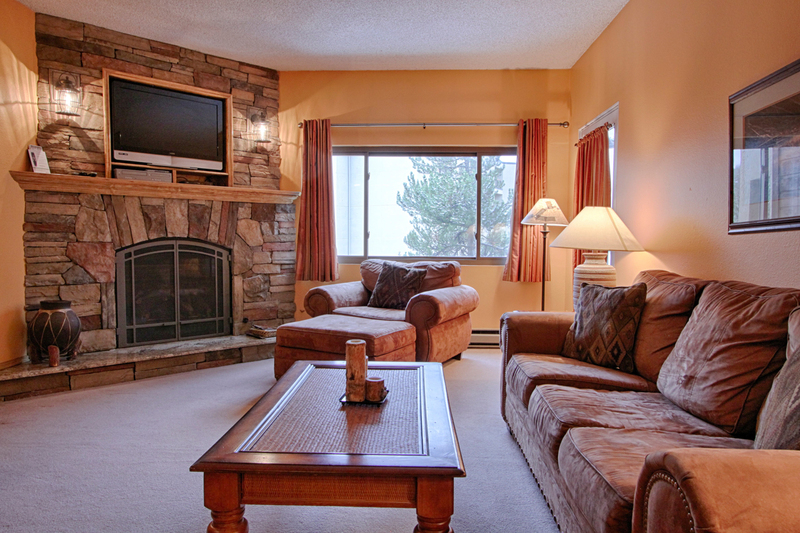 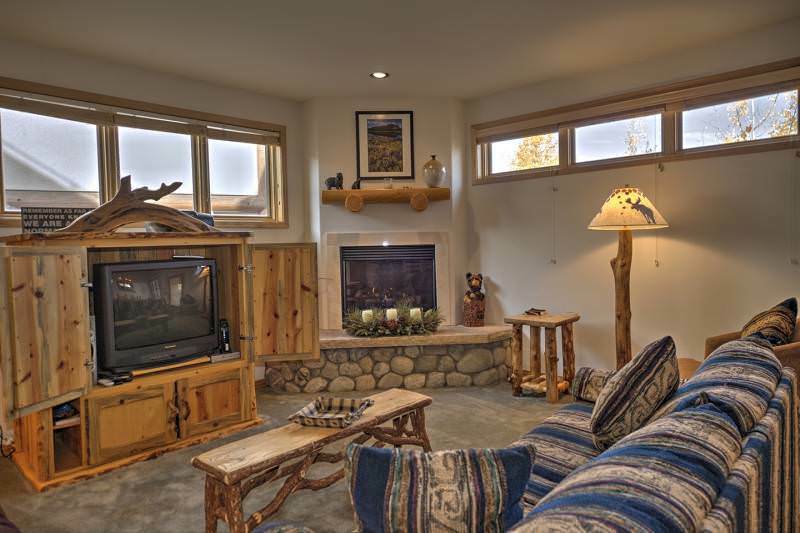 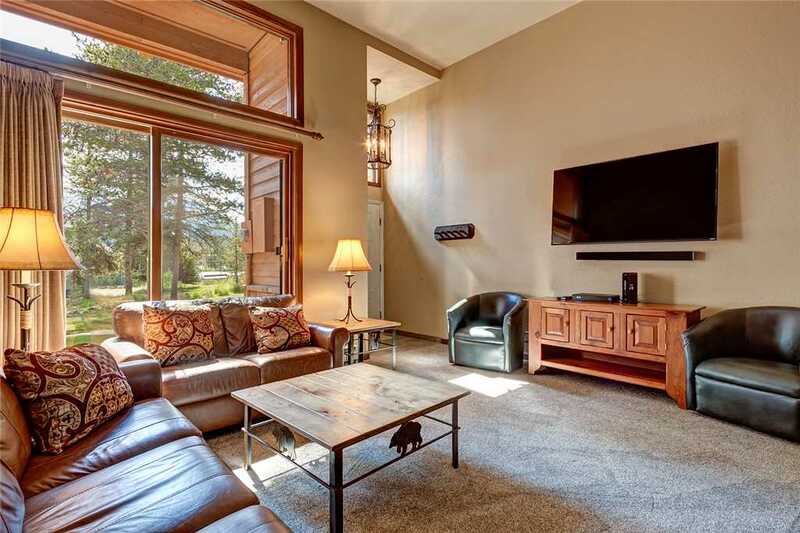 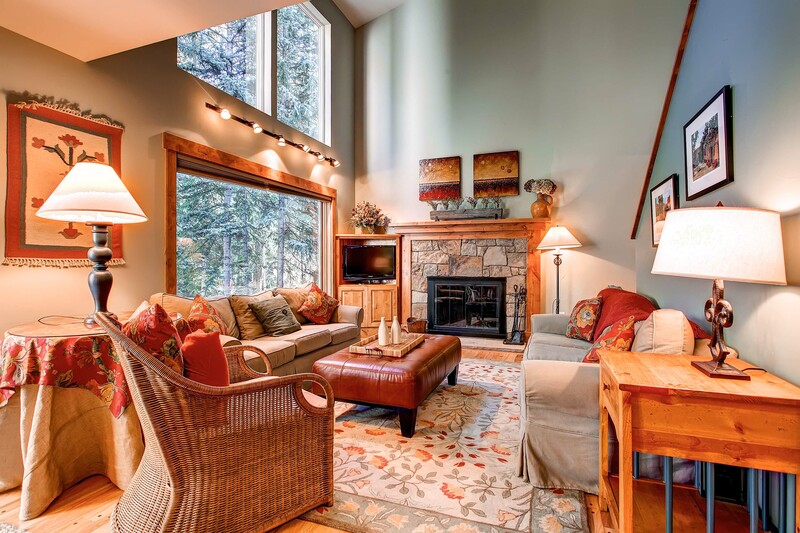 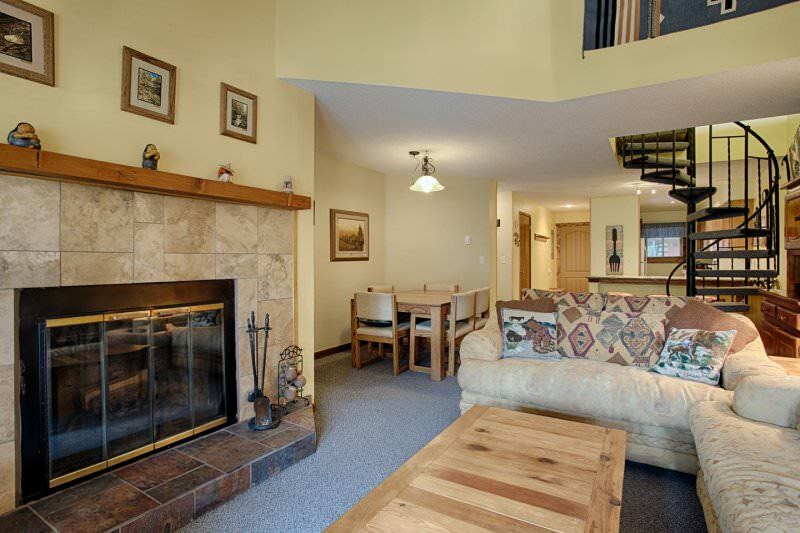 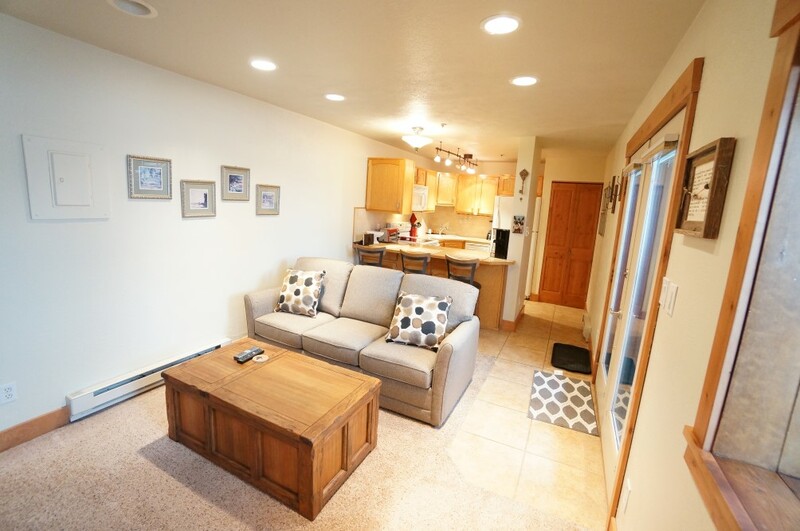 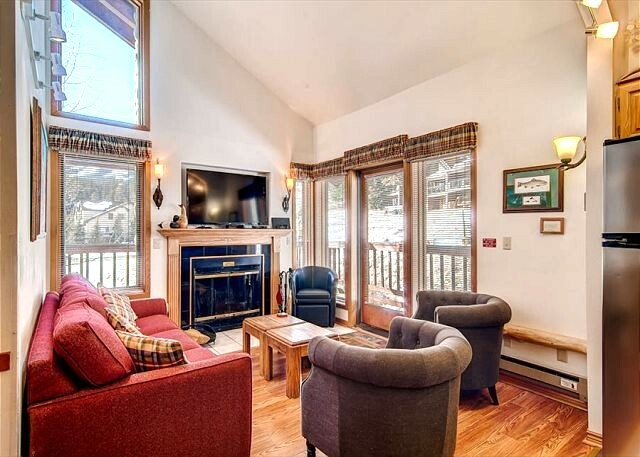 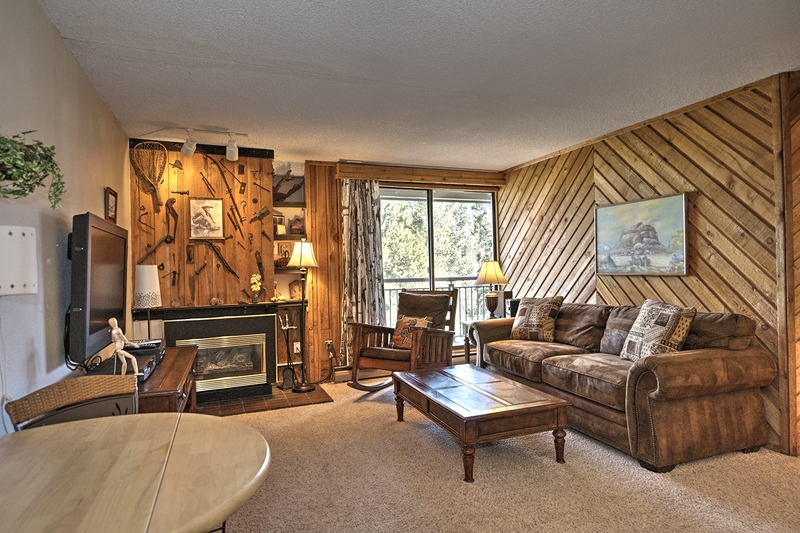 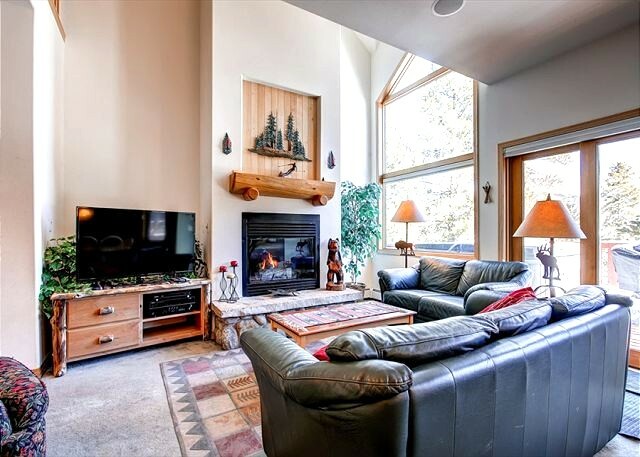 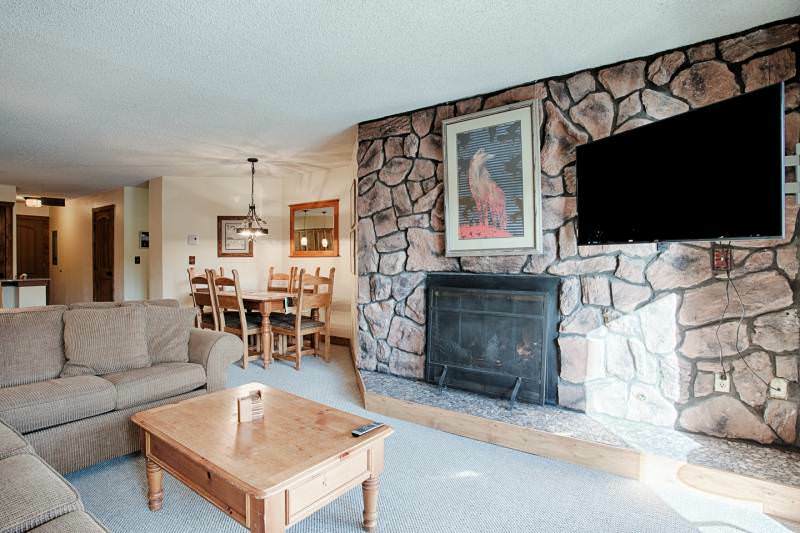 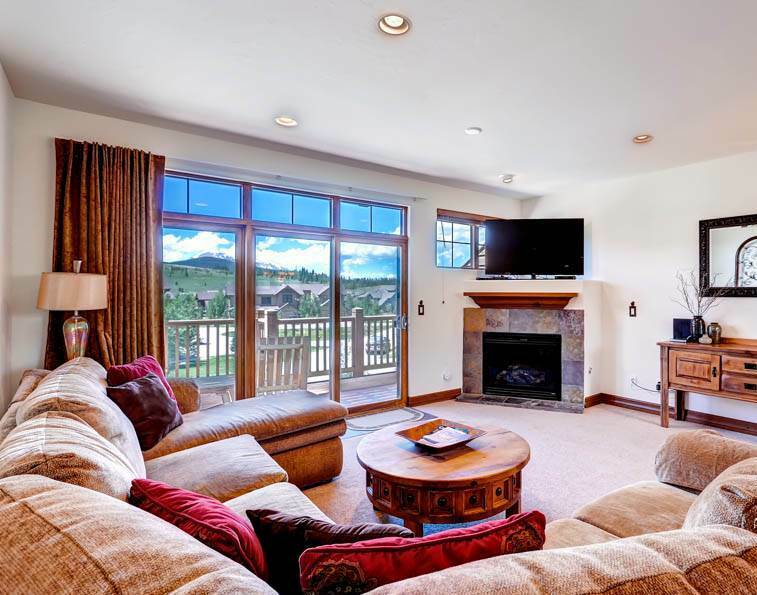 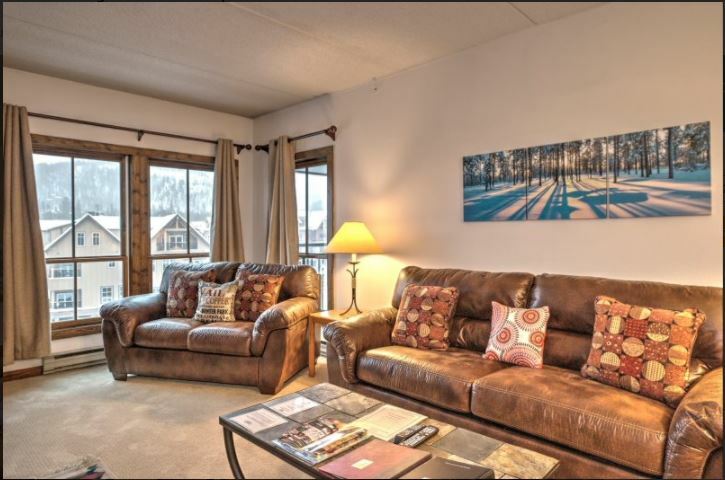 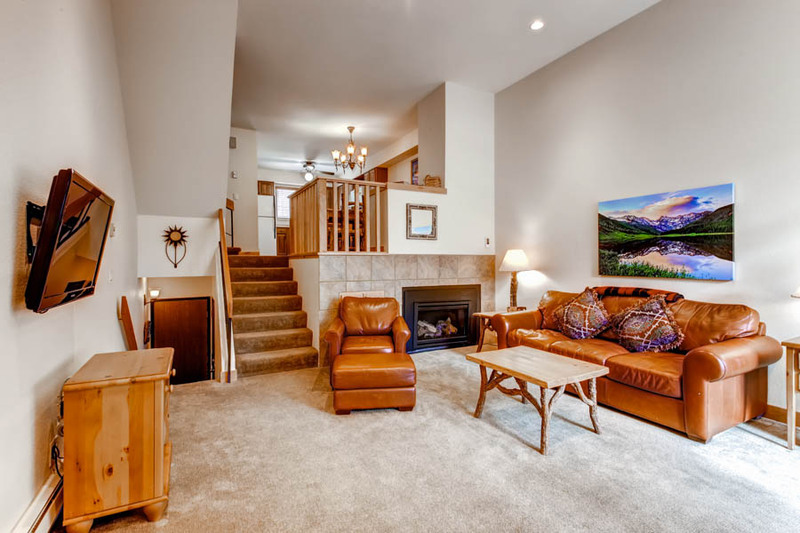 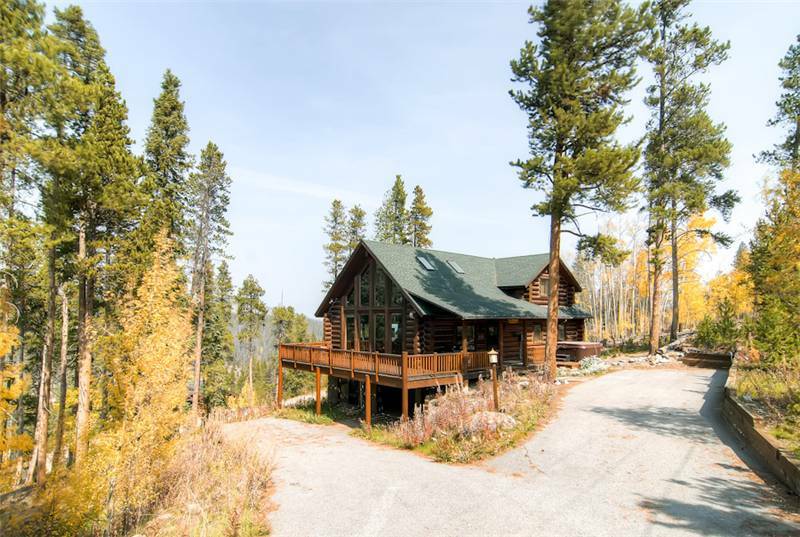 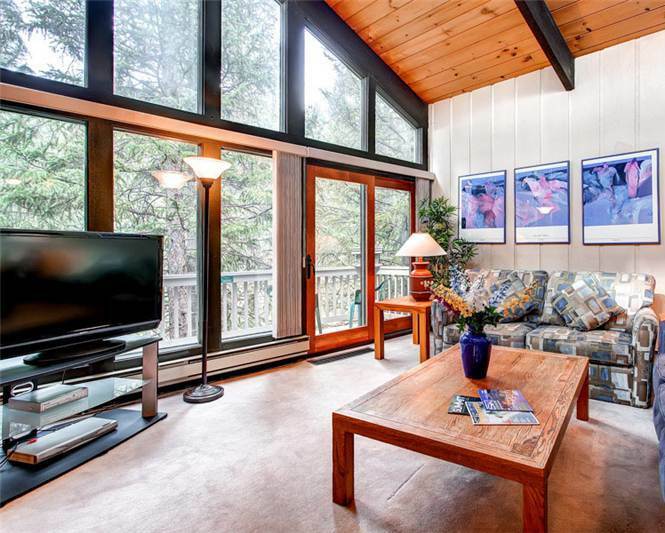 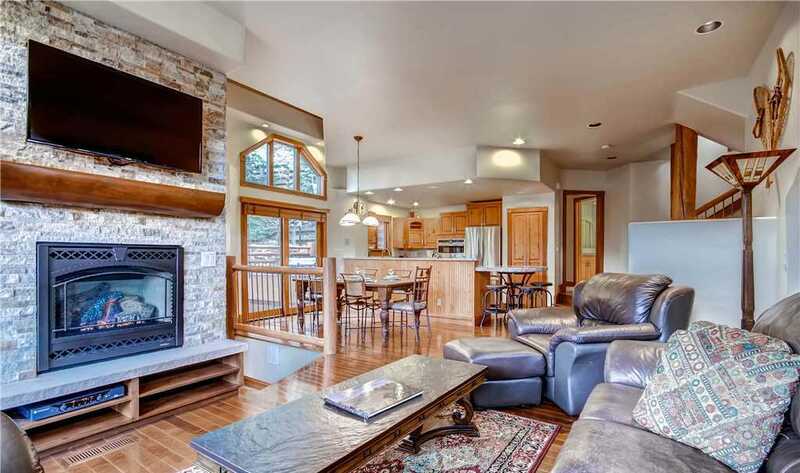 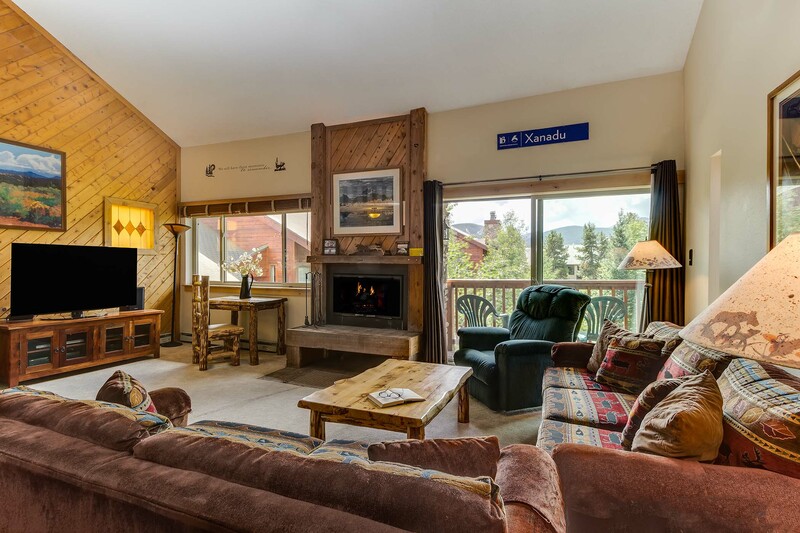 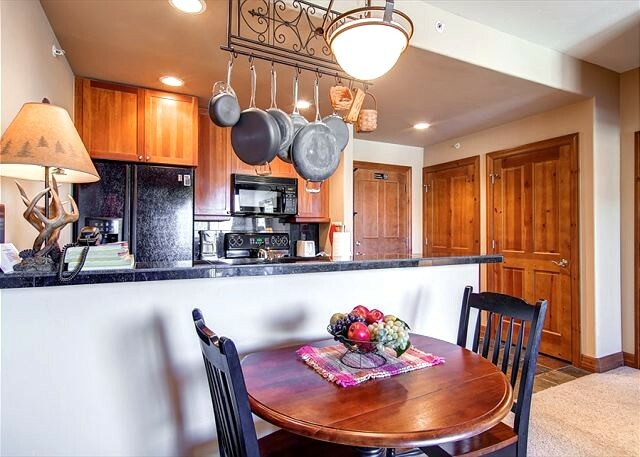 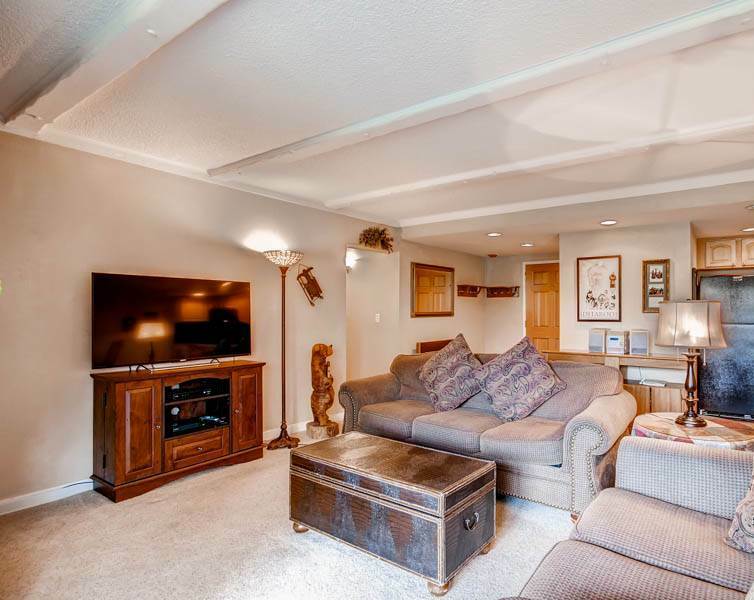 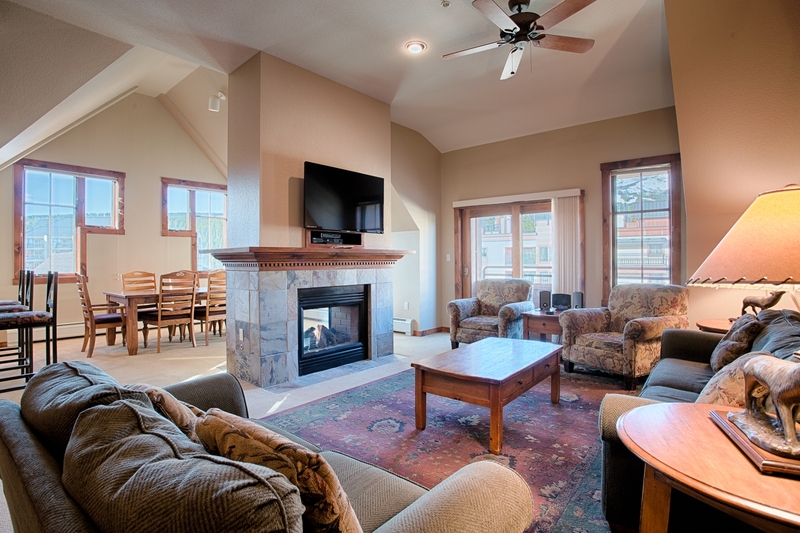 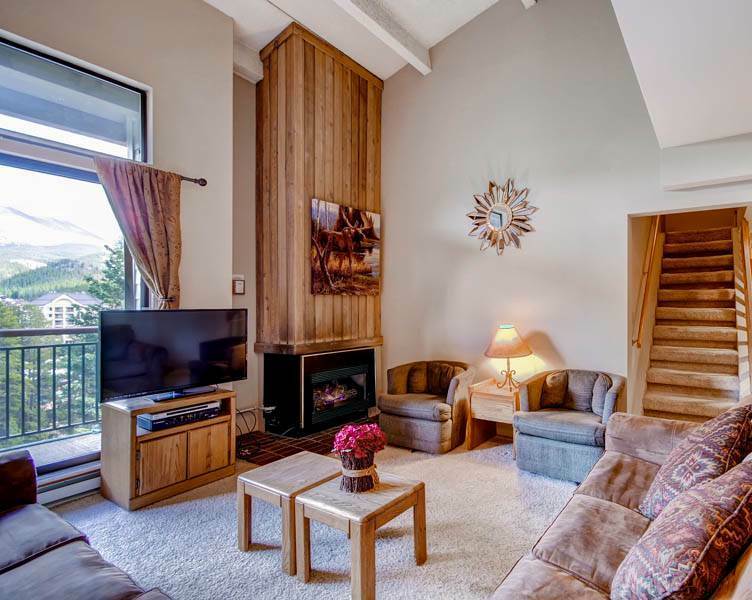 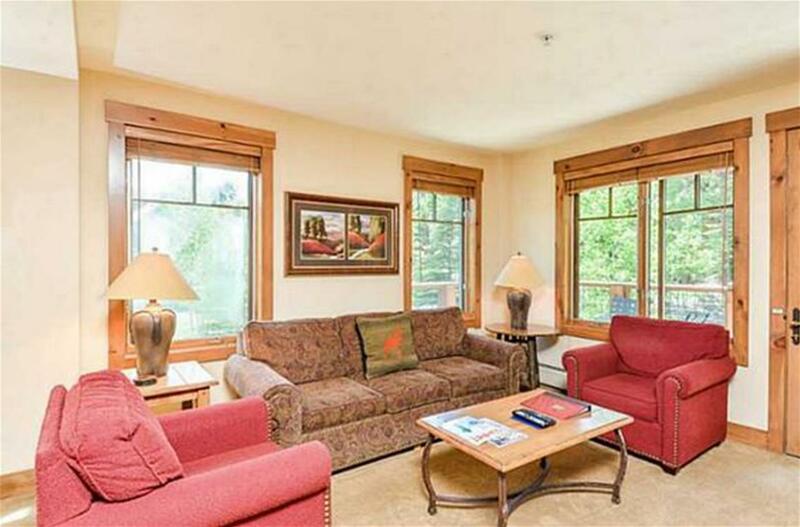 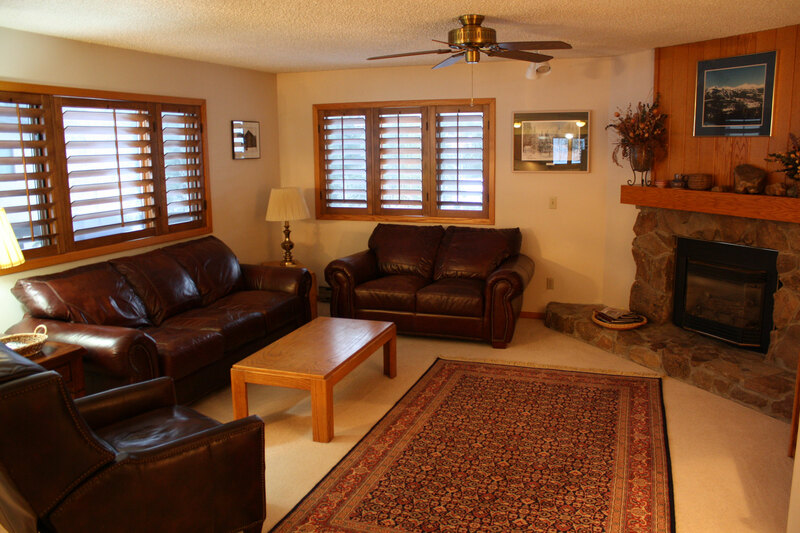 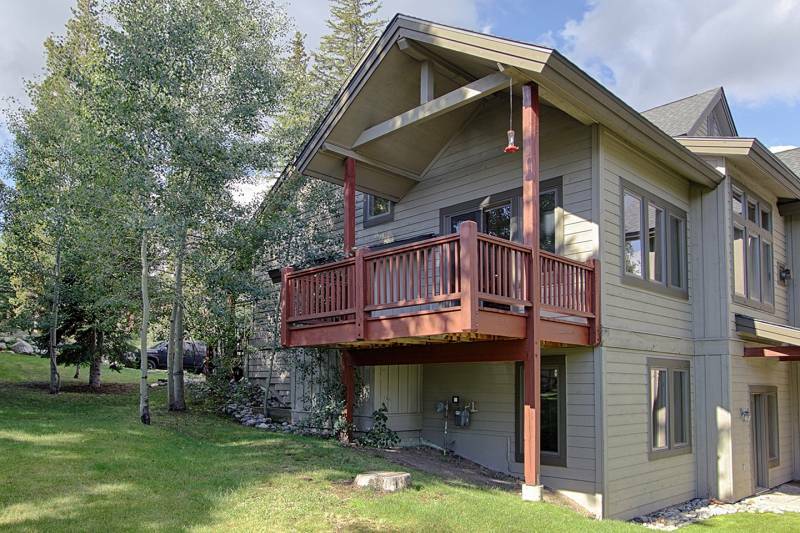 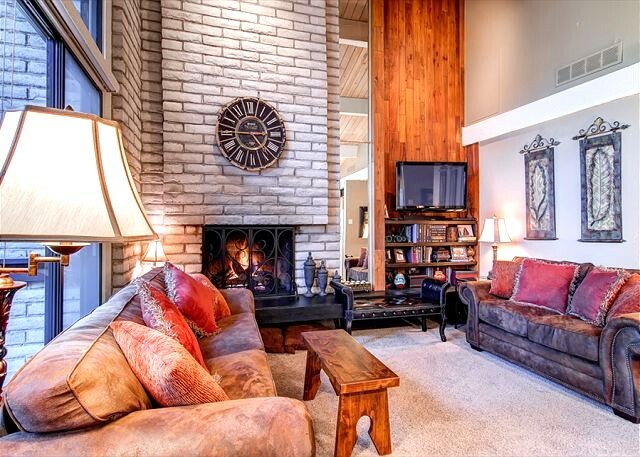 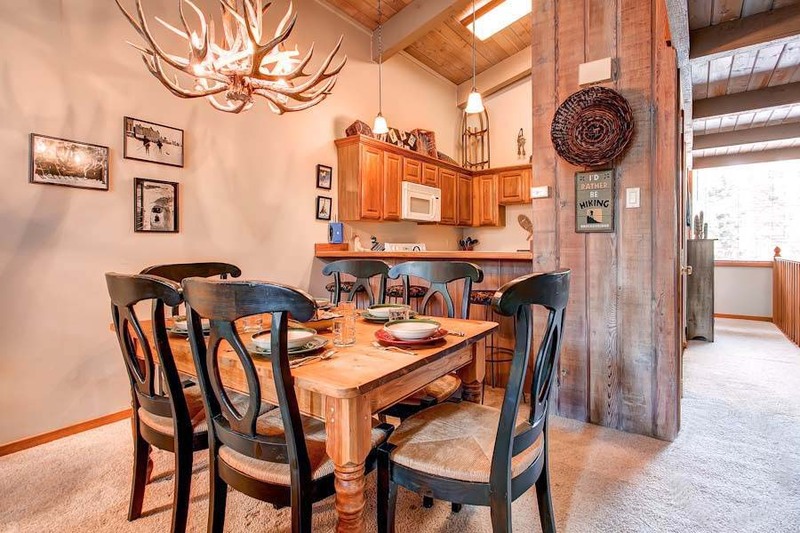 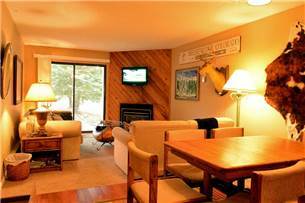 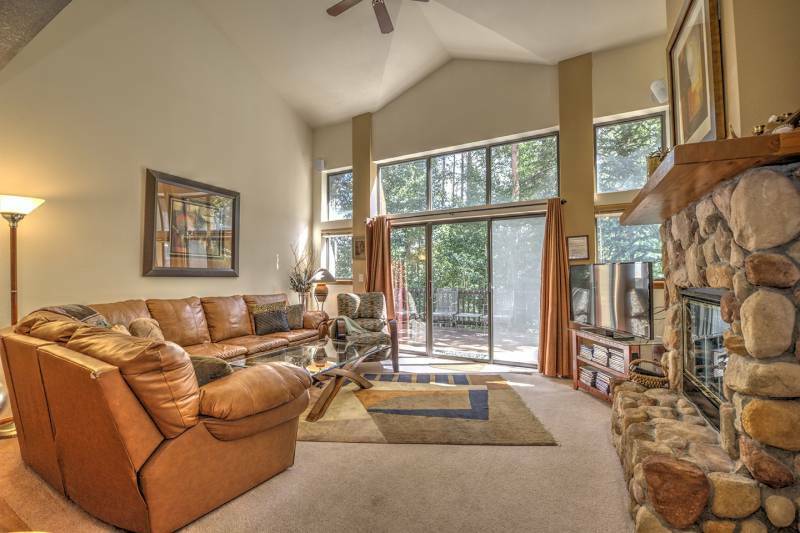 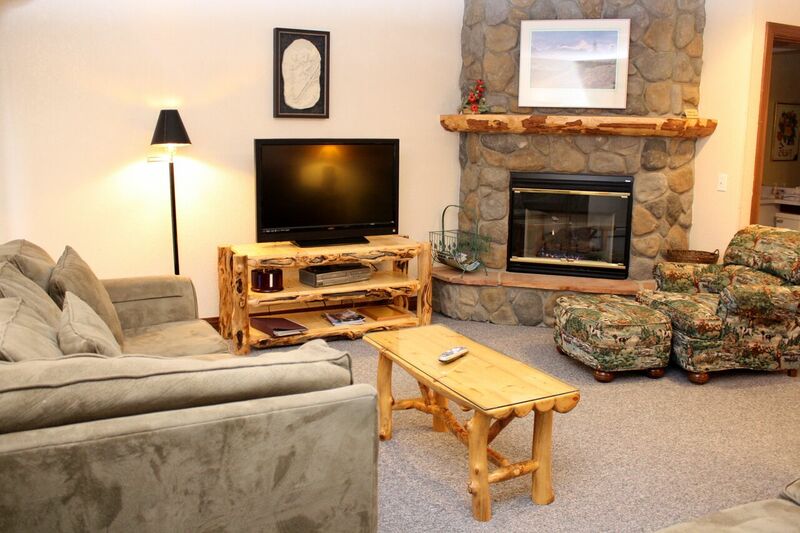 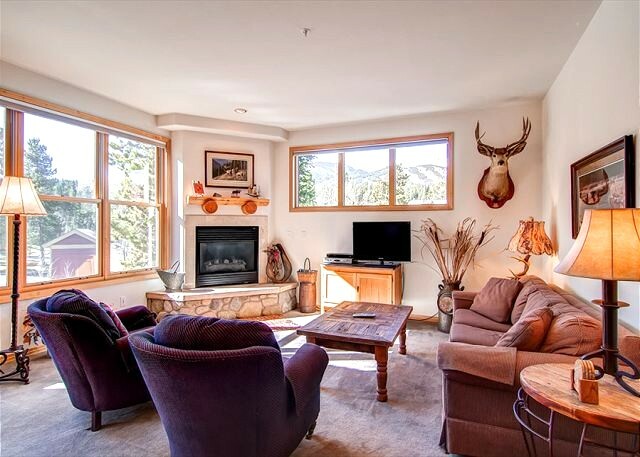 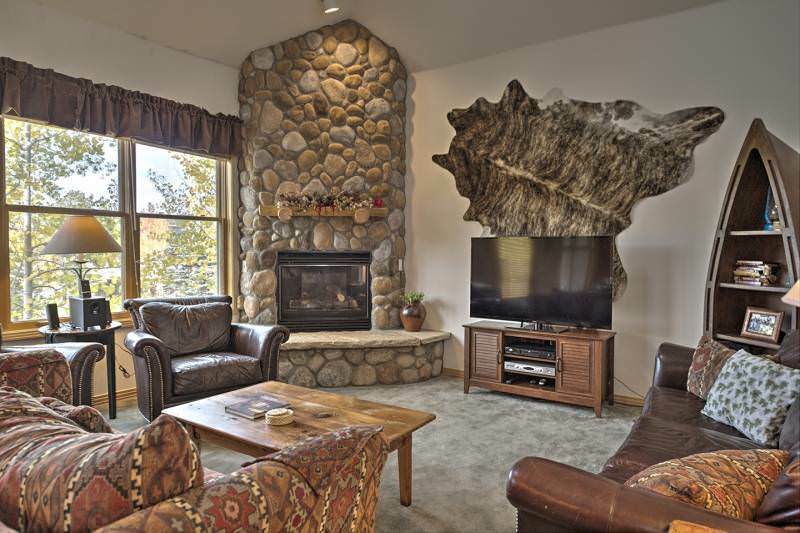 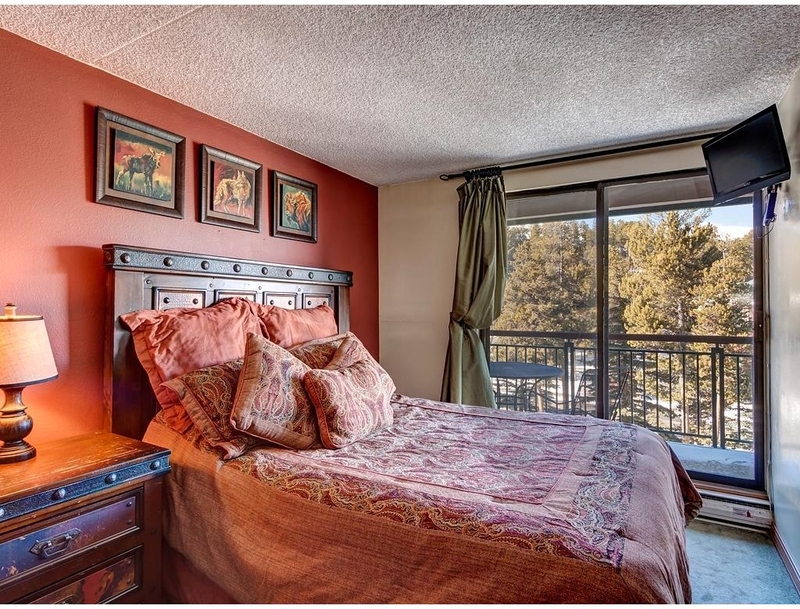 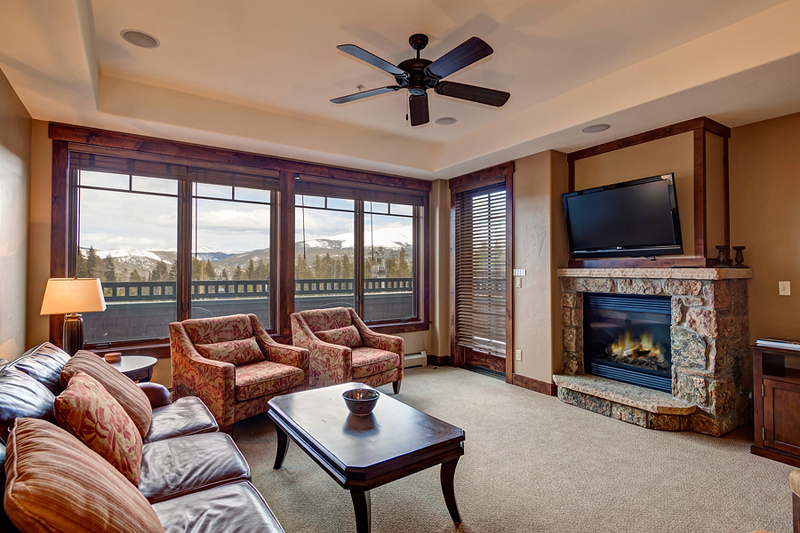 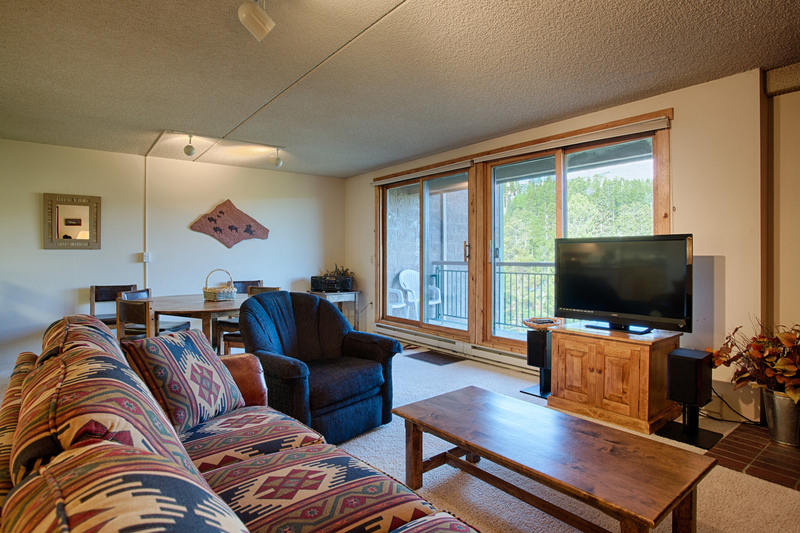 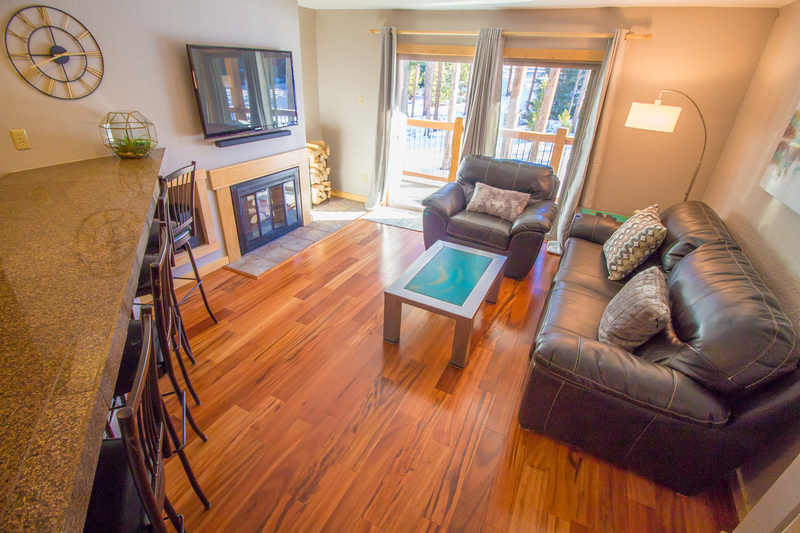 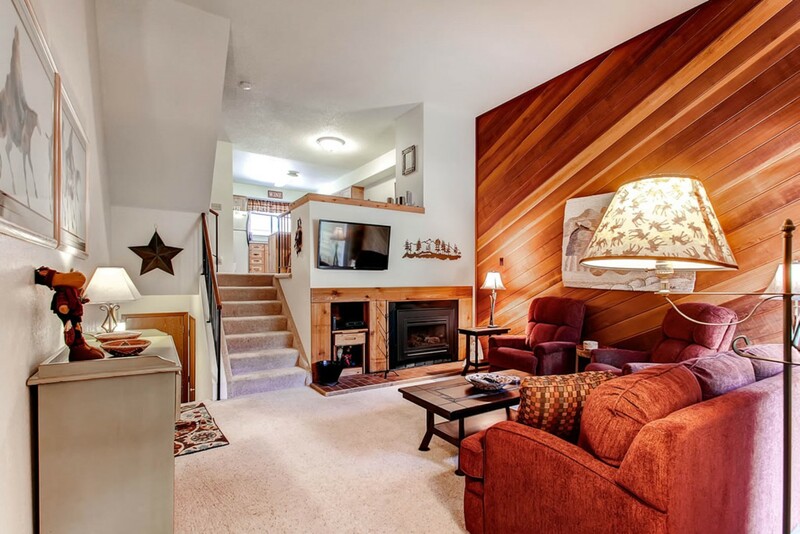 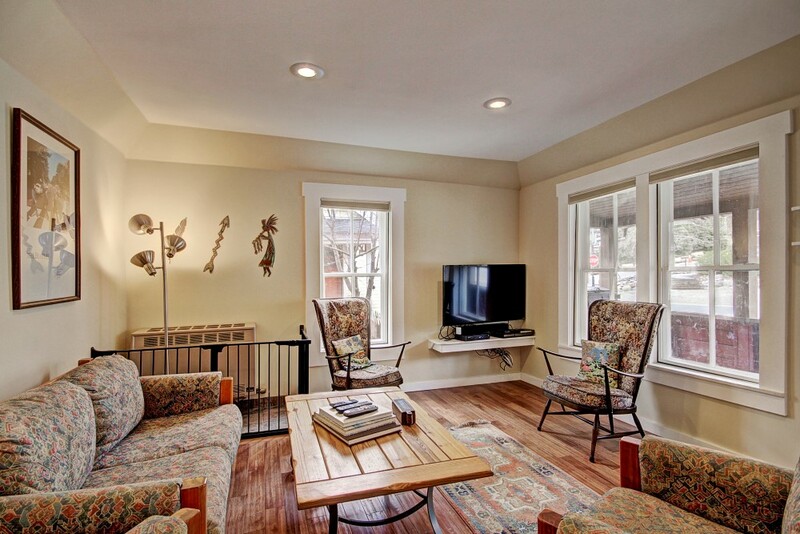 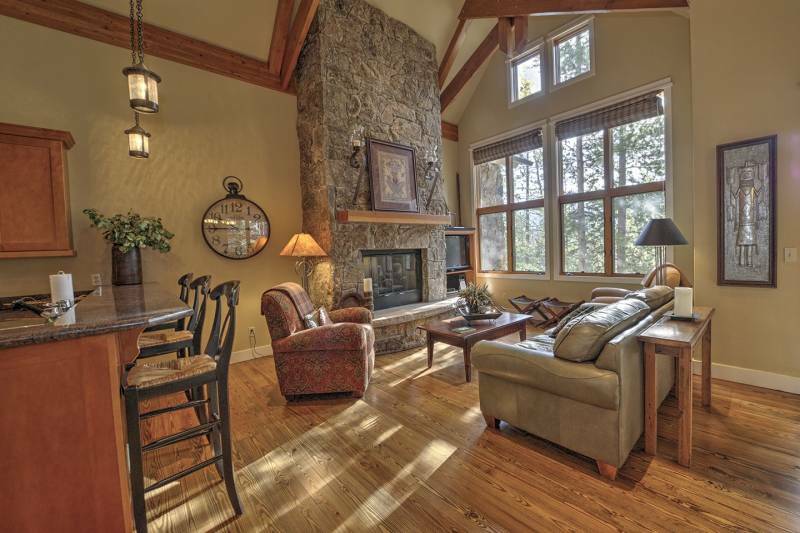 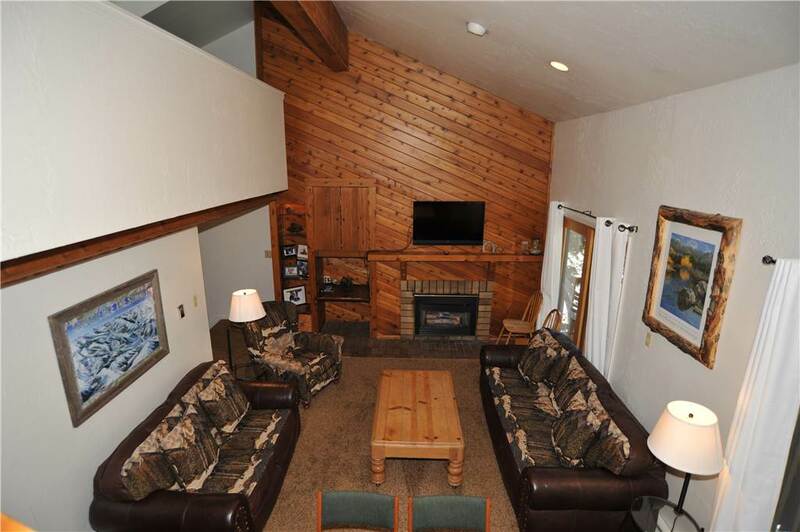 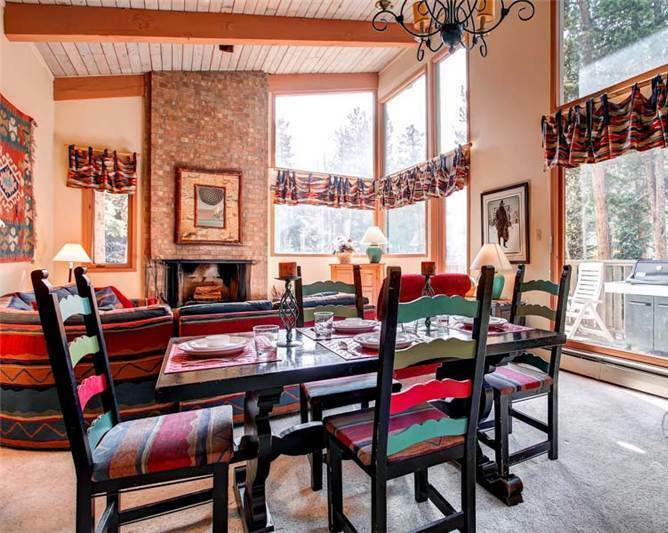 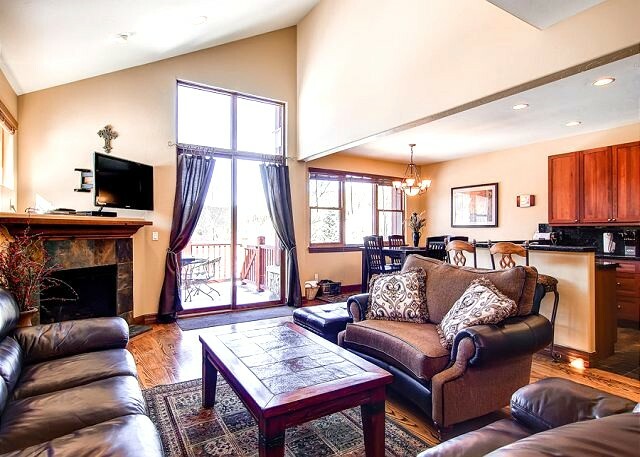 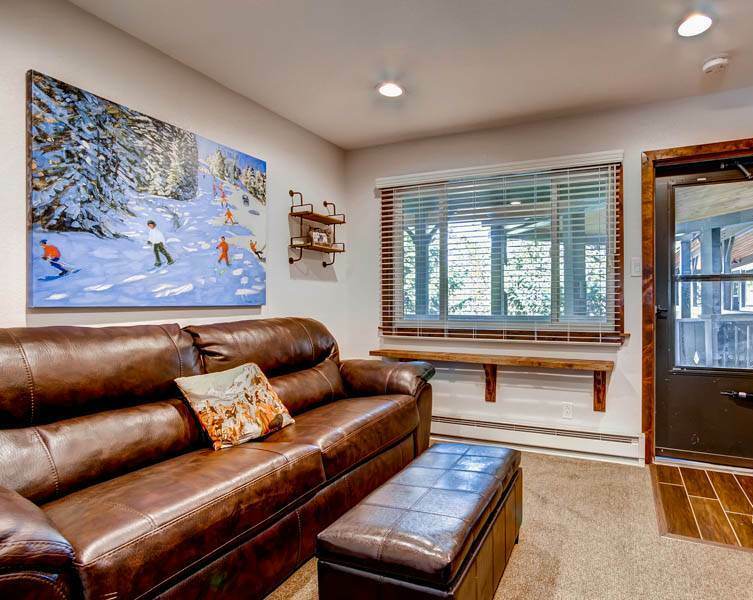 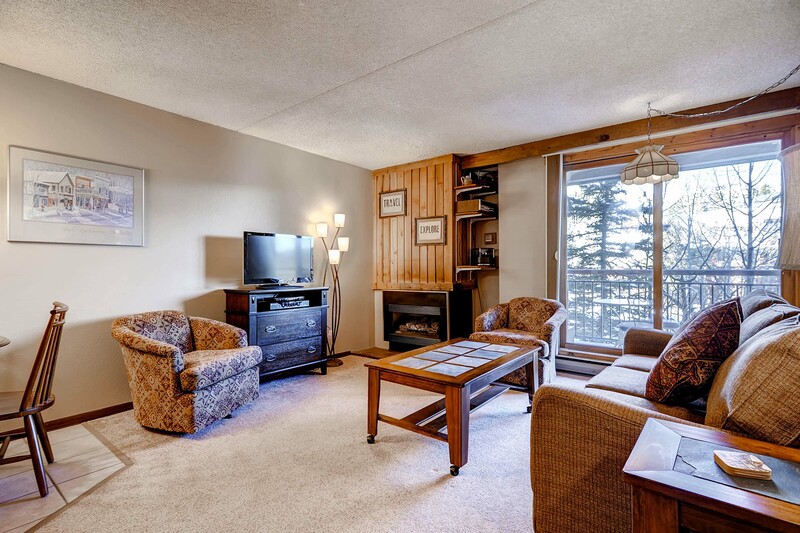 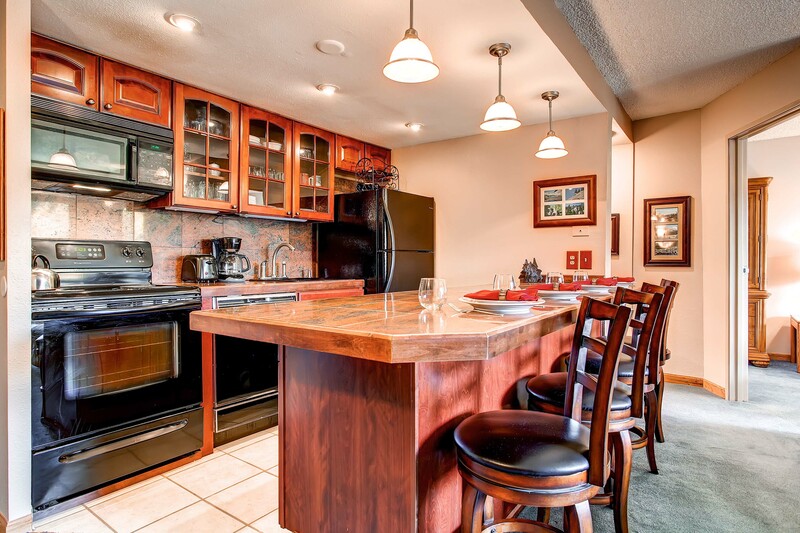 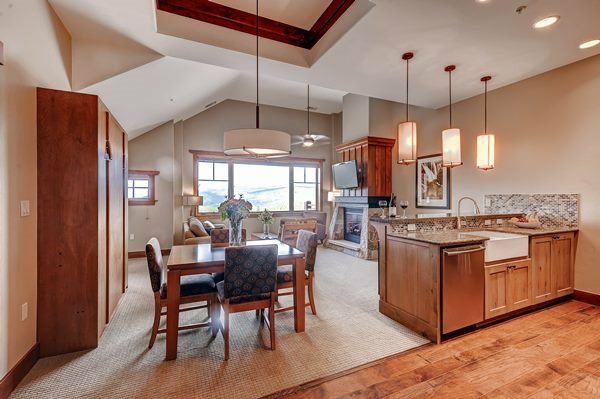 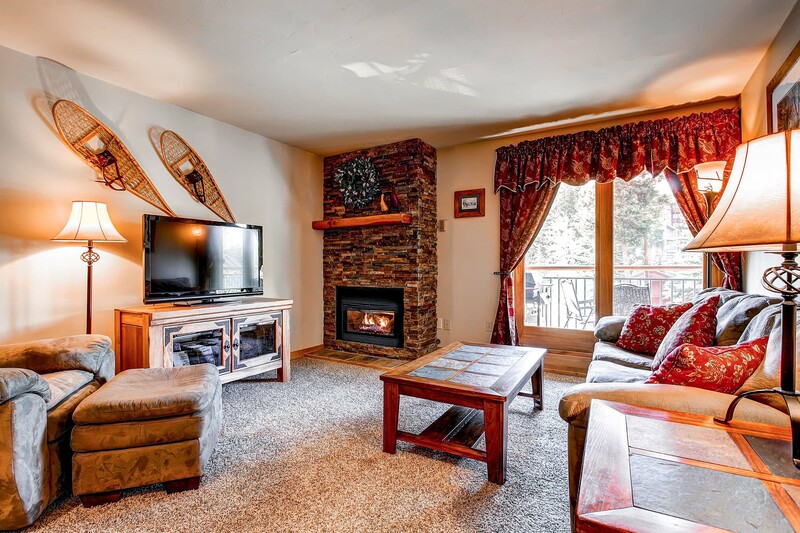 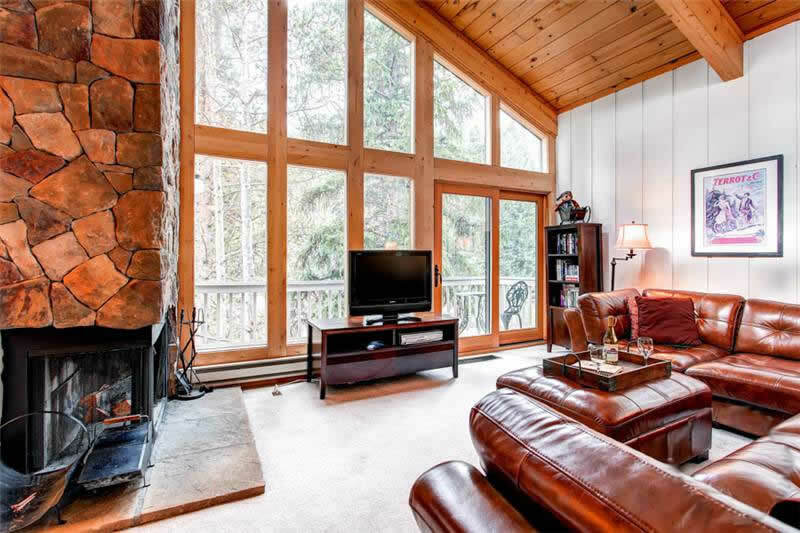 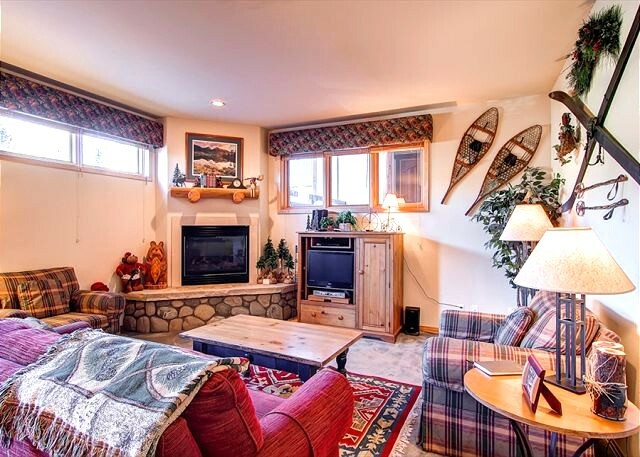 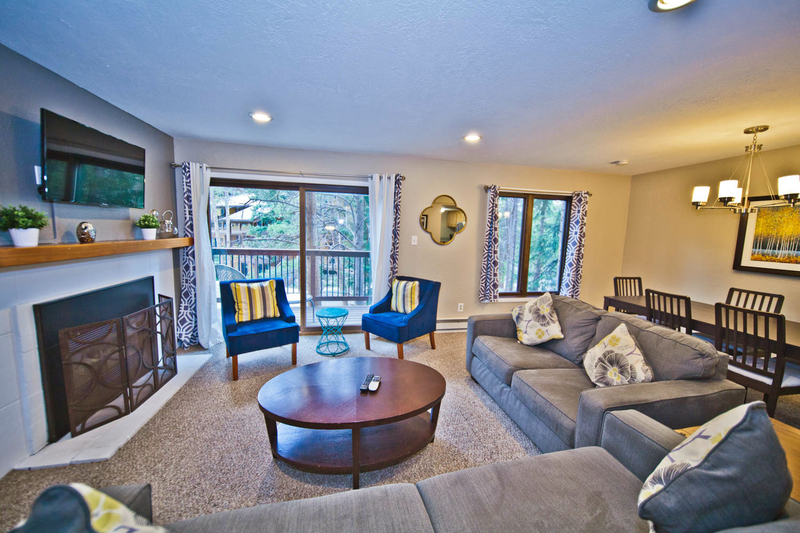 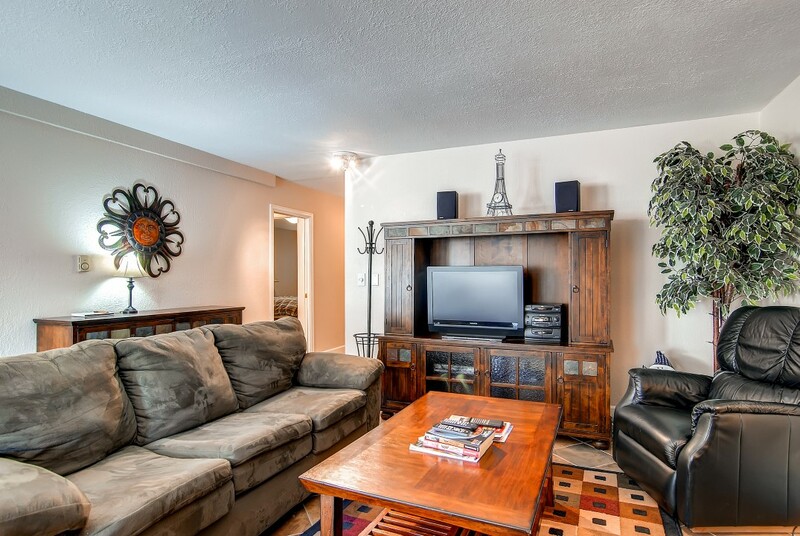 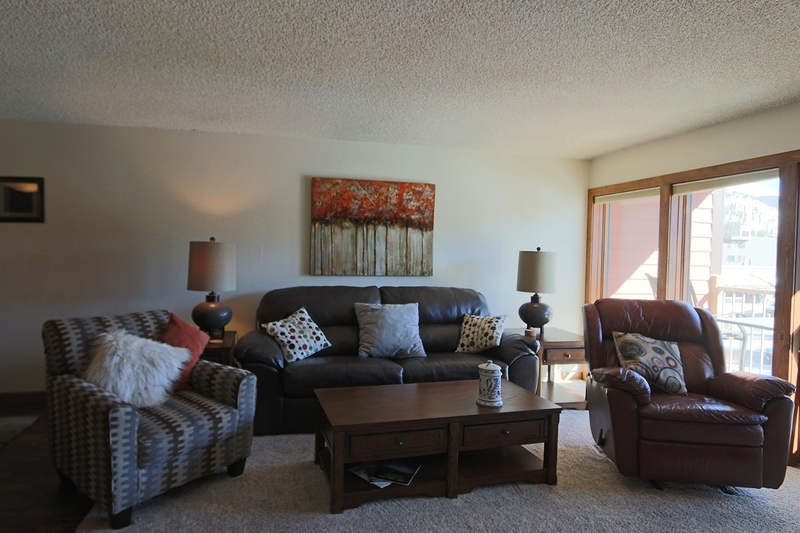 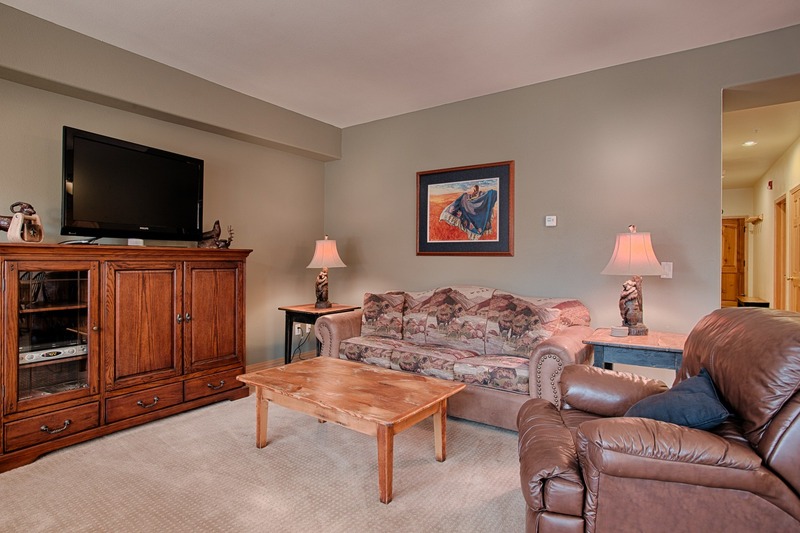 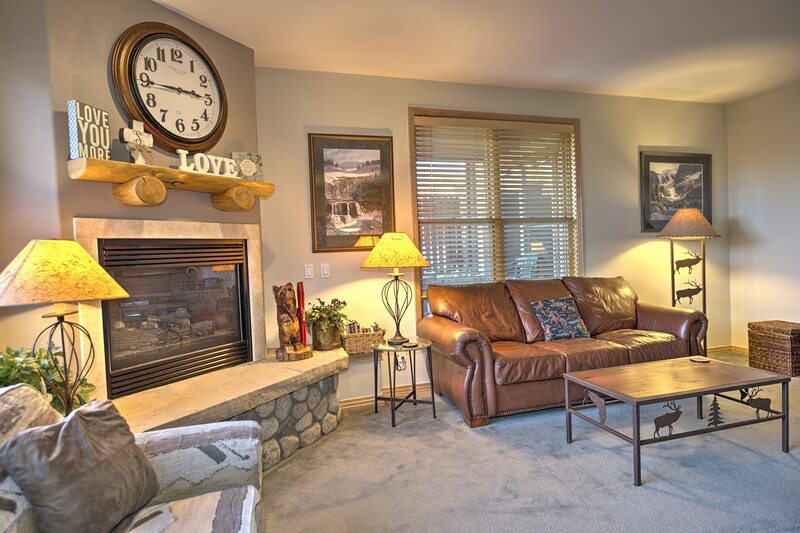 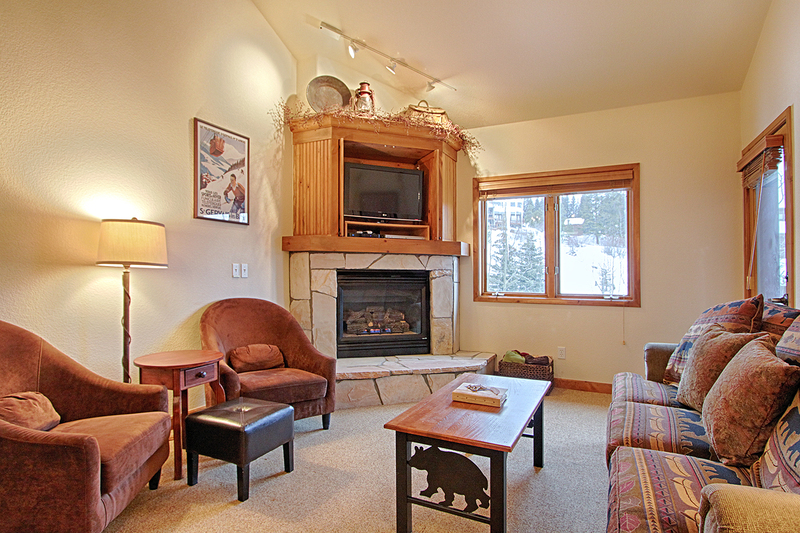 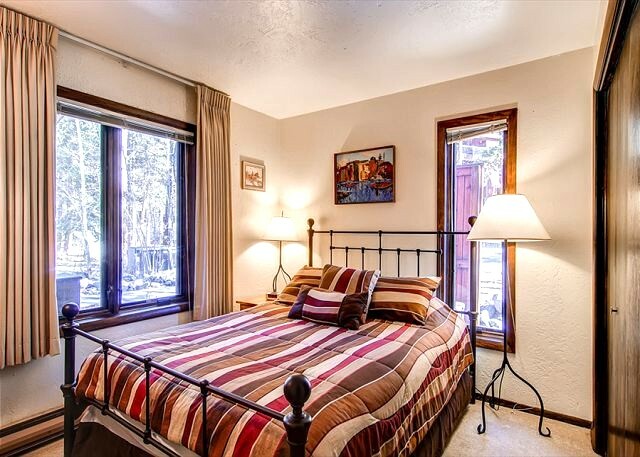 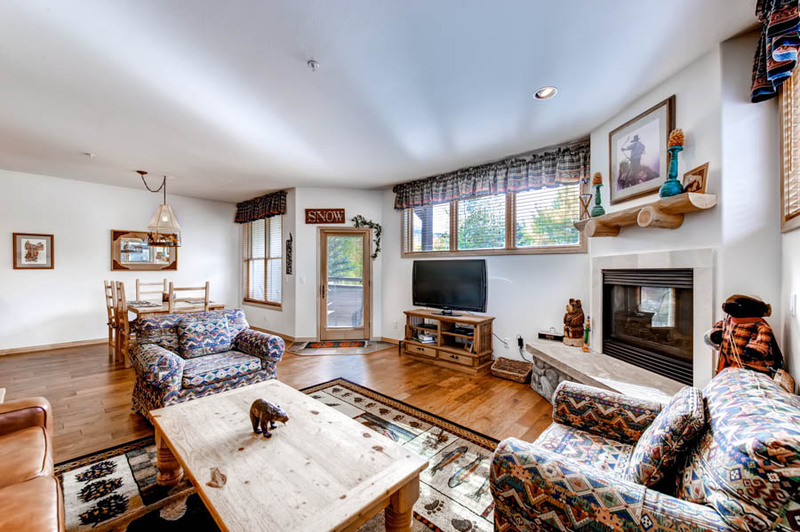 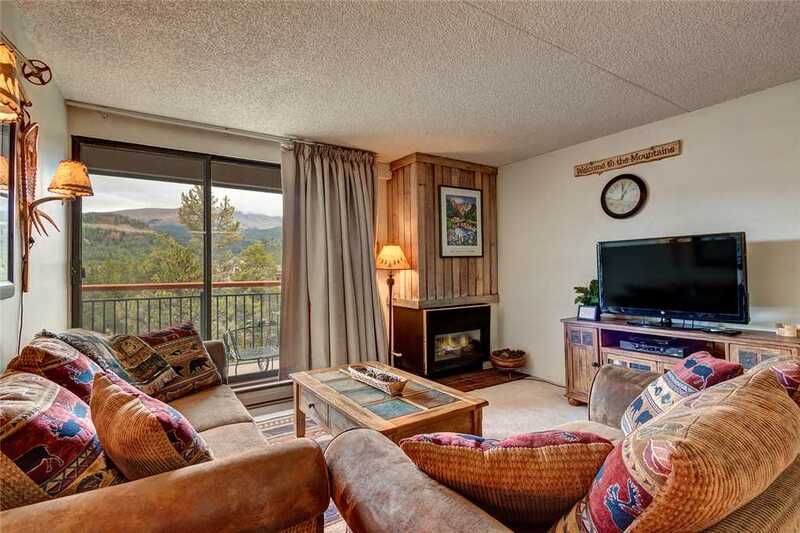 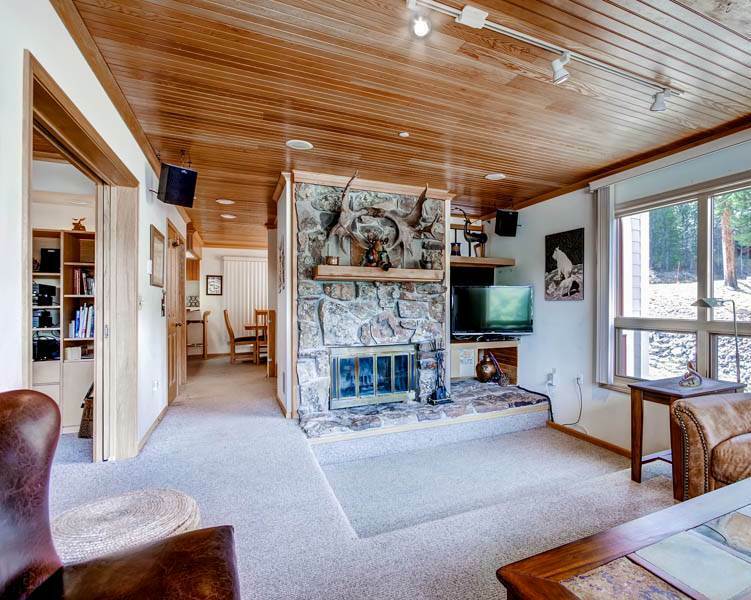 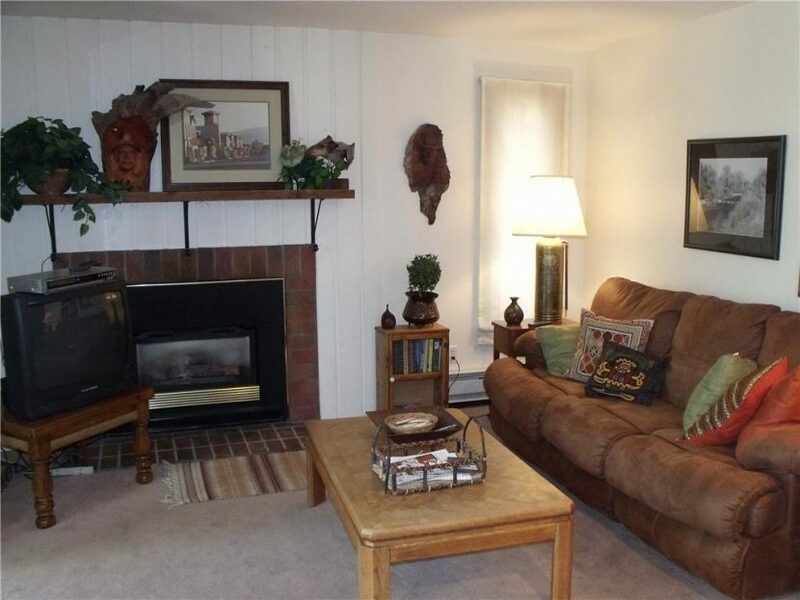 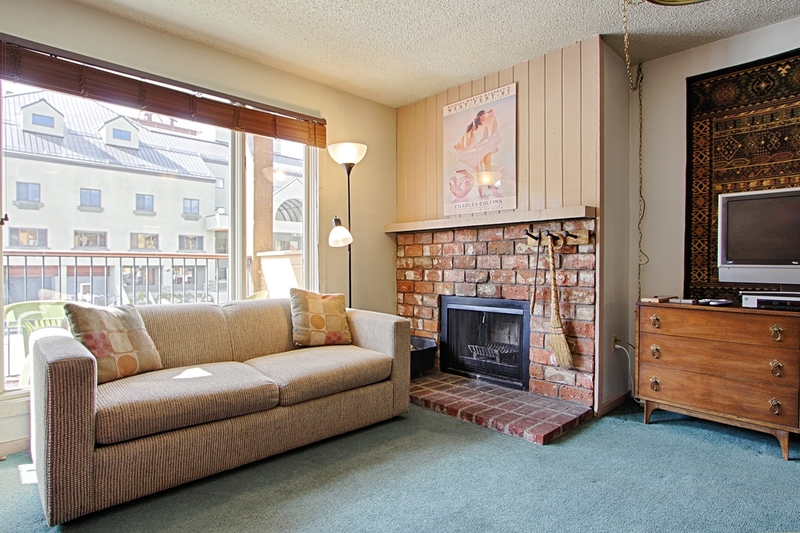 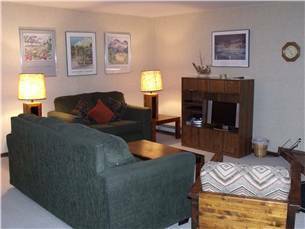 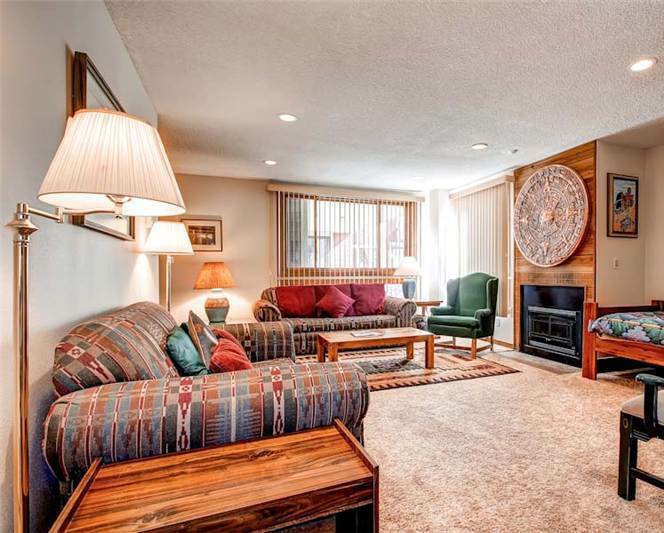 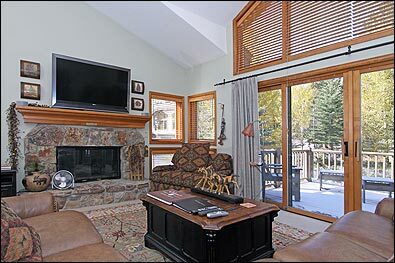 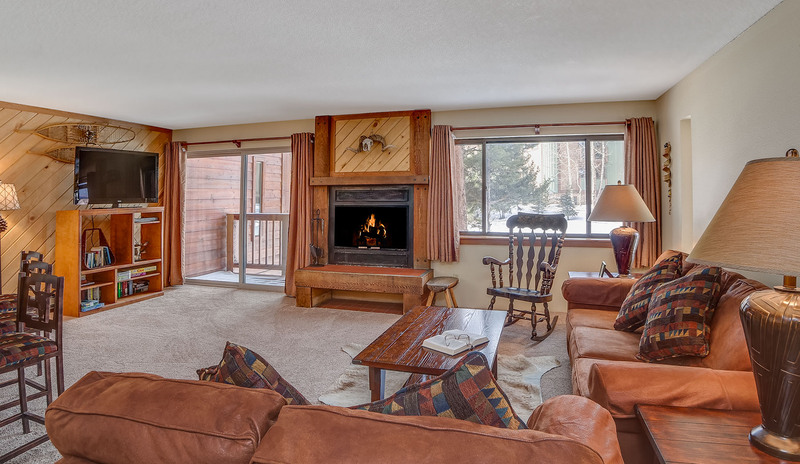 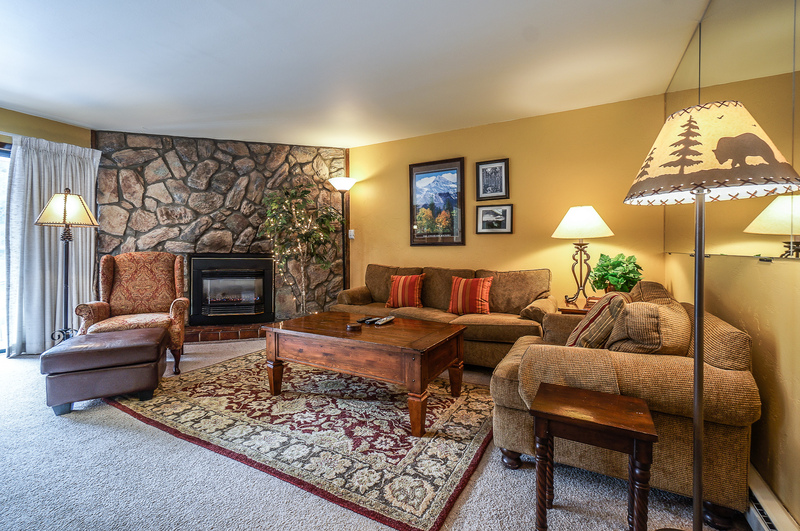 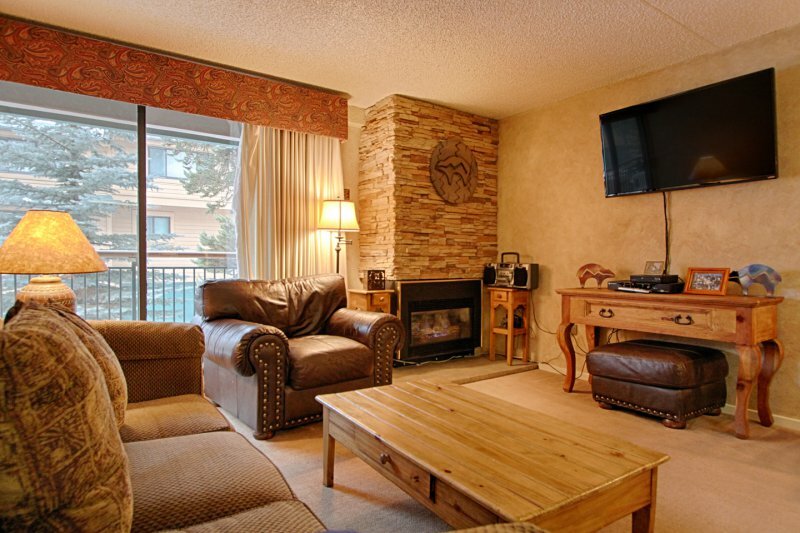 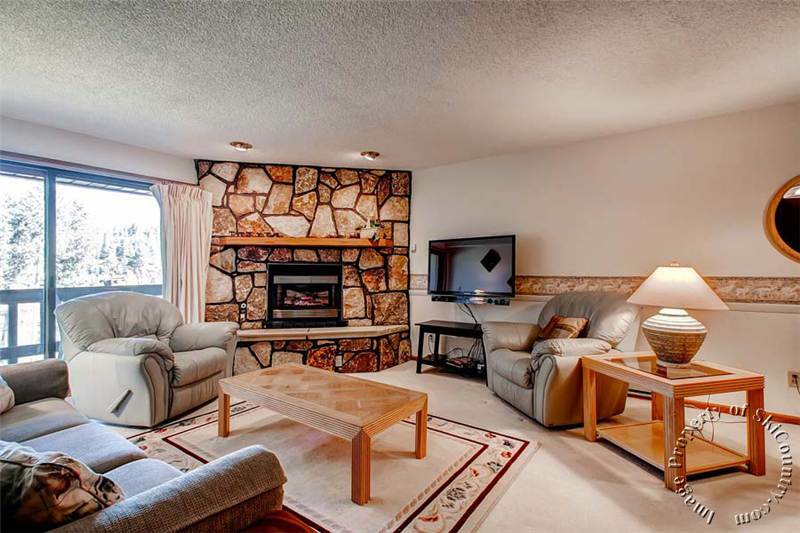 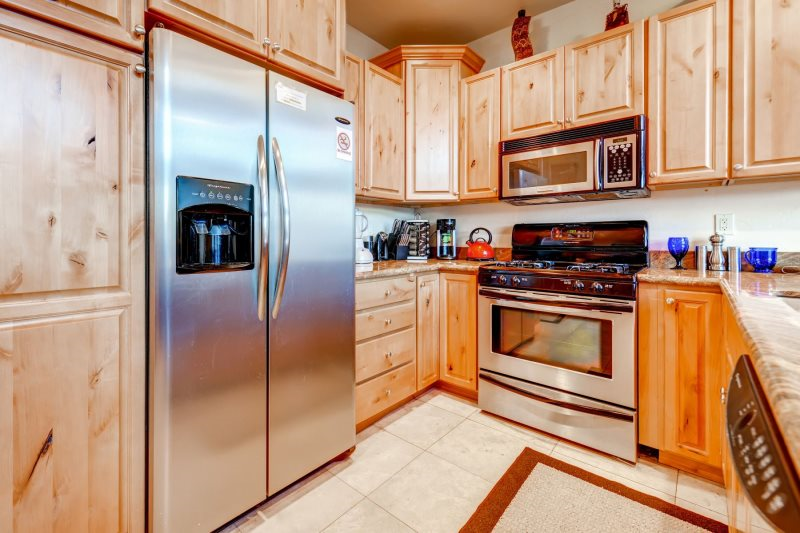 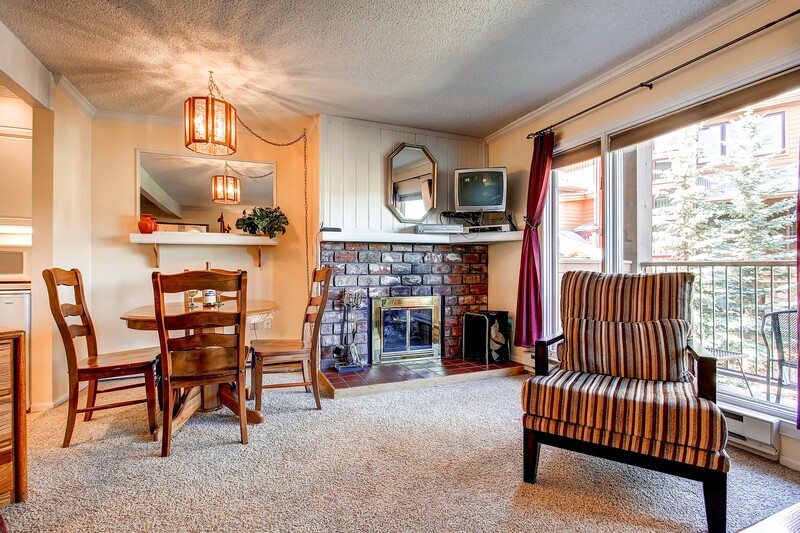 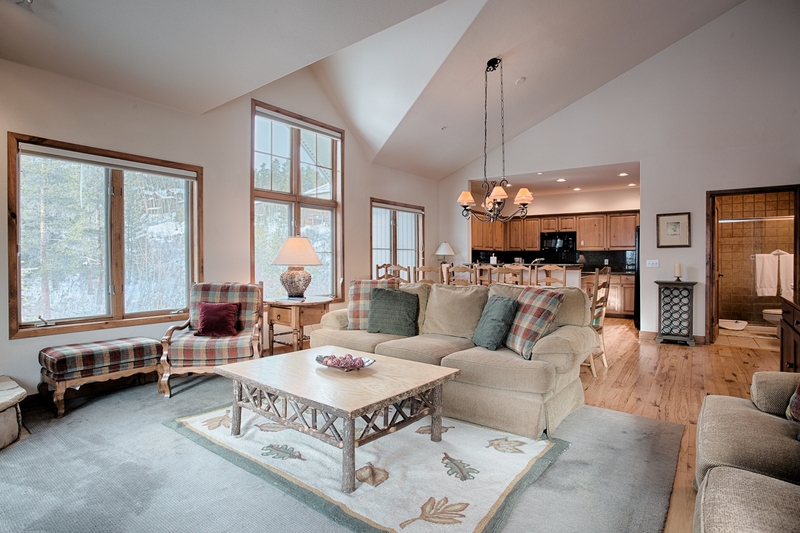 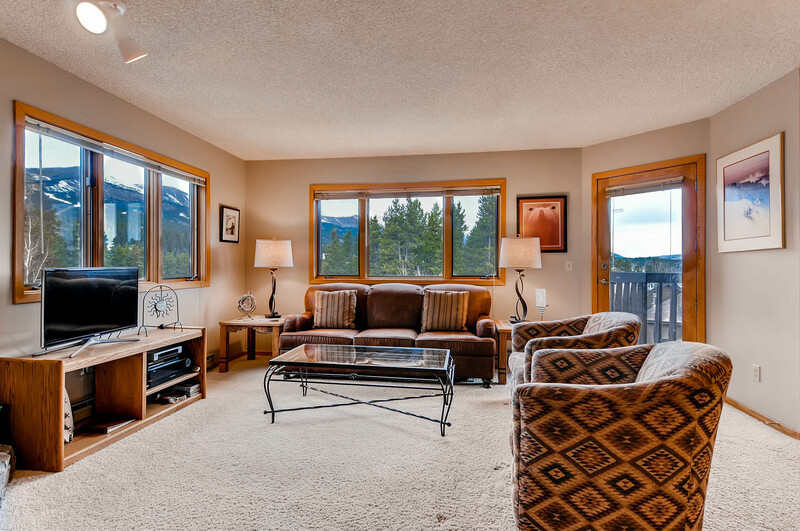 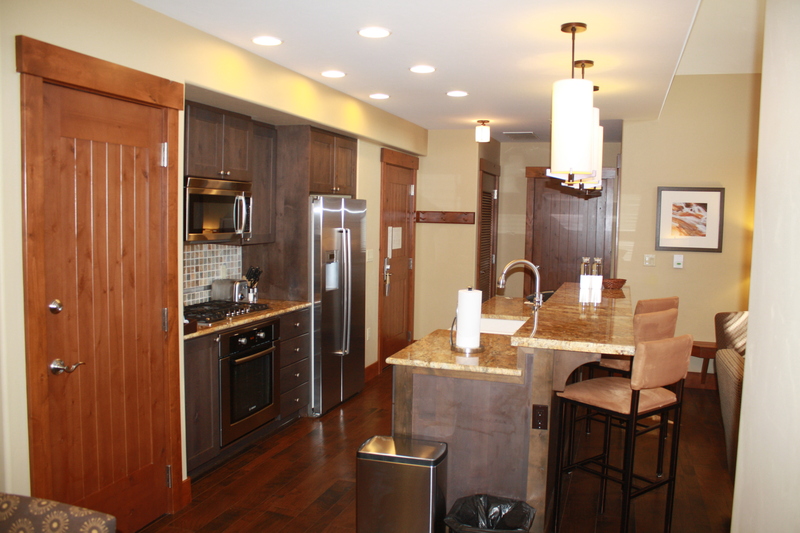 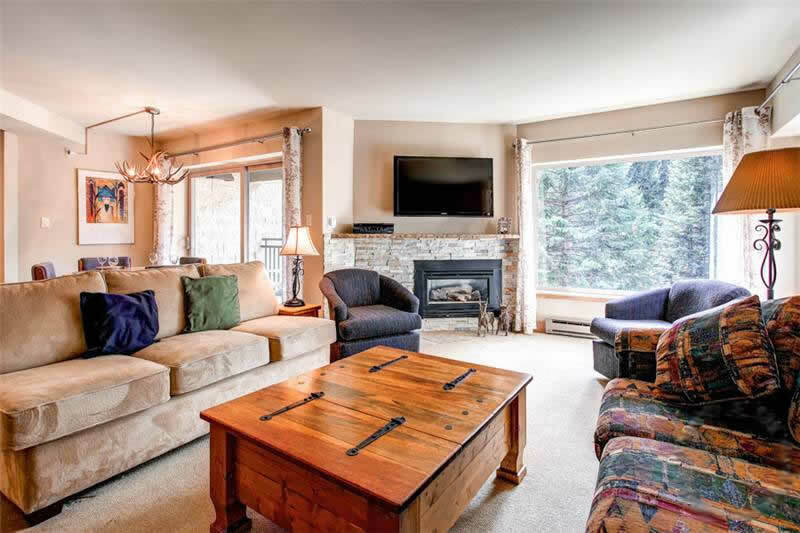 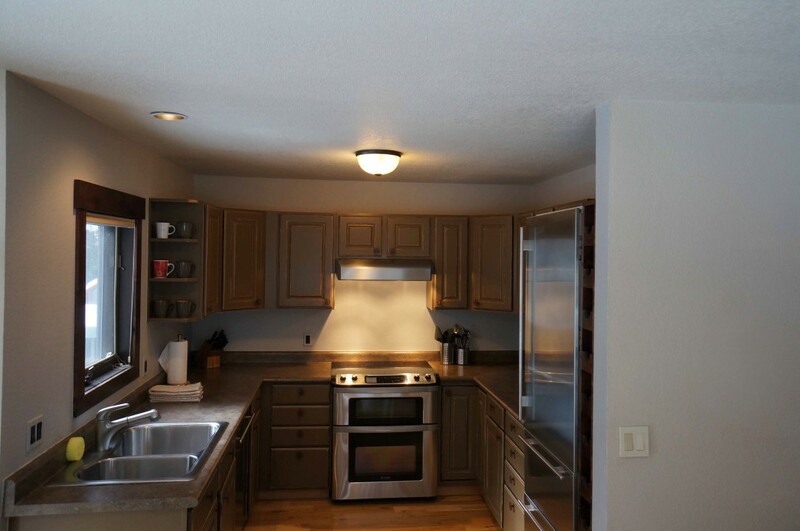 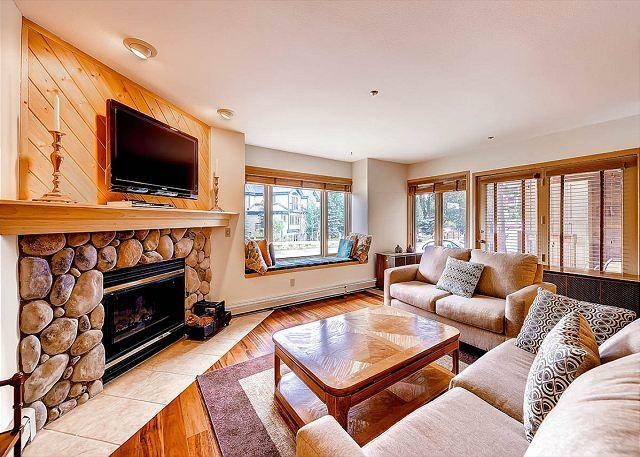 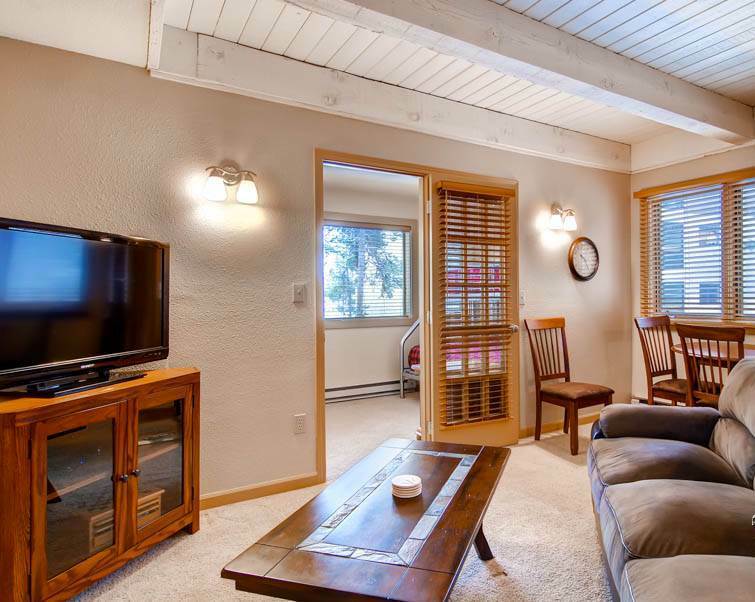 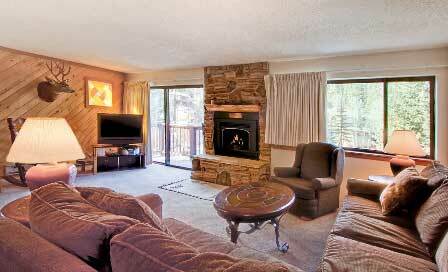 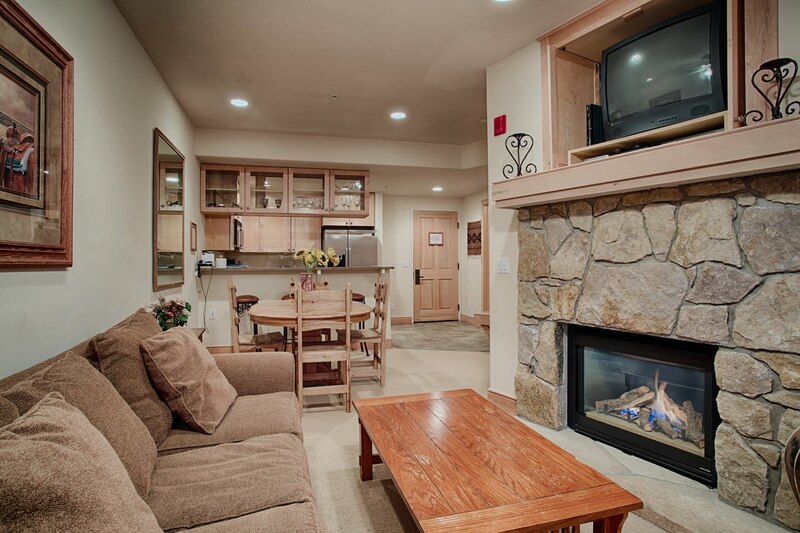 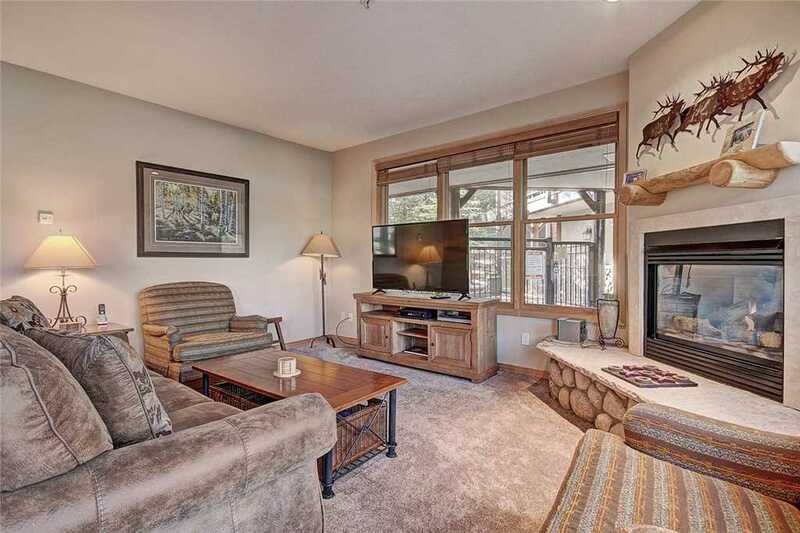 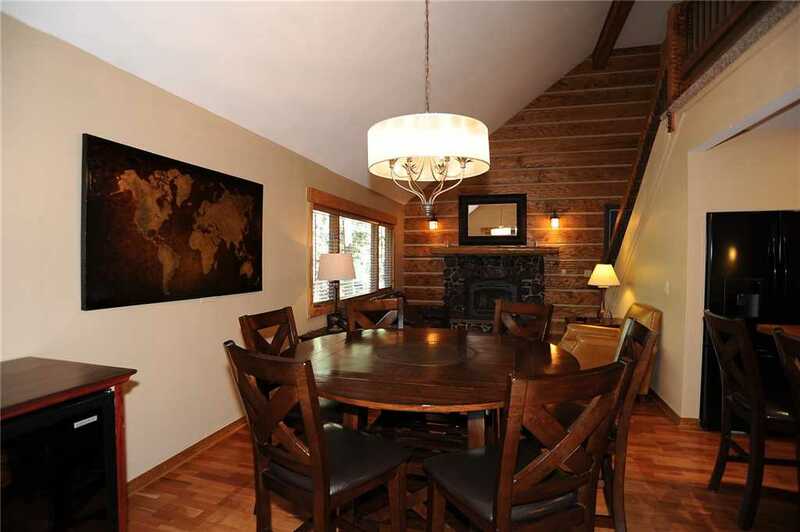 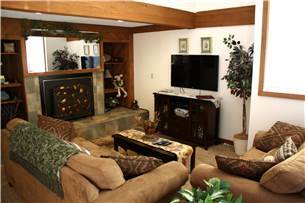 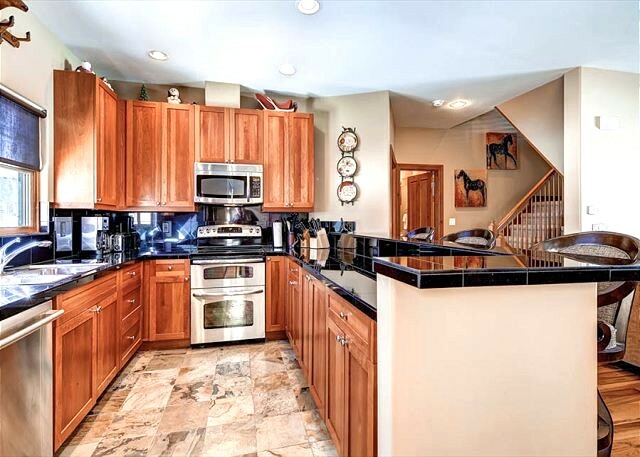 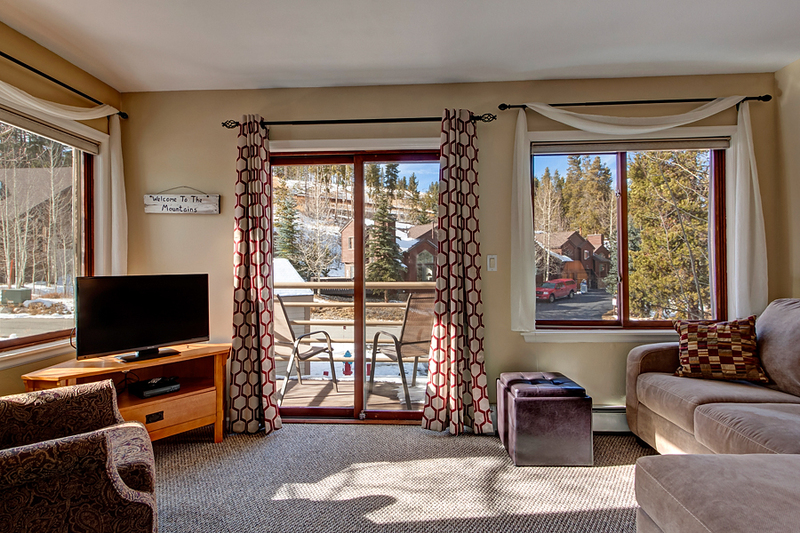 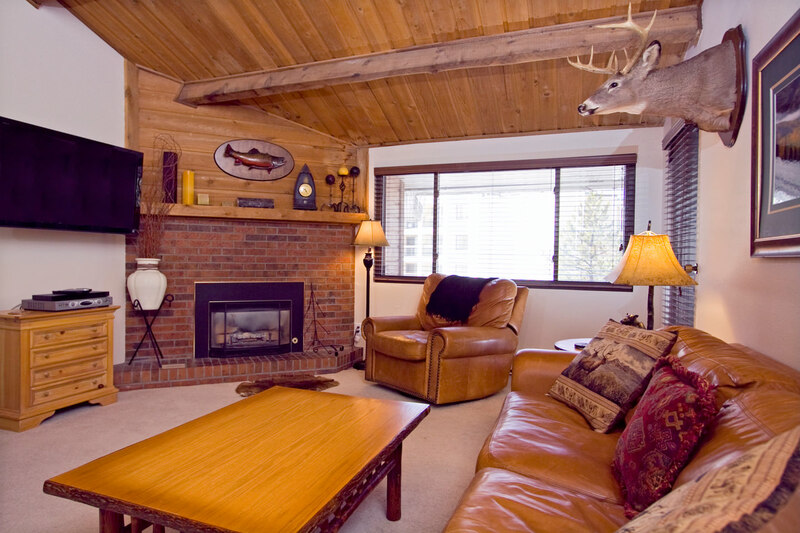 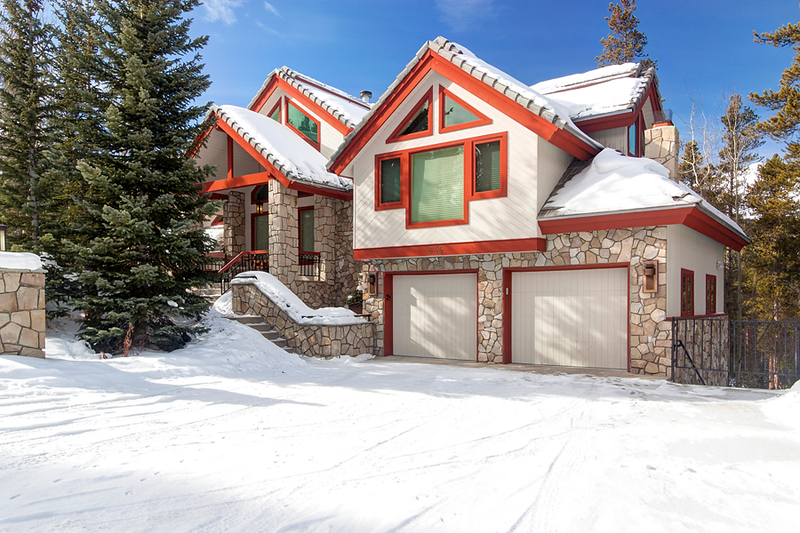 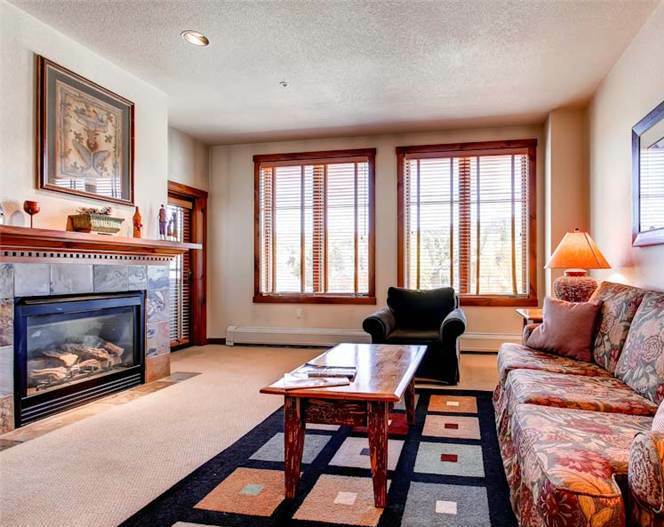 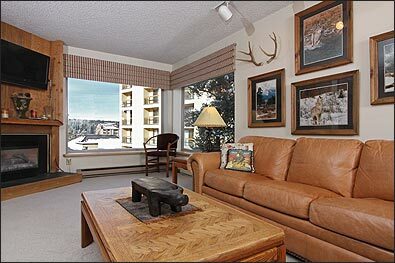 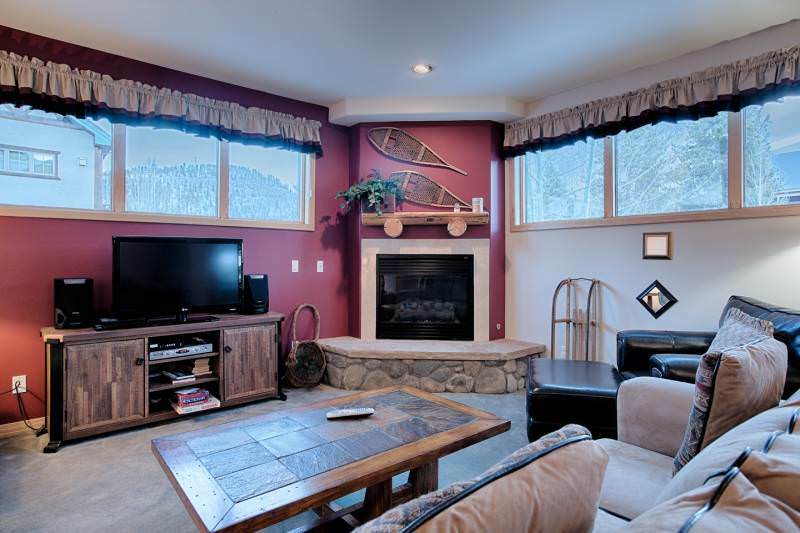 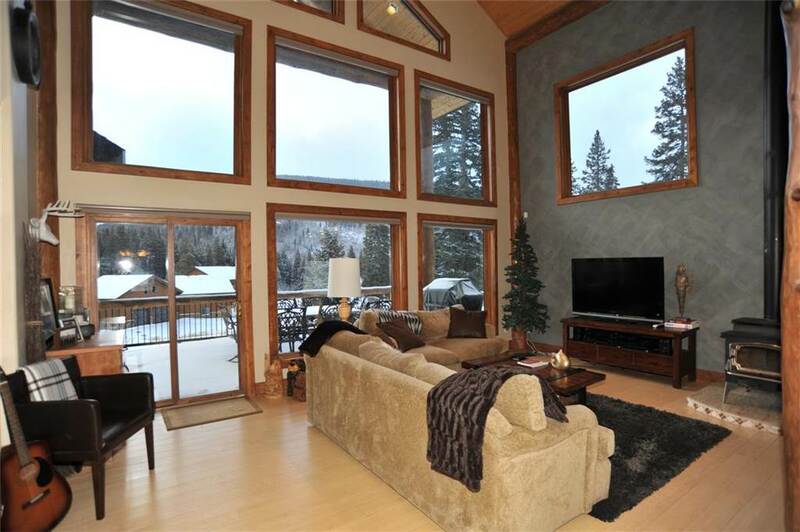 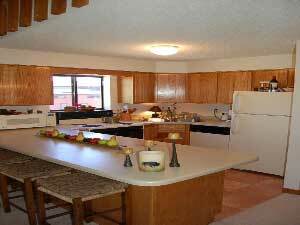 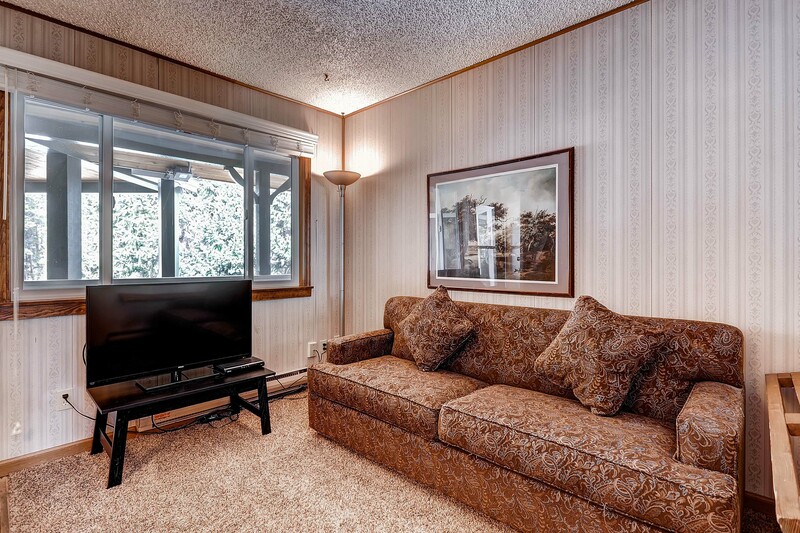 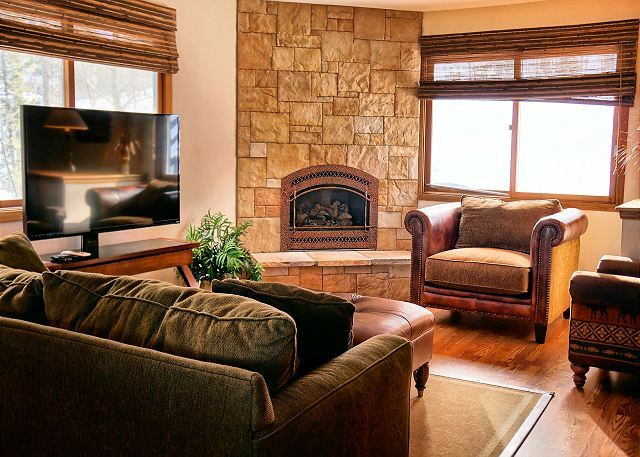 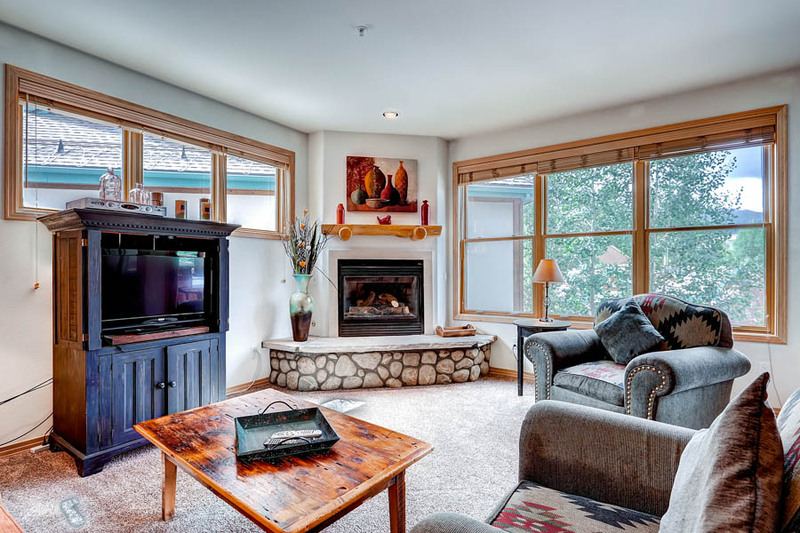 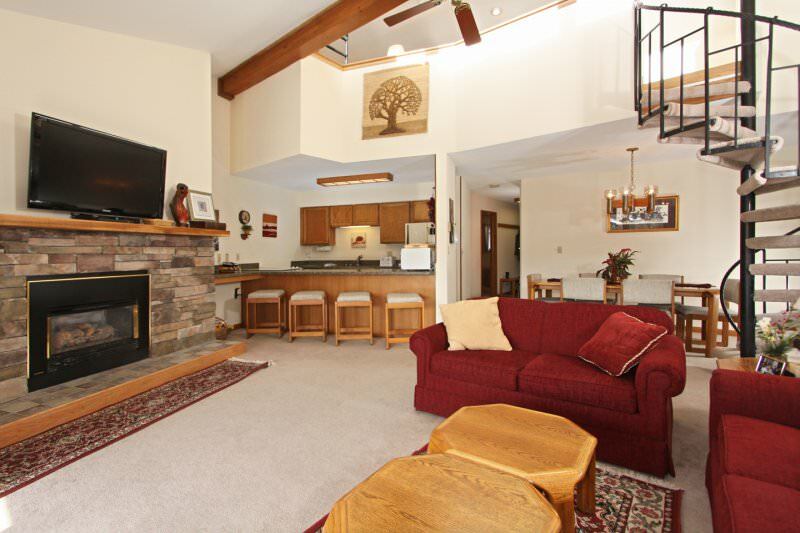 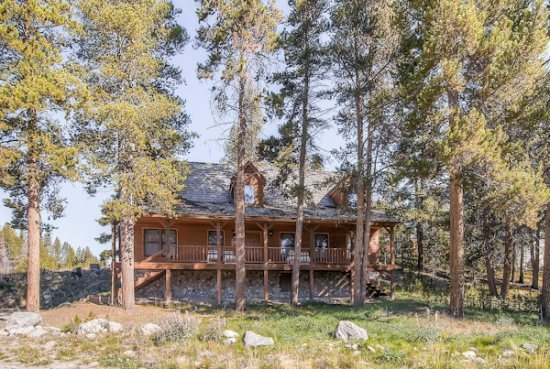 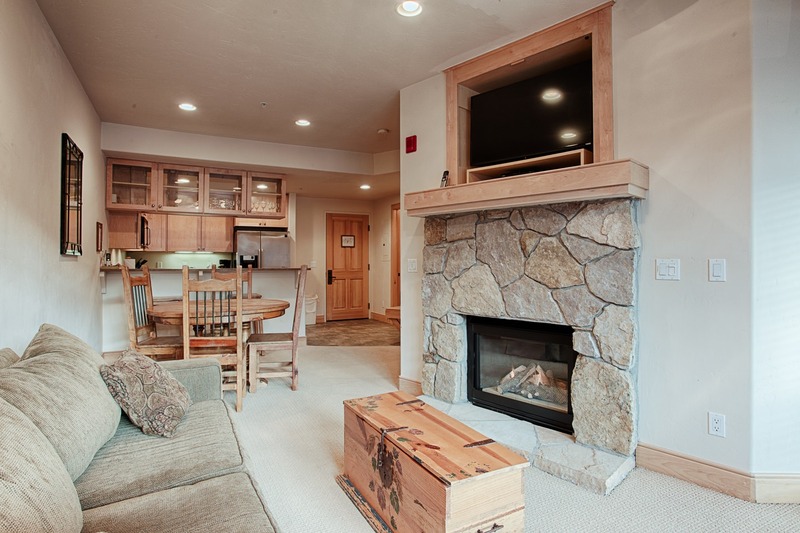 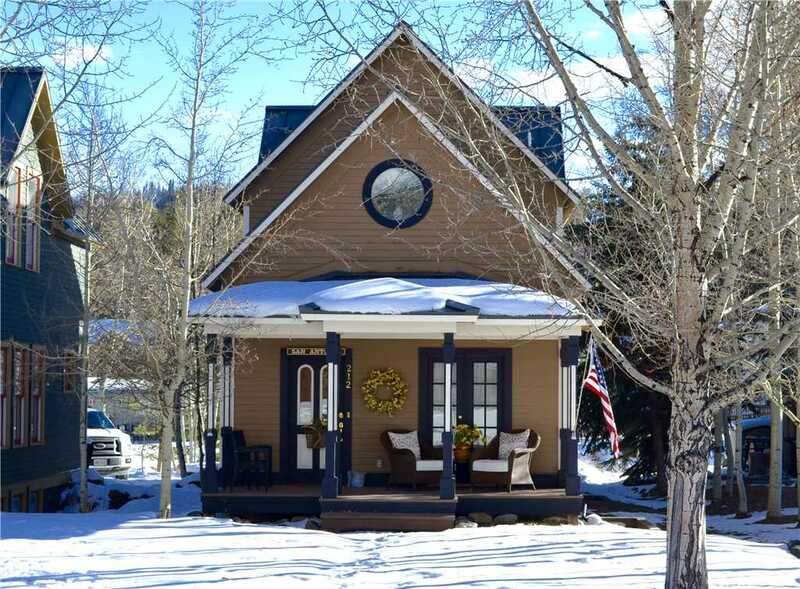 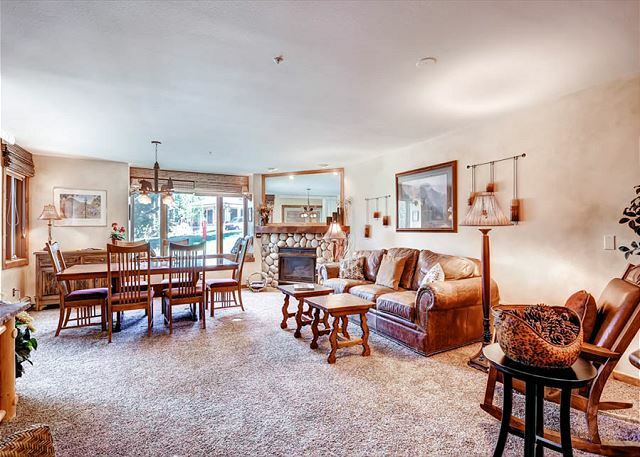 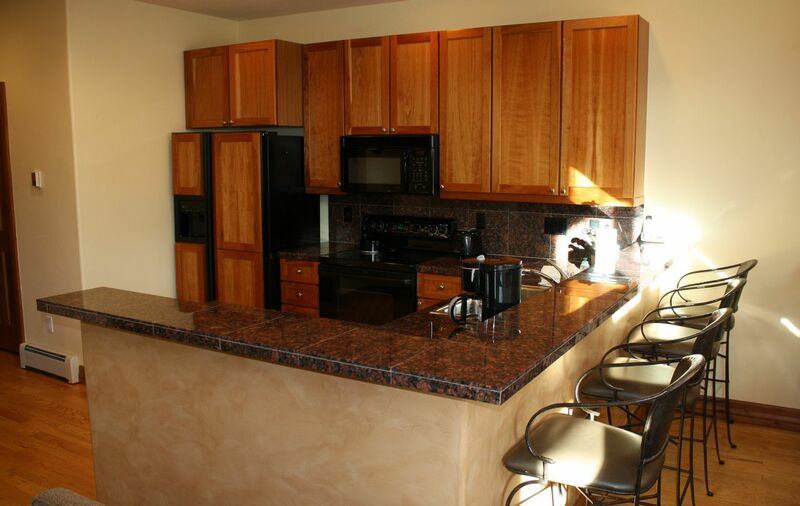 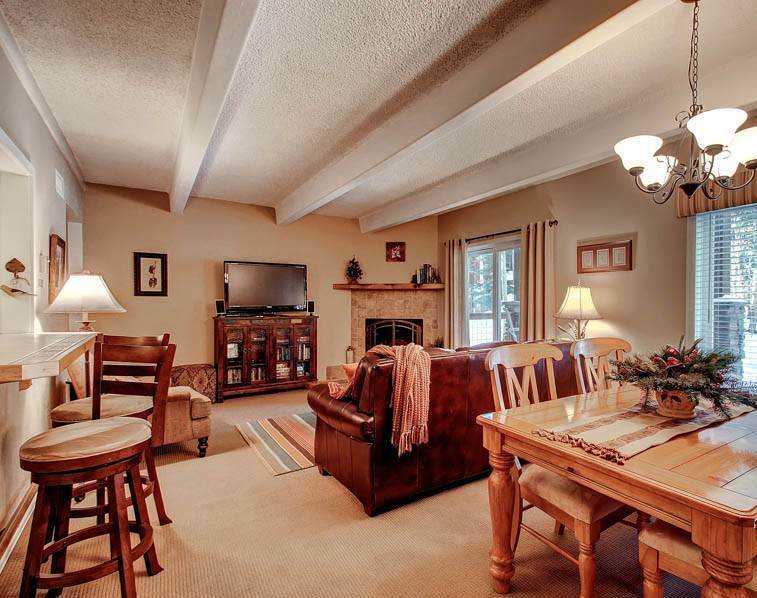 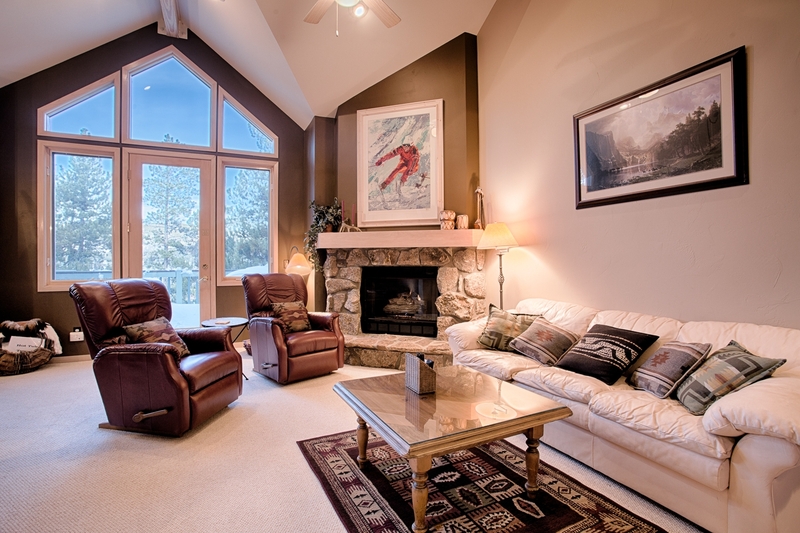 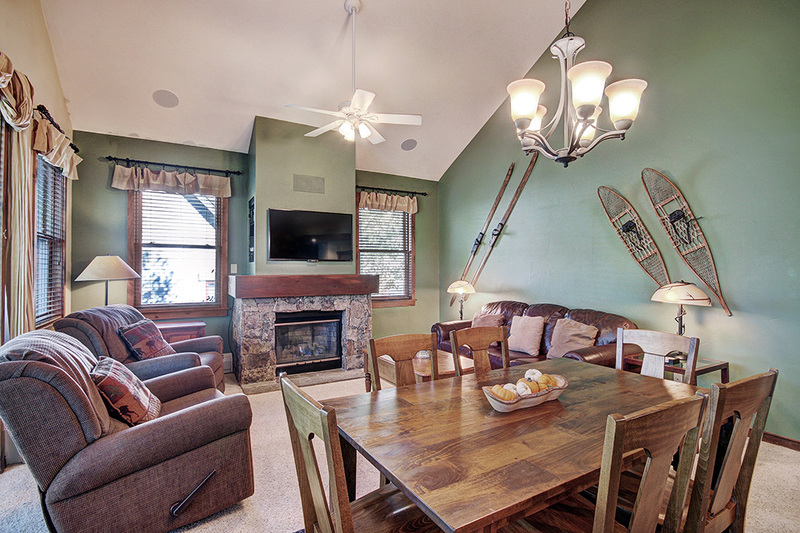 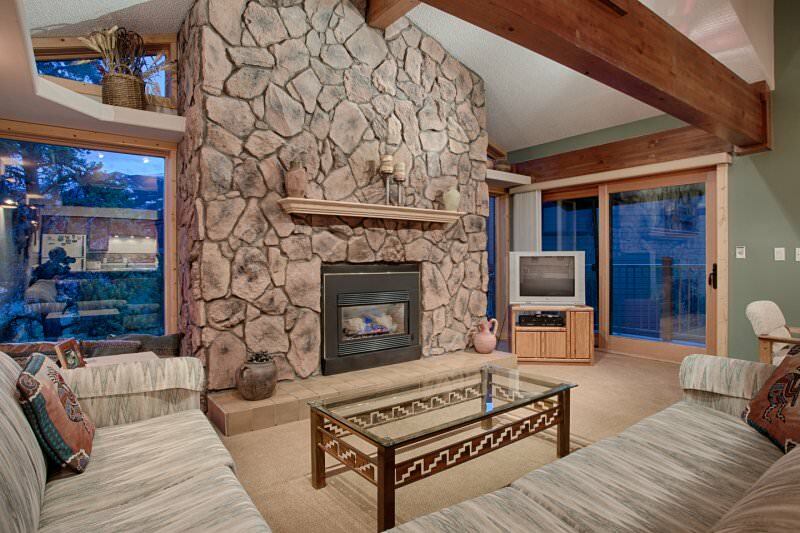 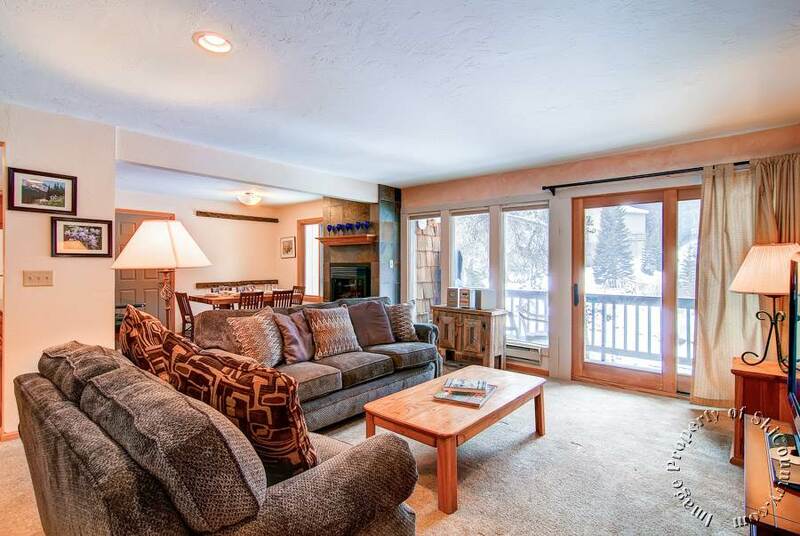 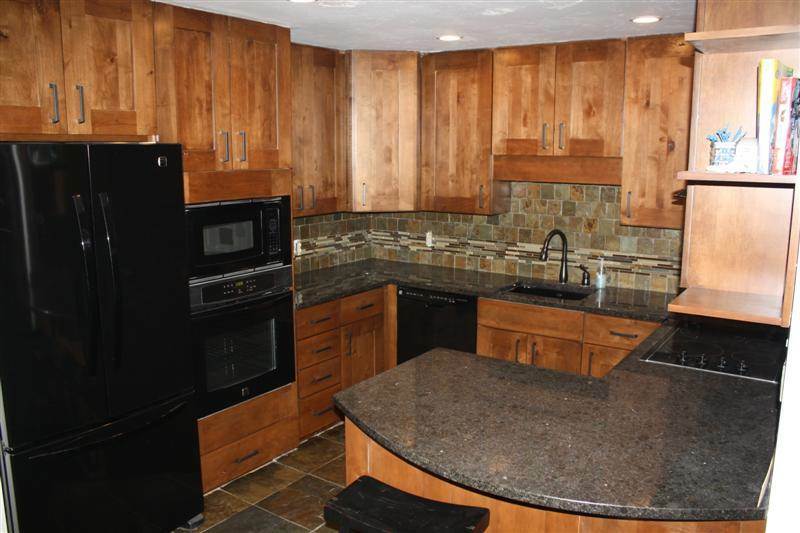 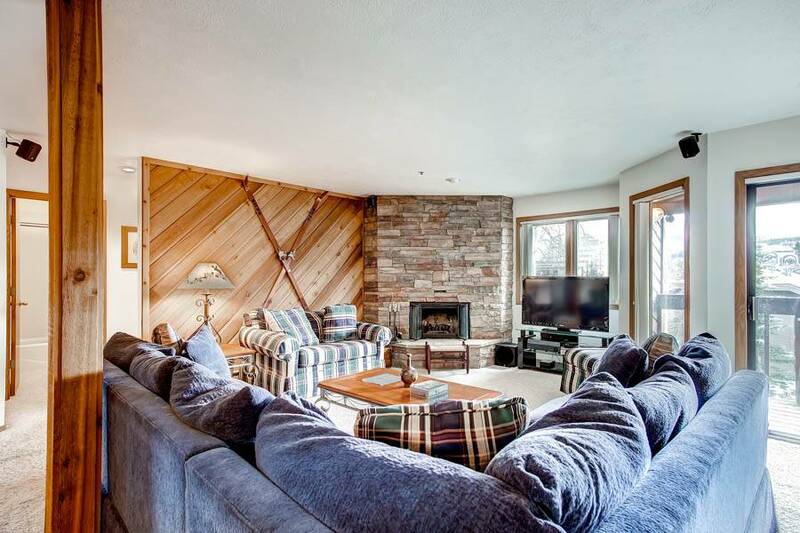 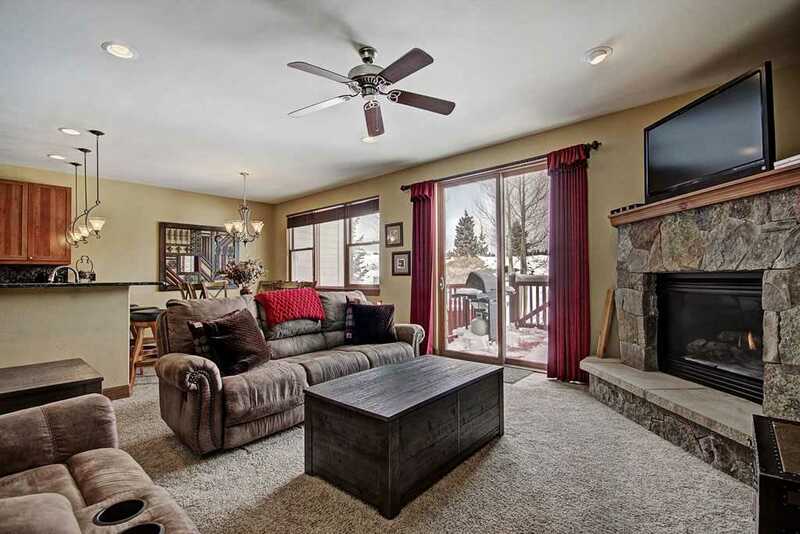 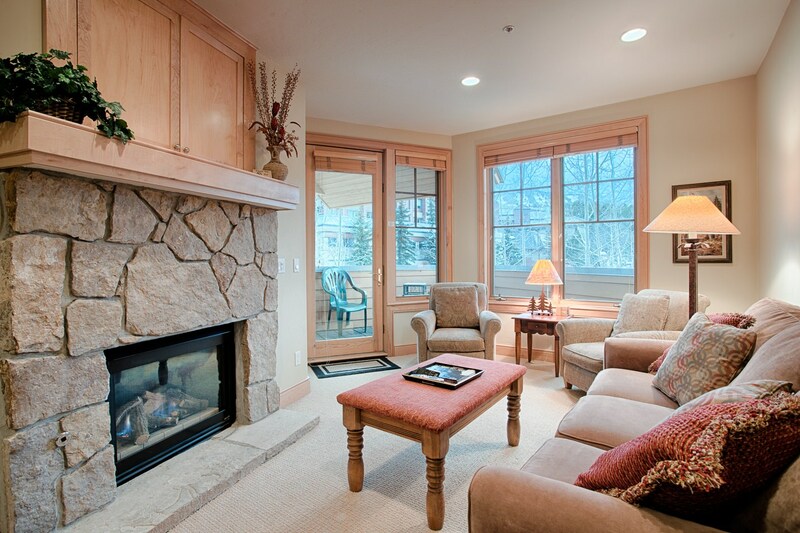 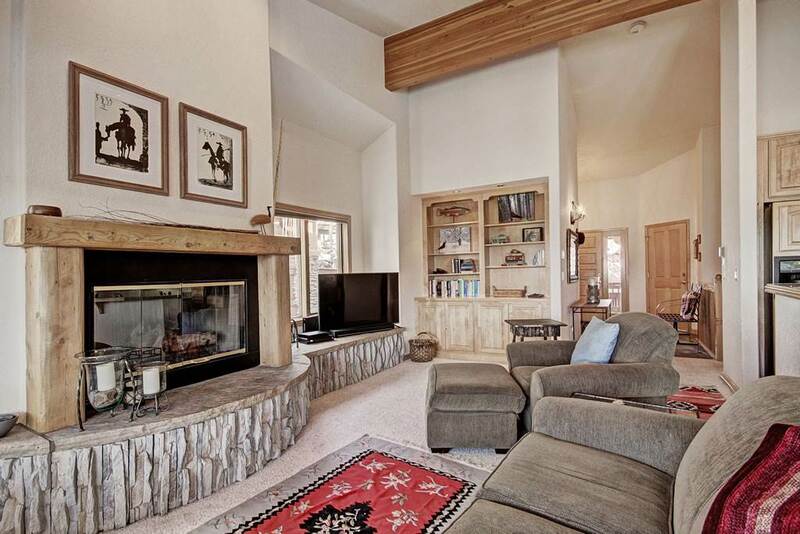 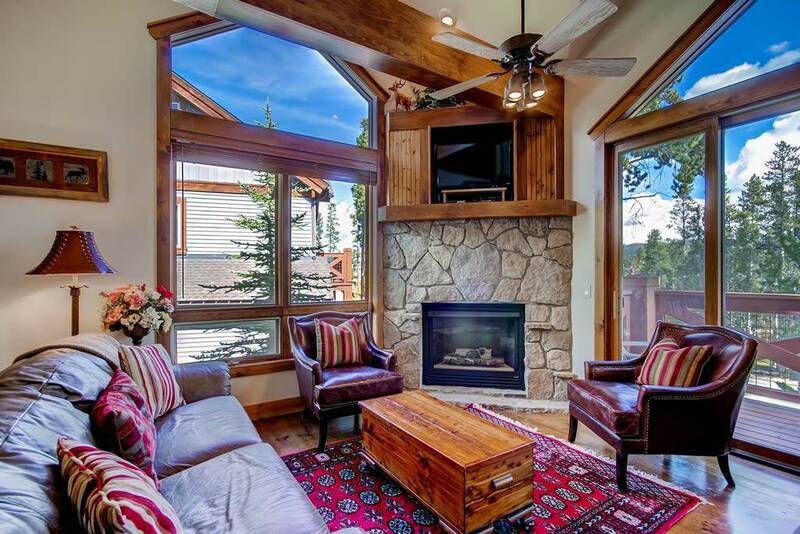 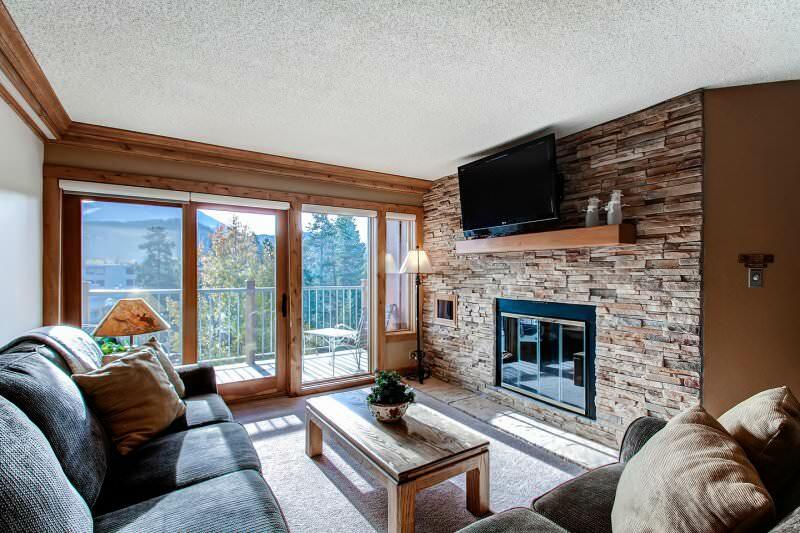 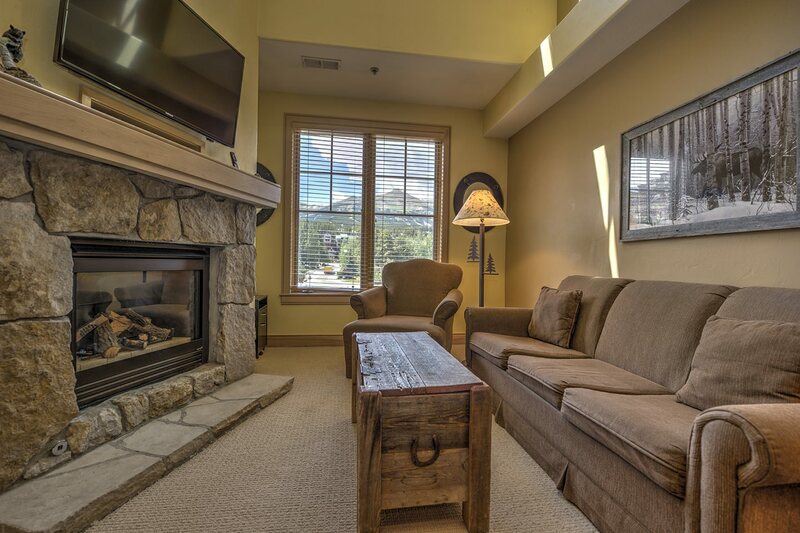 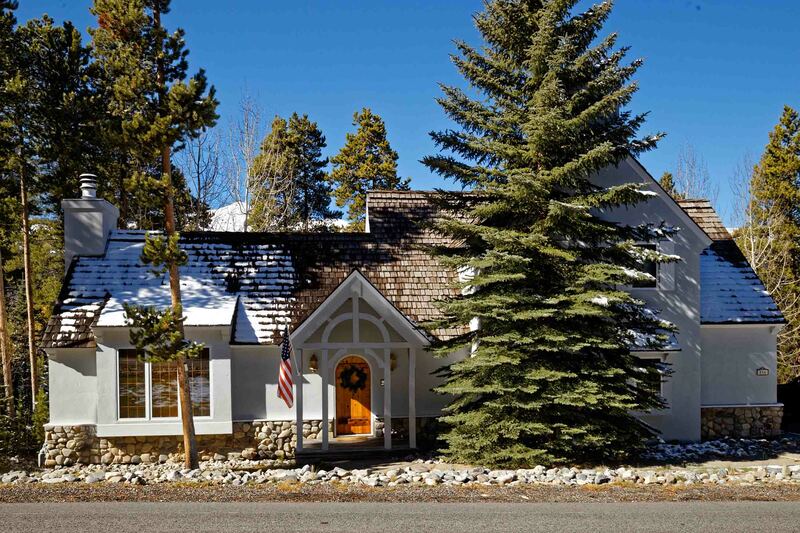 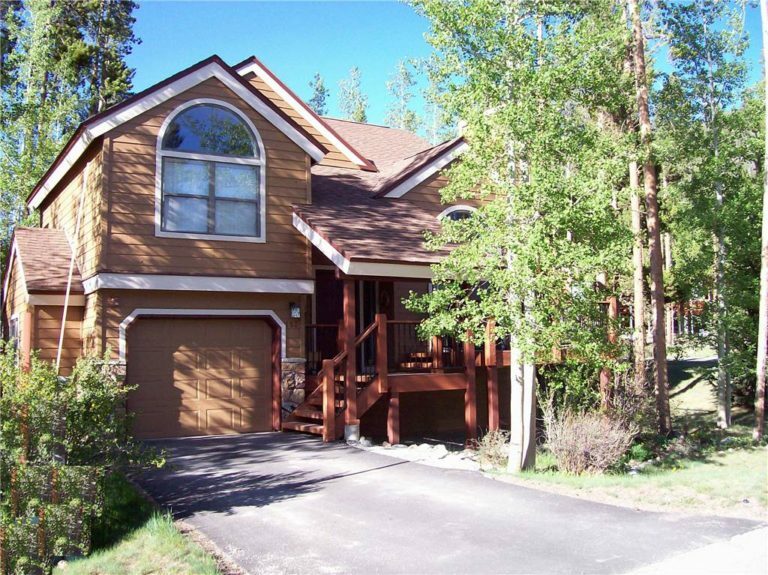 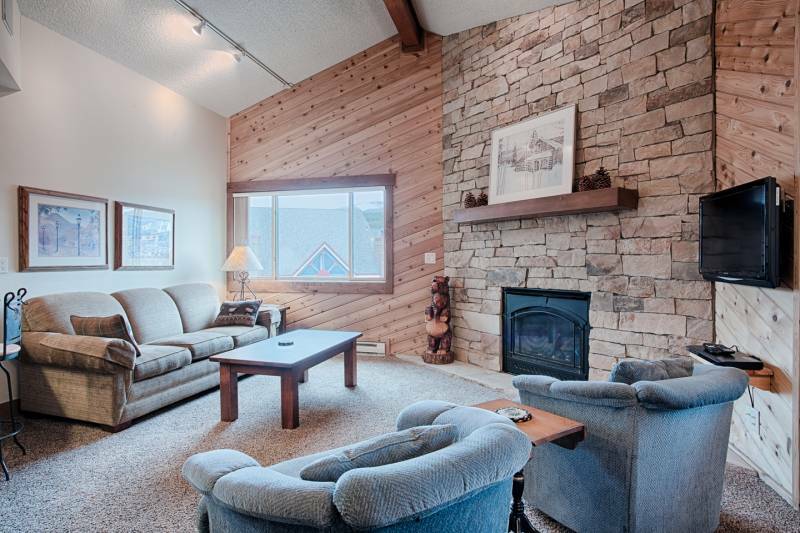 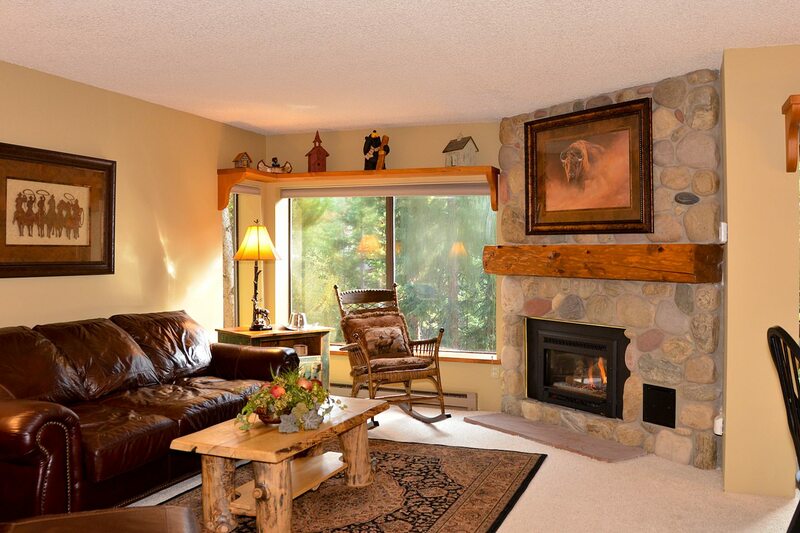 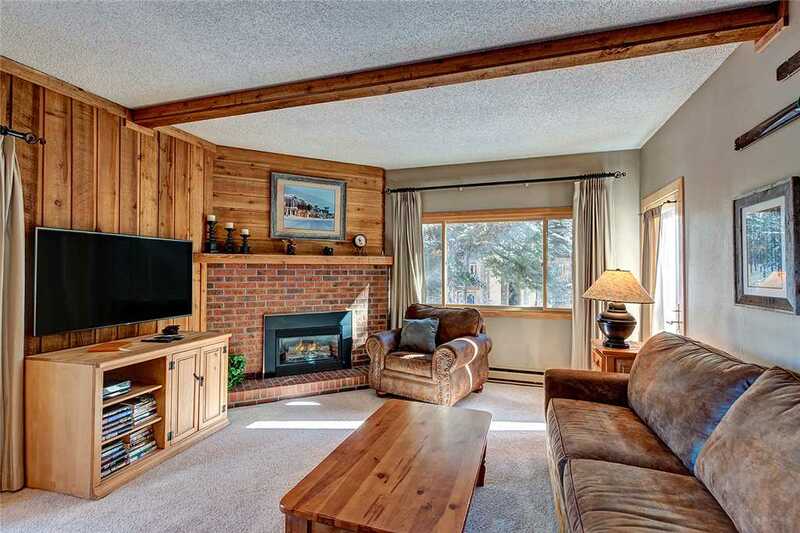 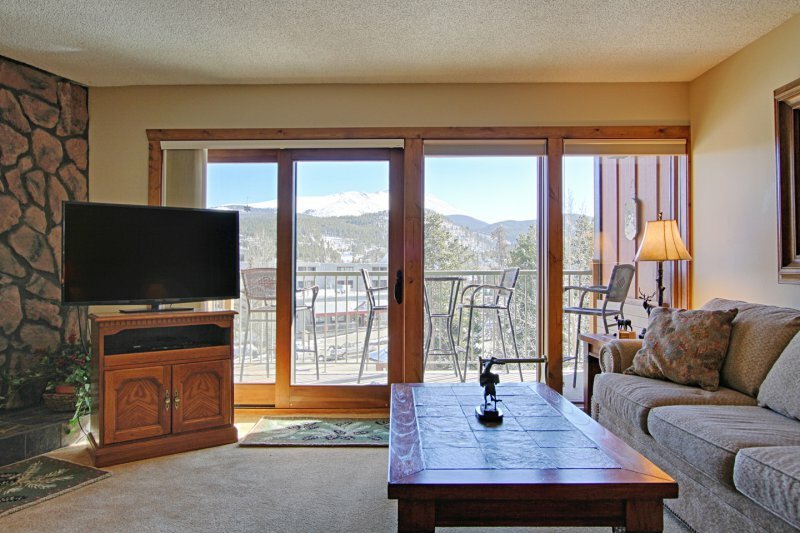 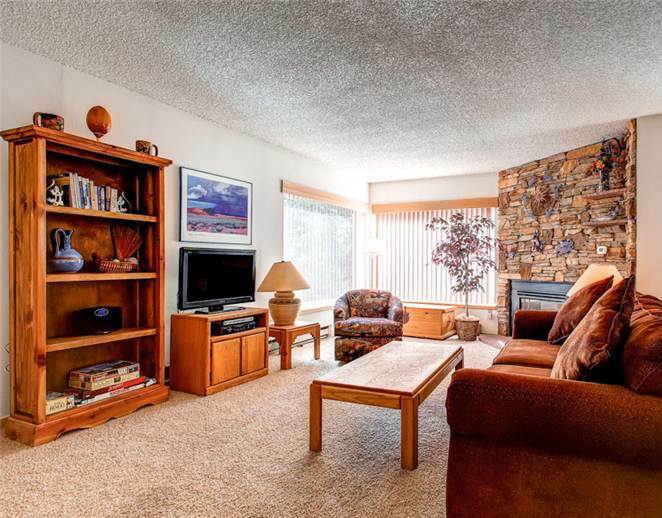 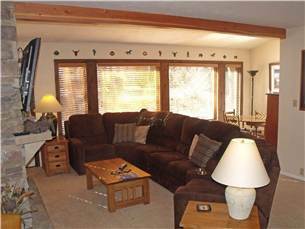 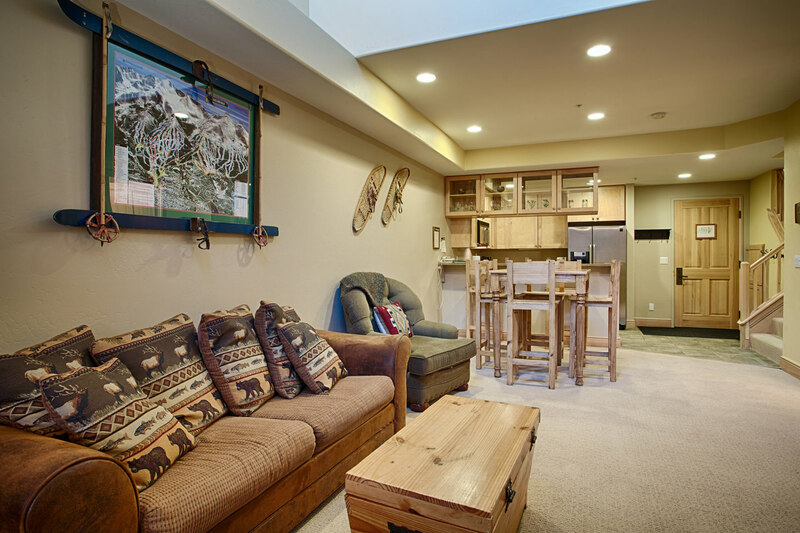 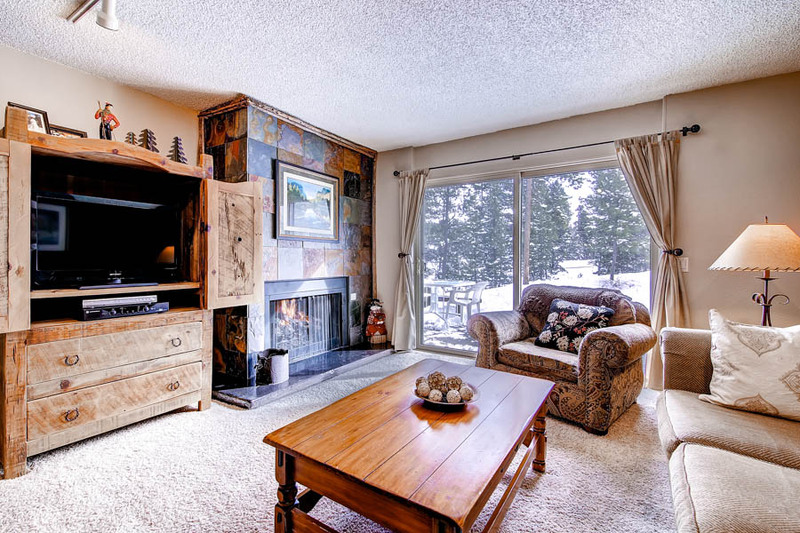 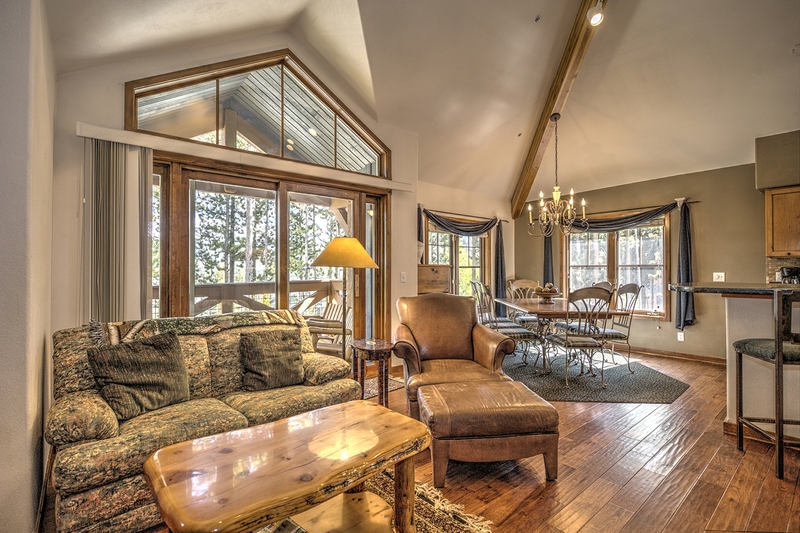 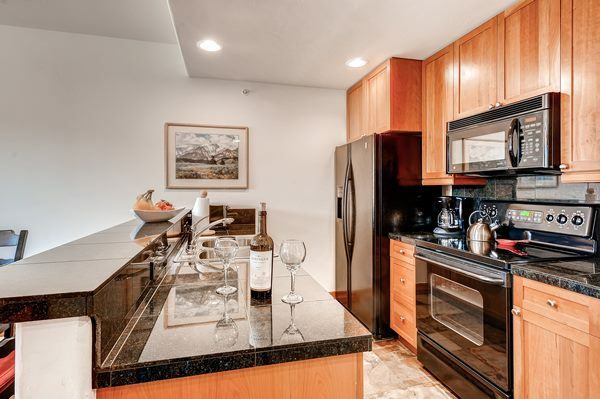 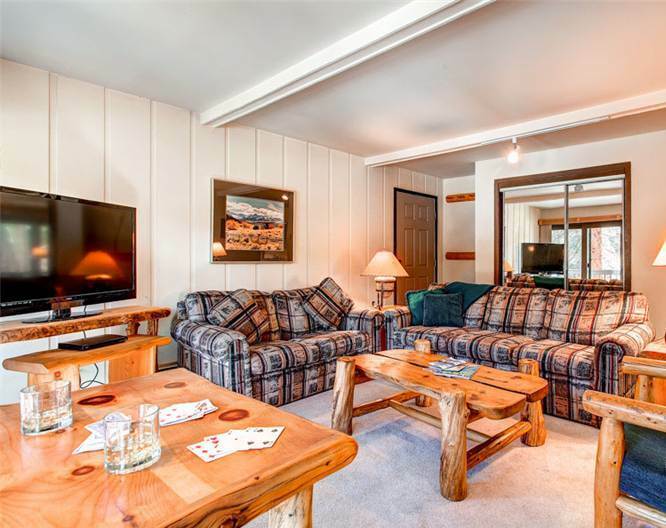 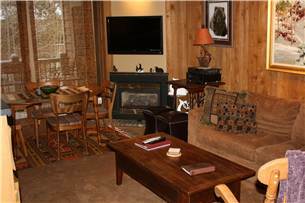 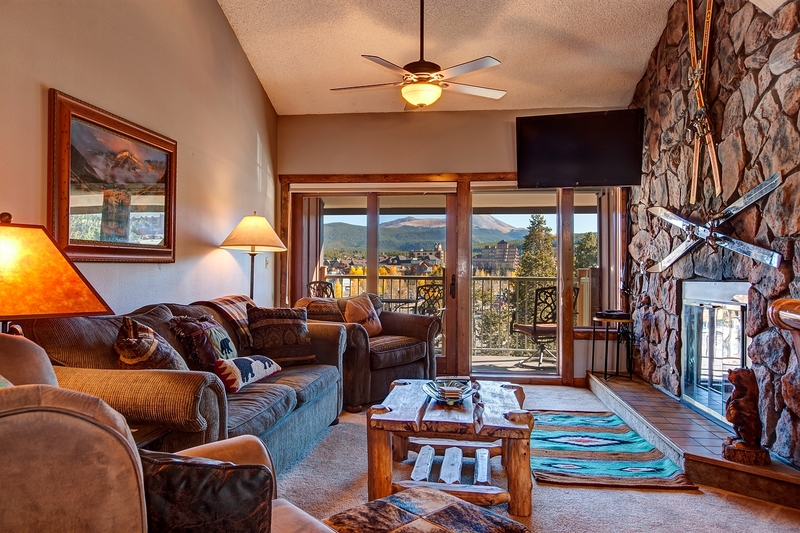 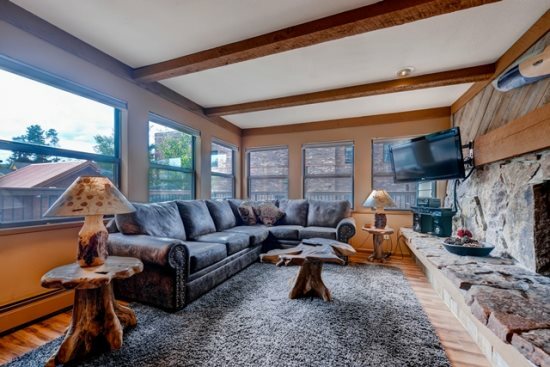 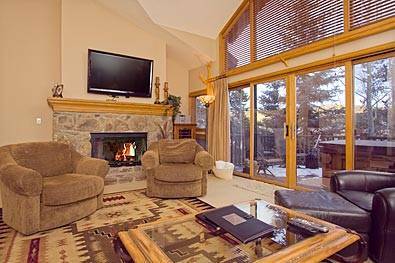 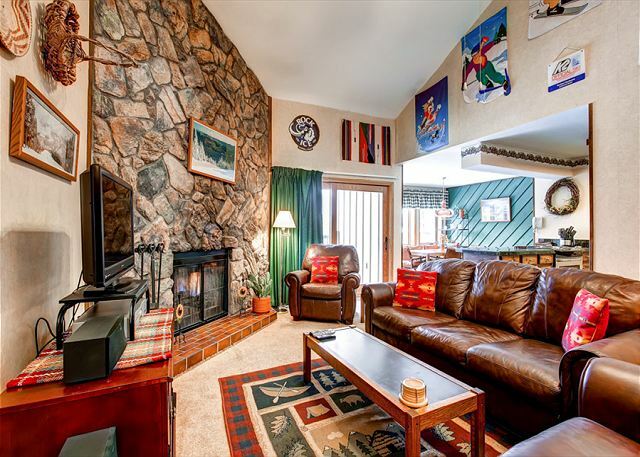 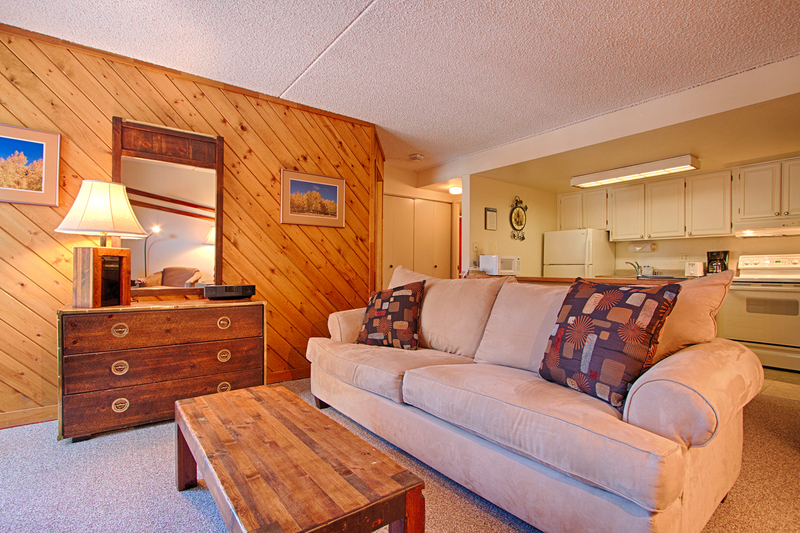 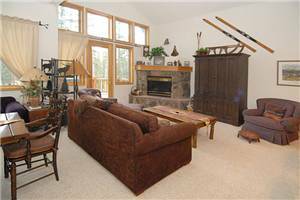 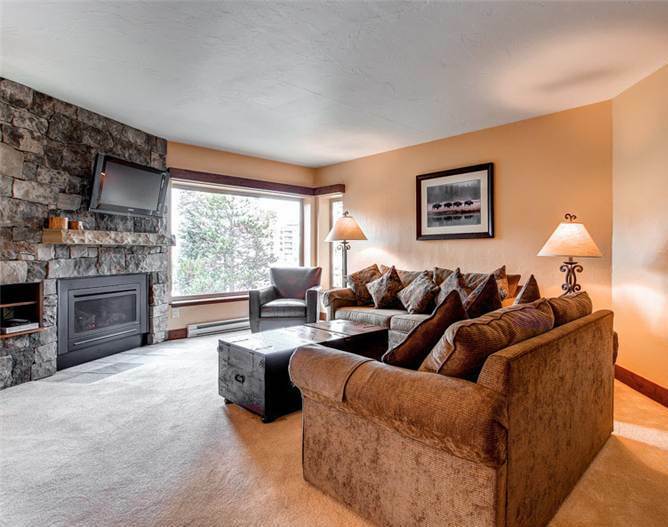 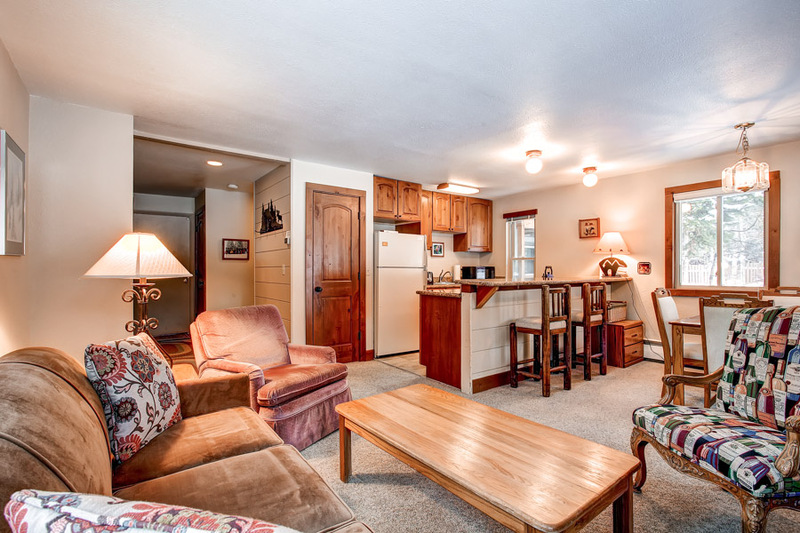 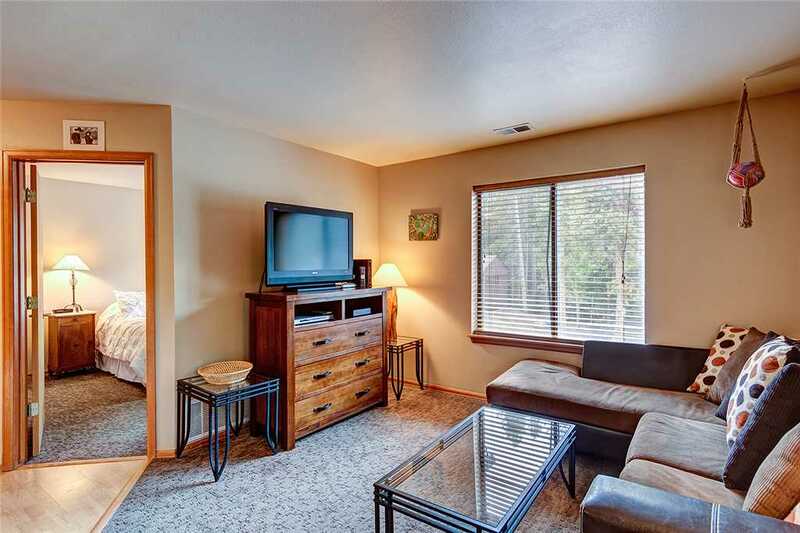 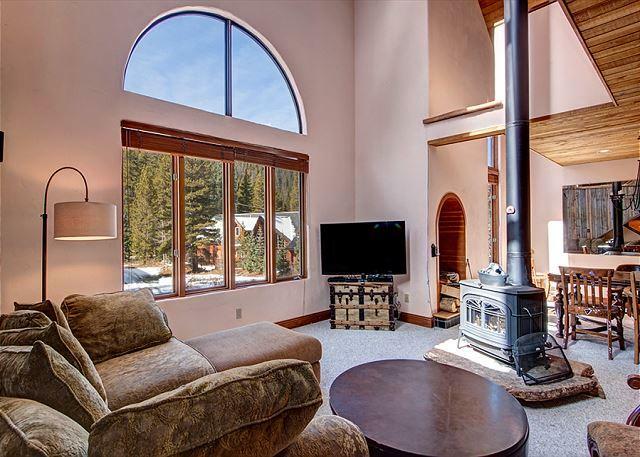 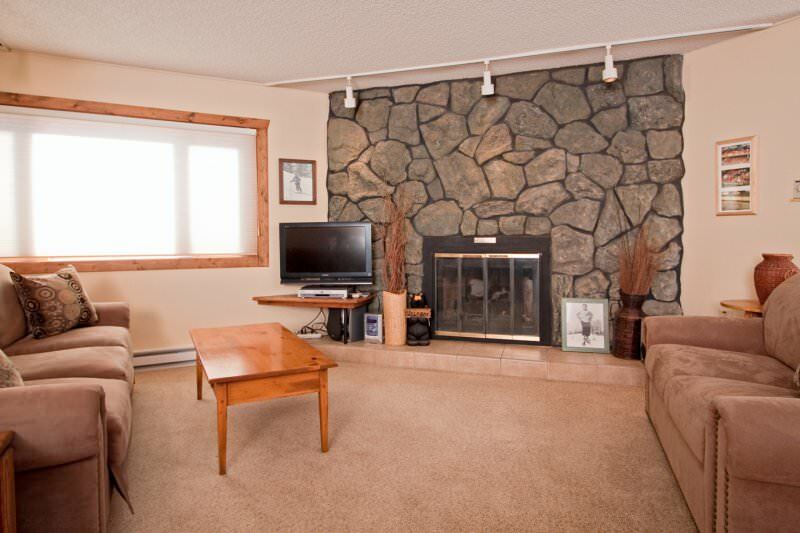 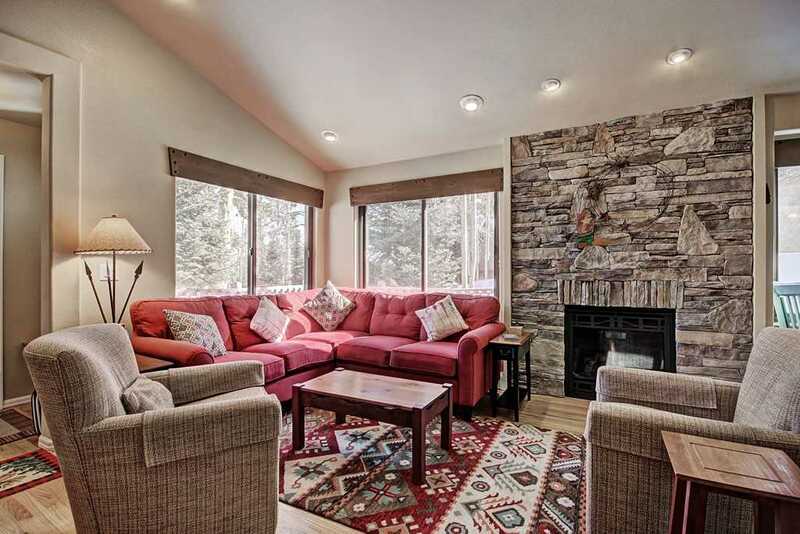 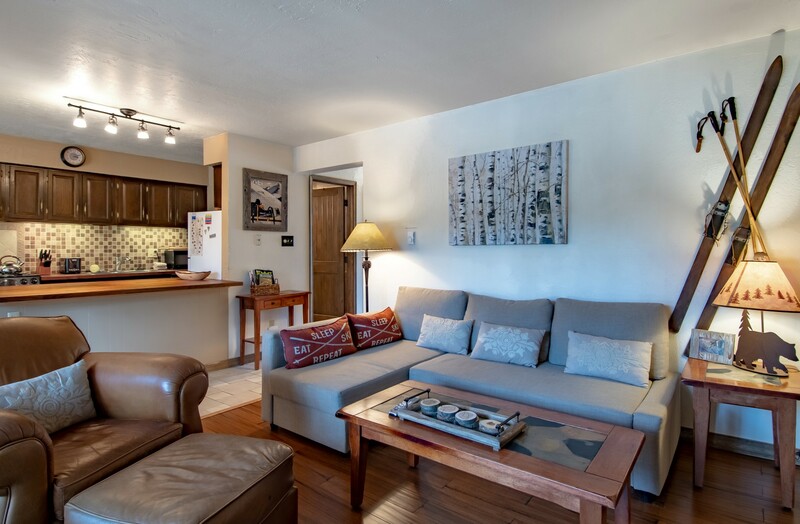 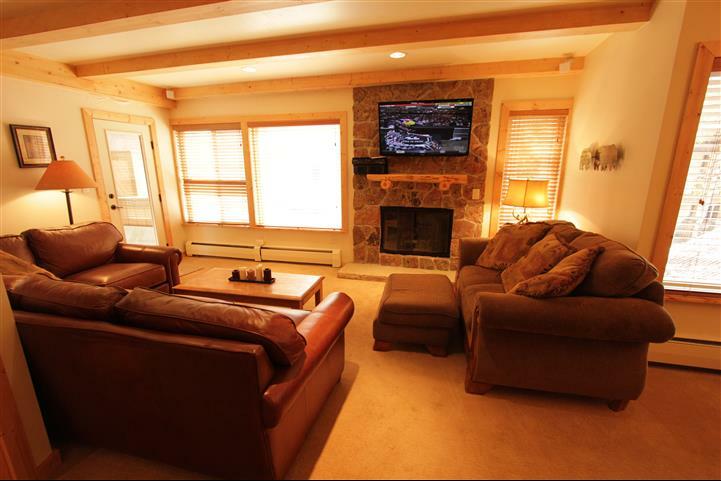 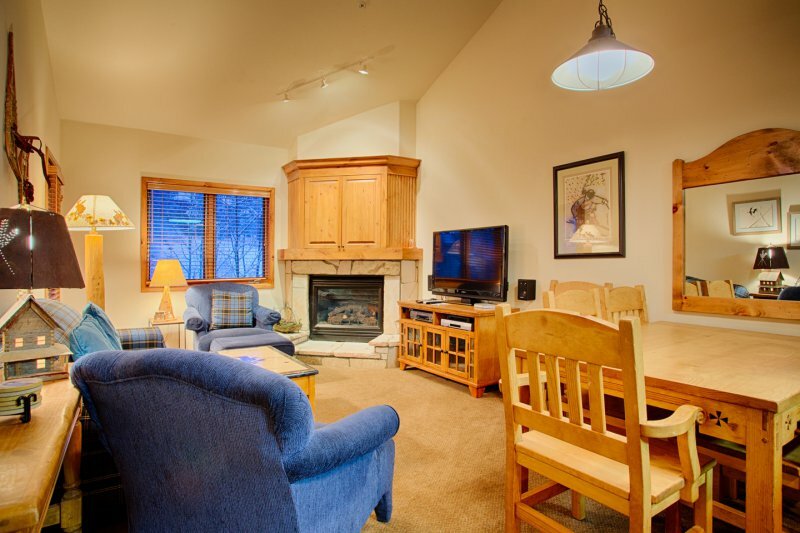 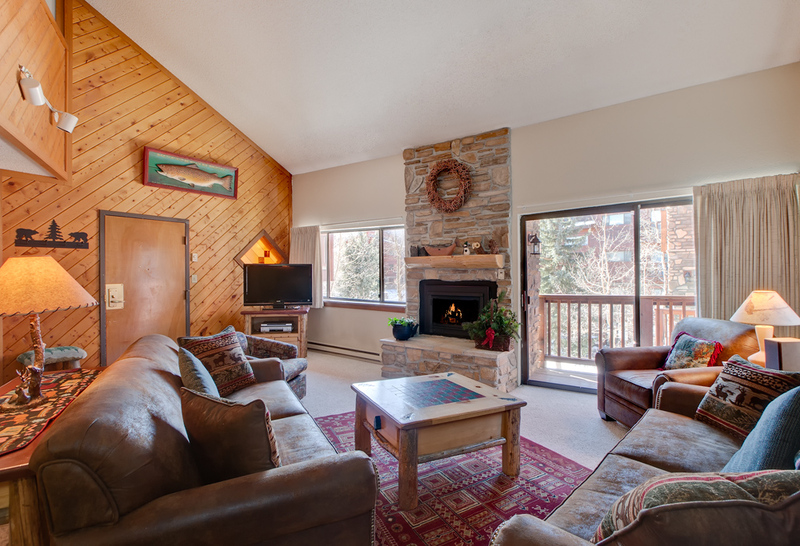 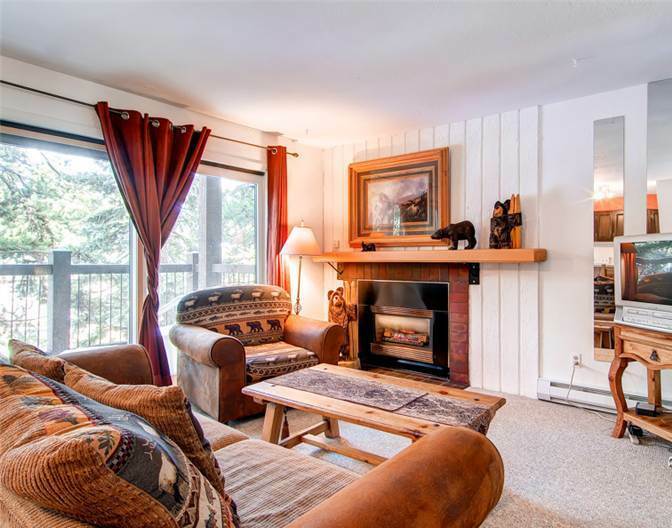 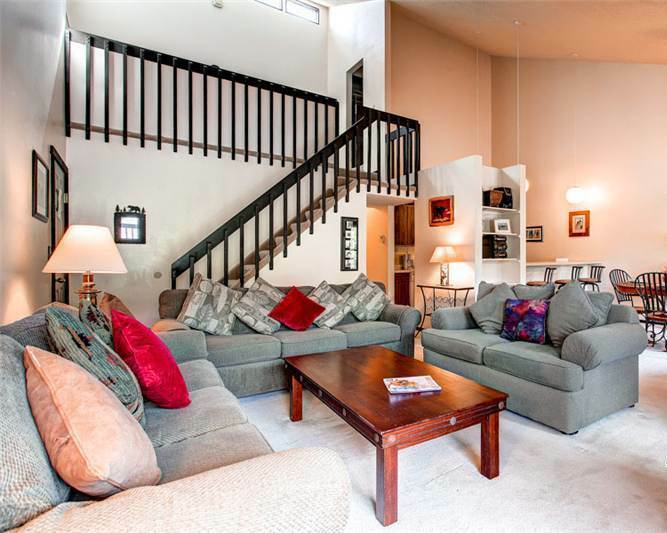 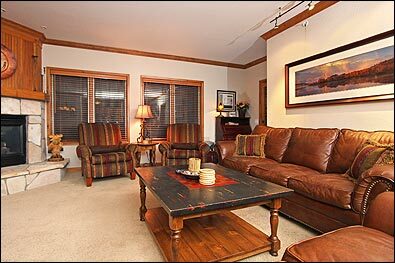 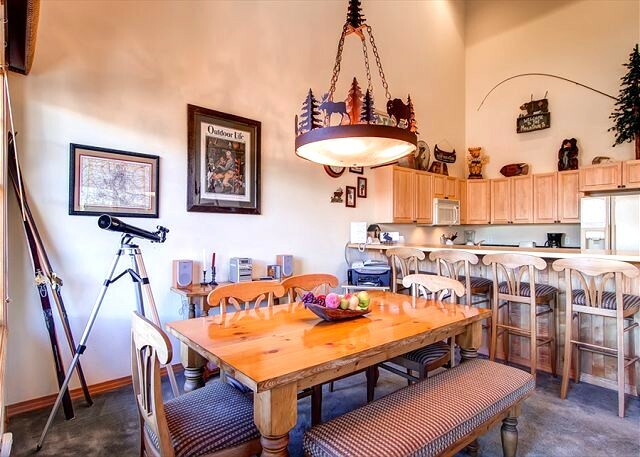 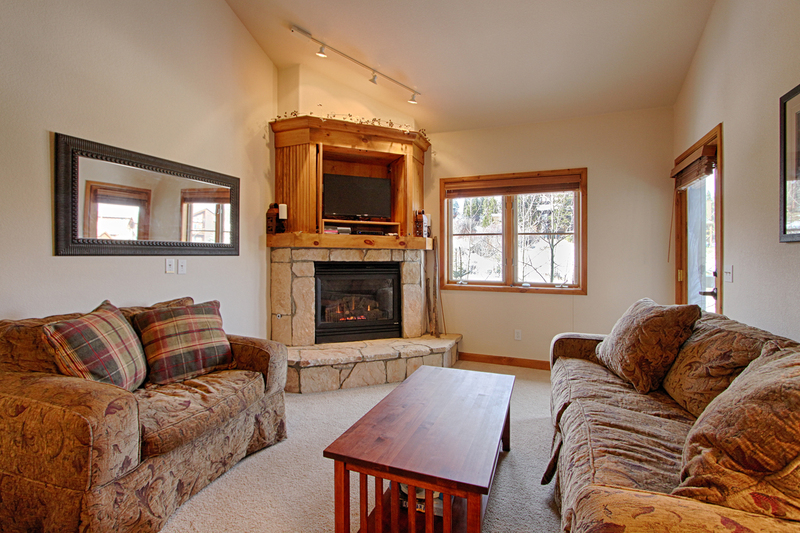 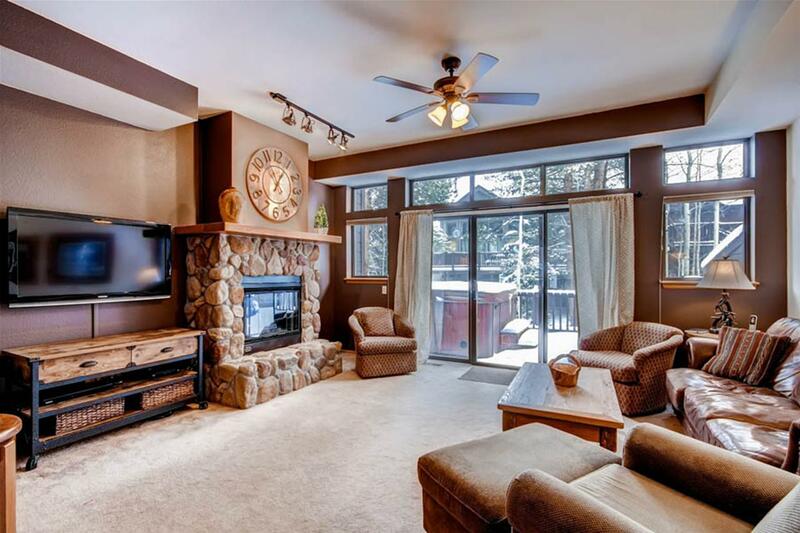 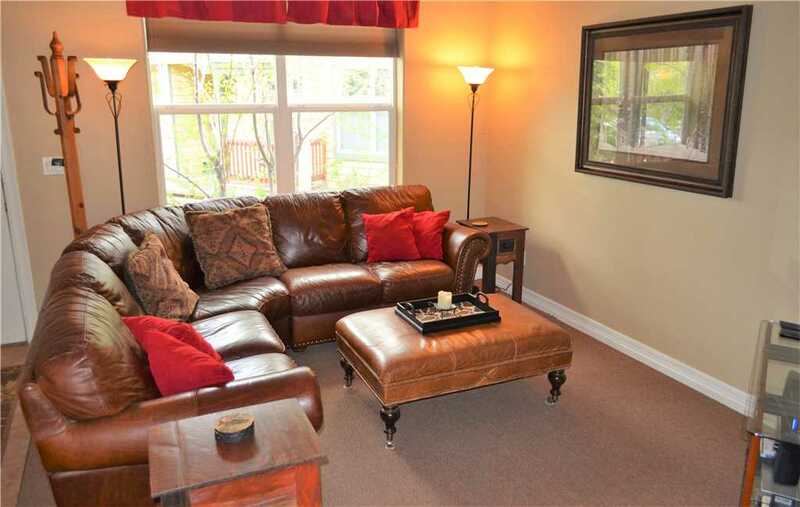 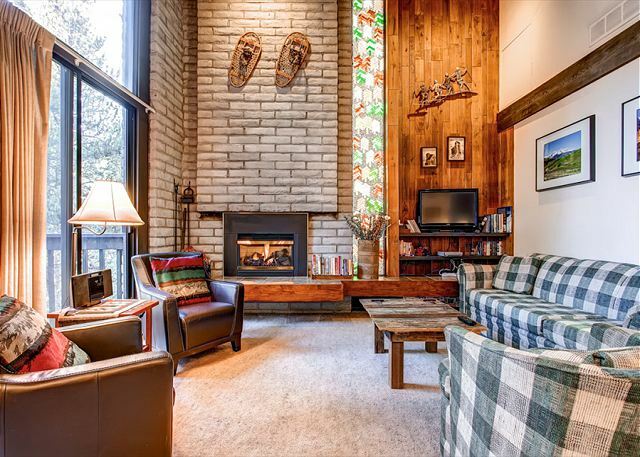 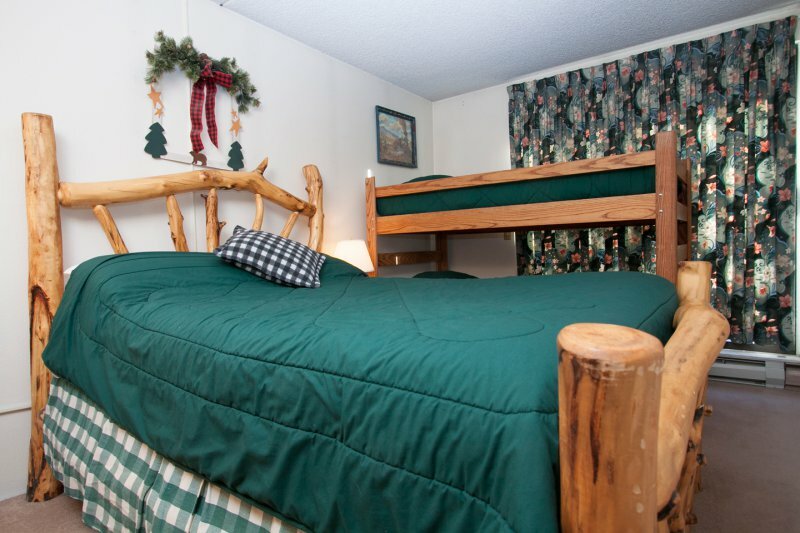 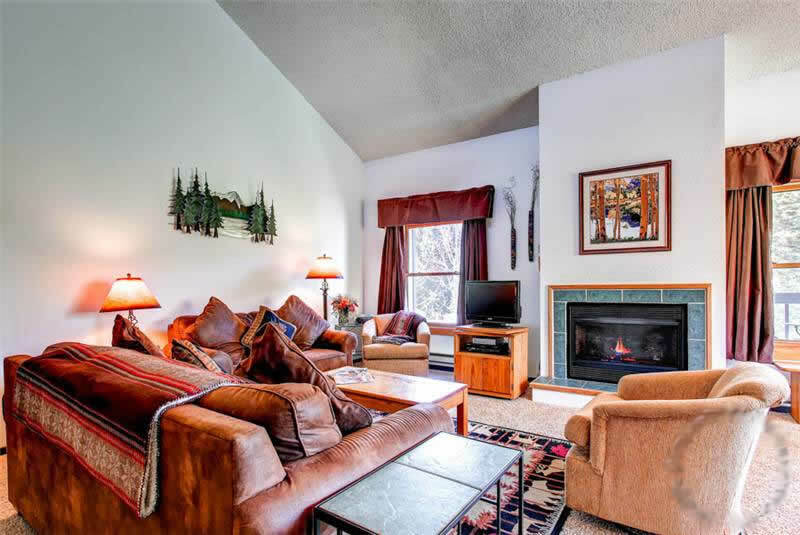 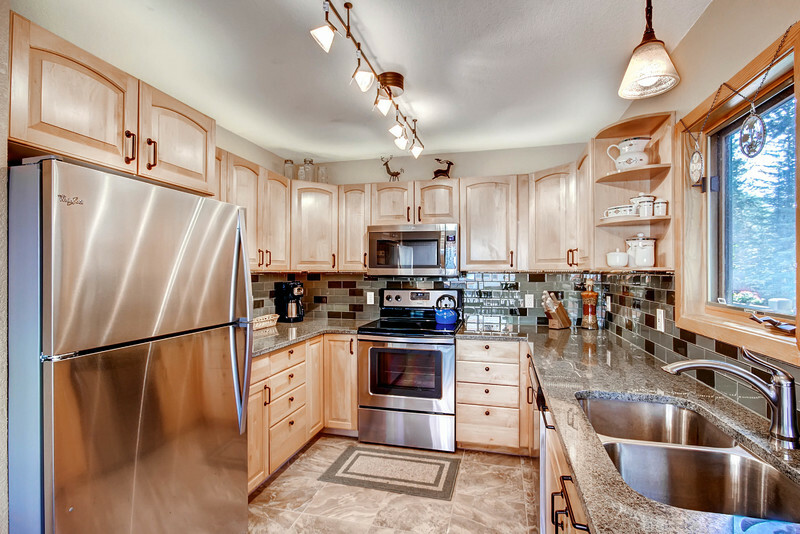 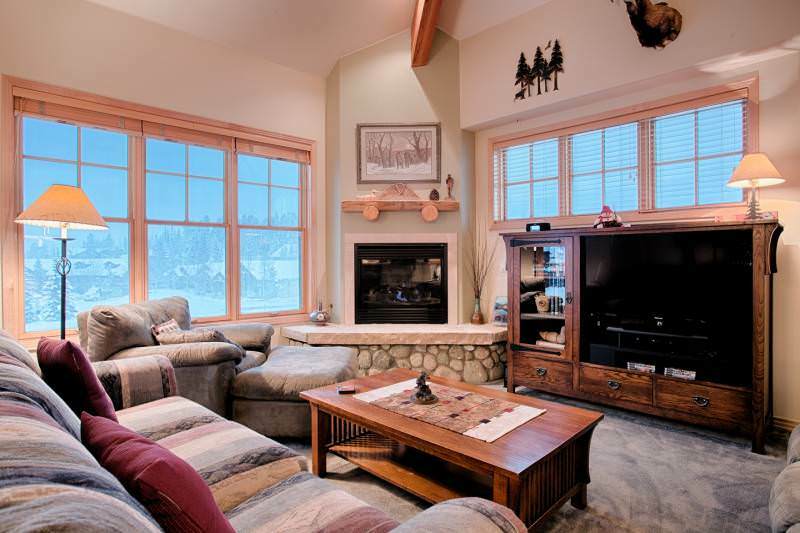 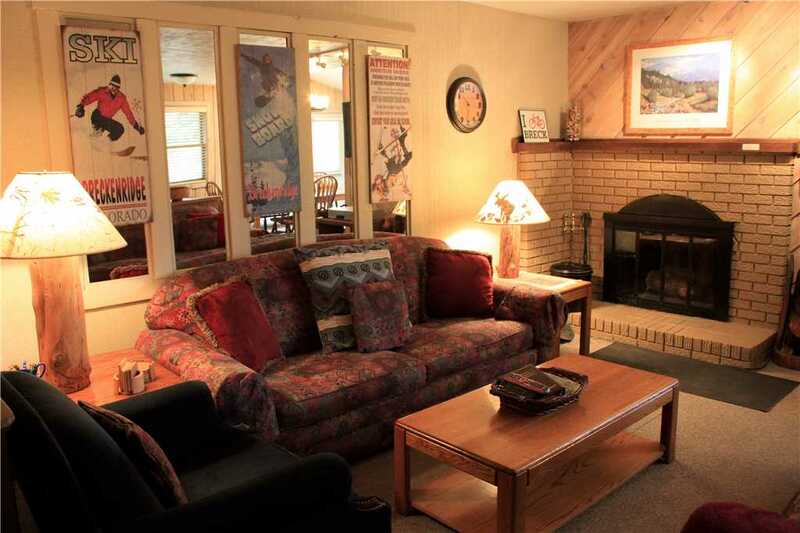 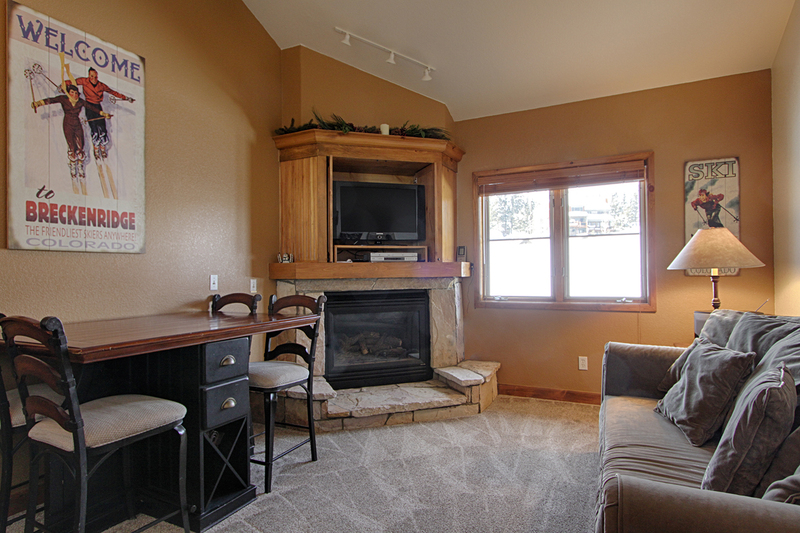 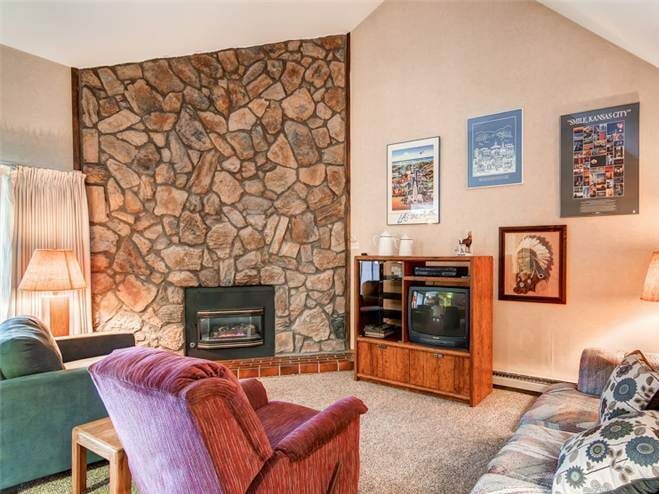 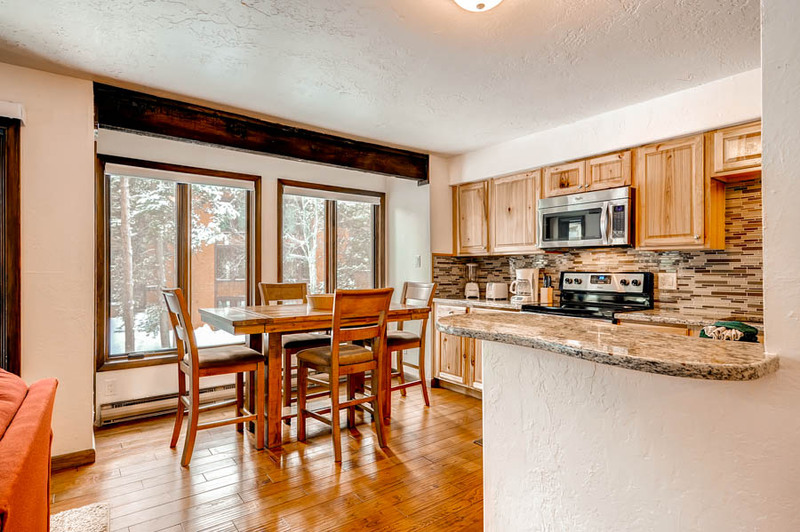 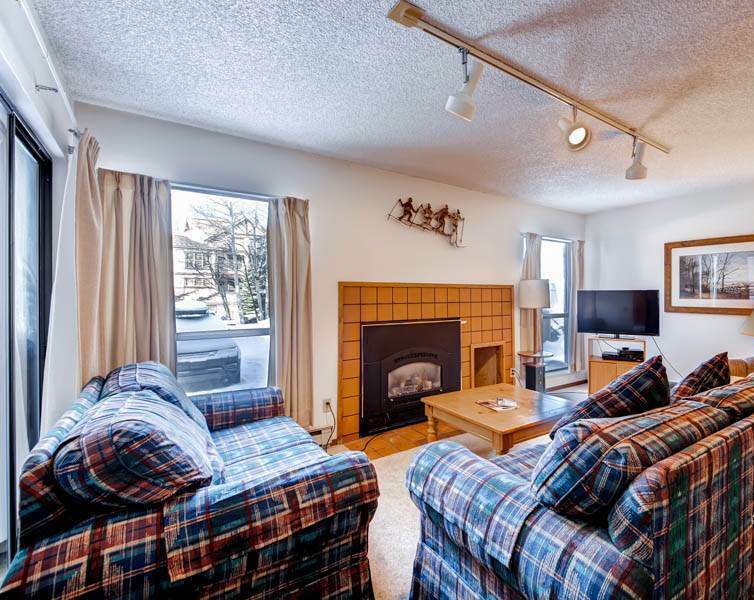 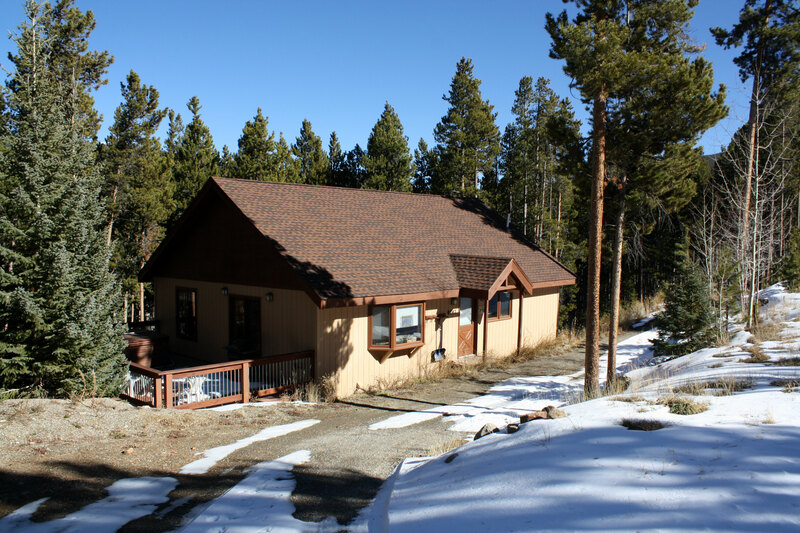 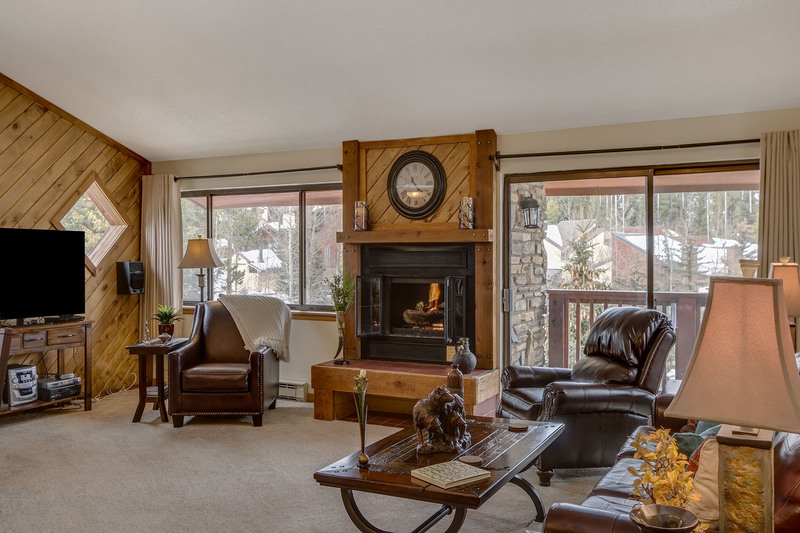 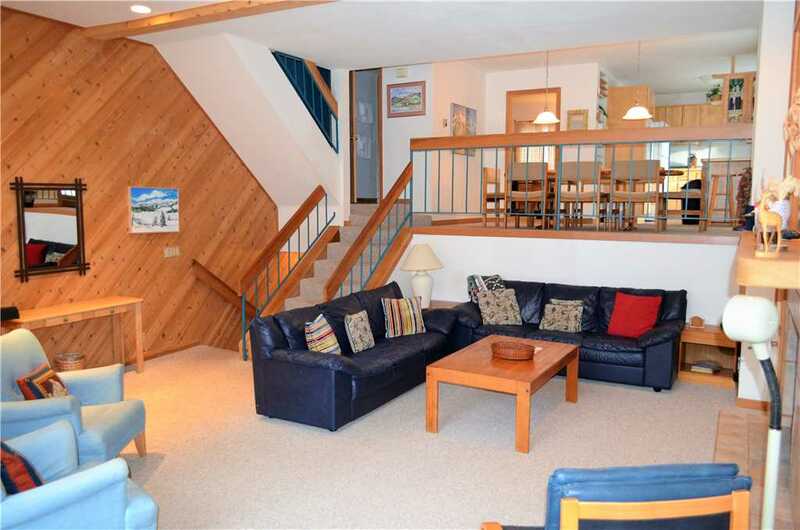 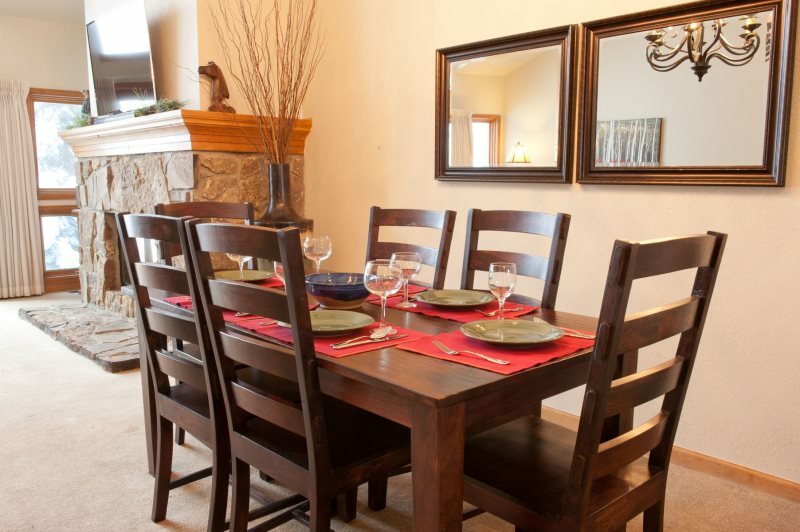 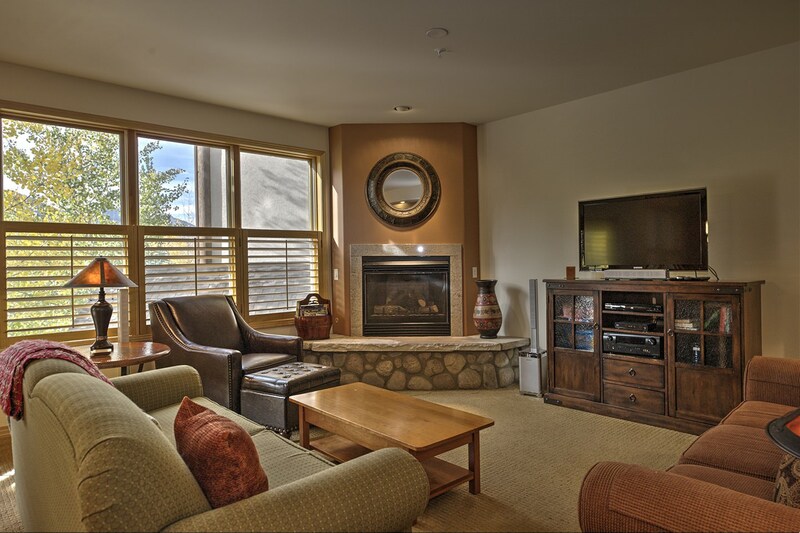 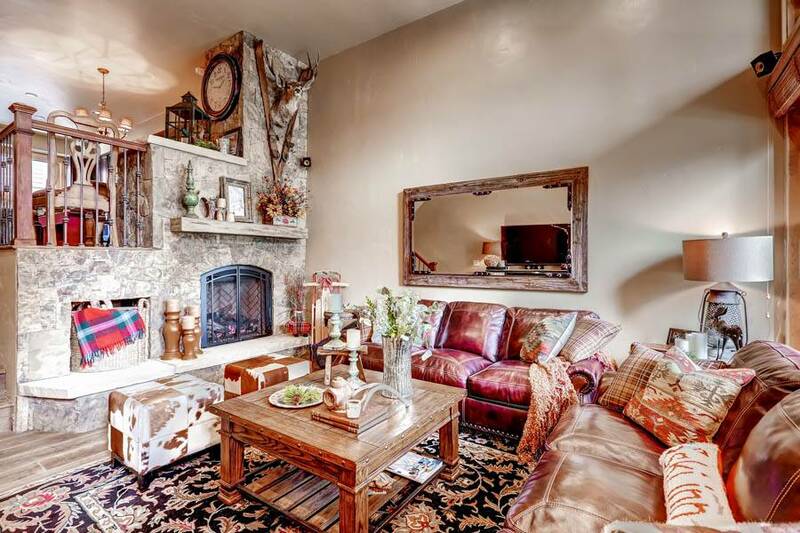 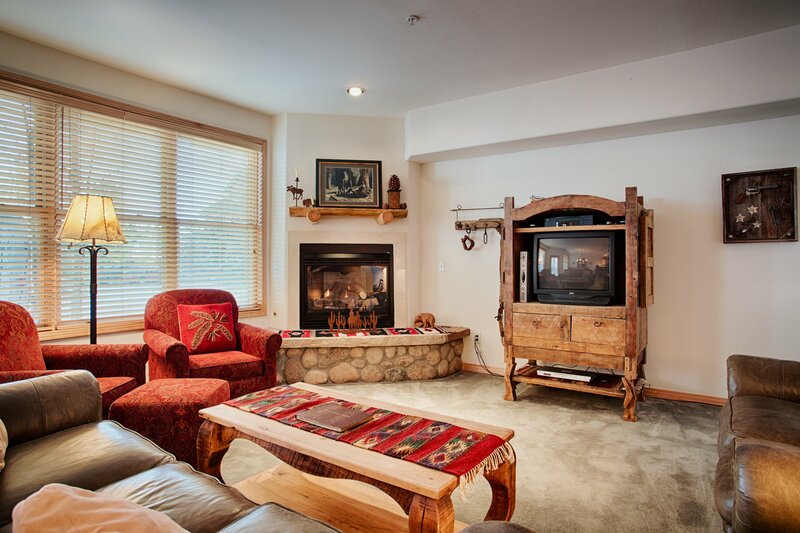 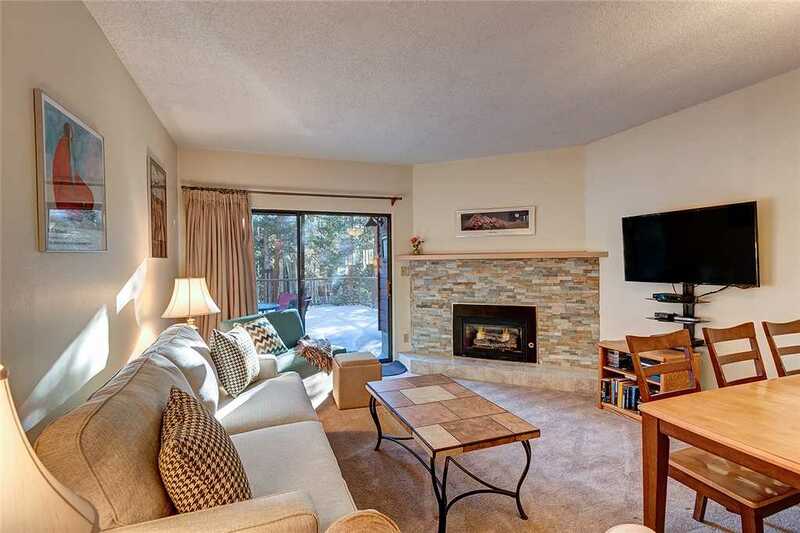 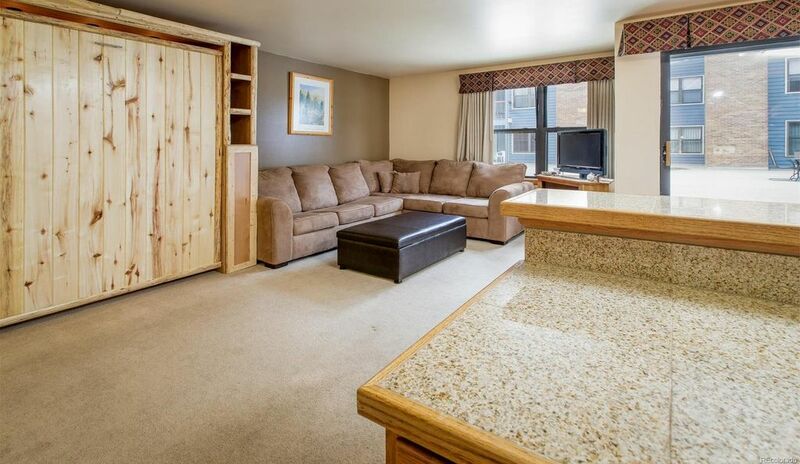 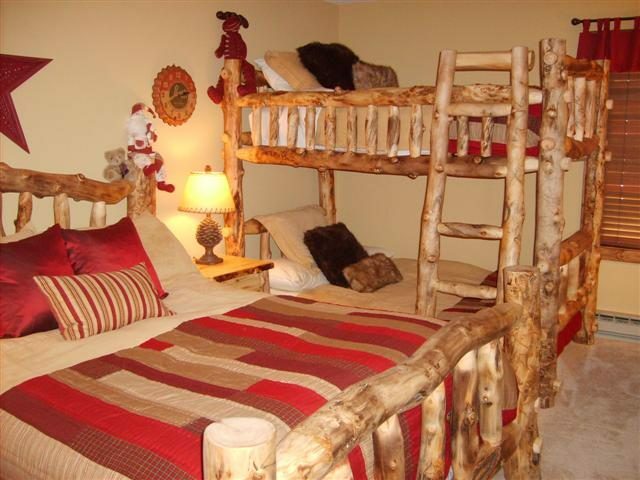 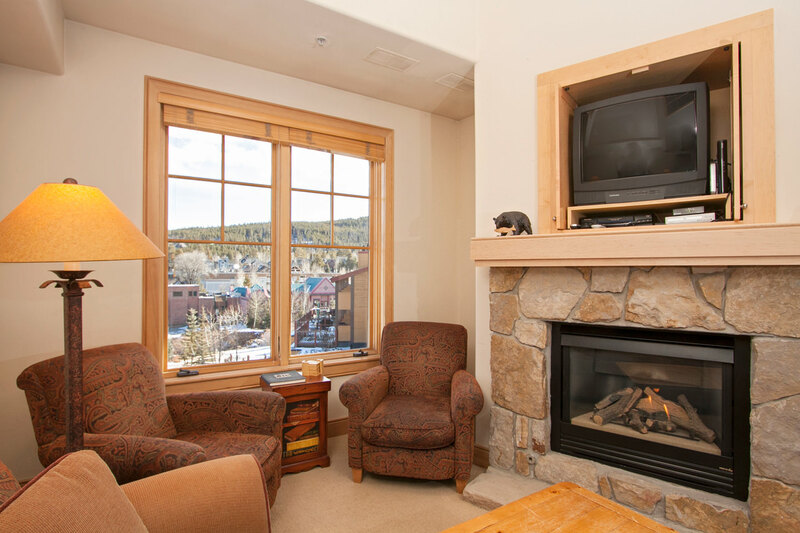 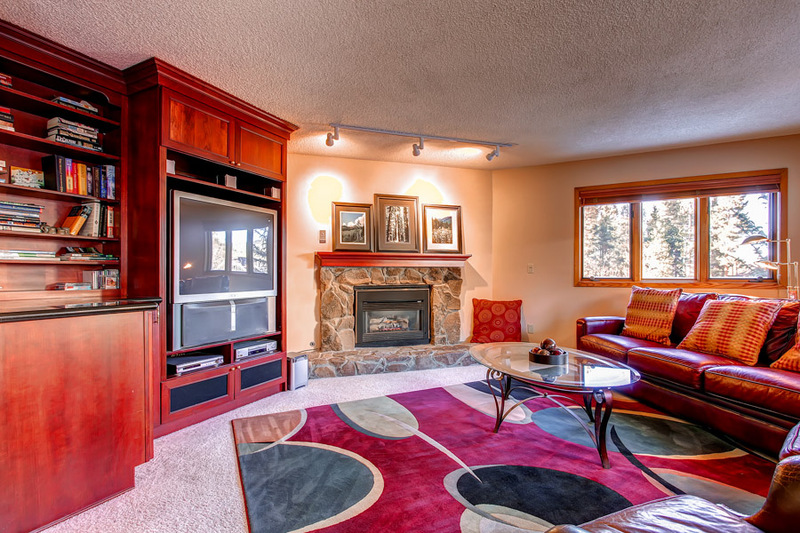 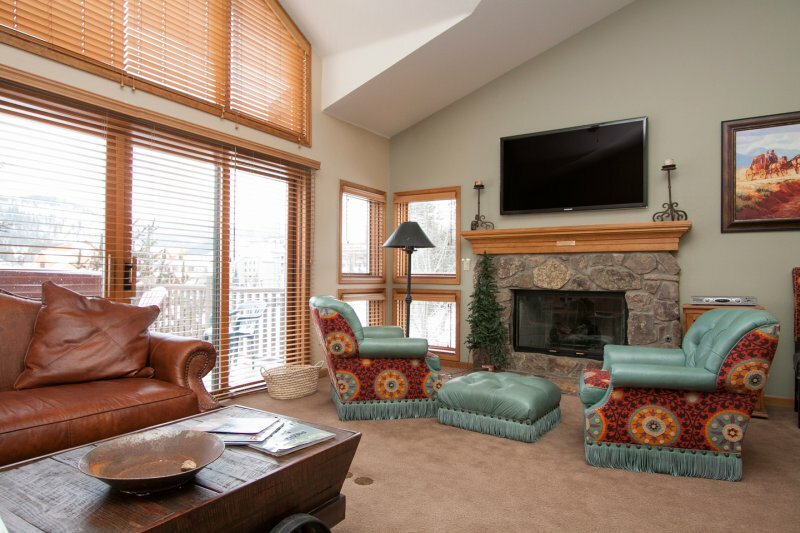 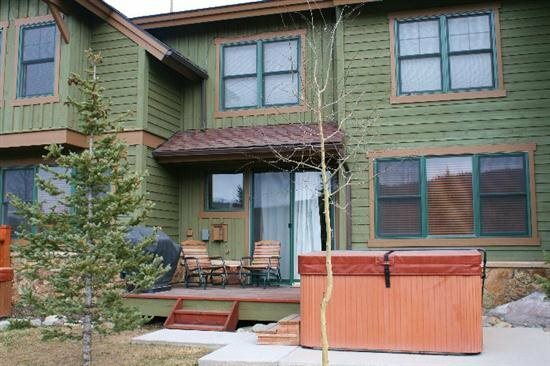 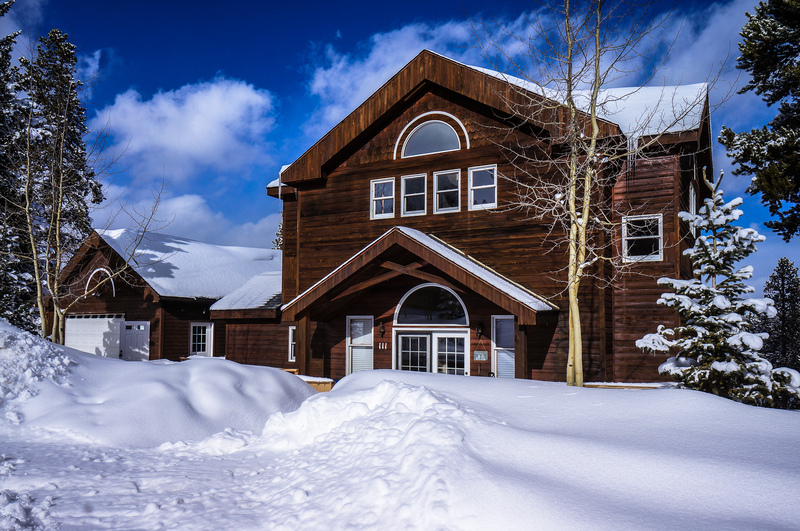 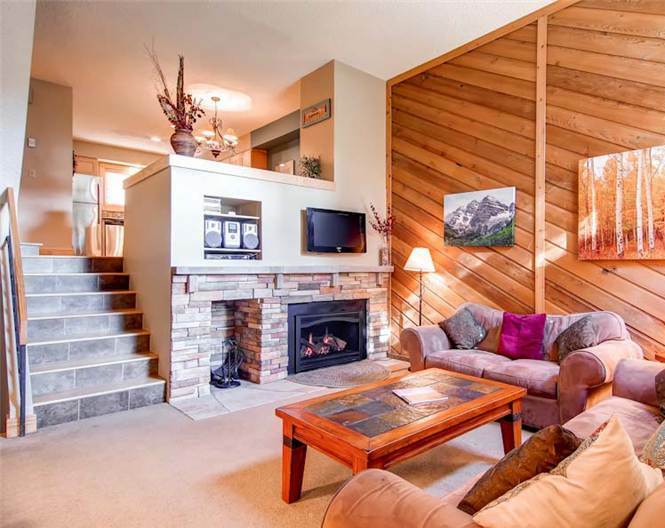 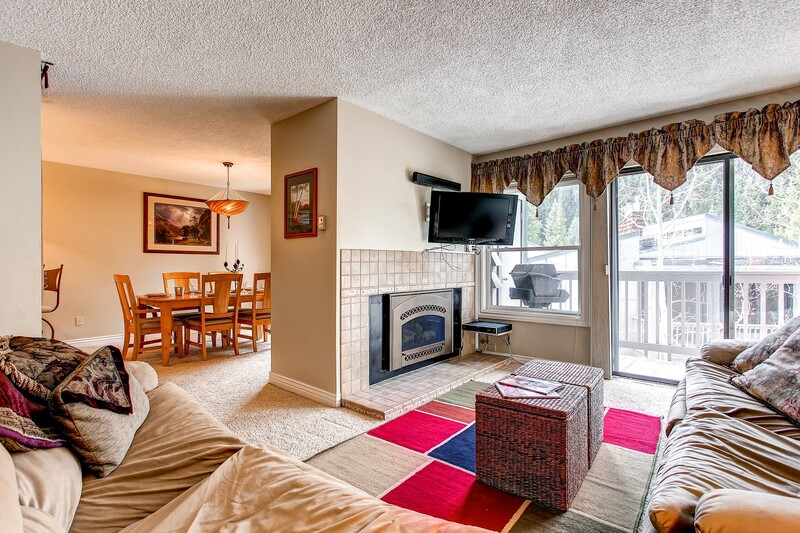 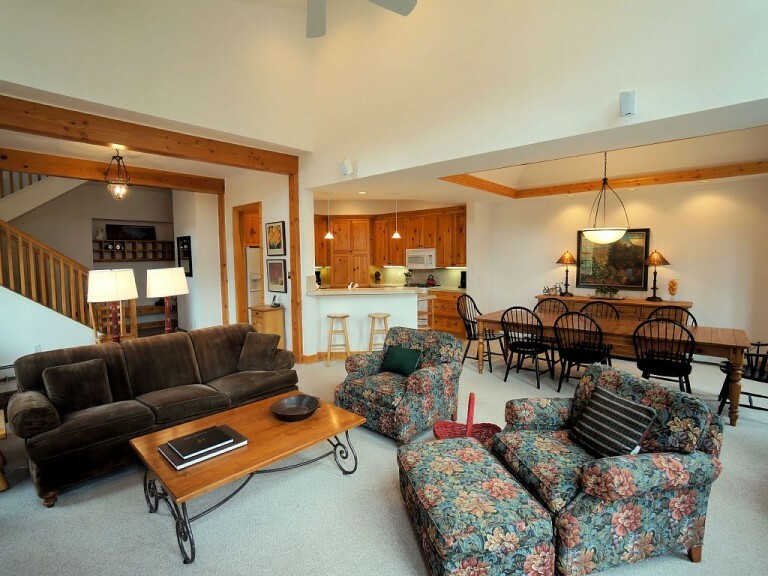 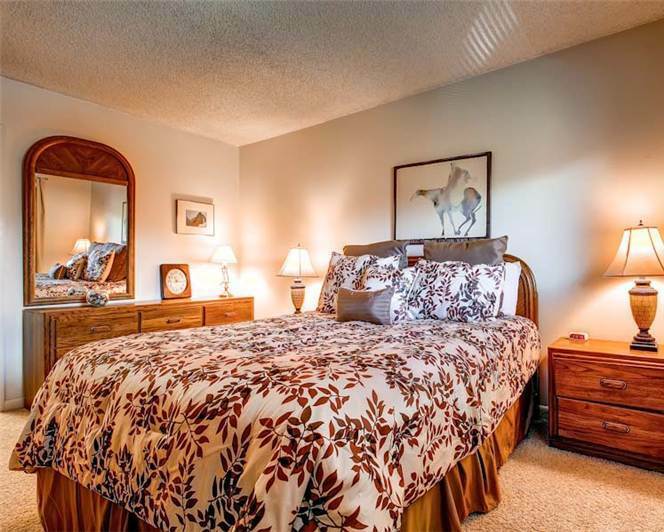 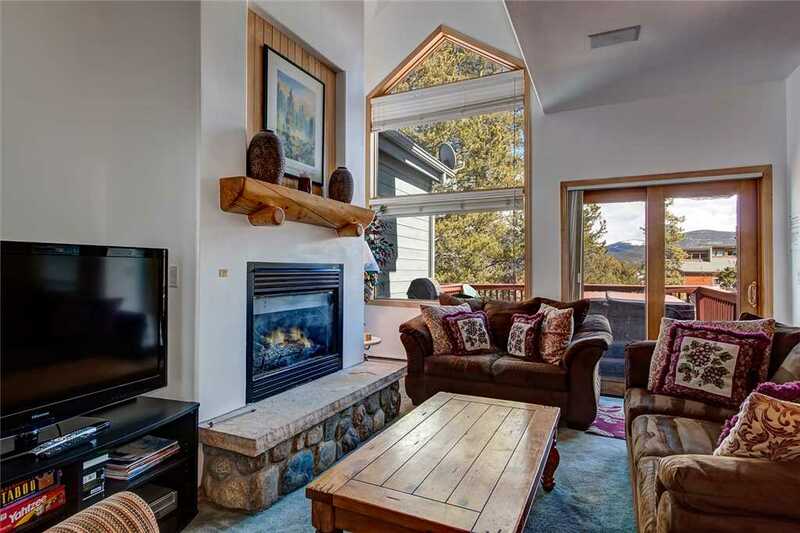 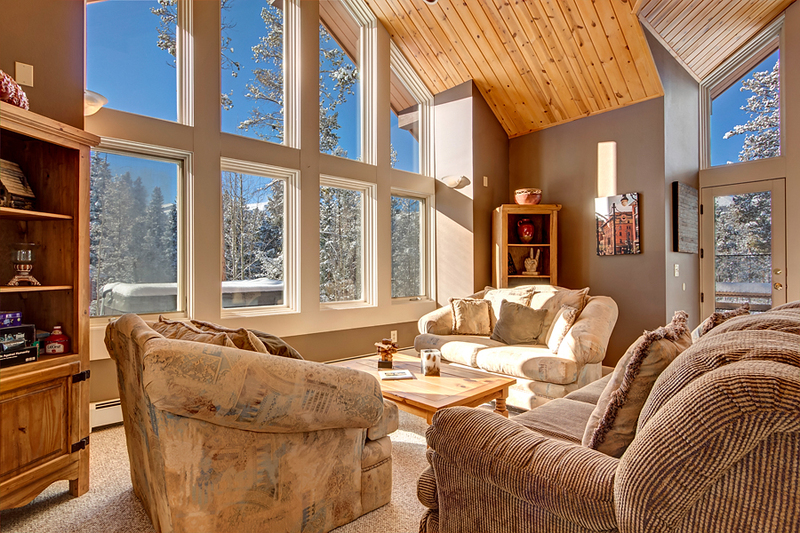 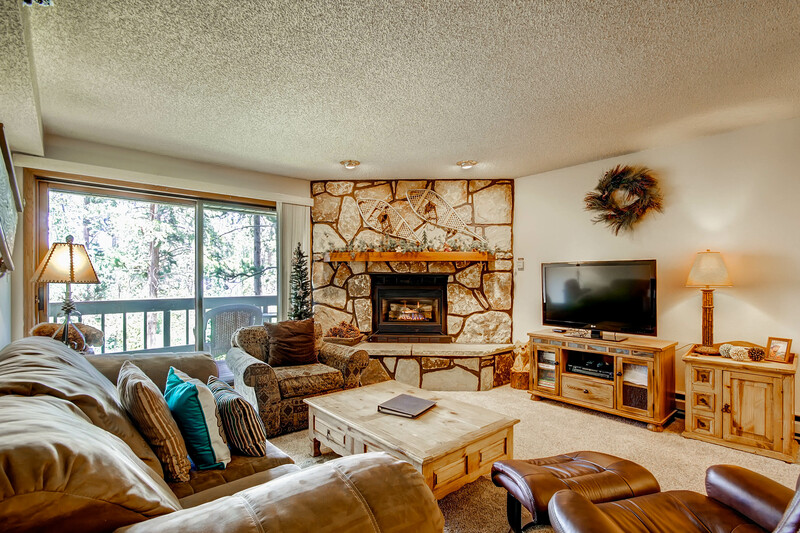 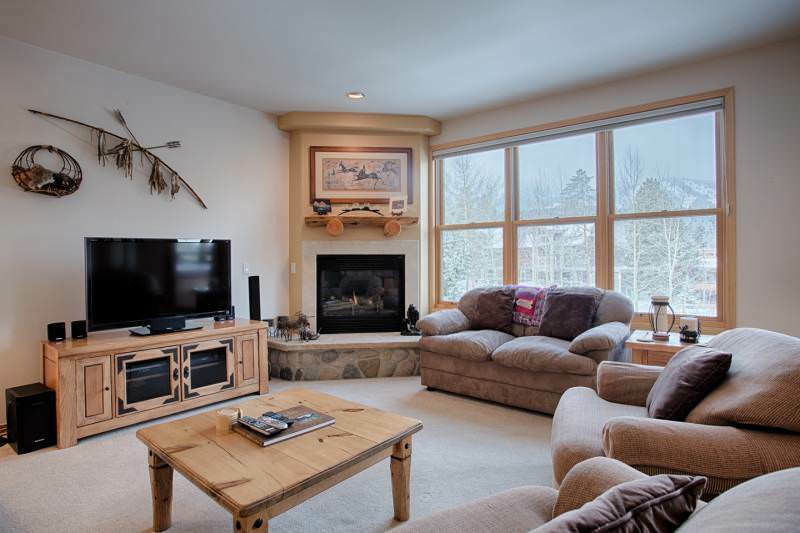 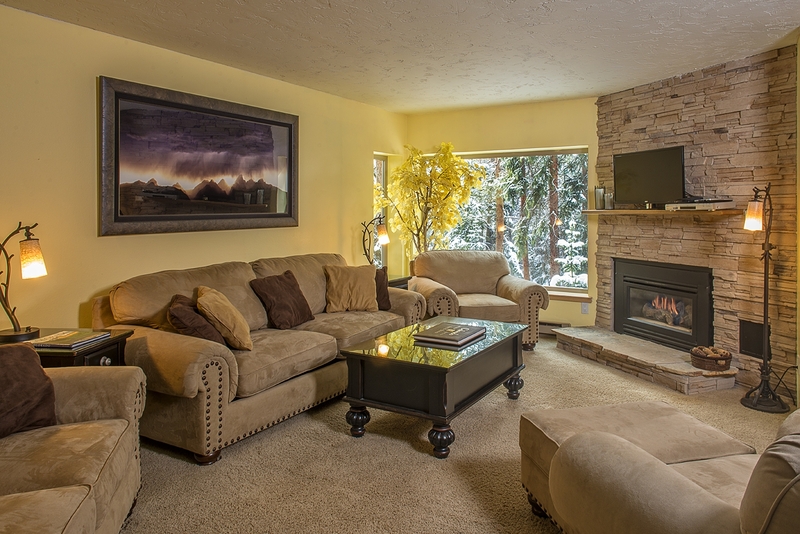 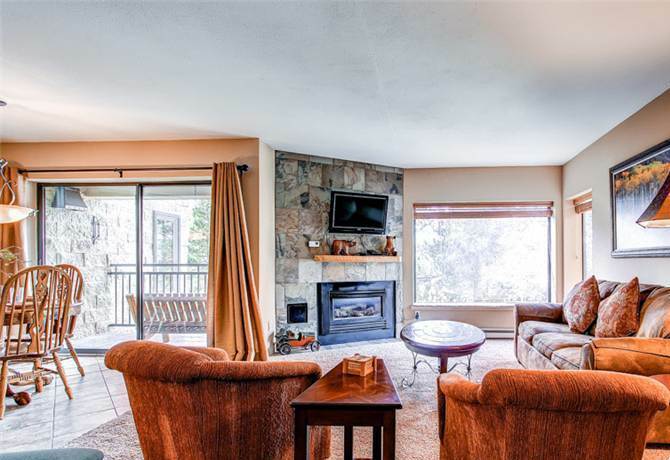 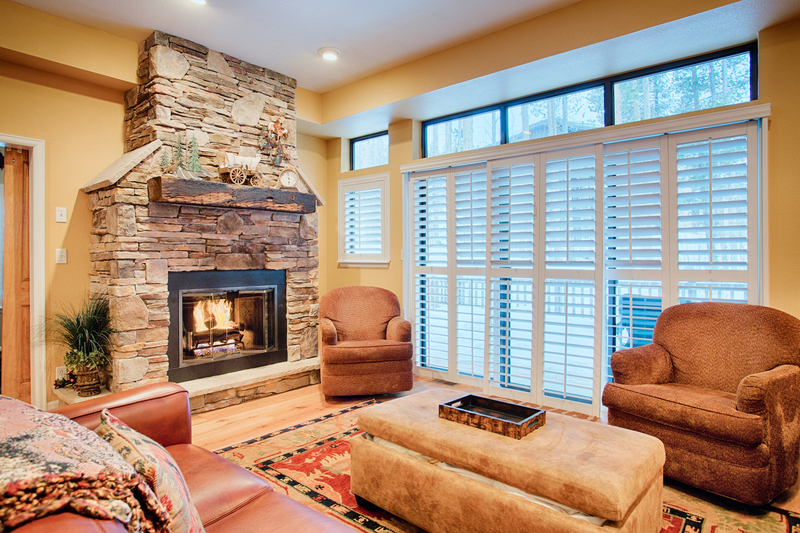 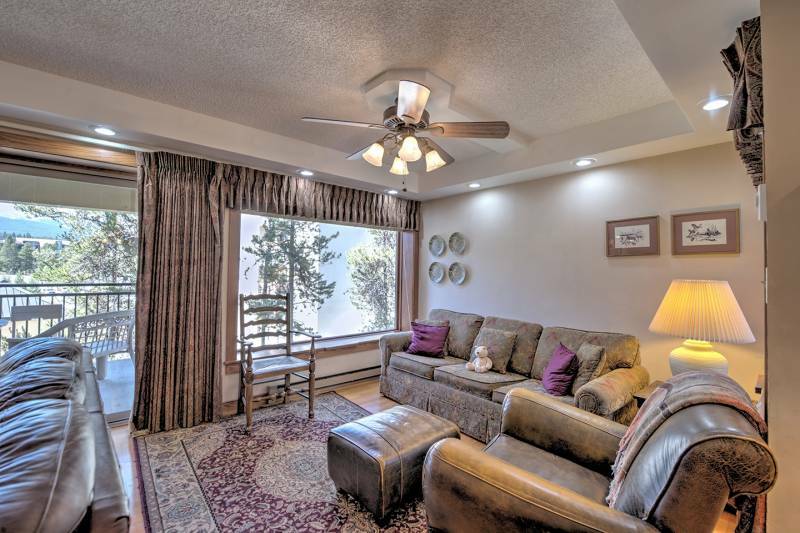 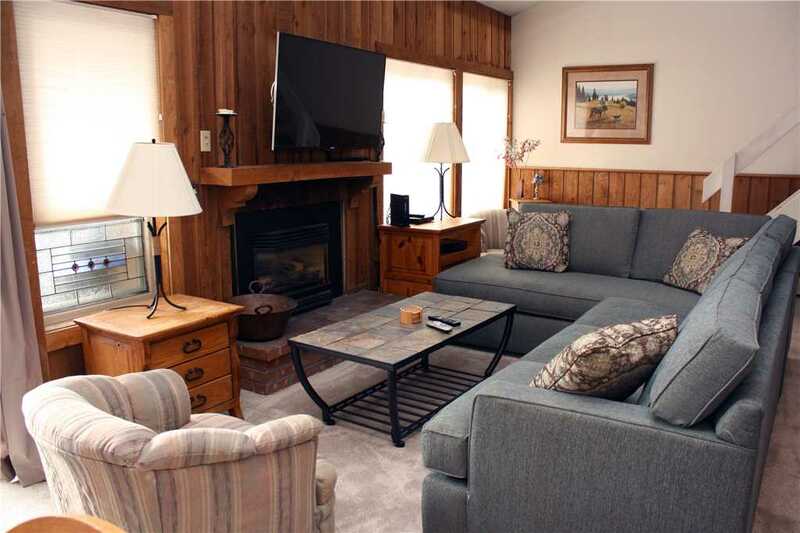 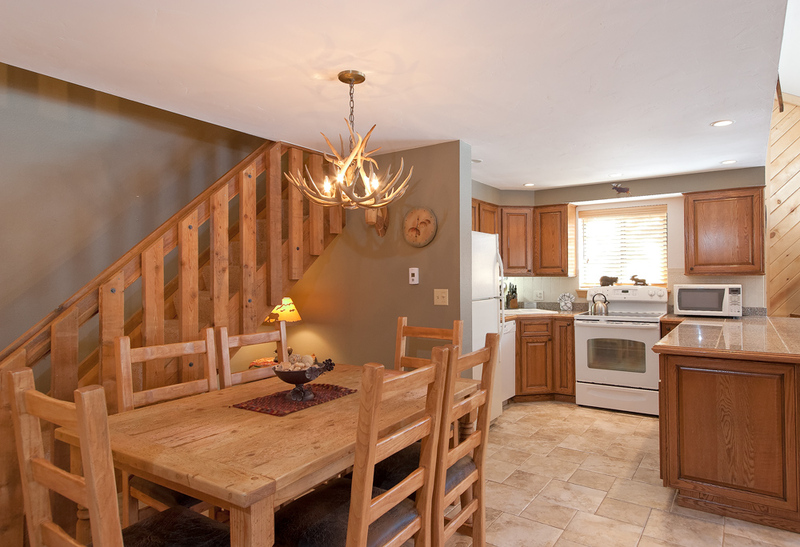 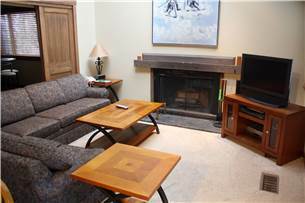 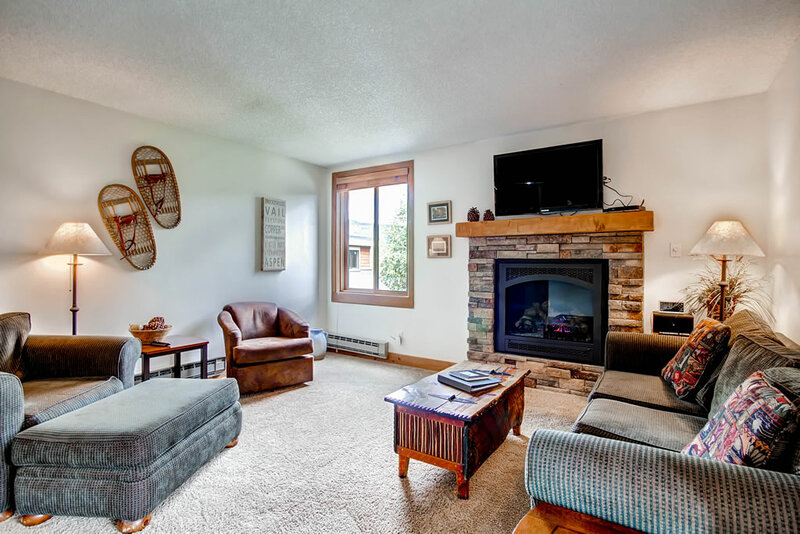 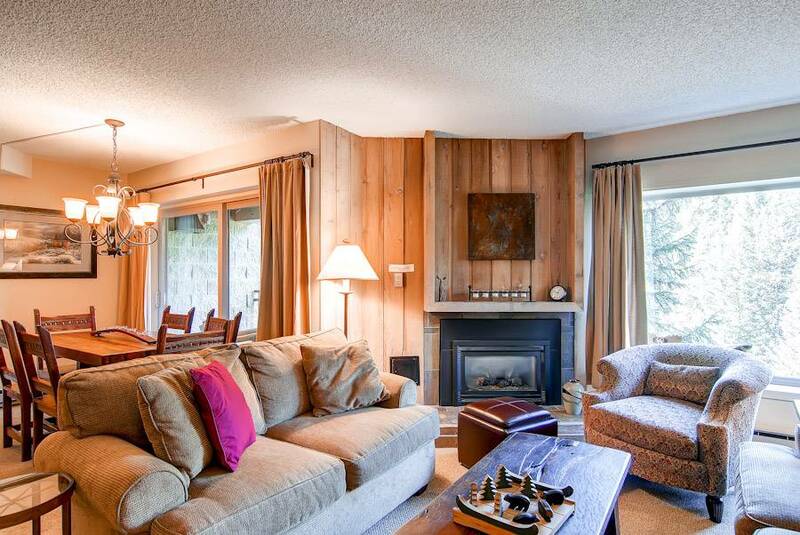 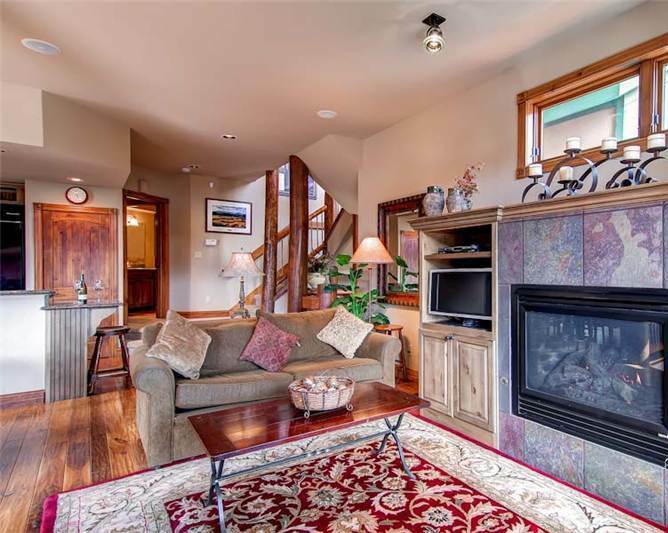 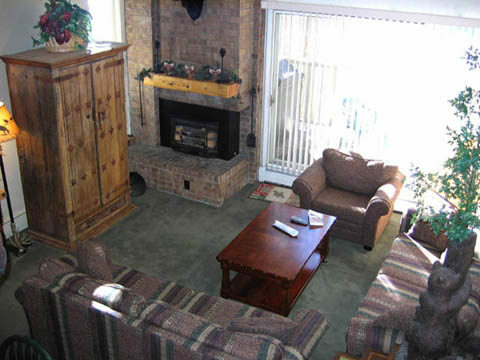 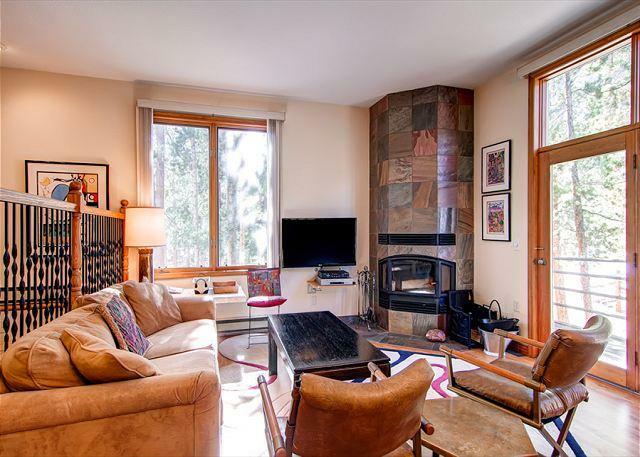 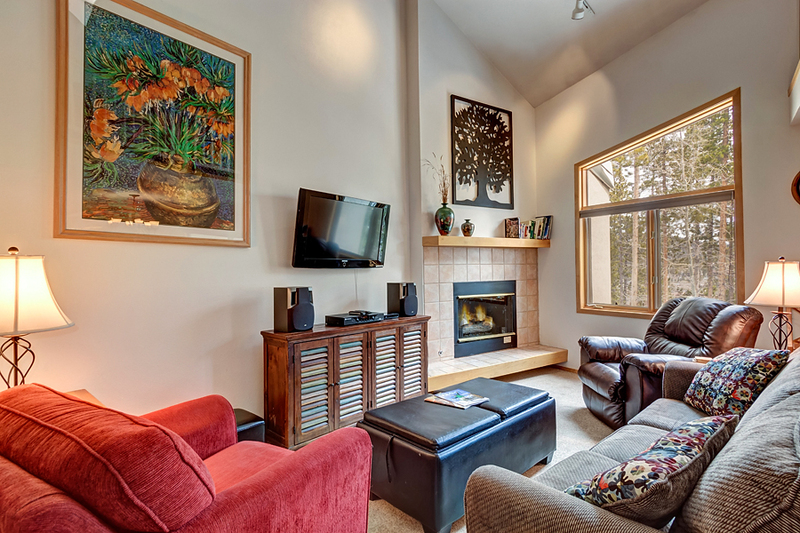 Guests will enjoy this sunny, corner unit with lots of windows, two balconies, fresh mountain decor. 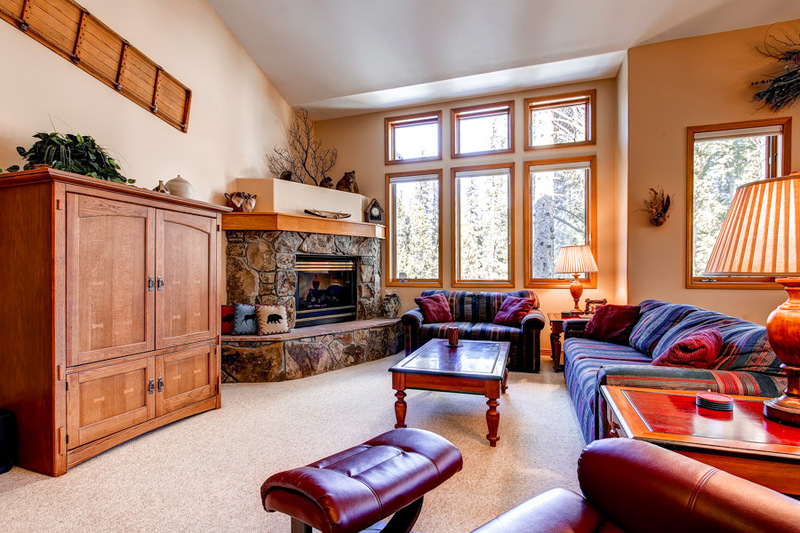 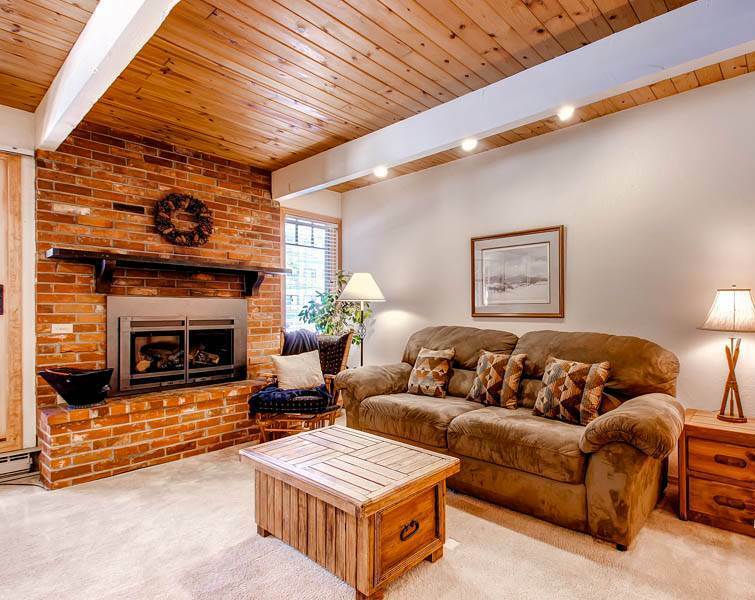 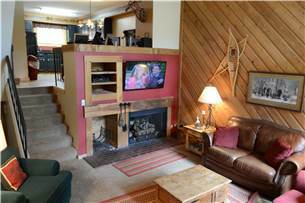 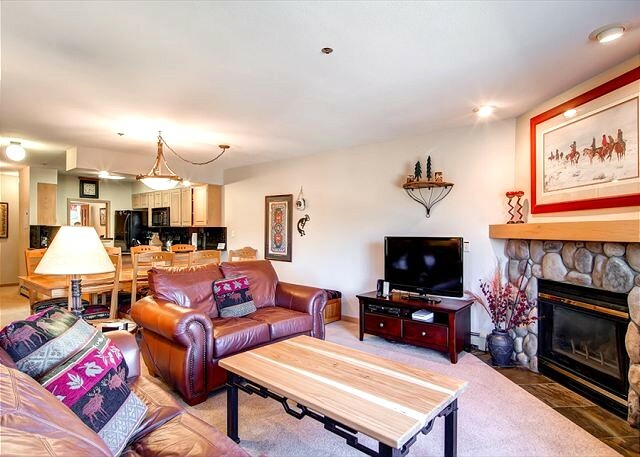 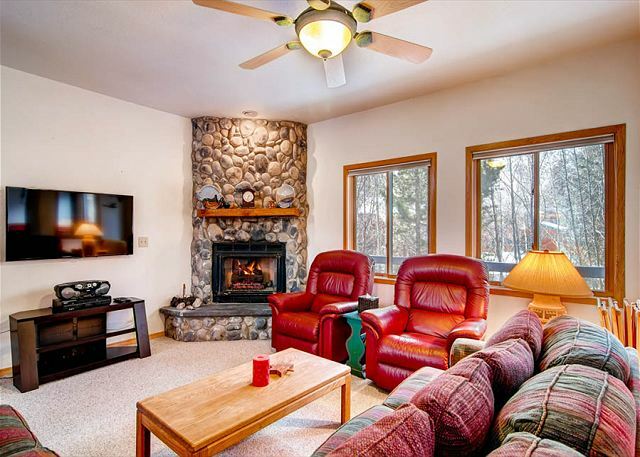 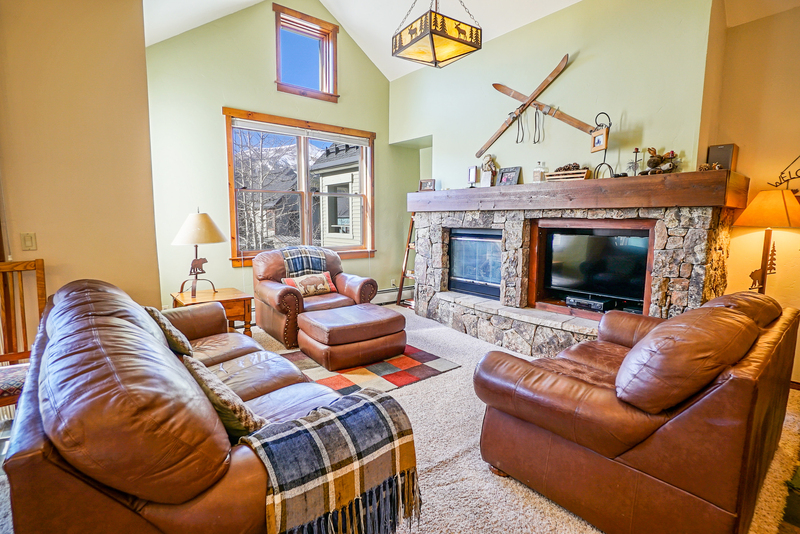 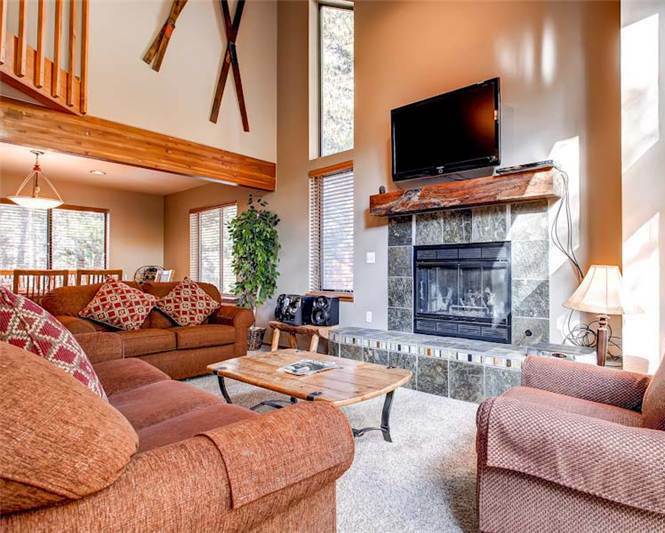 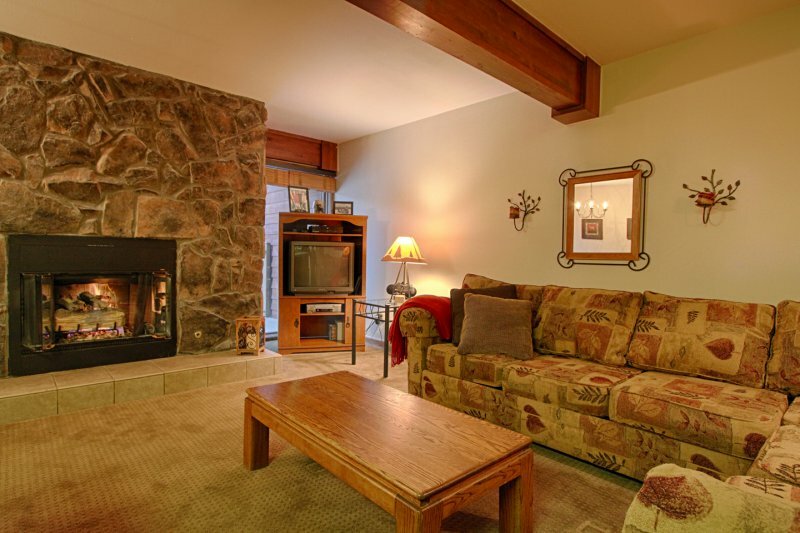 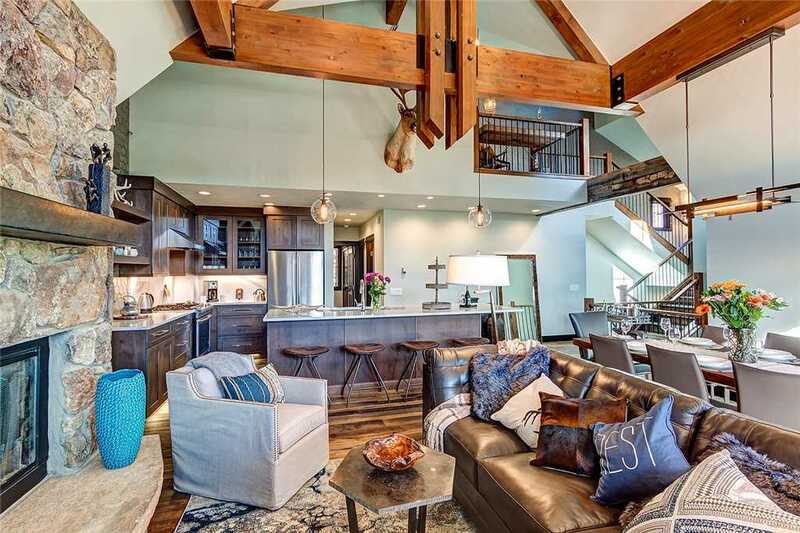 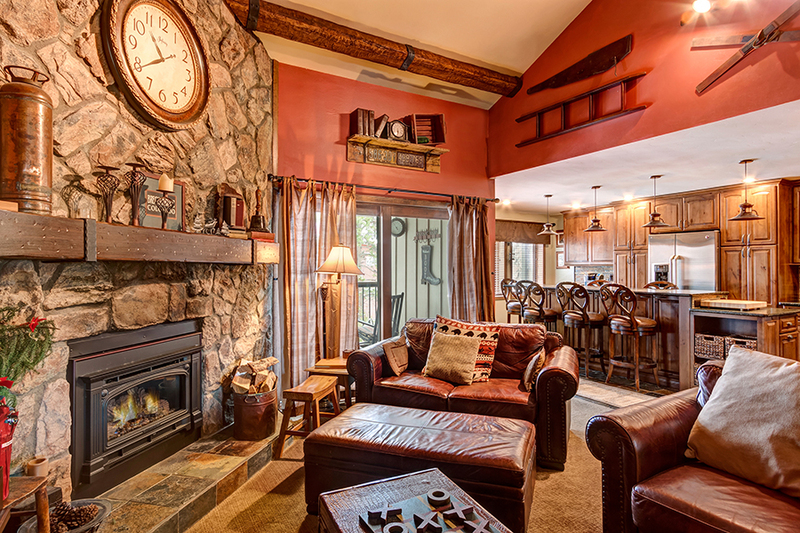 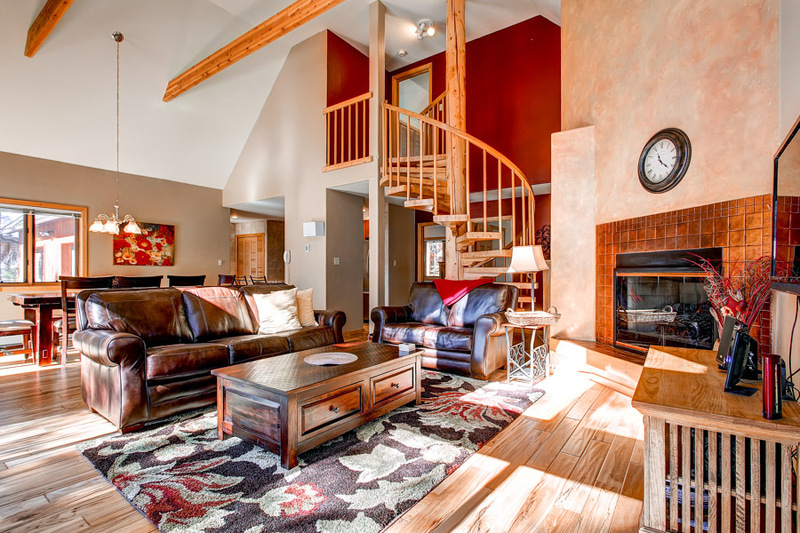 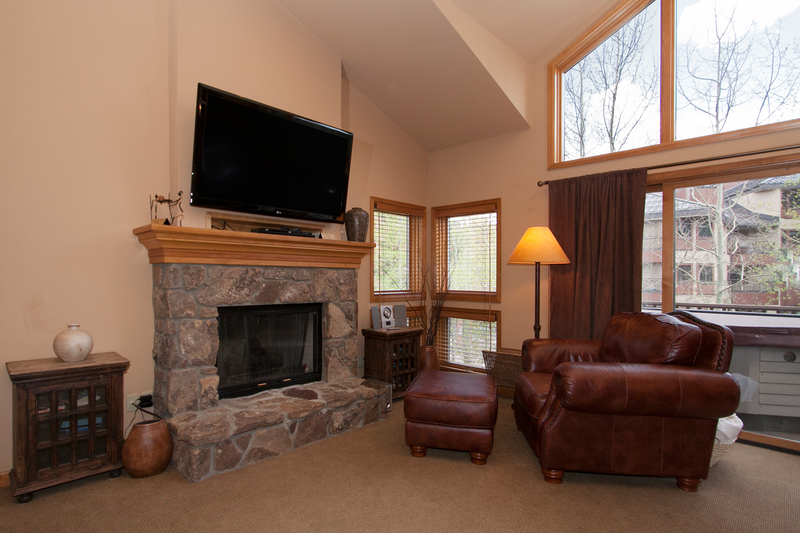 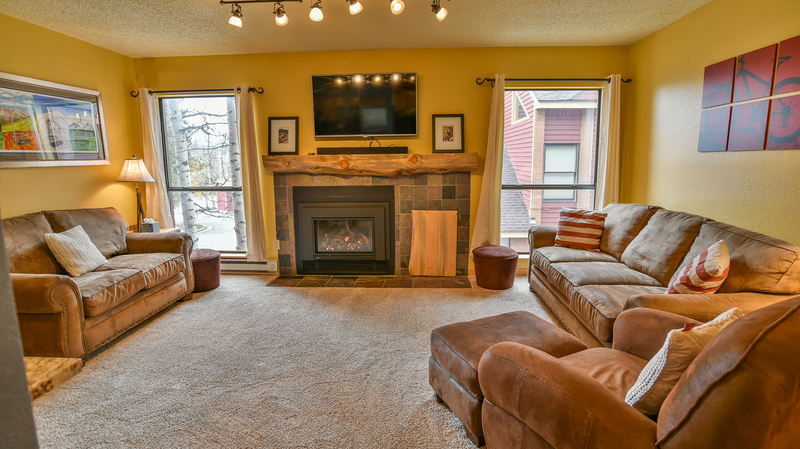 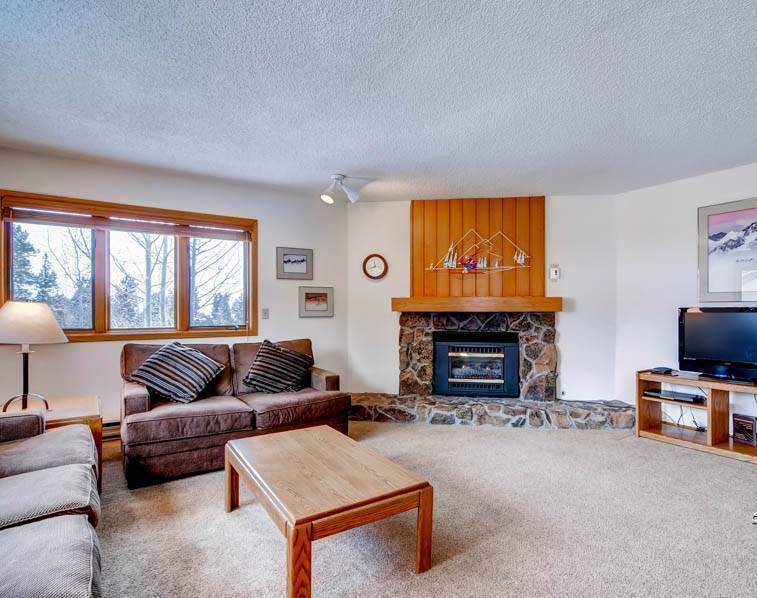 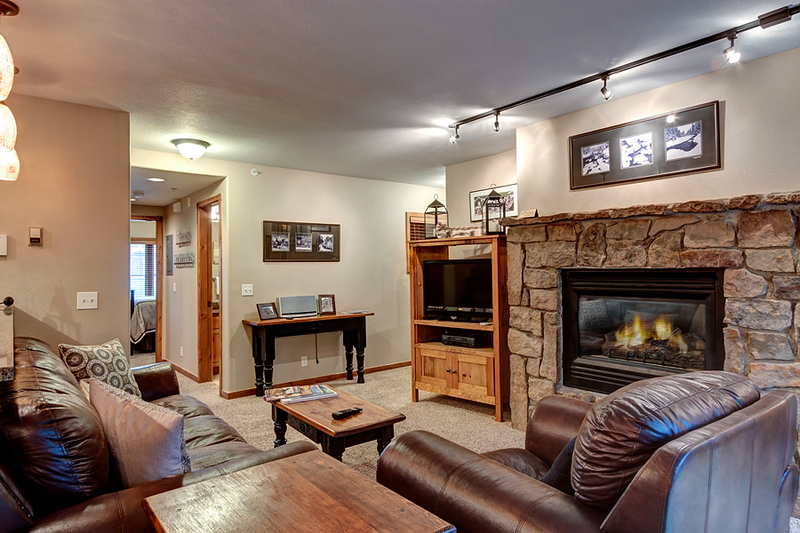 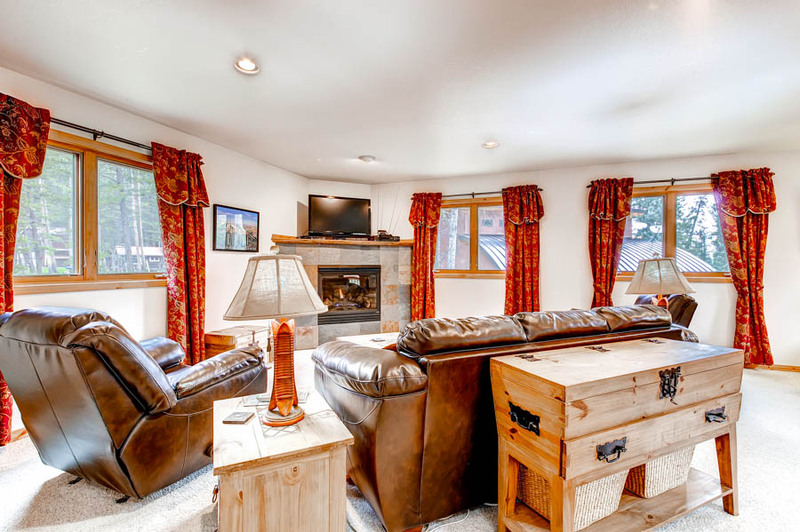 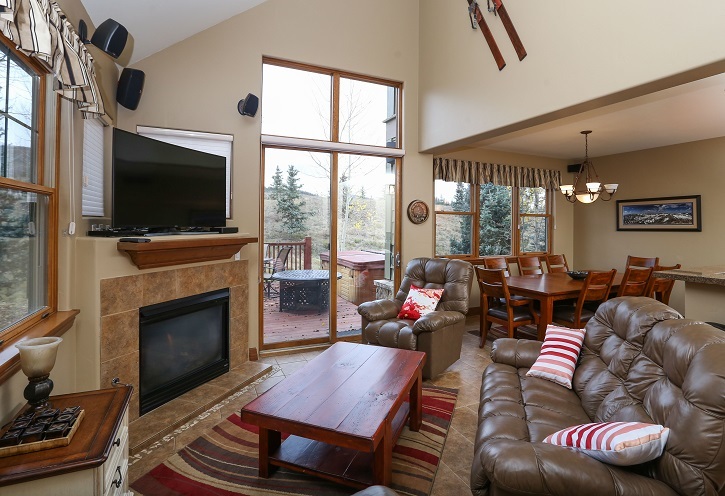 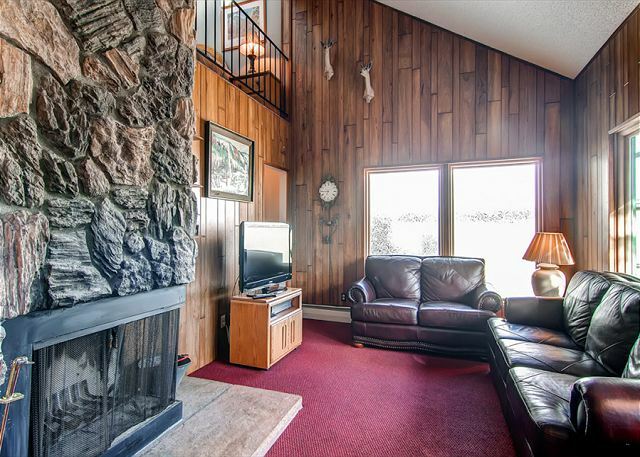 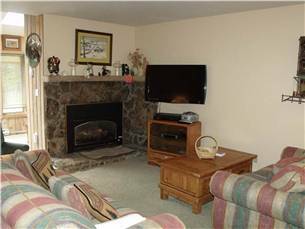 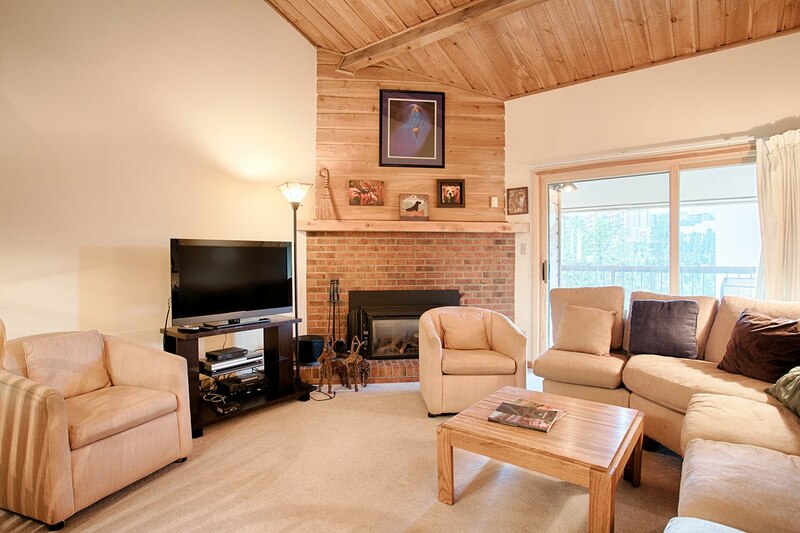 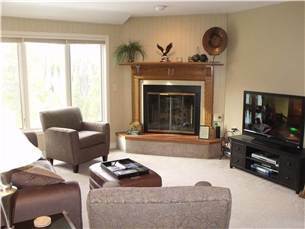 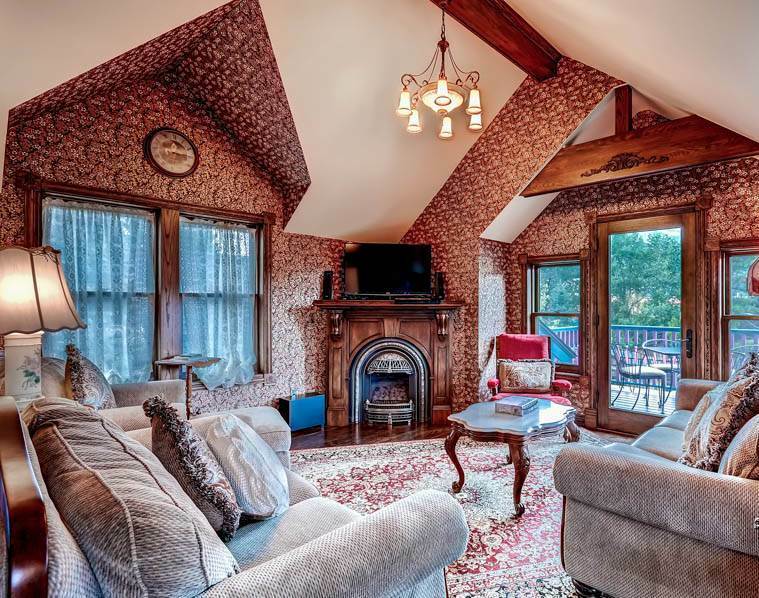 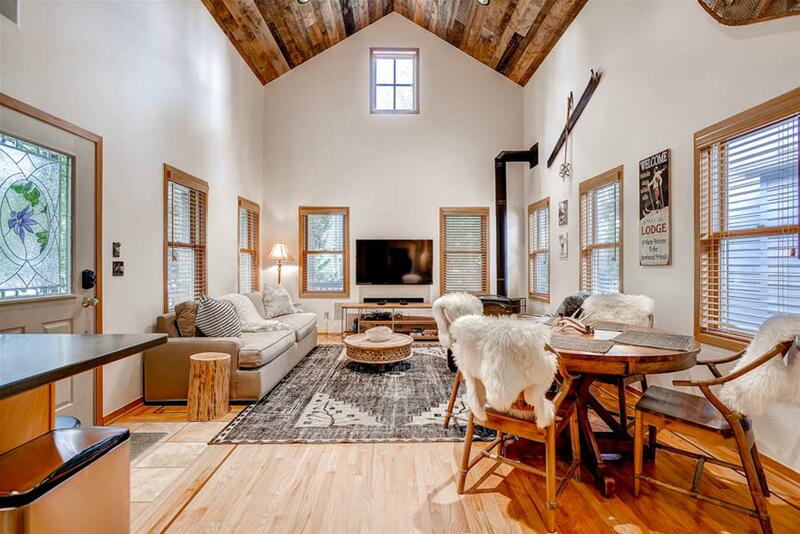 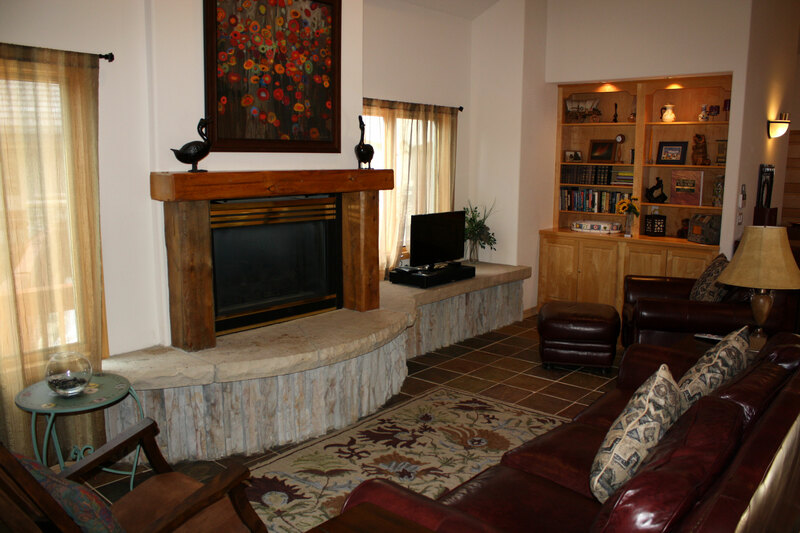 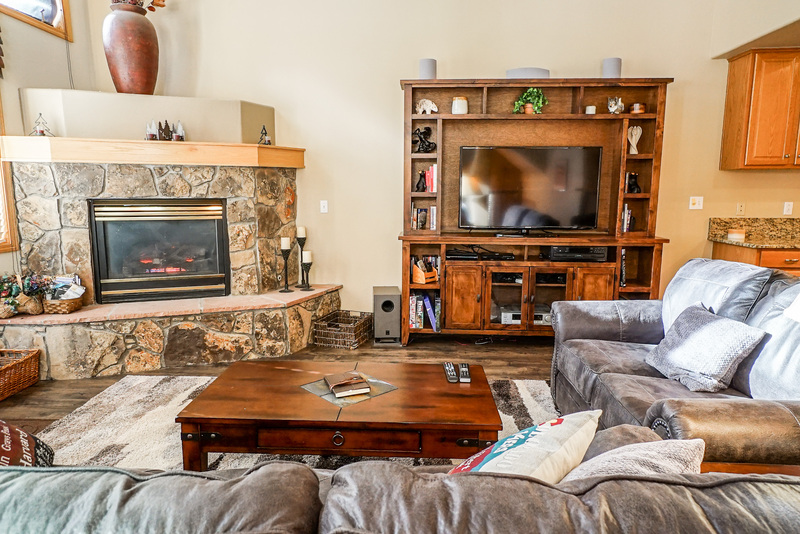 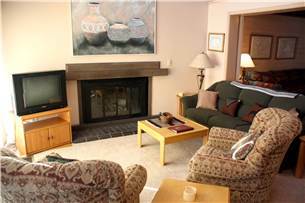 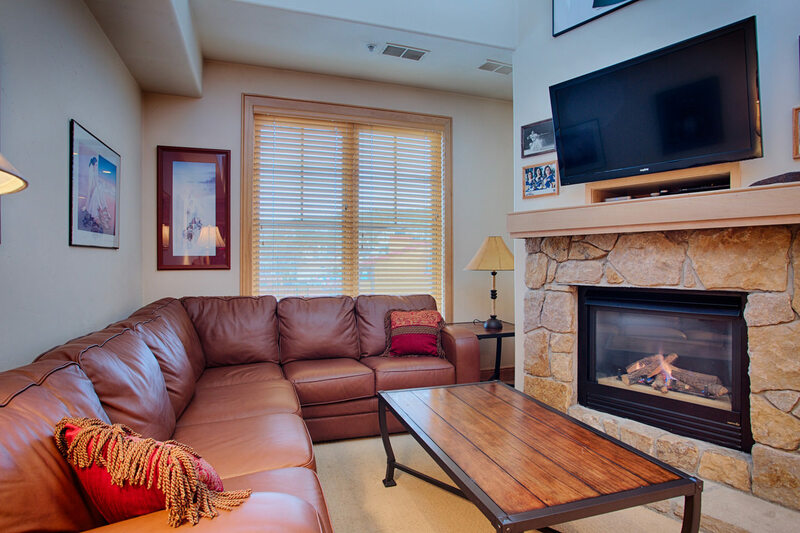 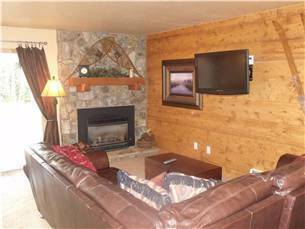 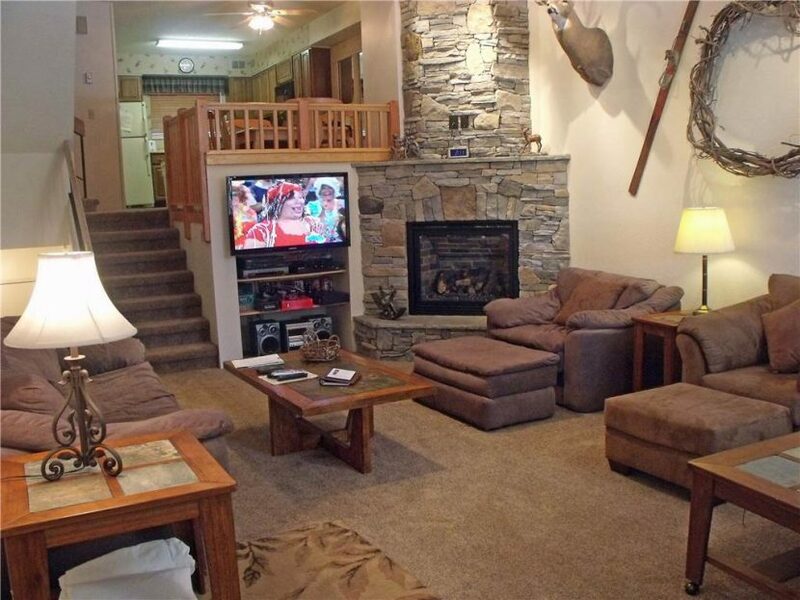 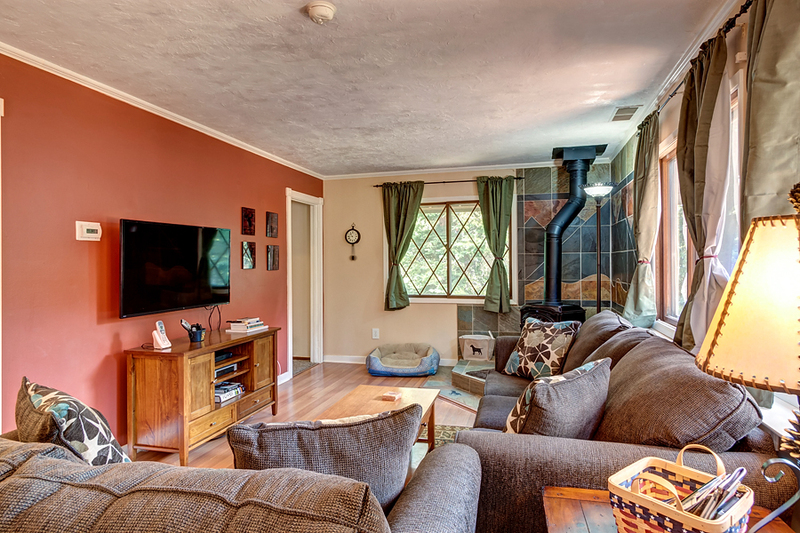 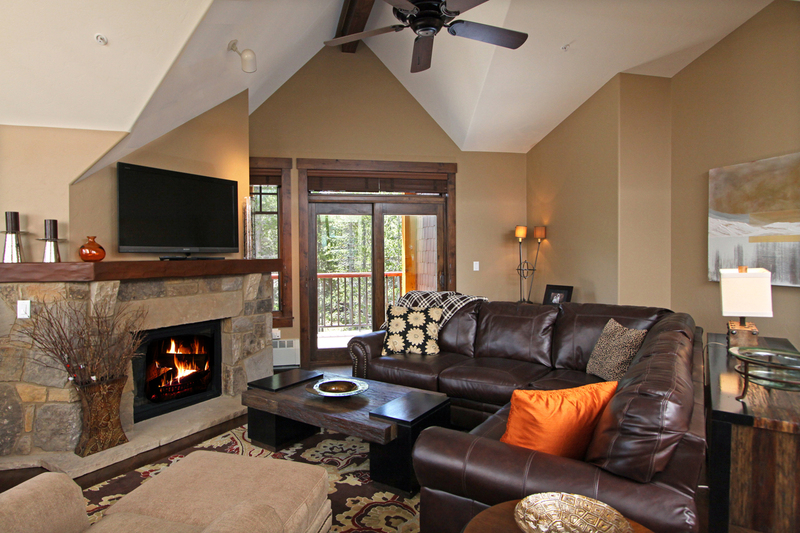 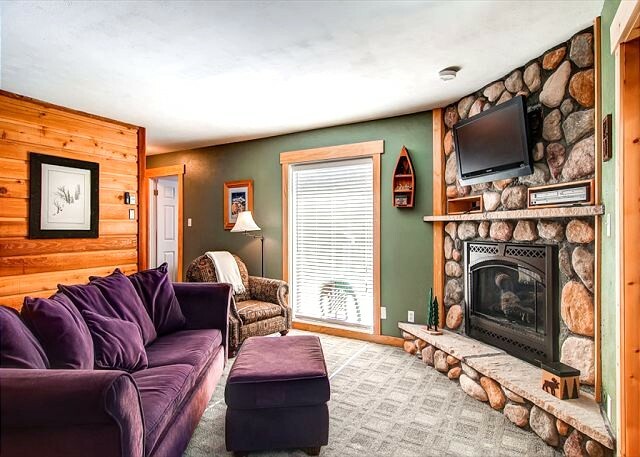 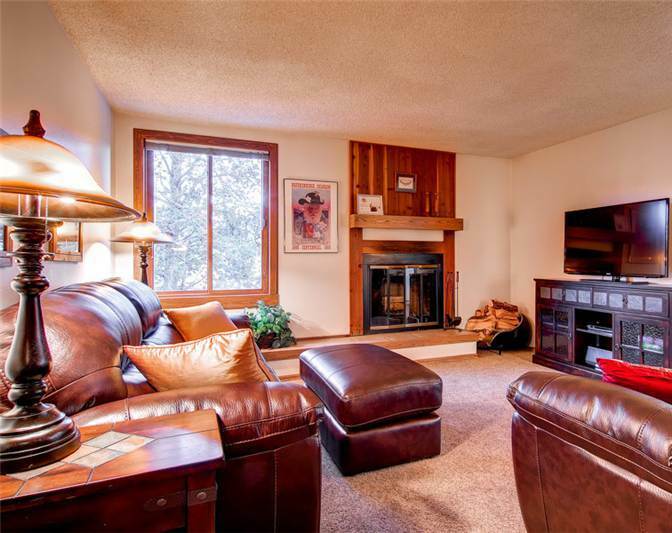 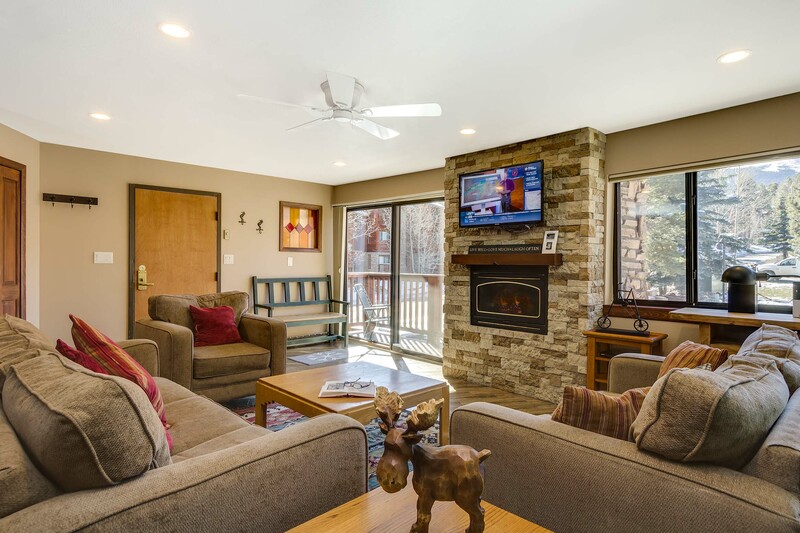 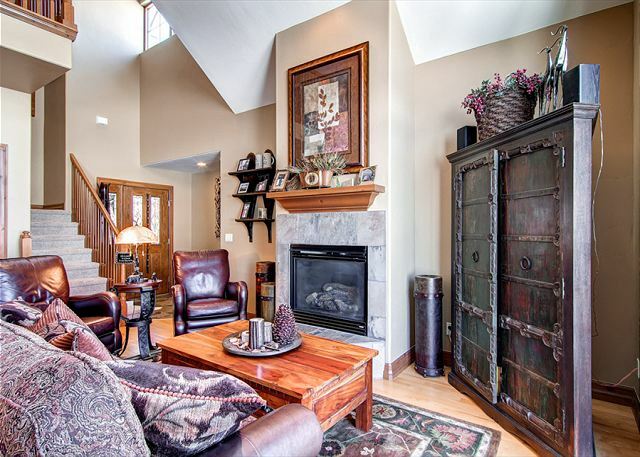 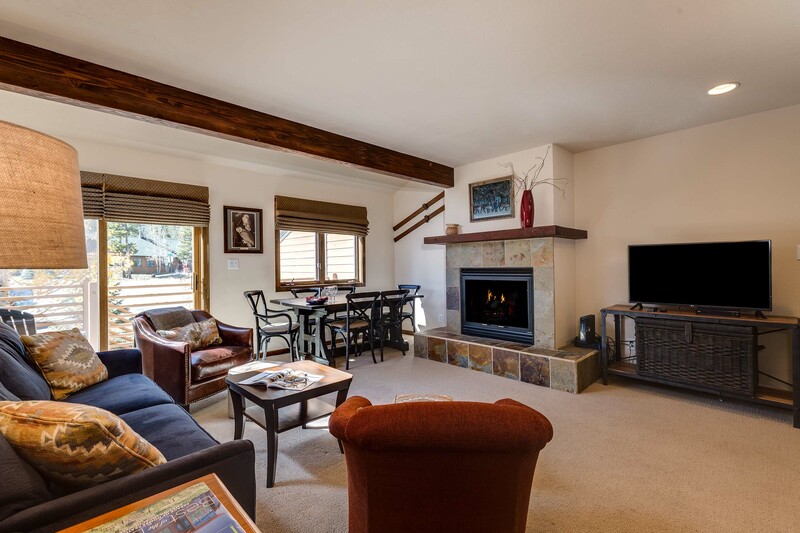 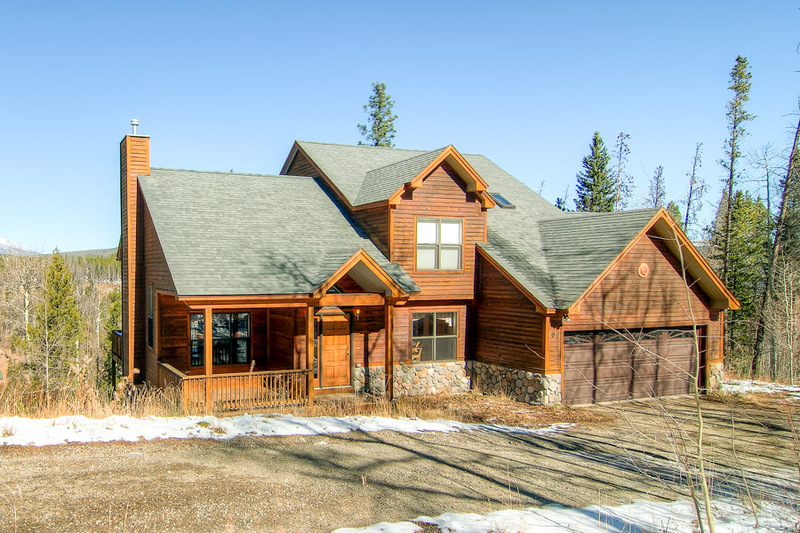 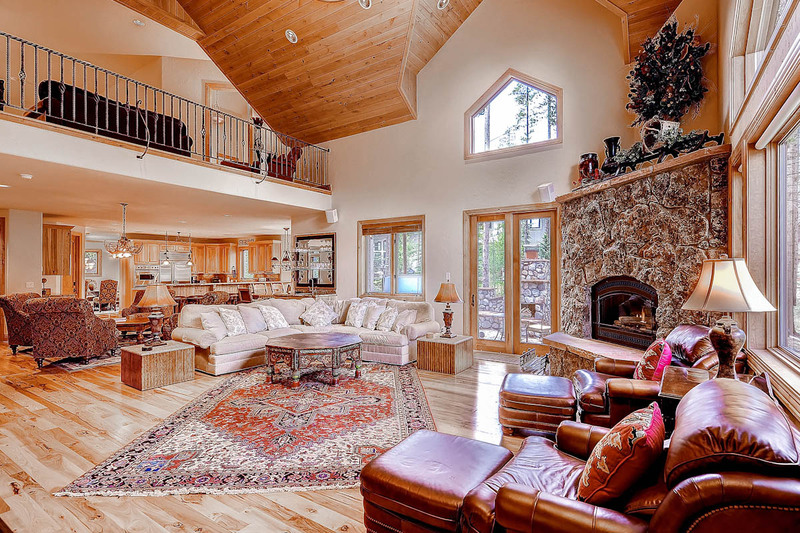 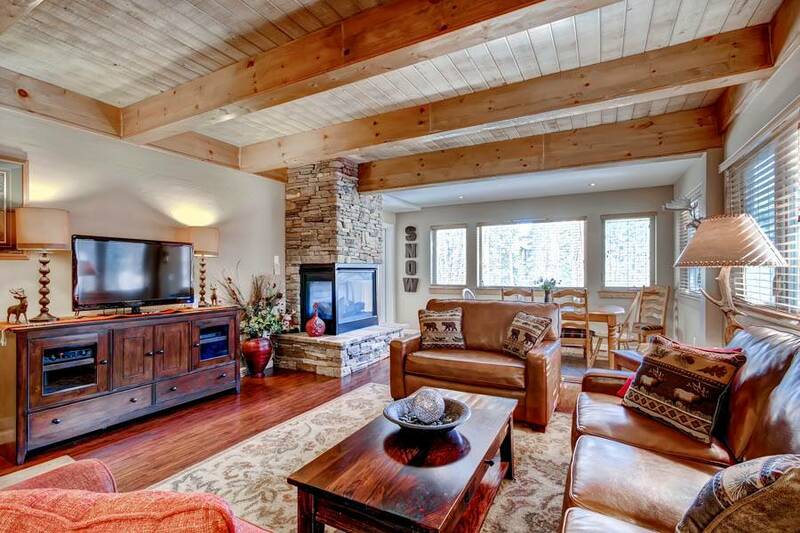 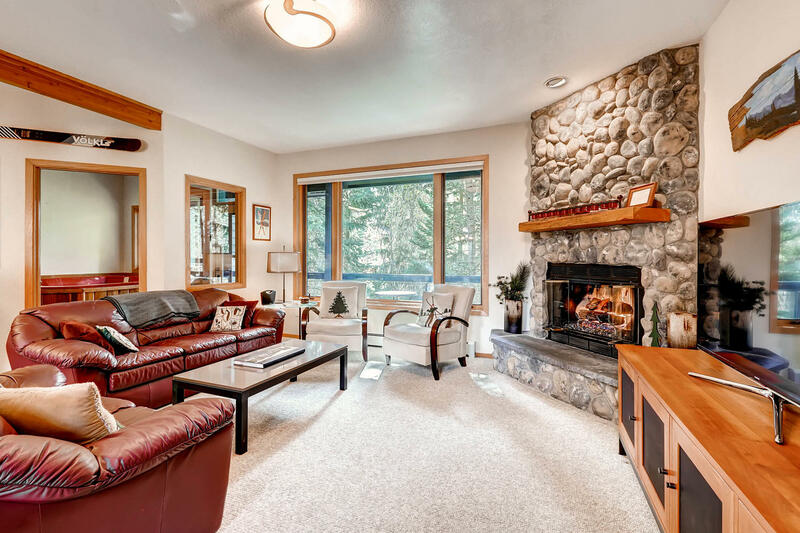 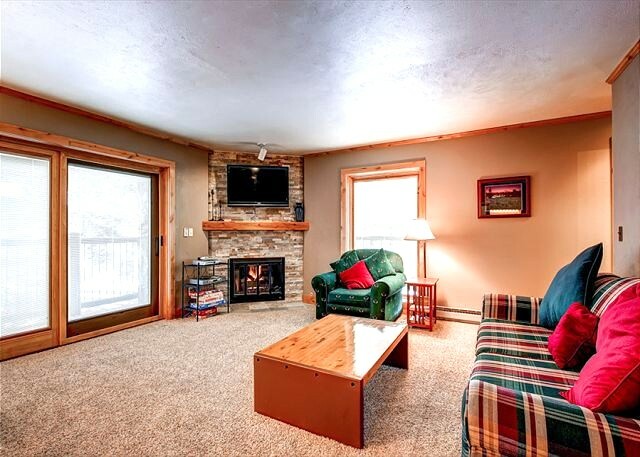 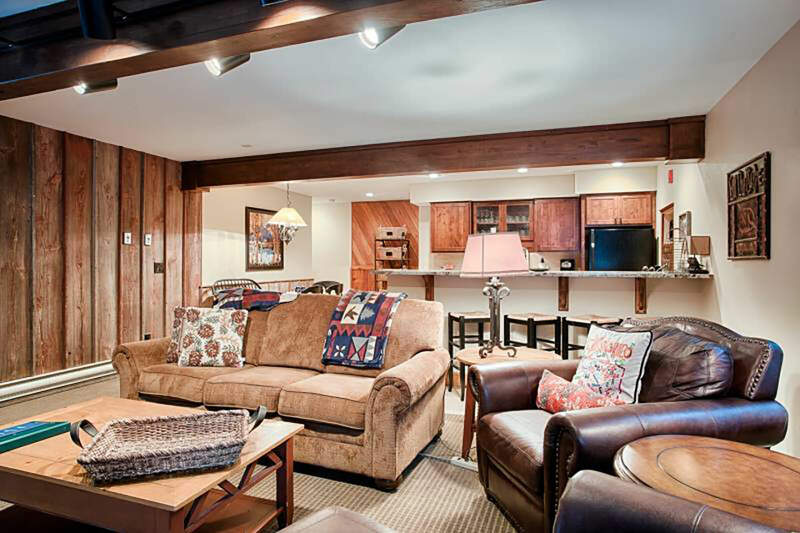 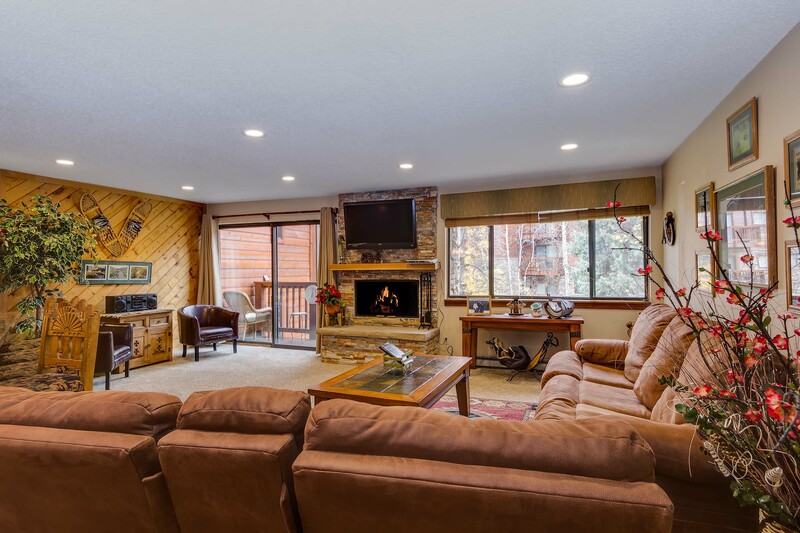 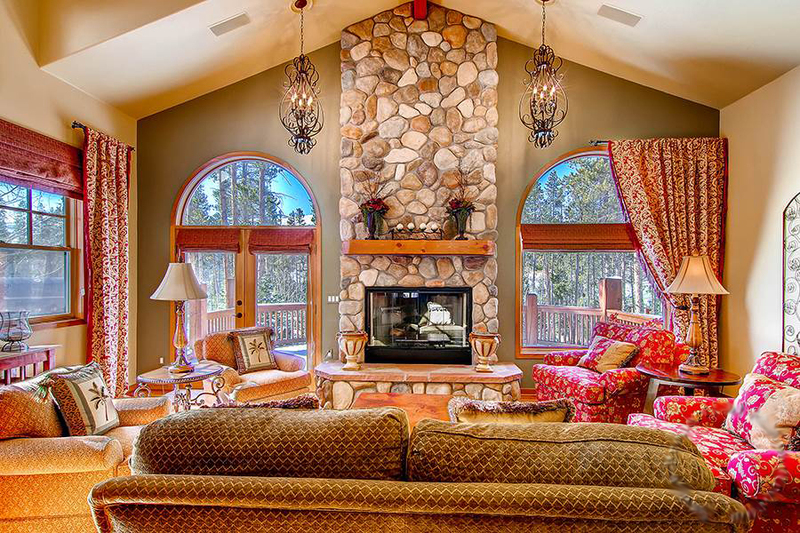 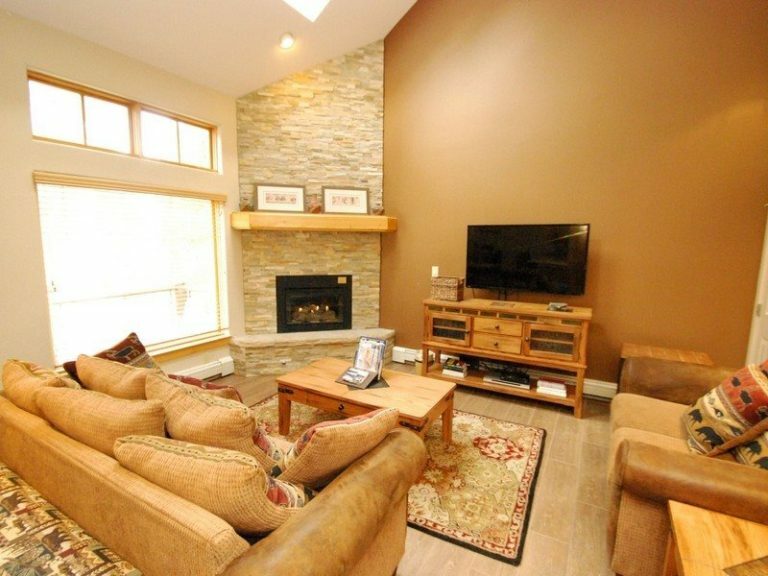 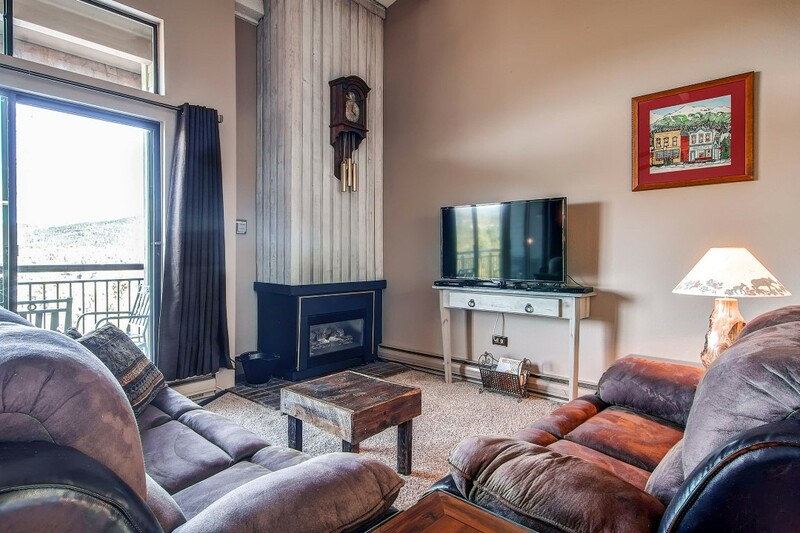 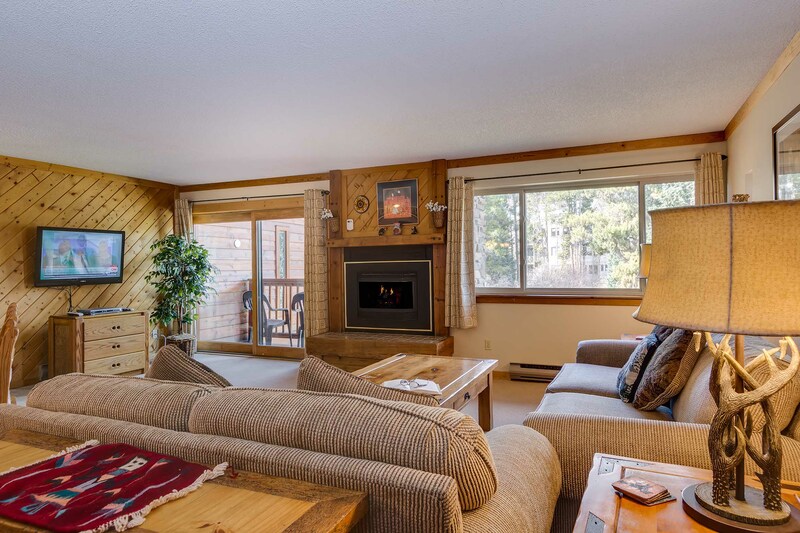 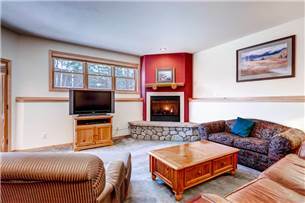 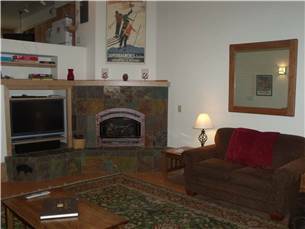 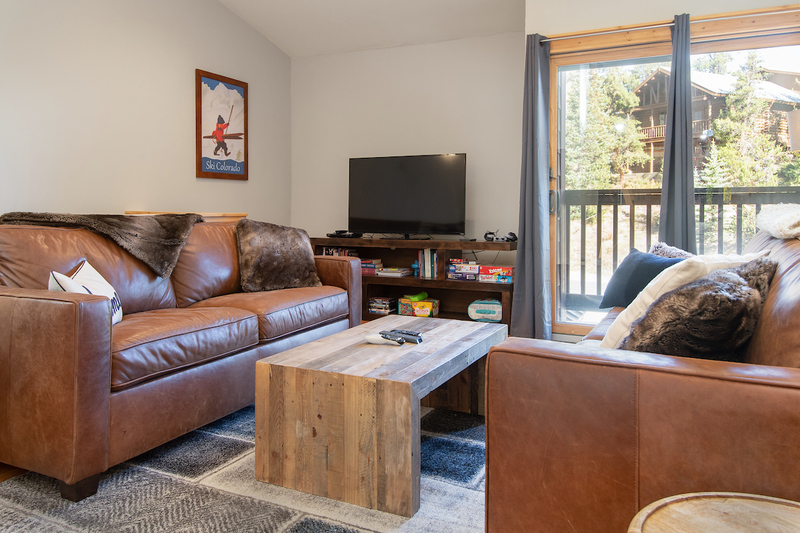 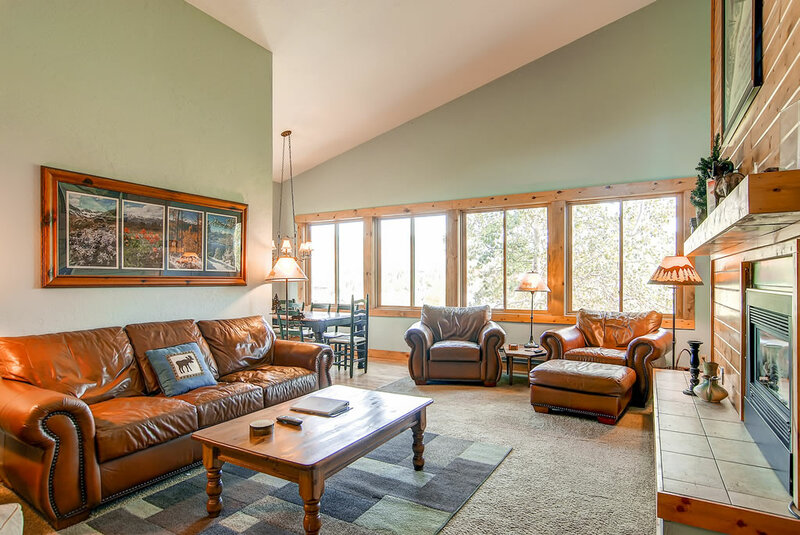 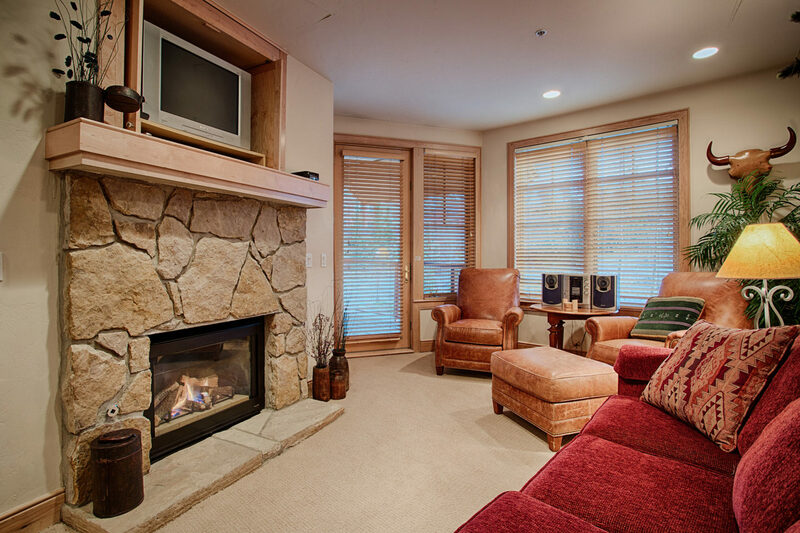 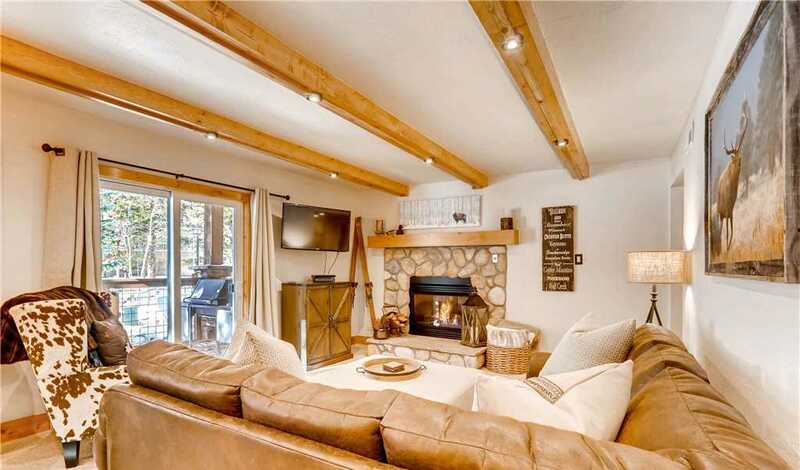 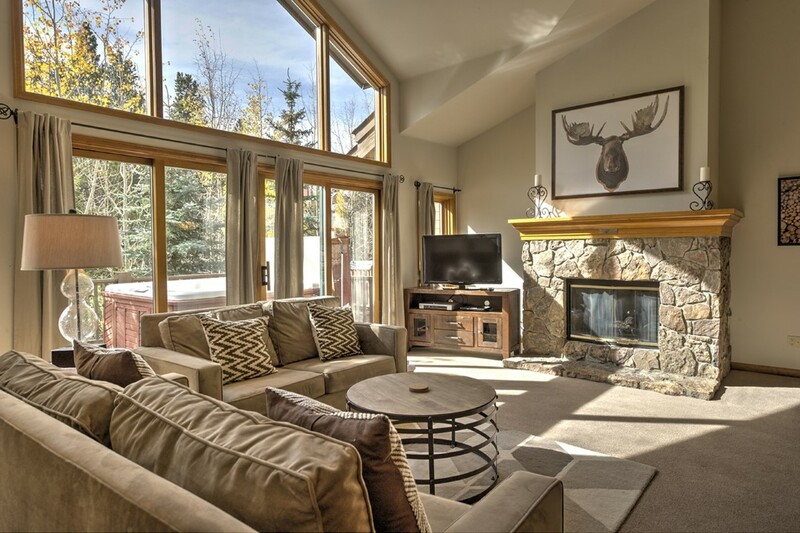 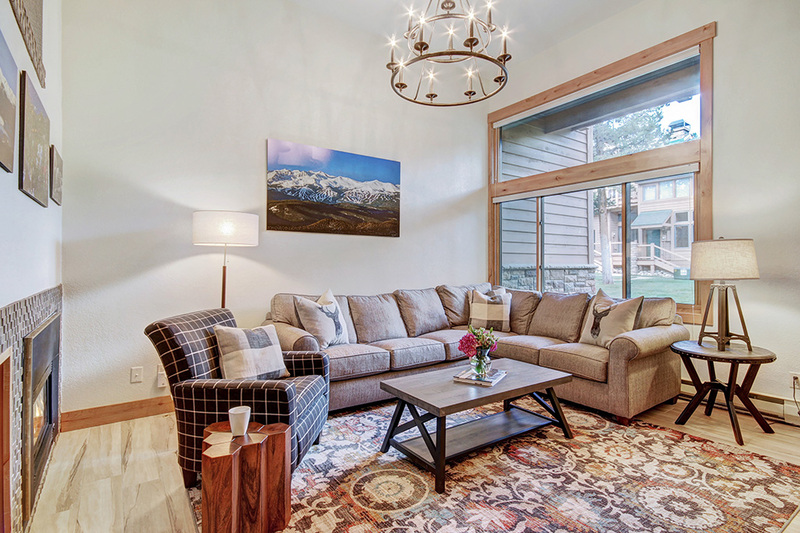 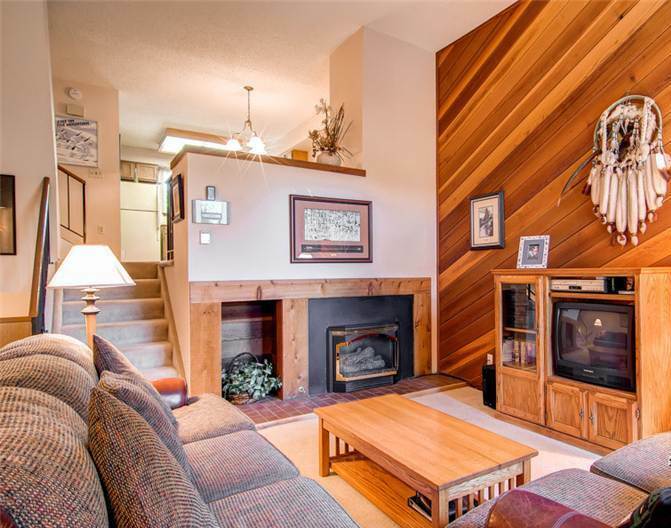 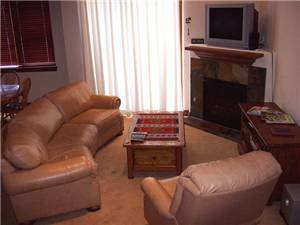 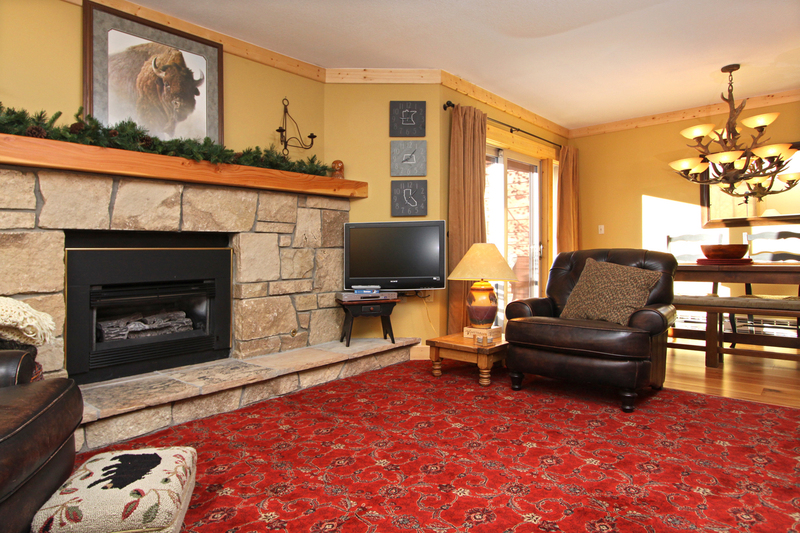 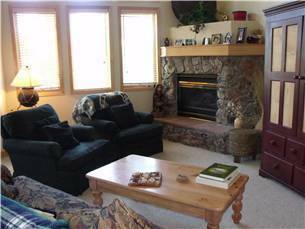 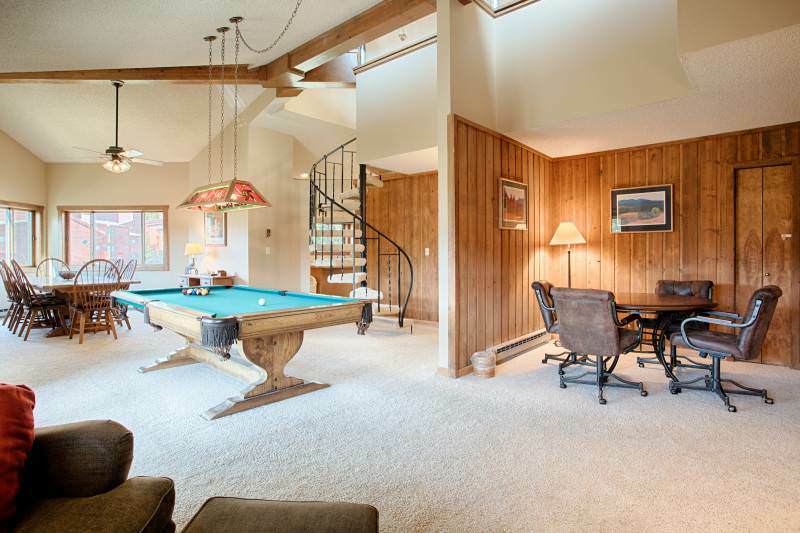 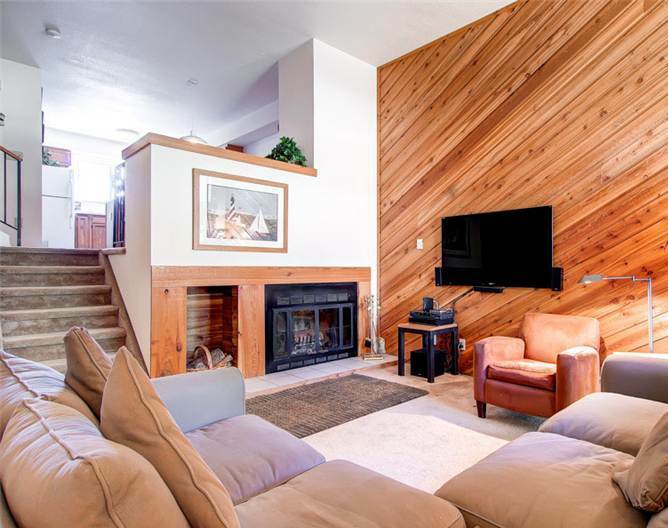 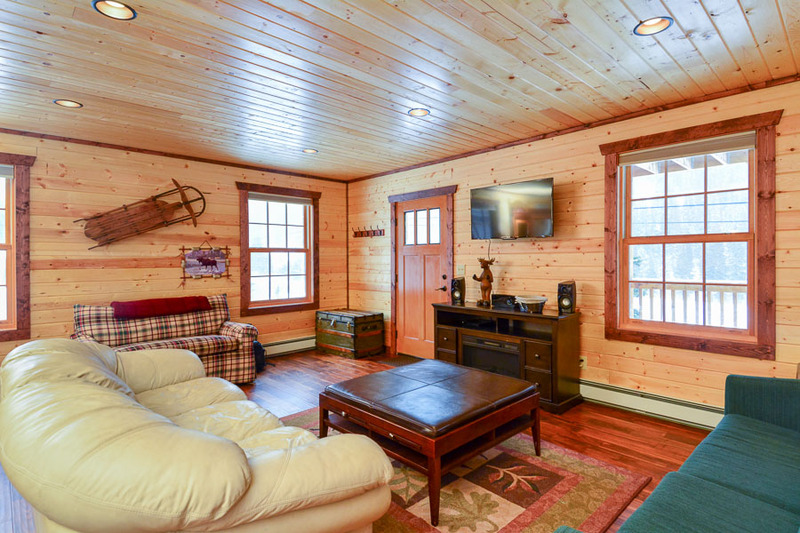 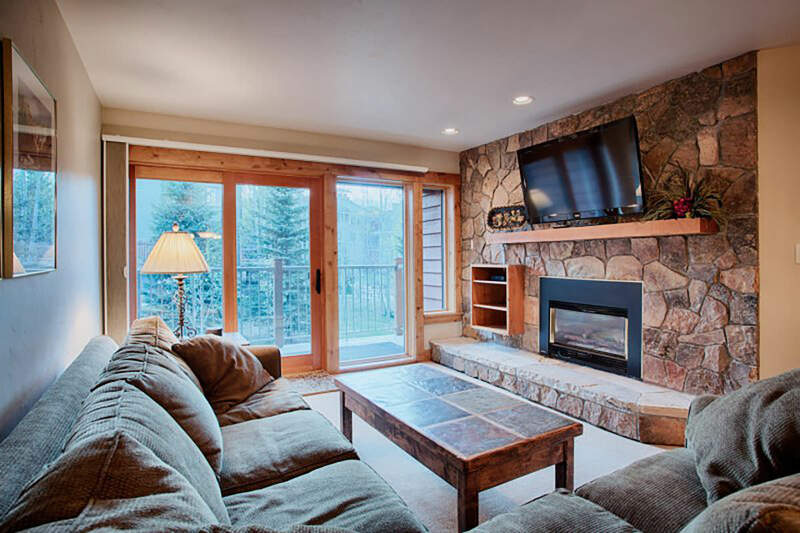 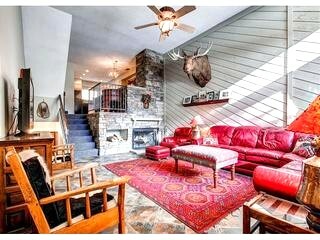 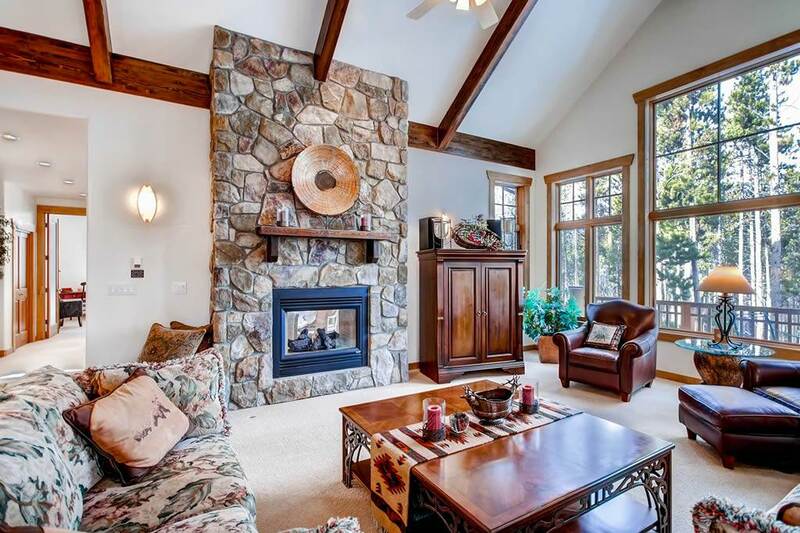 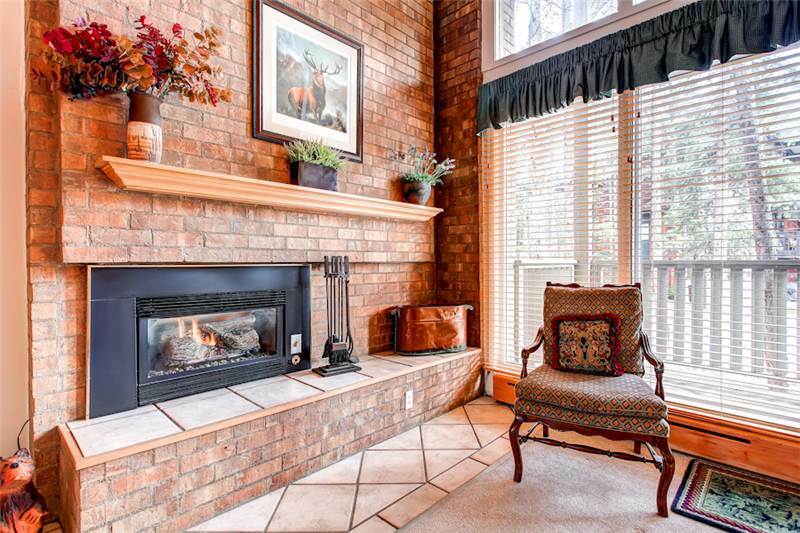 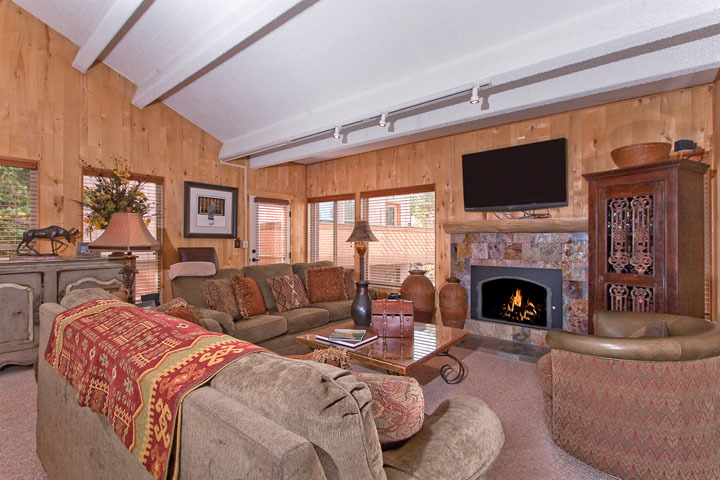 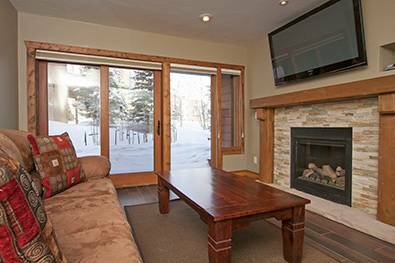 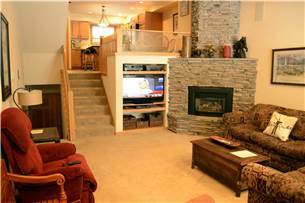 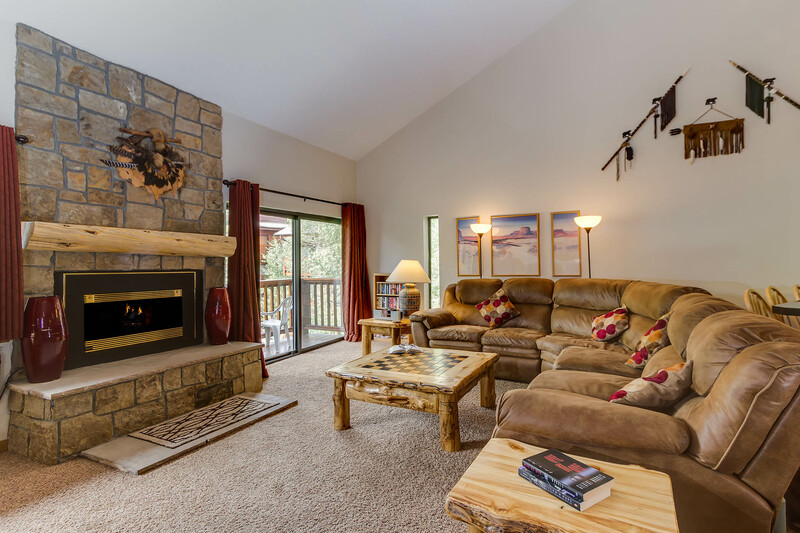 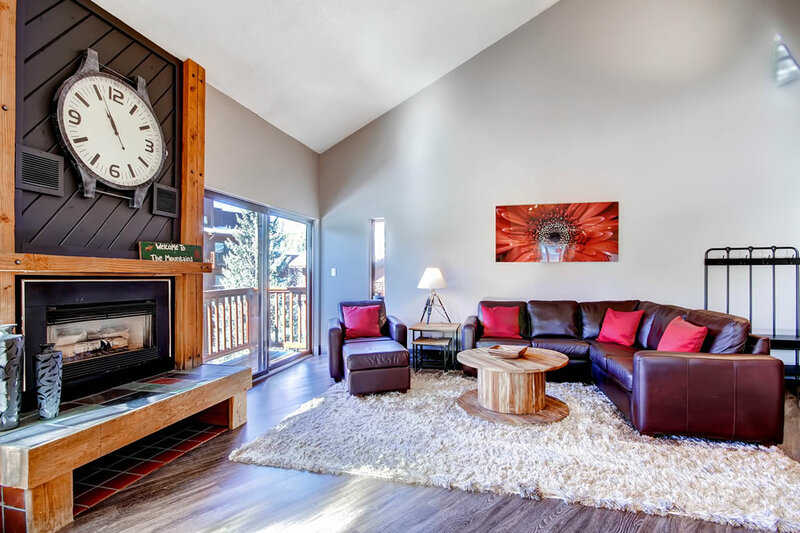 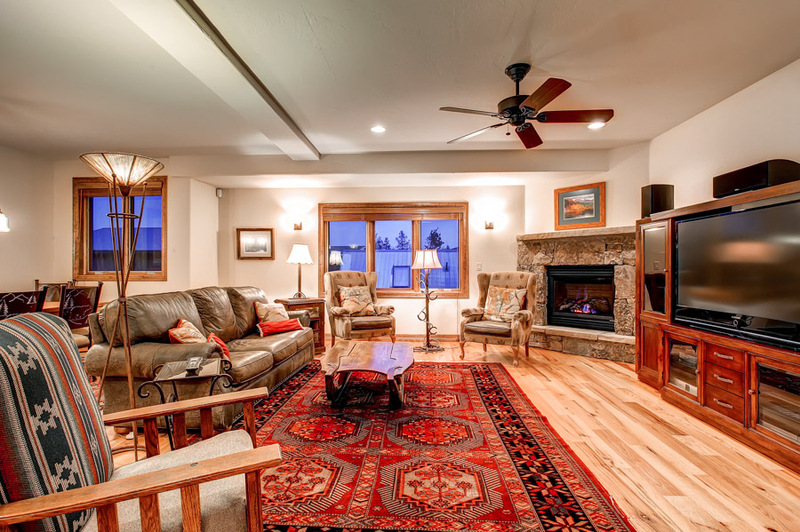 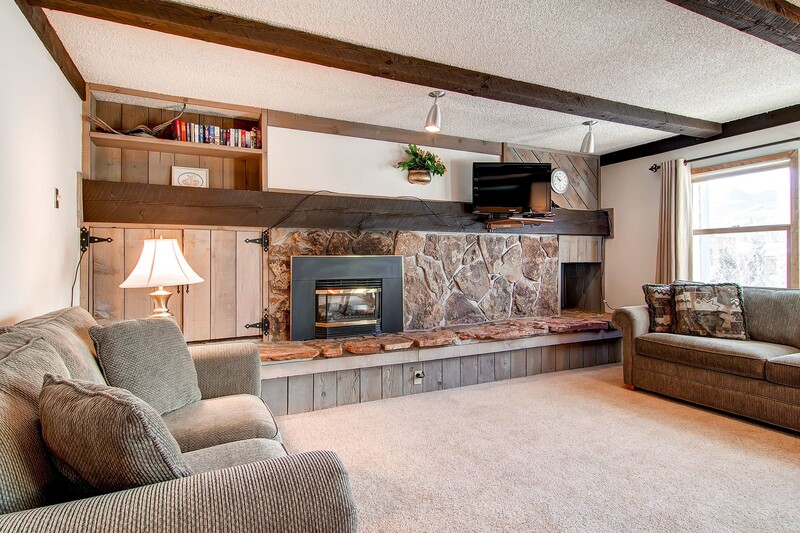 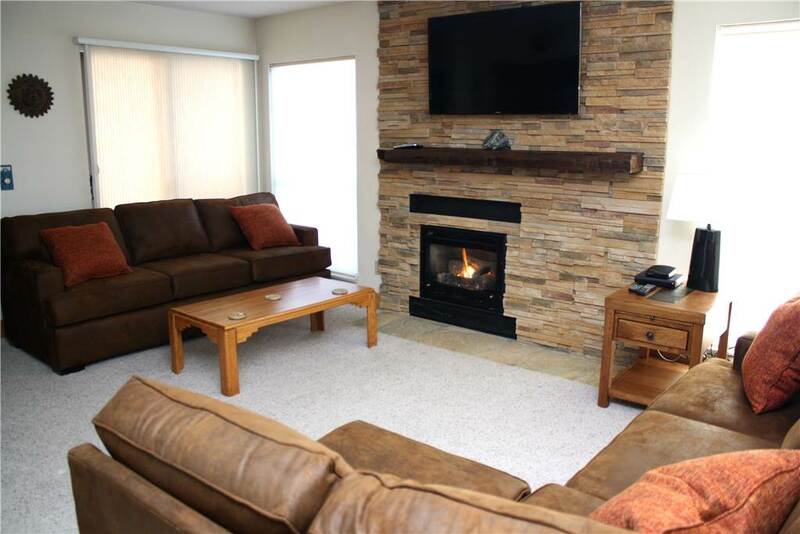 Relax on the premium quality sofas around a blazing wood-burning fireplace (firewood provided), watch a movie on the flatscreen TV with DVD, or break out a family board game to pass the time. 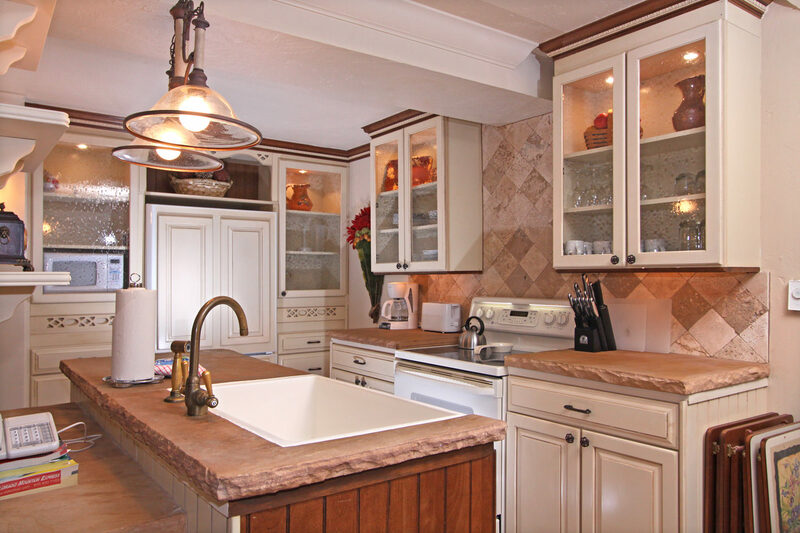 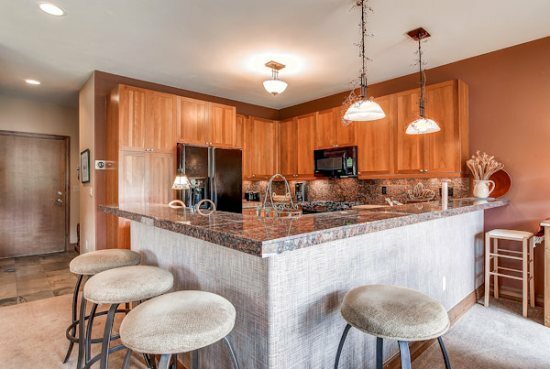 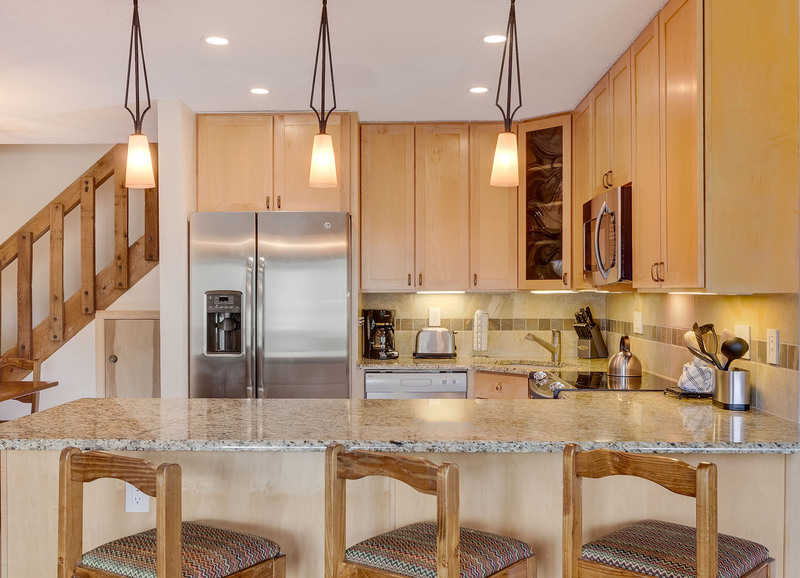 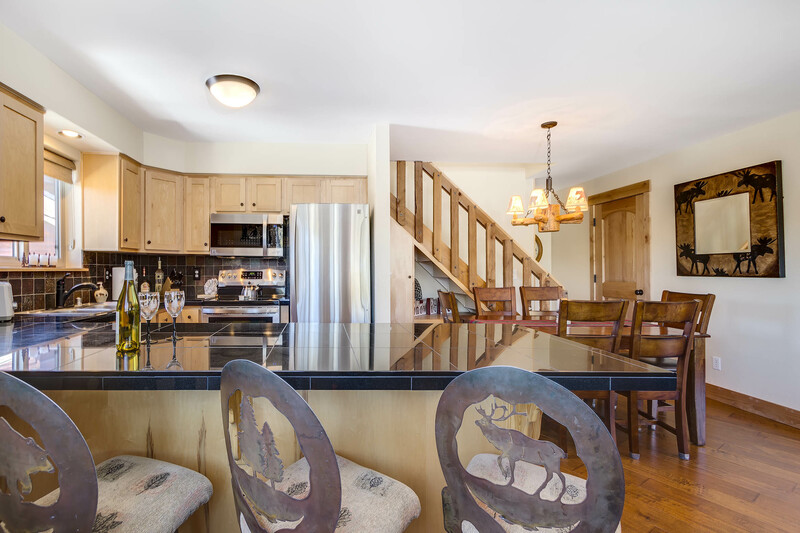 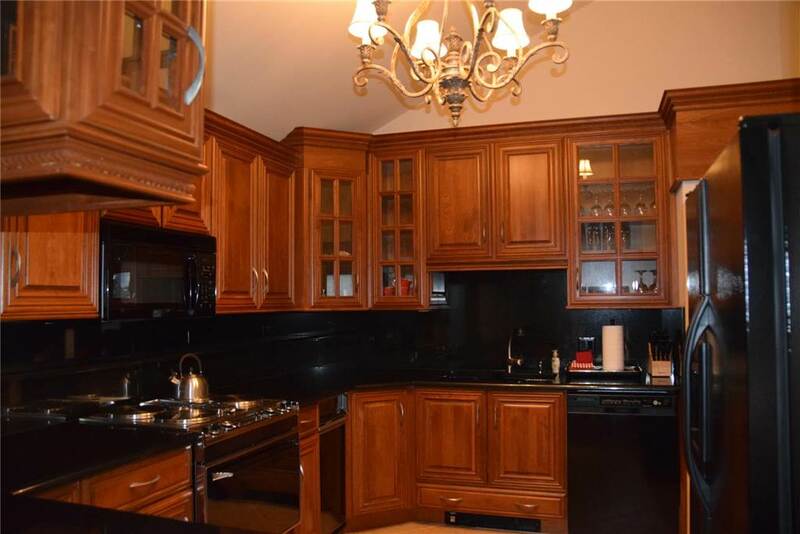 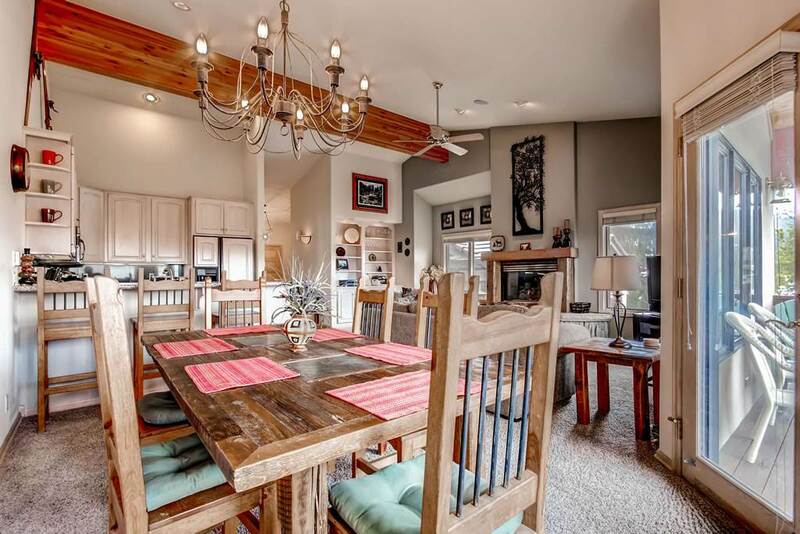 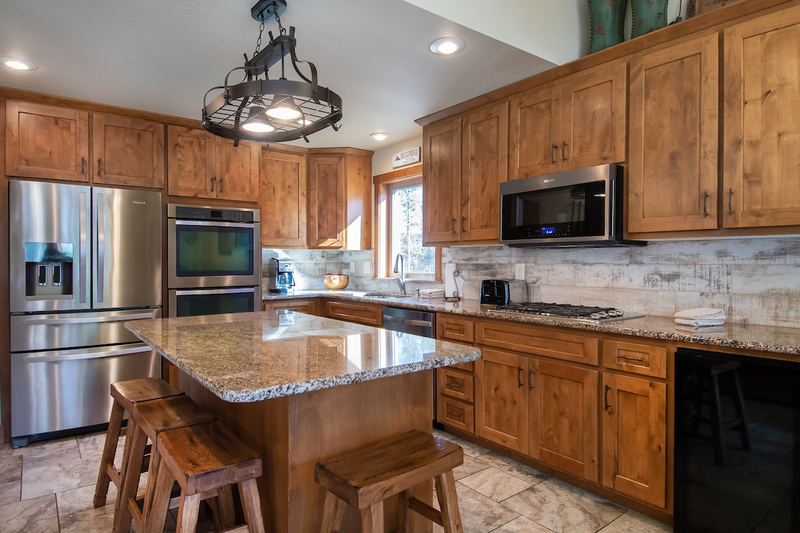 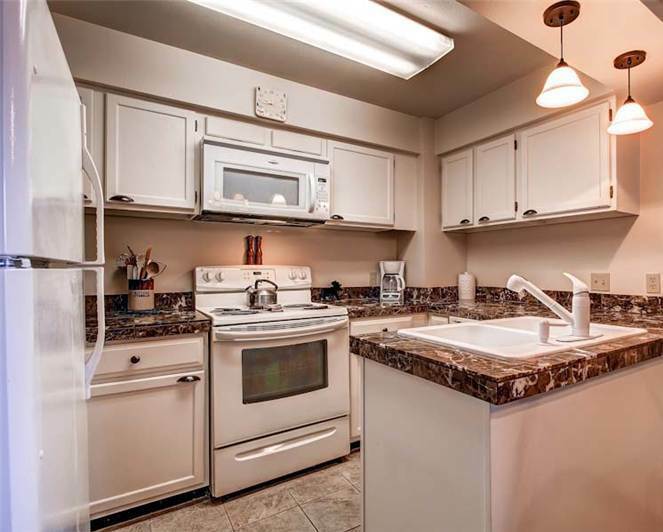 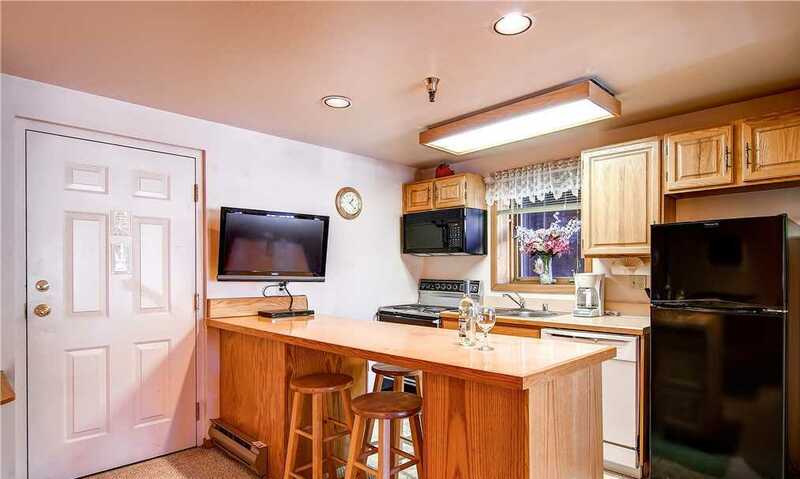 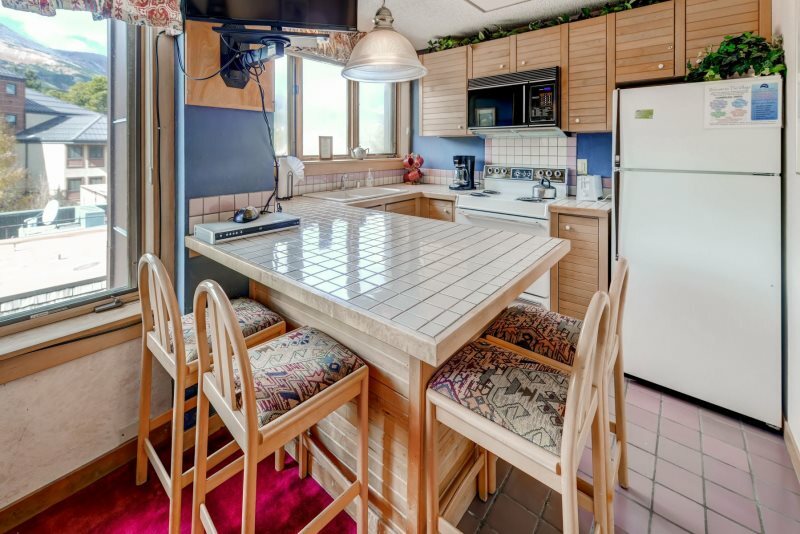 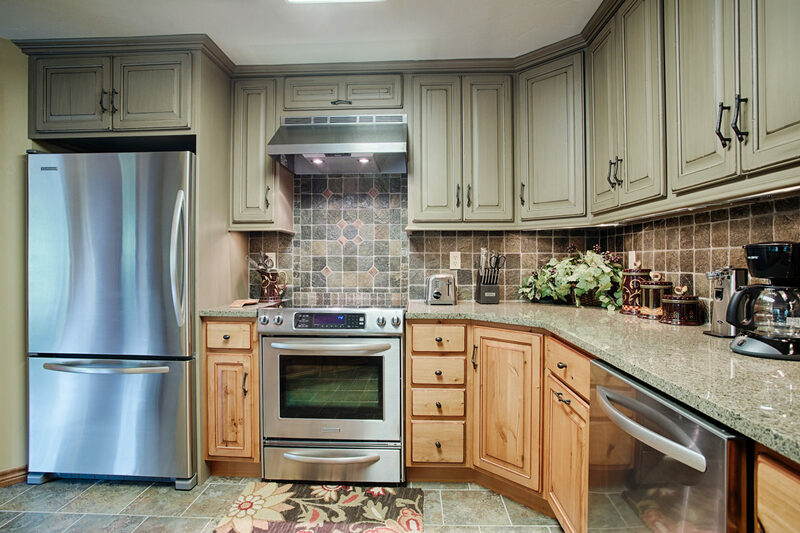 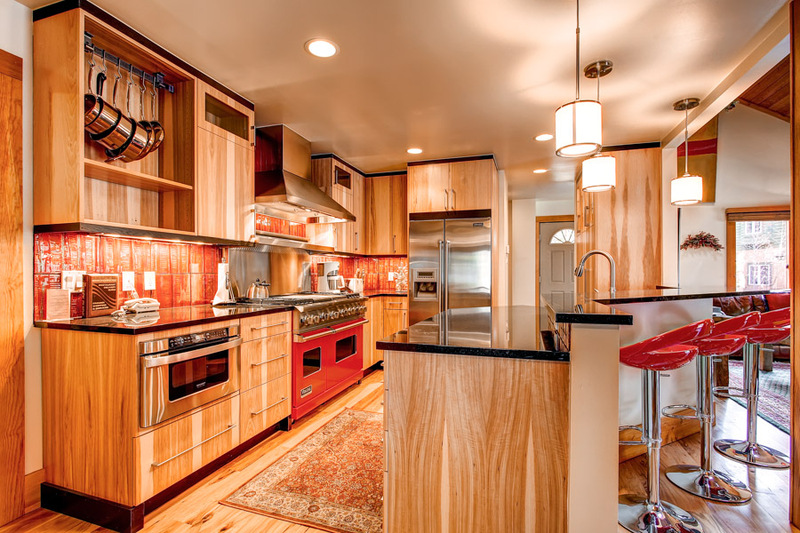 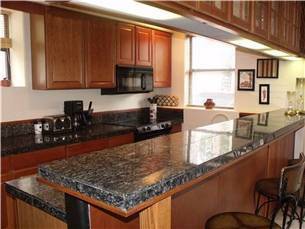 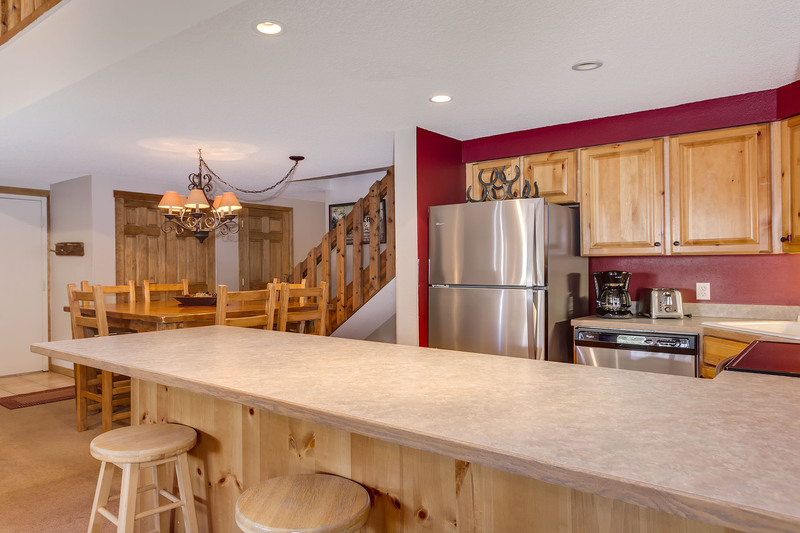 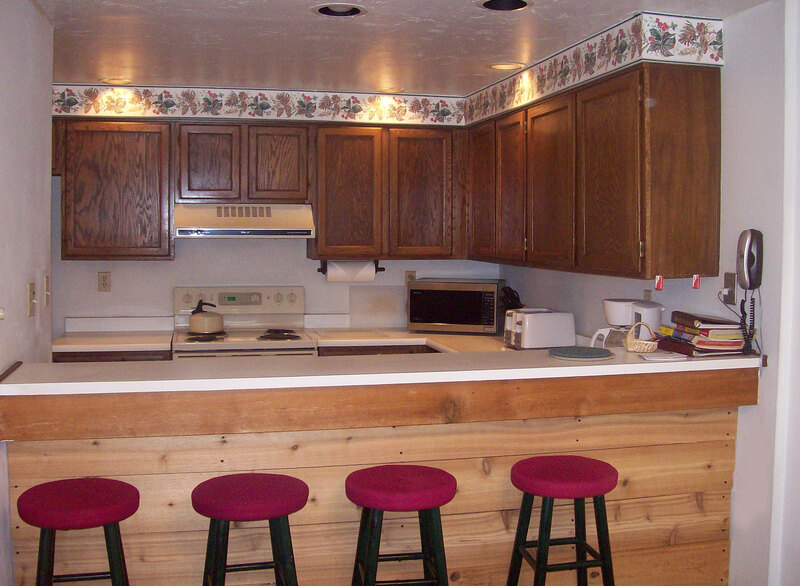 The fully-equipped kitchen has convenient breakfast bar seating in addition to an adjoining dining area with seating for six. 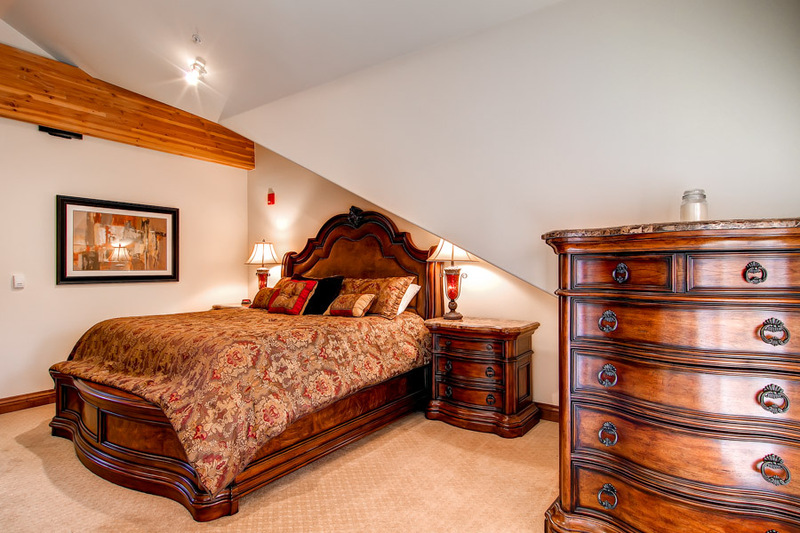 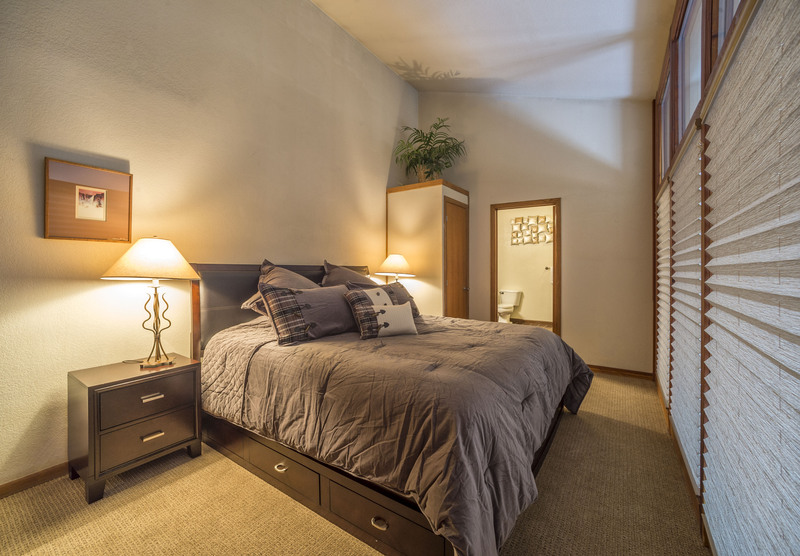 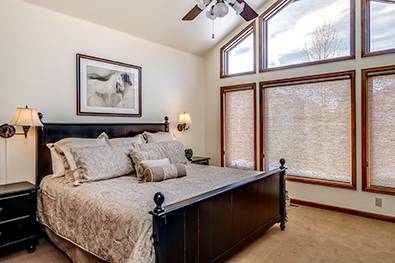 The master suite has a Queen bed and the guest bedroom has two, extra-long twins which can also be converted to a King bed. 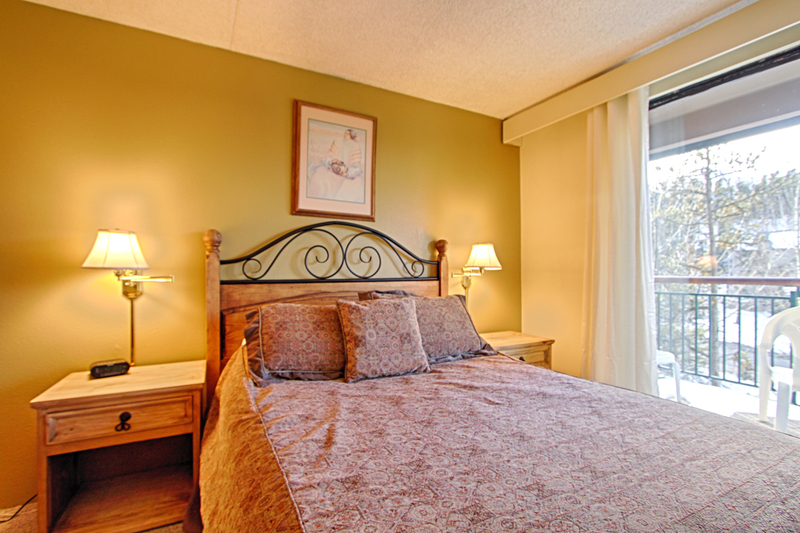 All mattresses and bedding are top-of-the-line quality offering guests a comfortable and restful sleep.